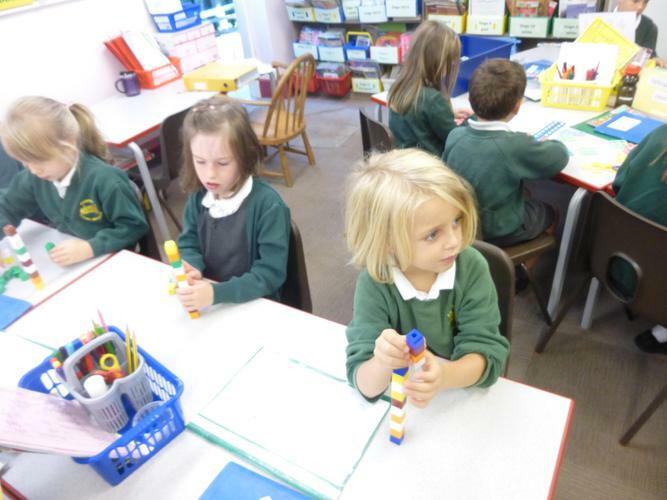 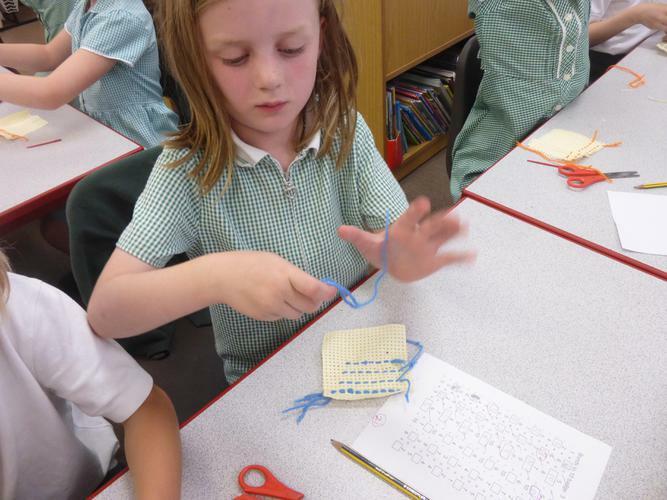 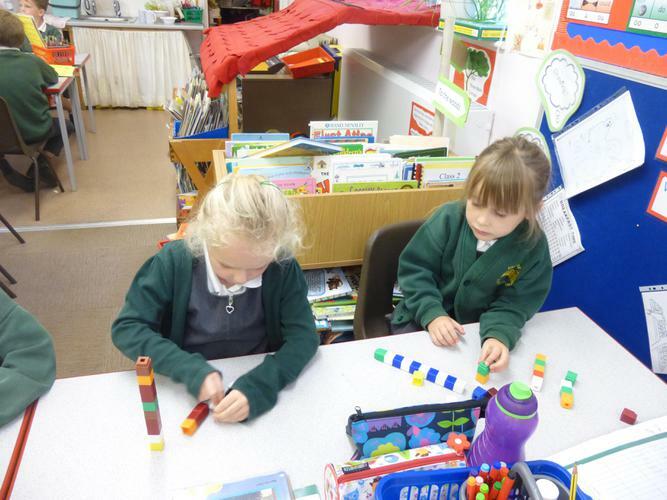 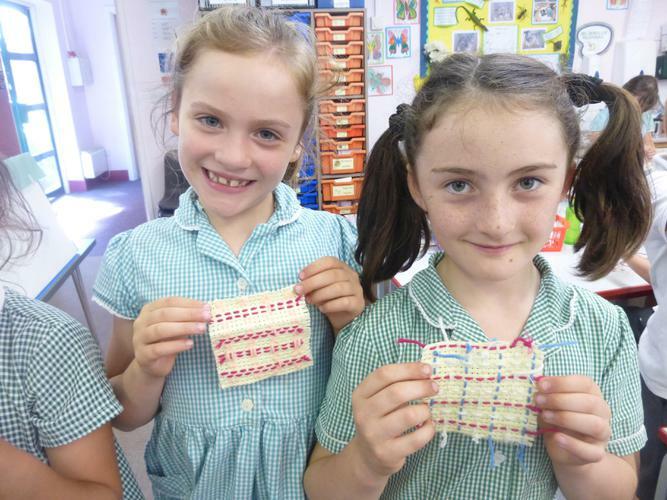 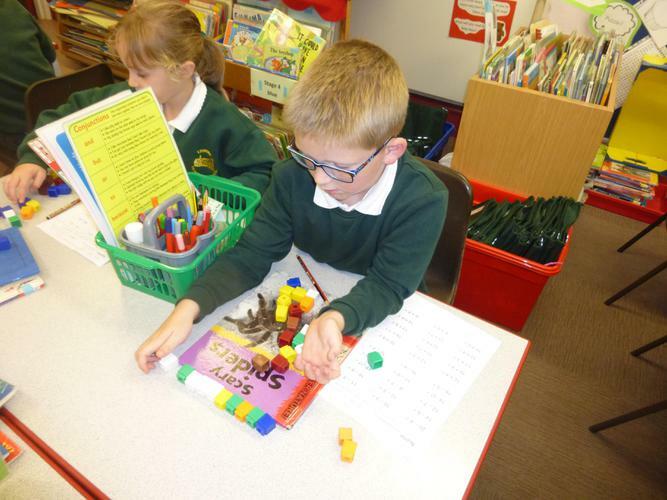 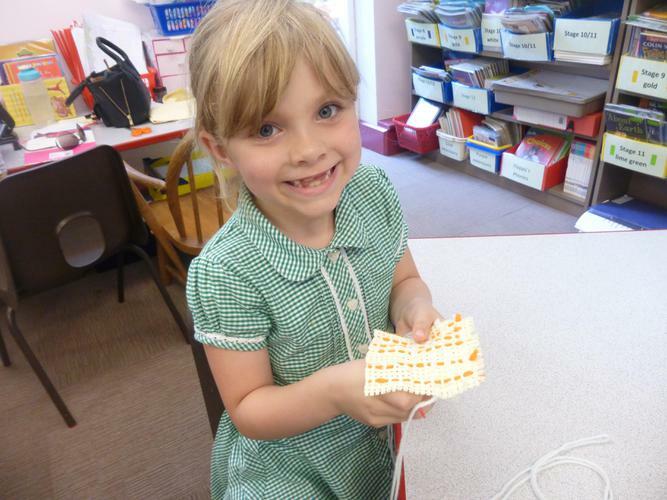 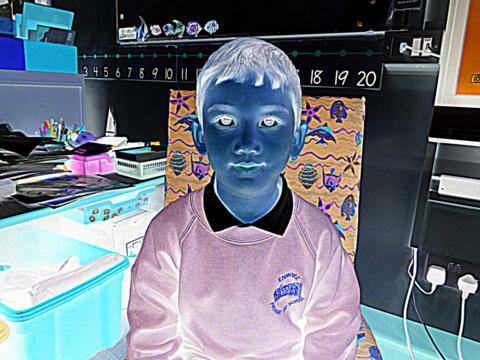 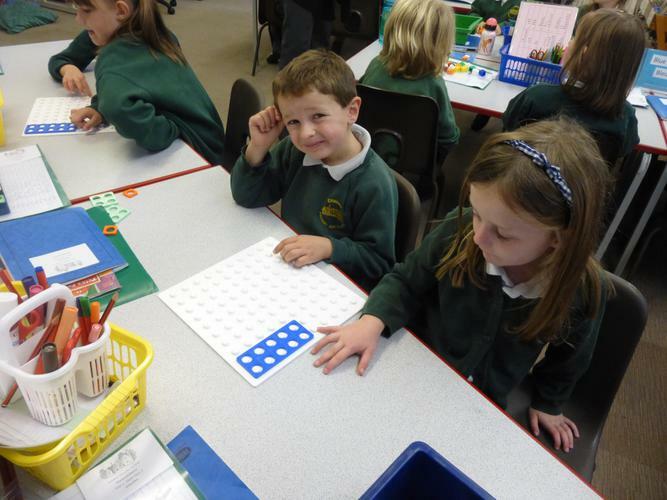 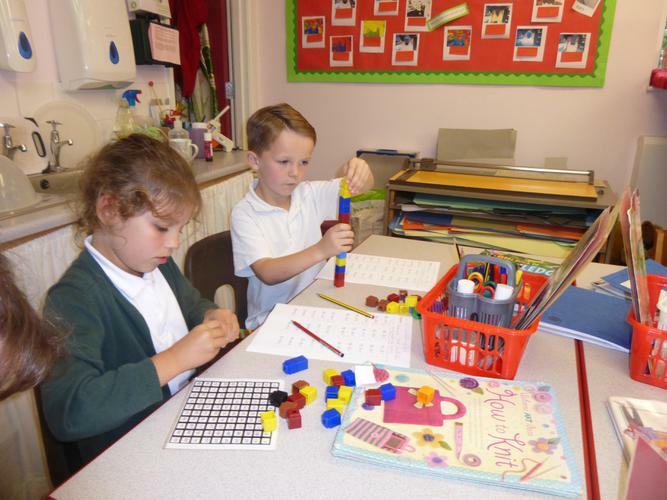 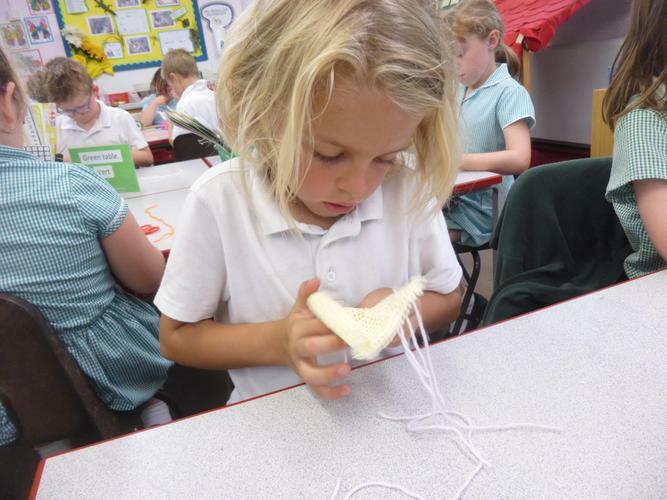 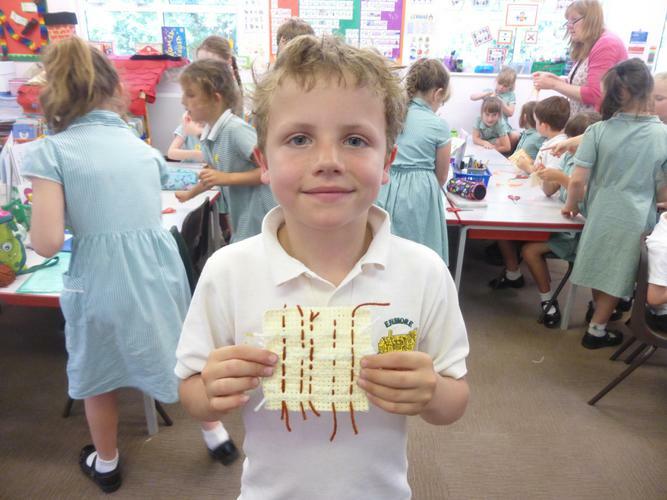 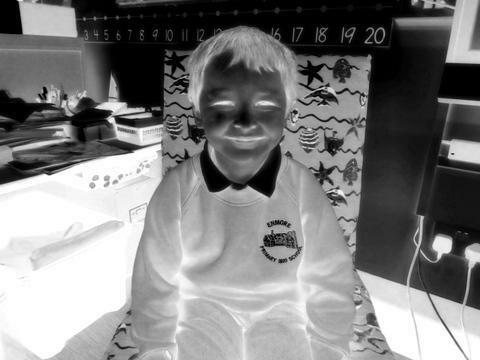 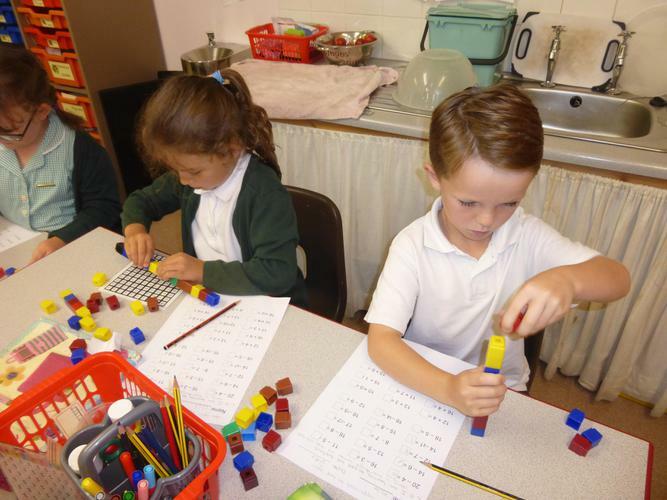 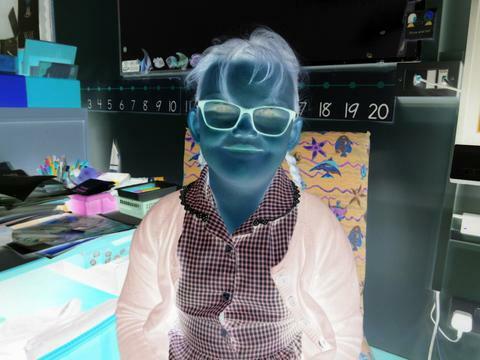 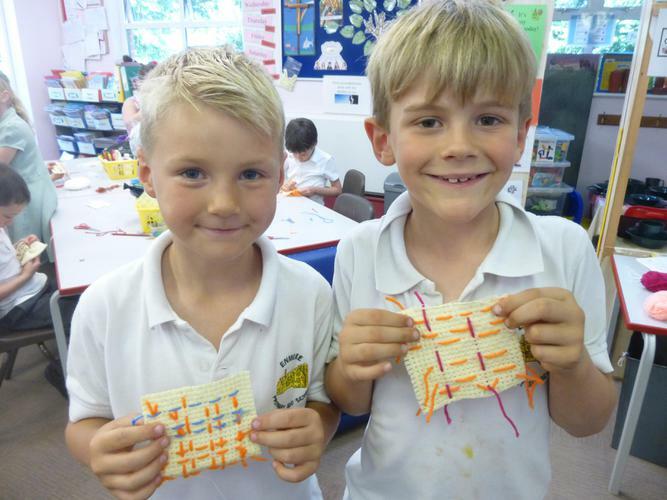 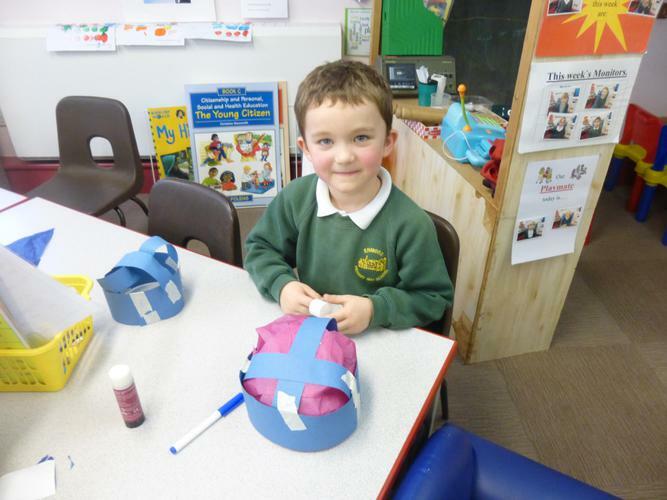 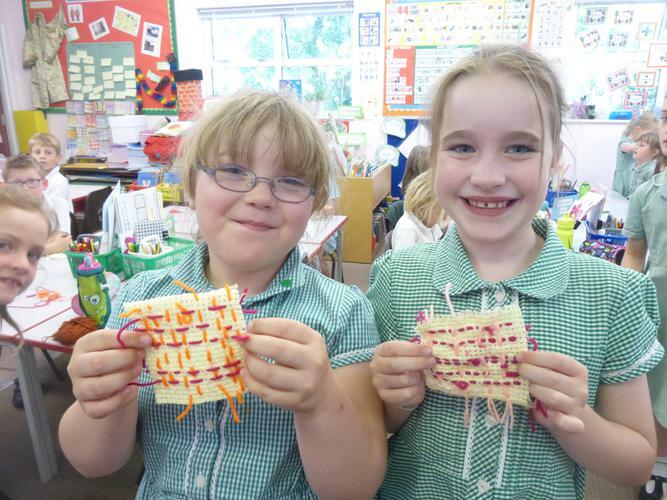 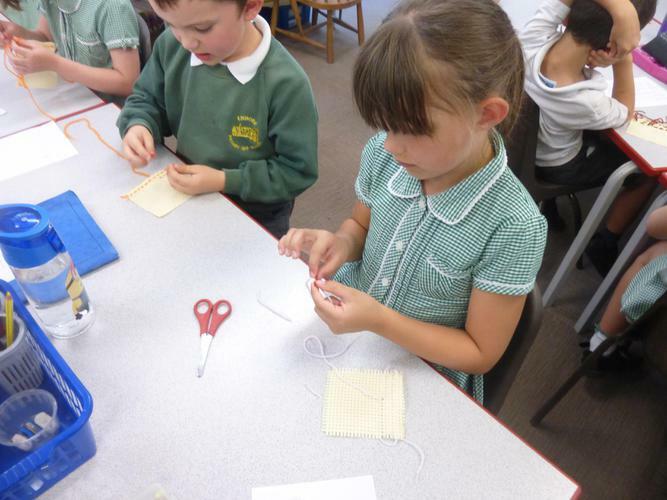 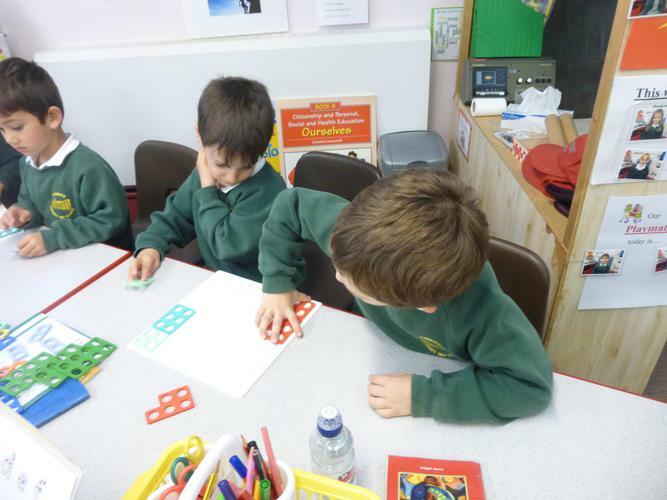 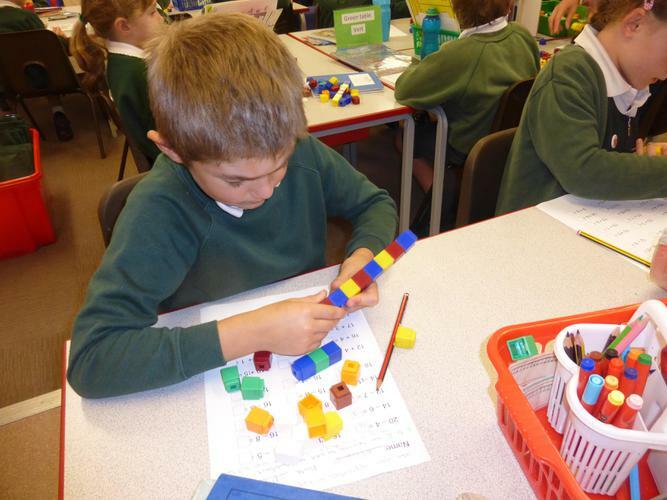 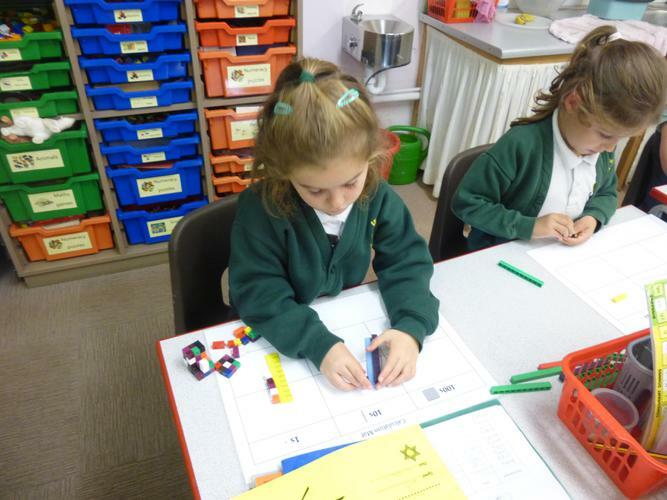 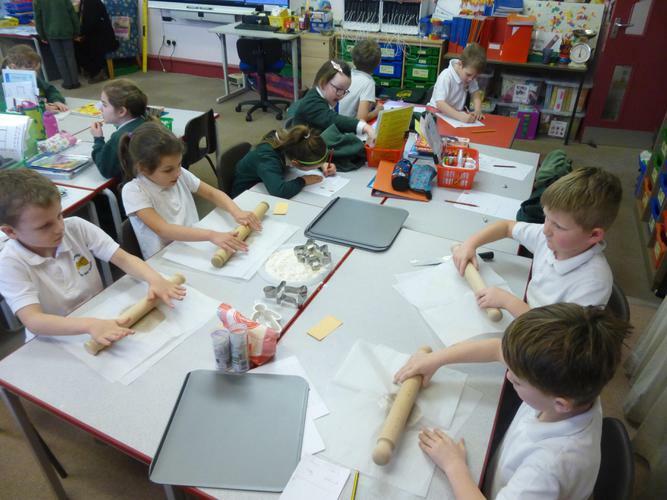 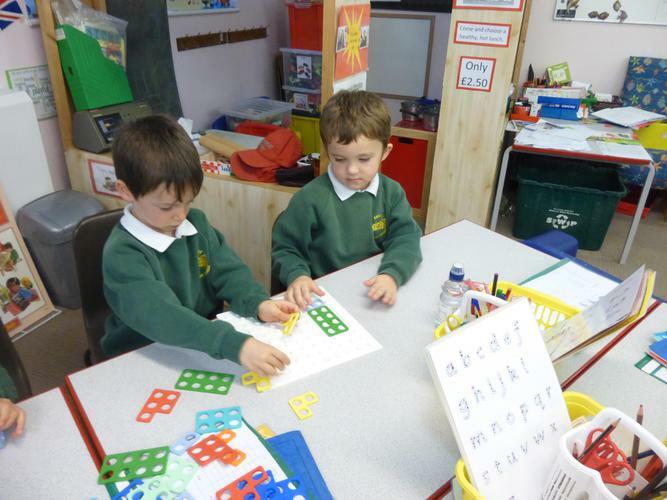 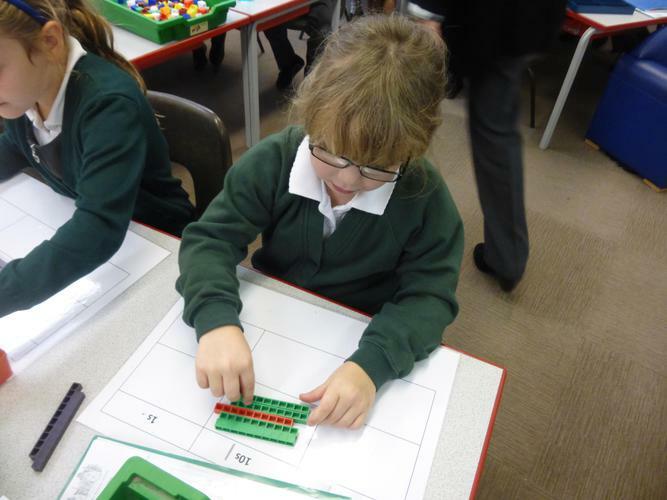 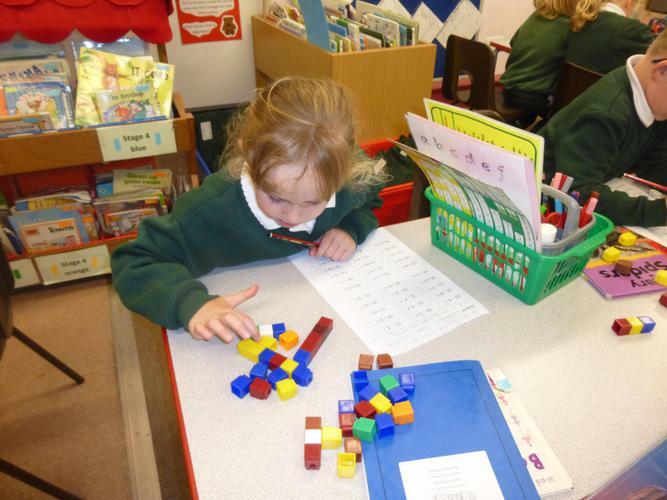 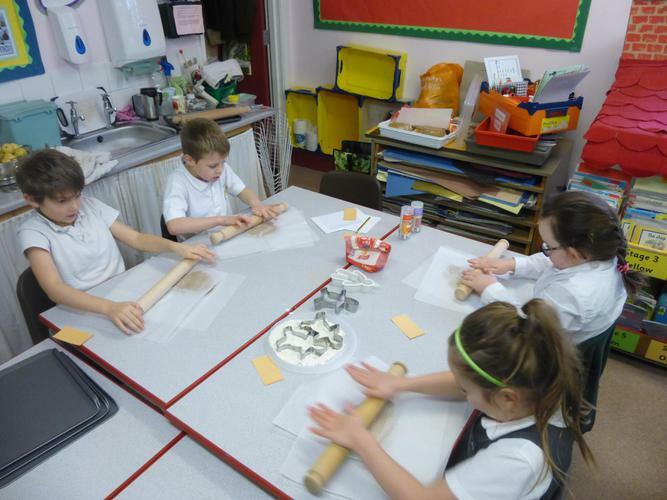 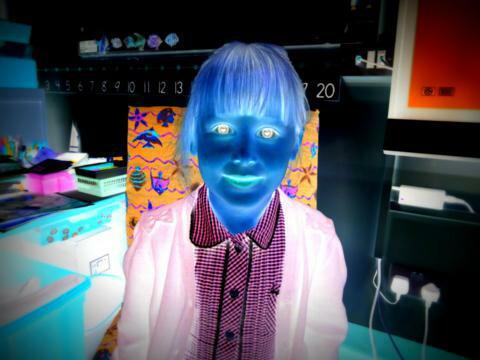 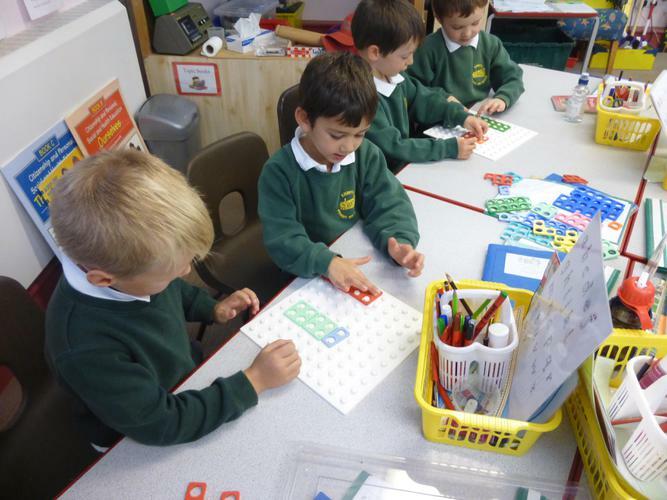 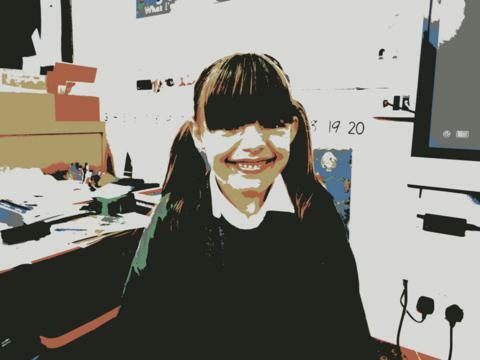 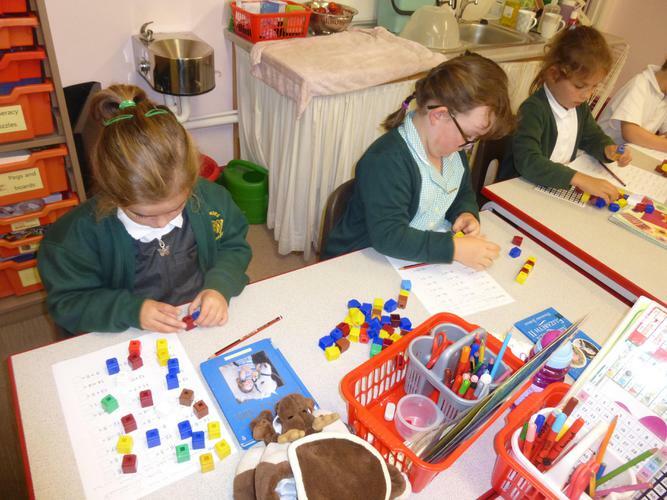 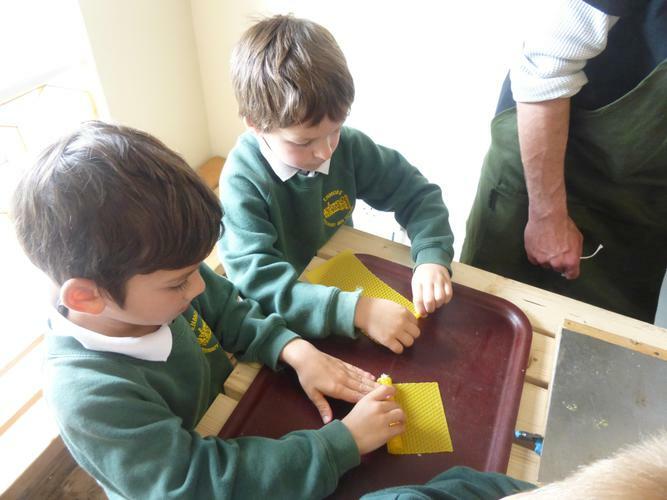 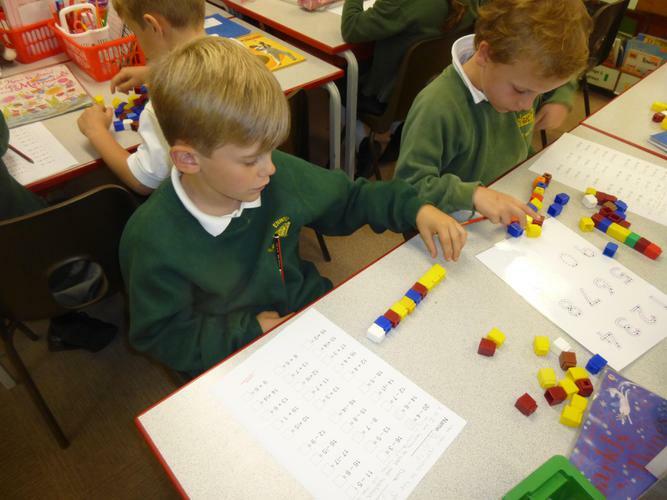 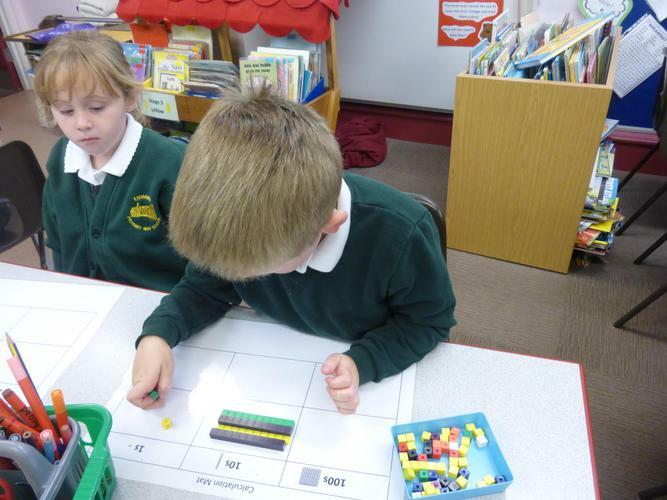 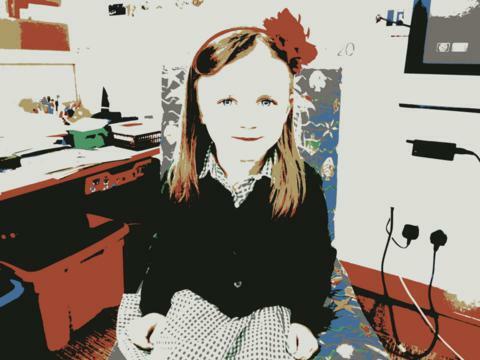 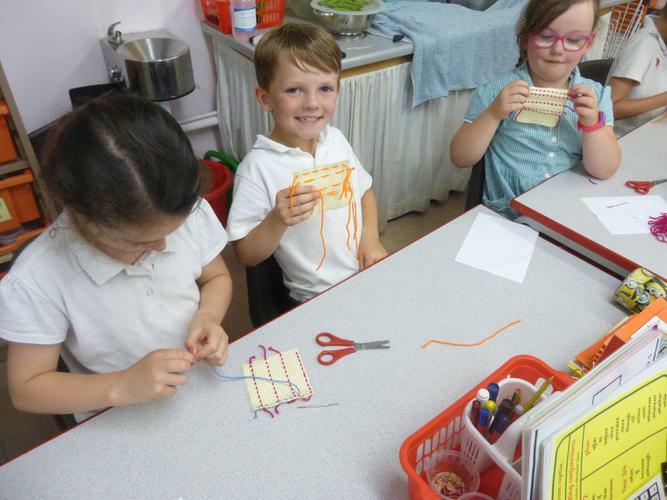 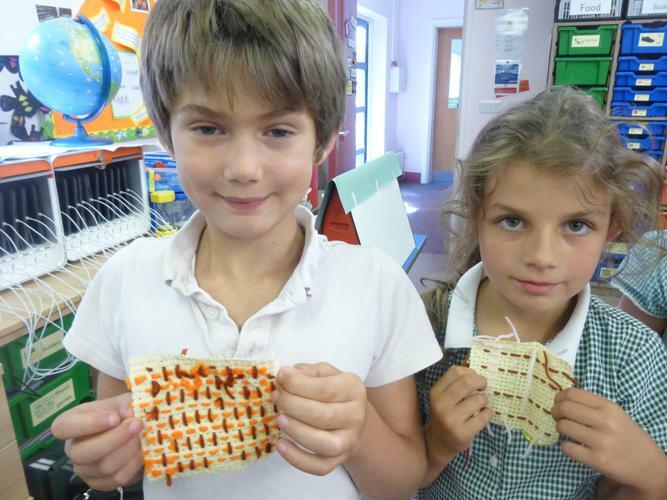 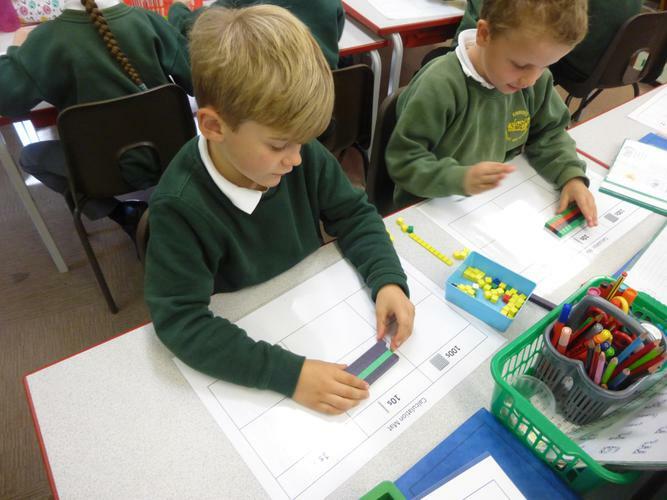 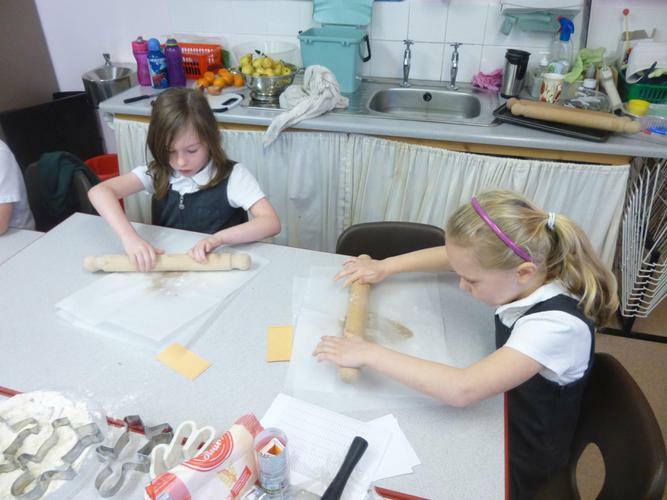 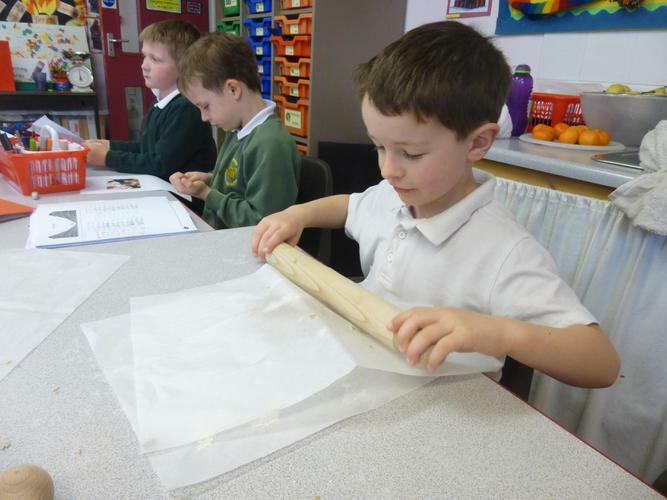 We have been learning about tartan patterns and designs and have had a go at designing and creating our own. 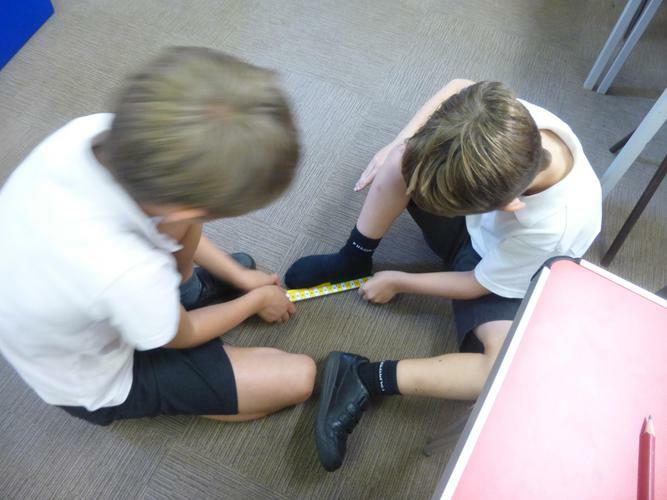 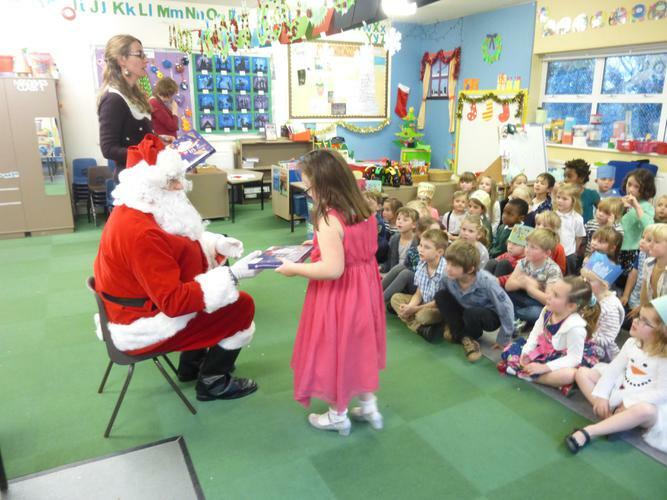 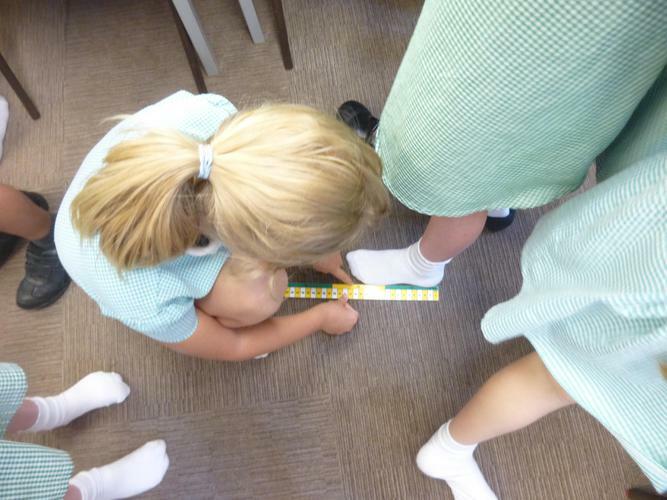 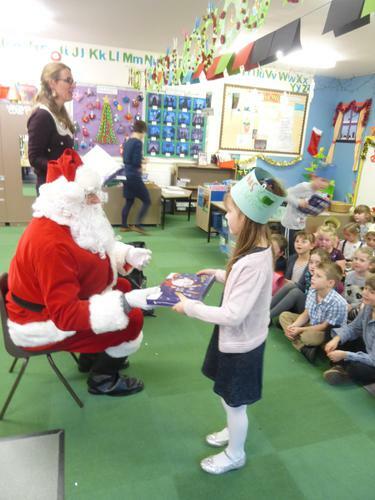 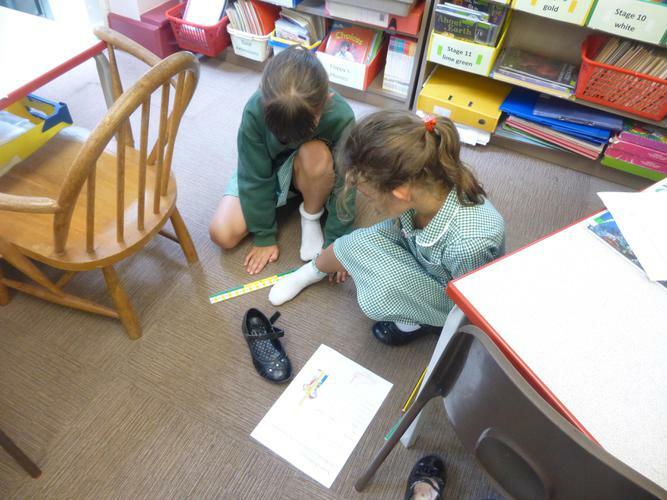 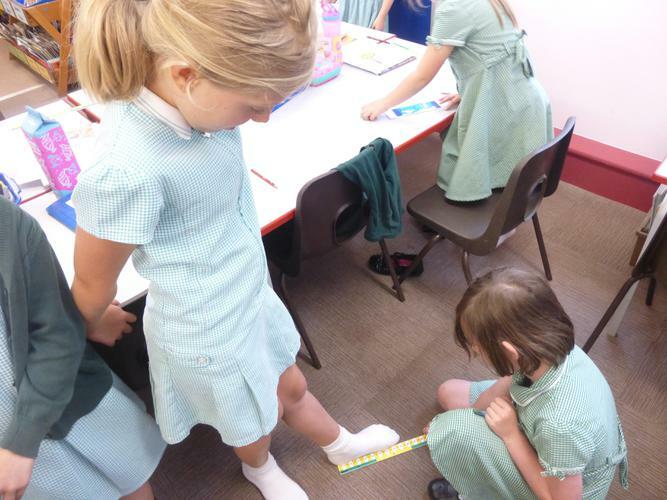 Do the tallest children have the longest feet? 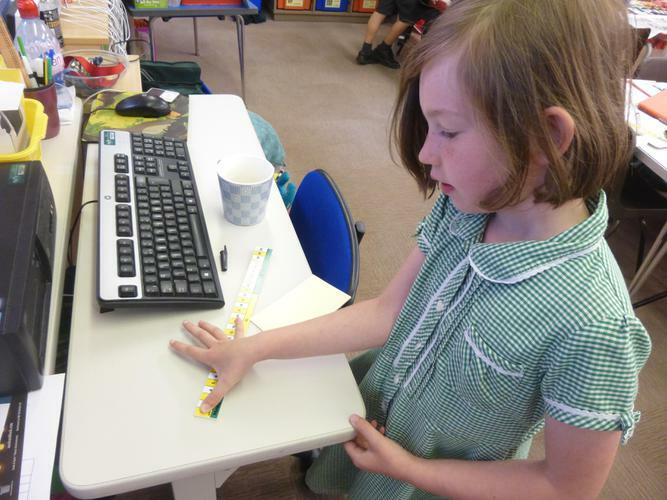 Do the children with the longest feet have the widest hands? 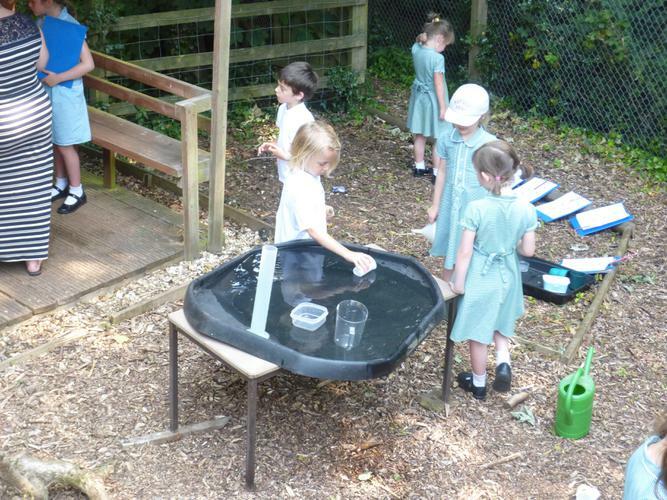 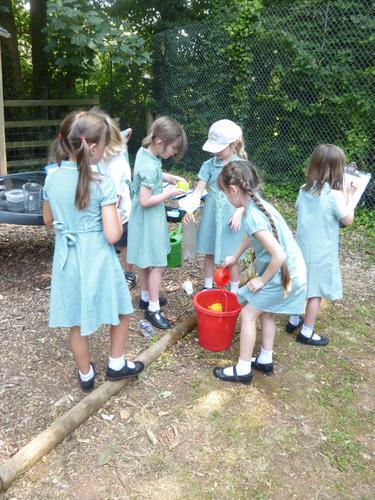 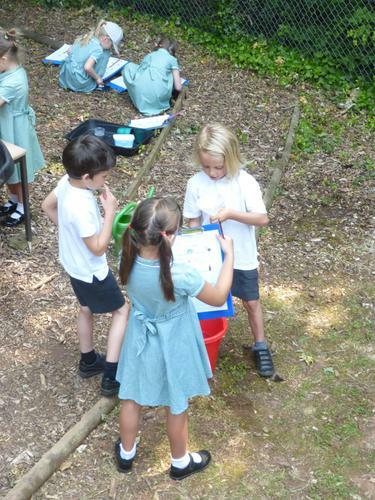 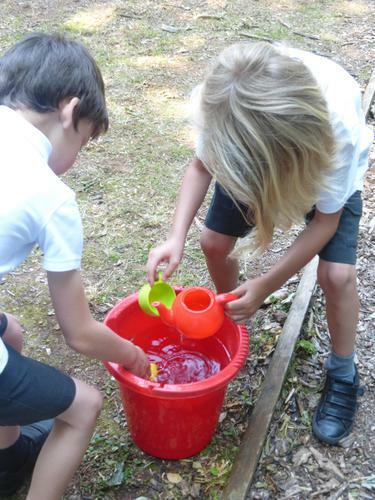 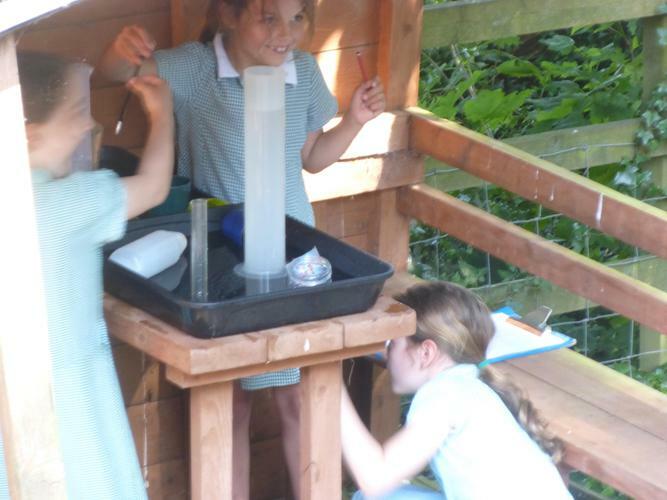 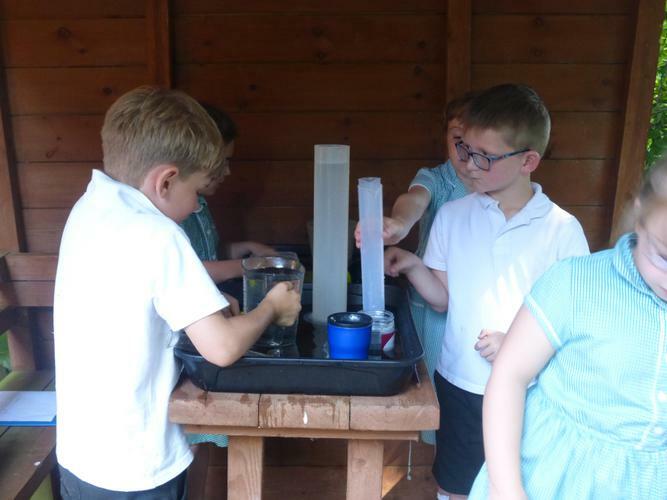 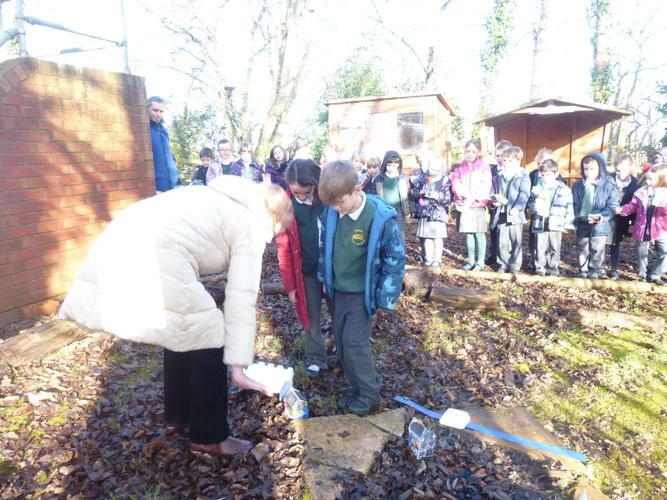 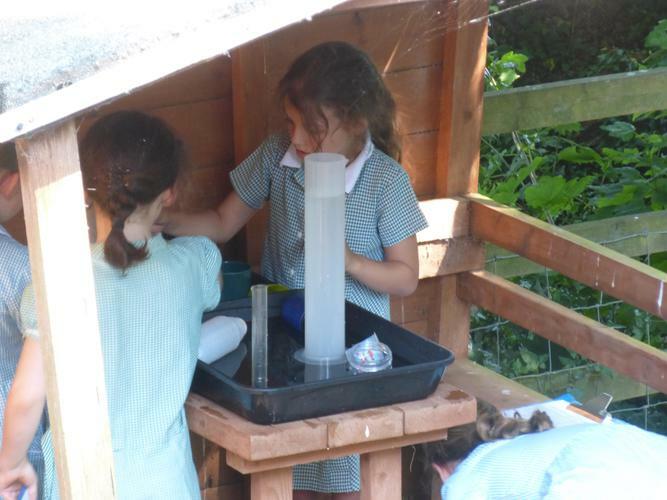 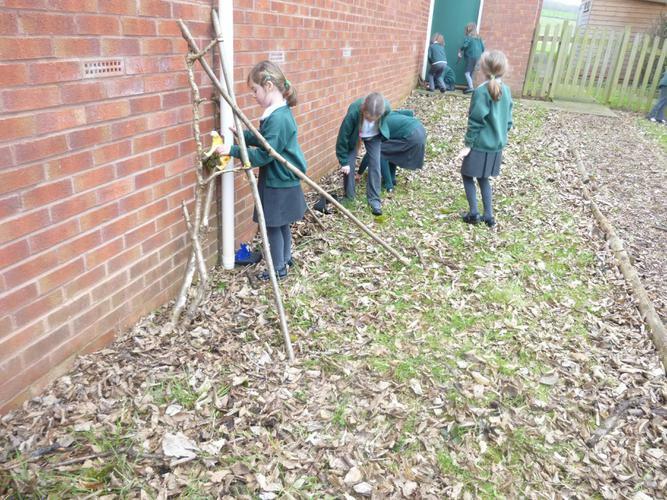 We went outside to measure water using litres and millilitres. 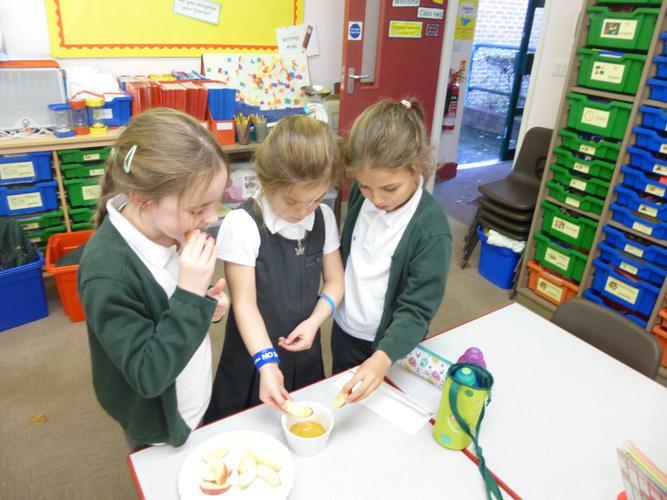 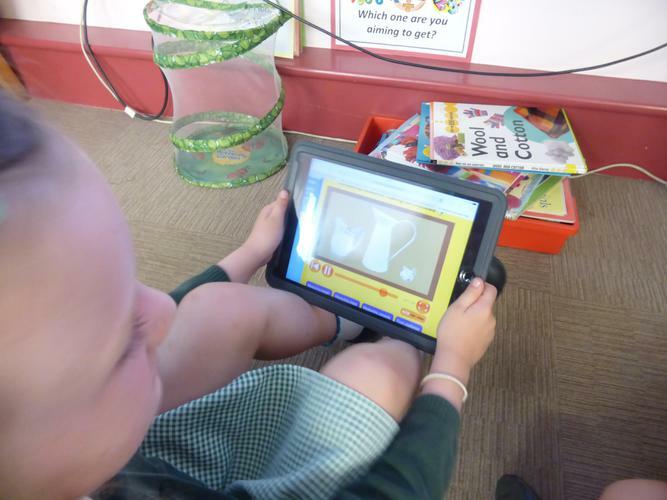 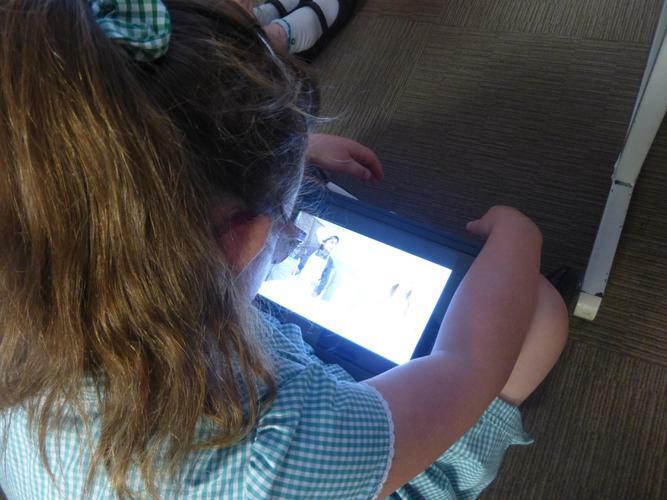 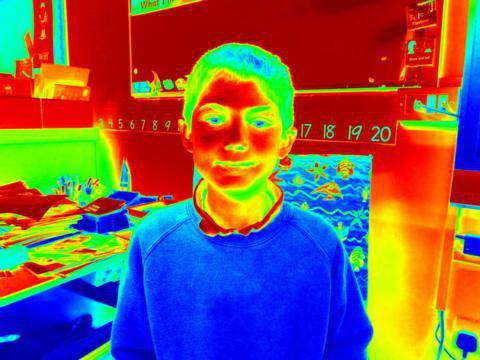 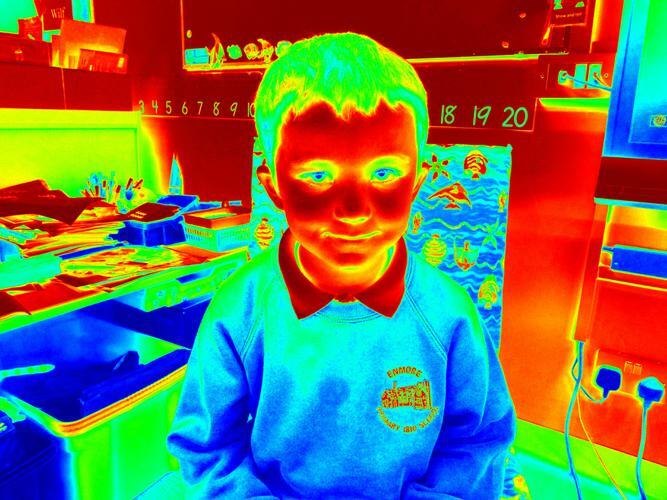 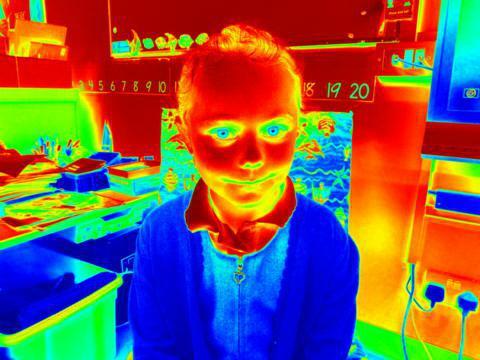 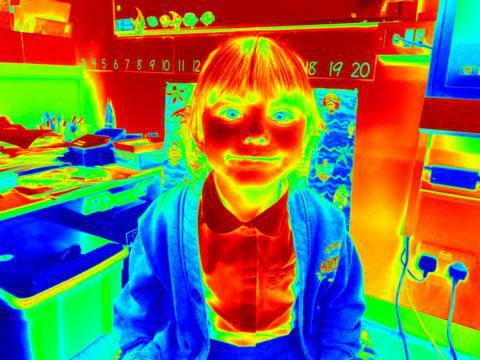 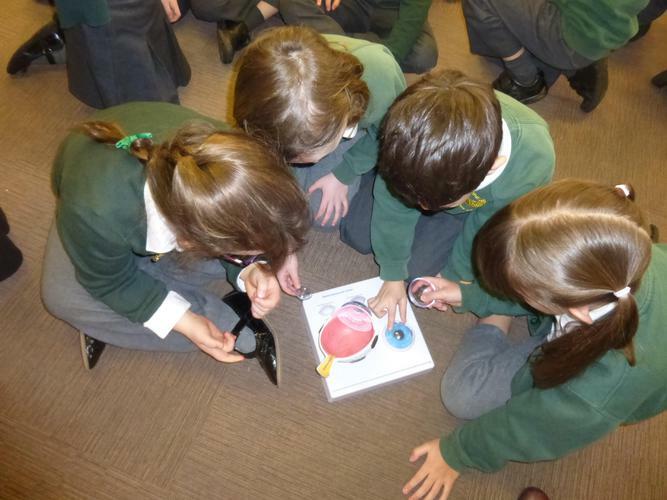 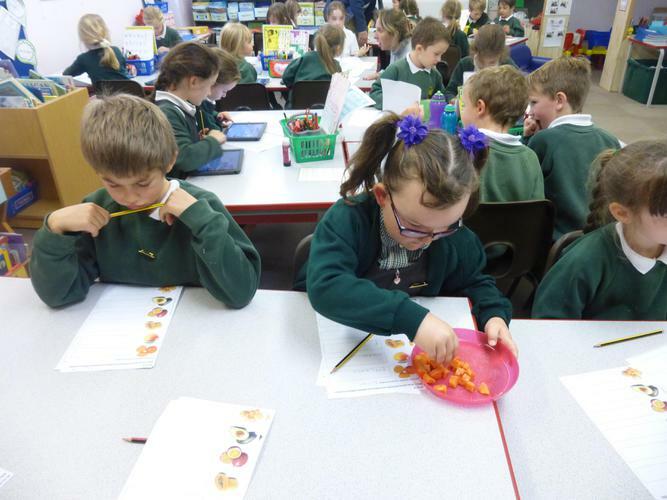 Inside we used our ipads to investigate measuring liquids for cooking and how to share bottles of ginger beer! 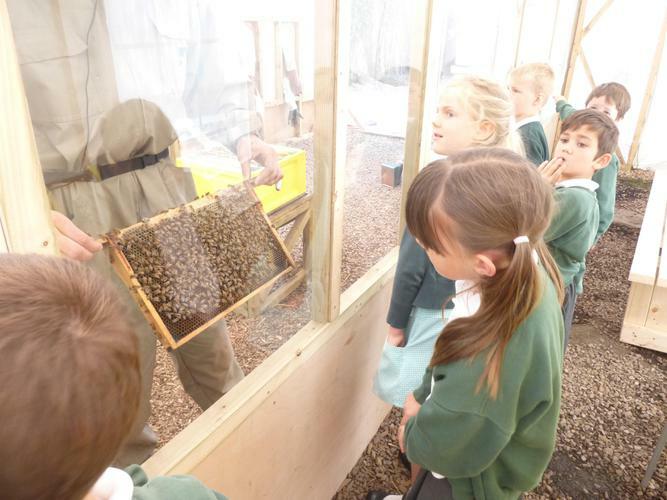 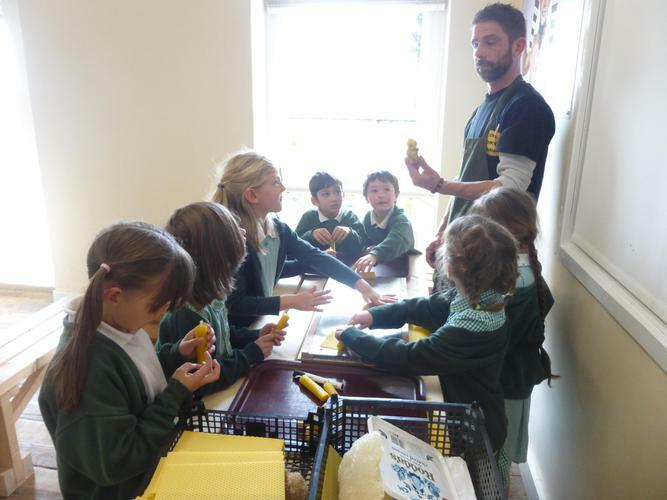 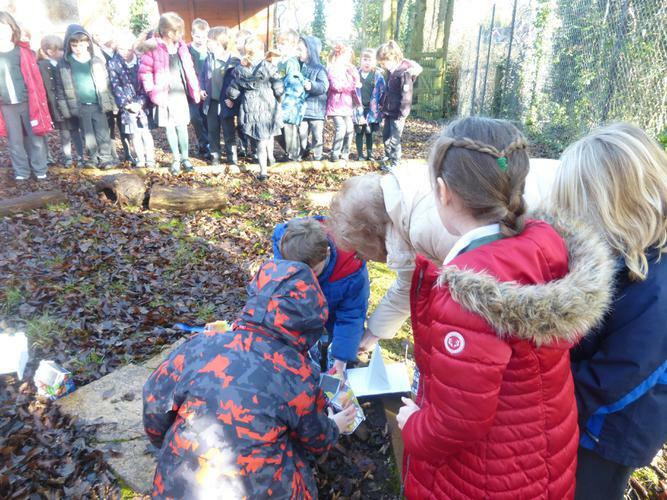 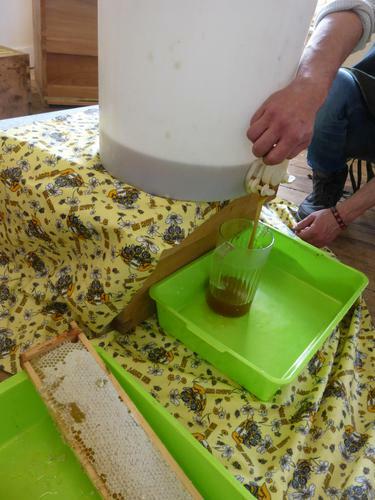 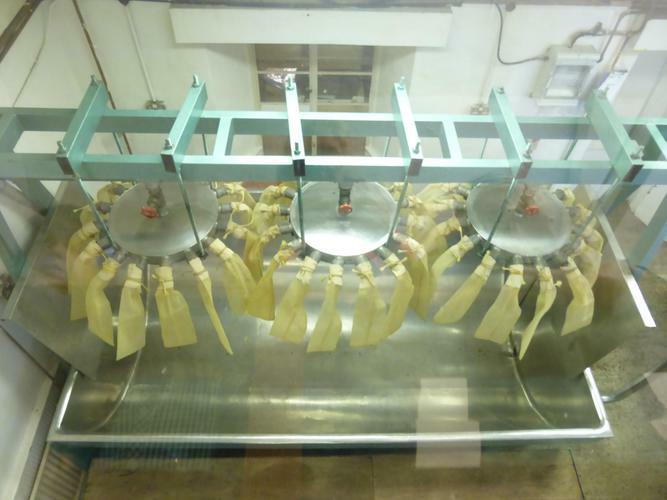 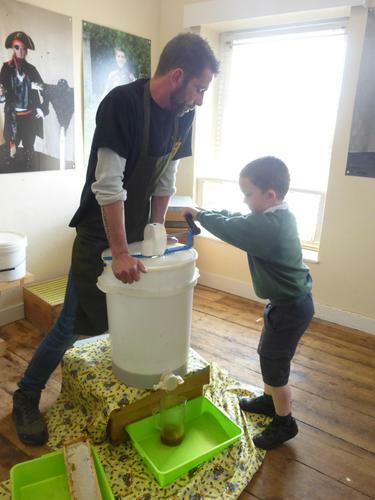 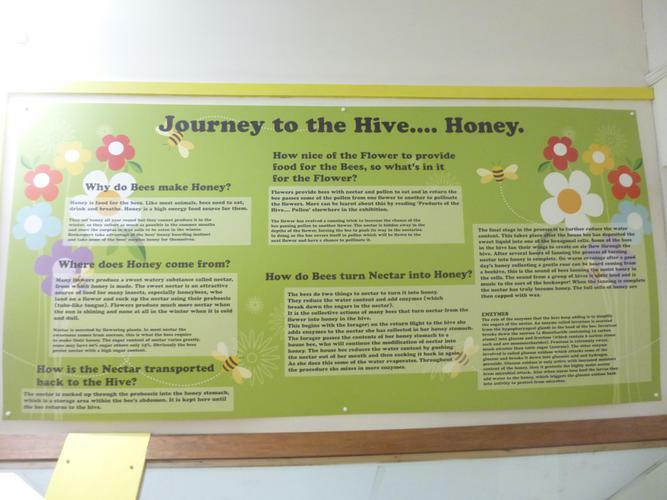 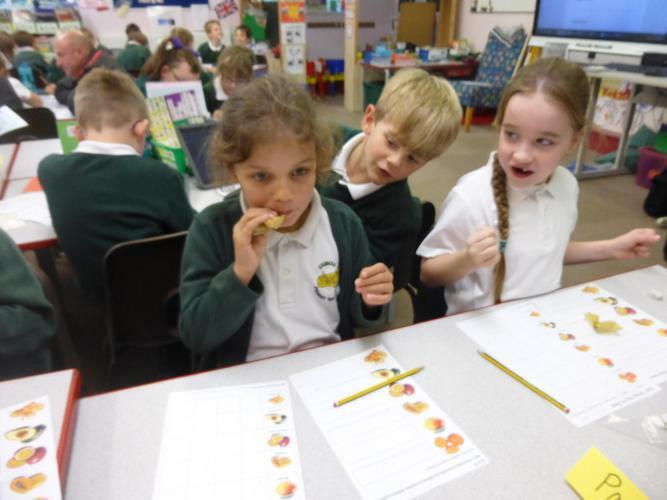 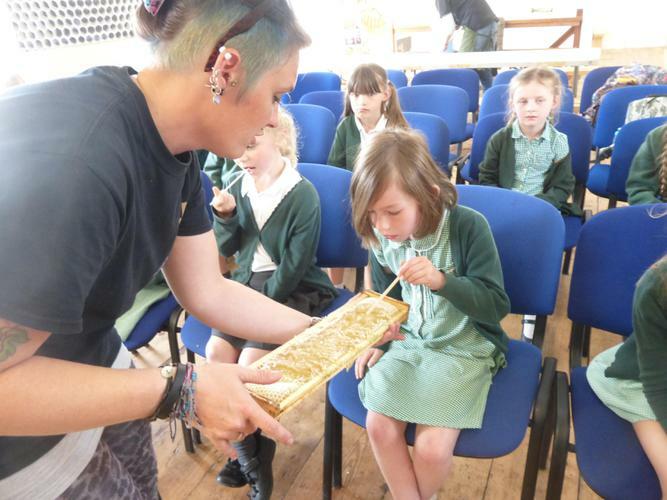 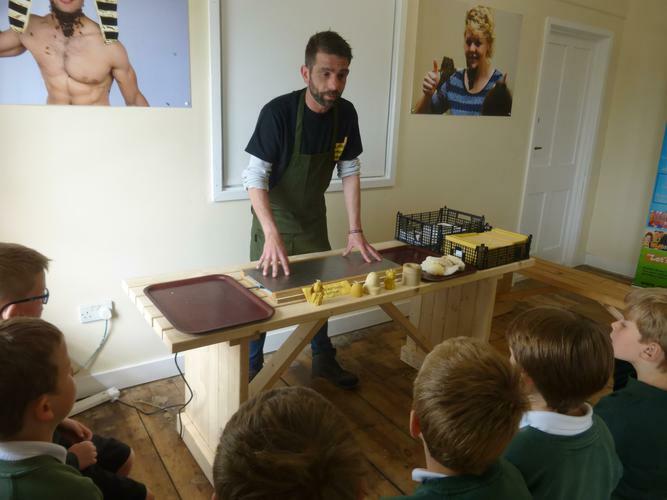 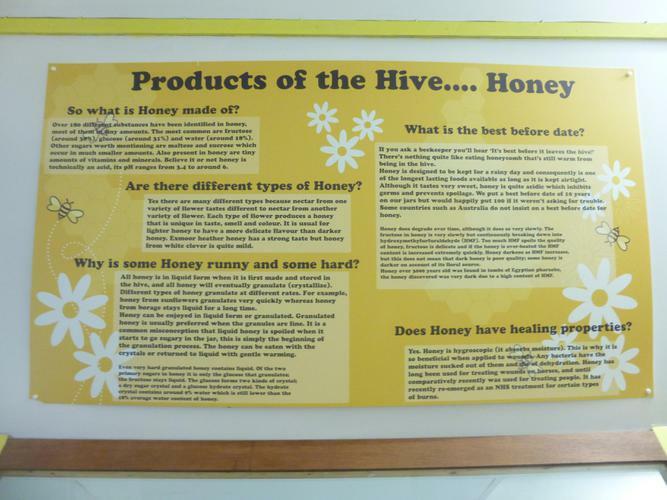 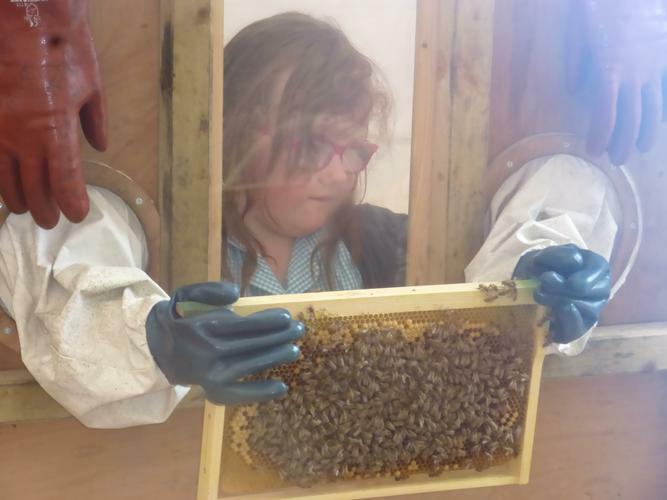 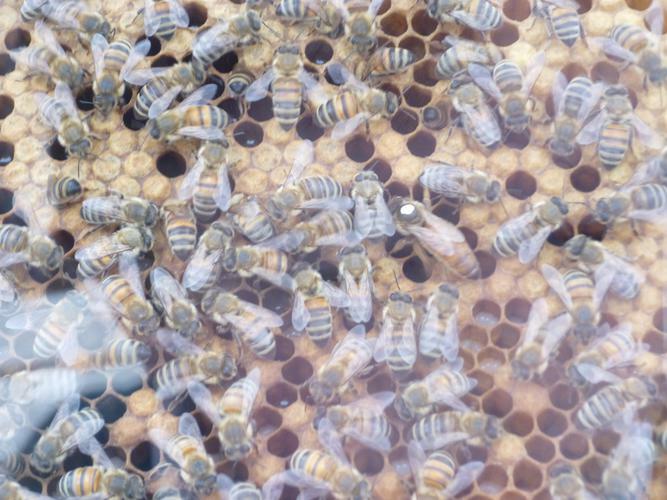 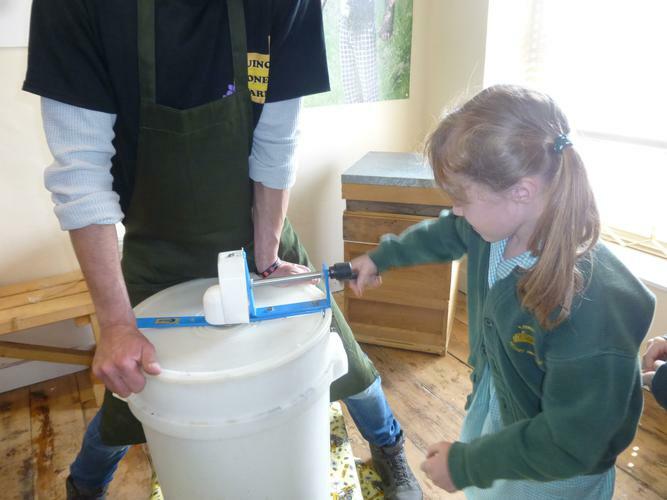 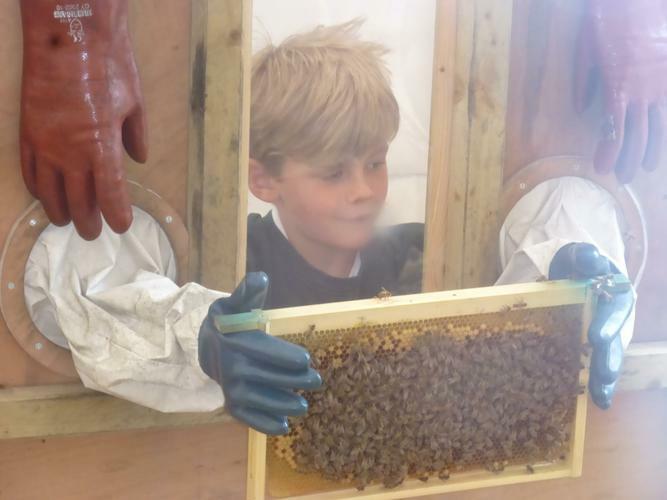 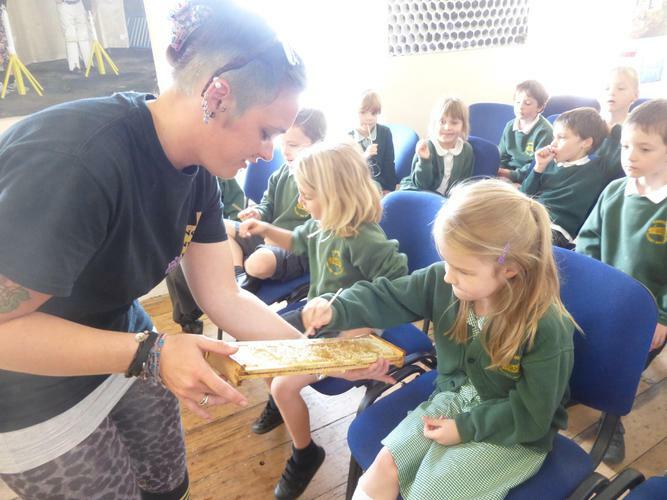 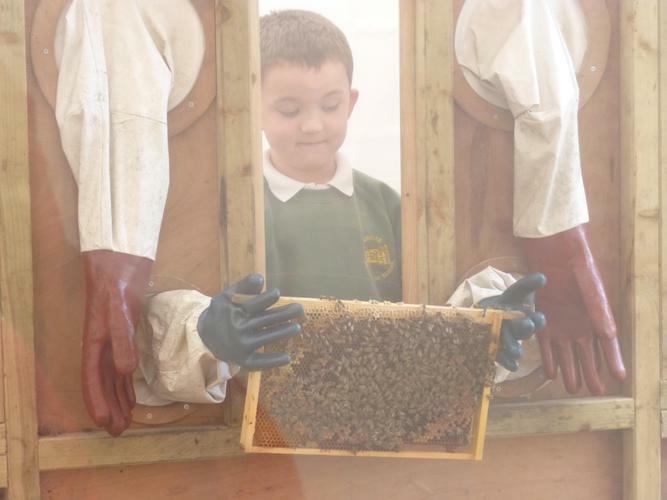 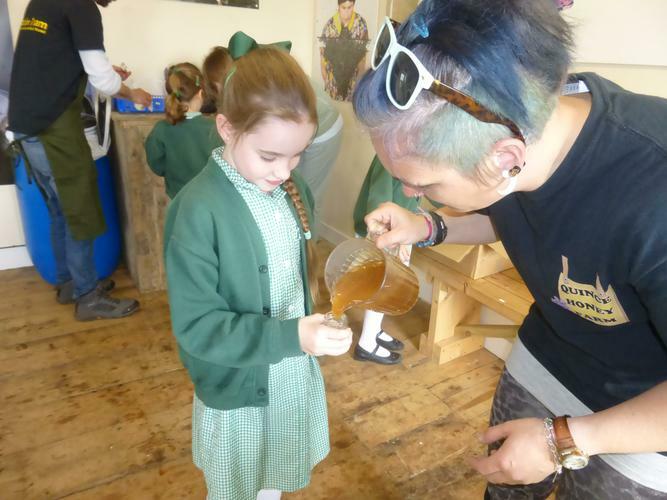 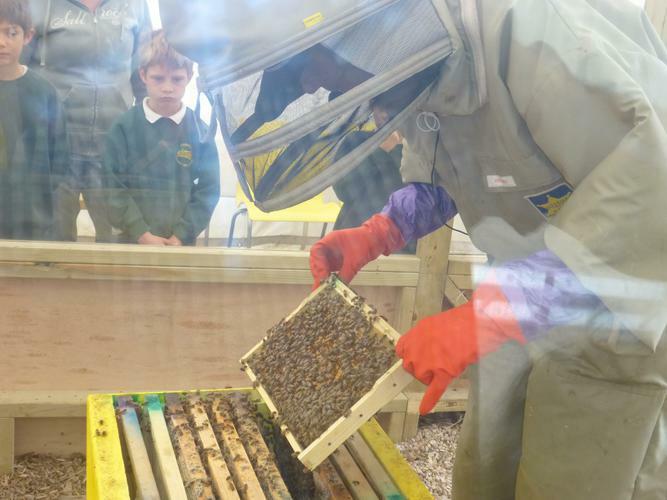 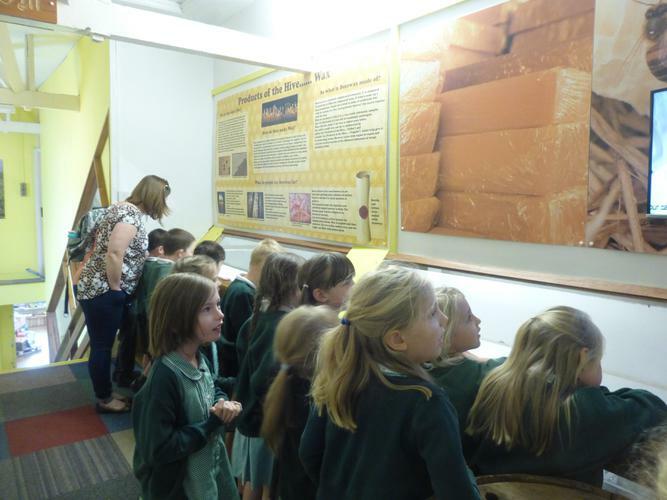 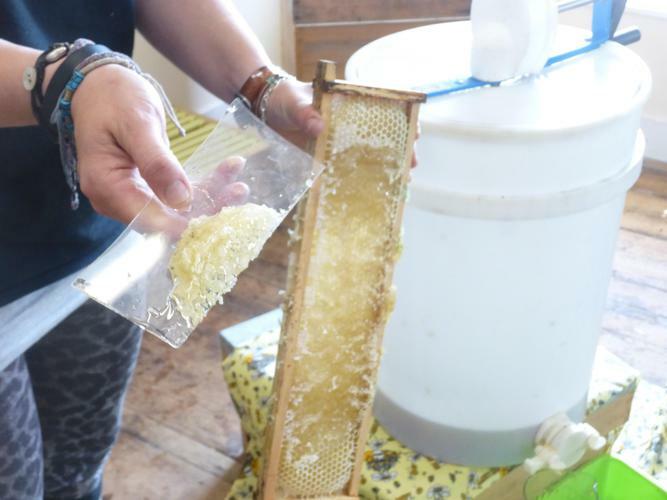 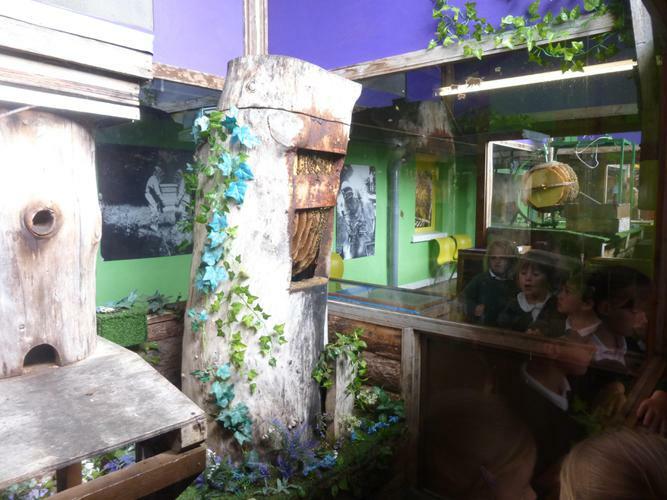 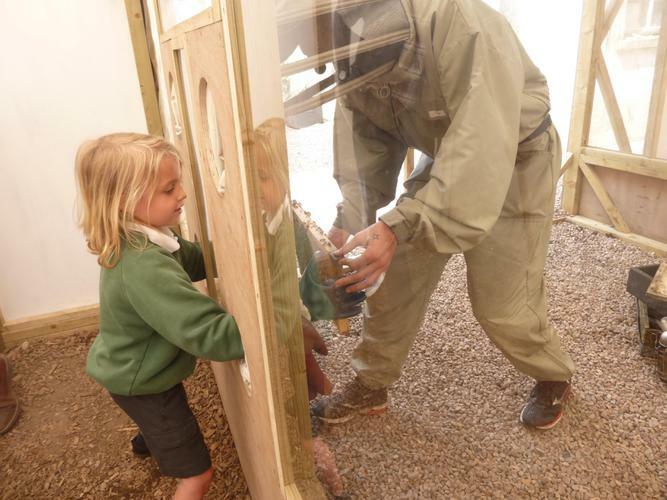 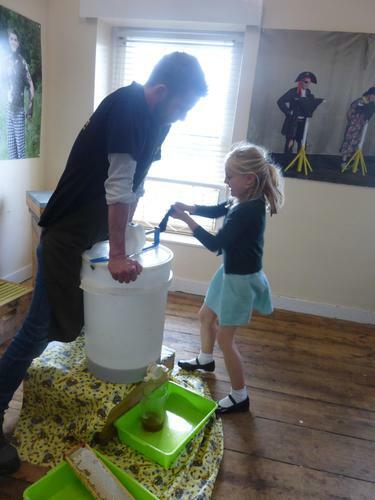 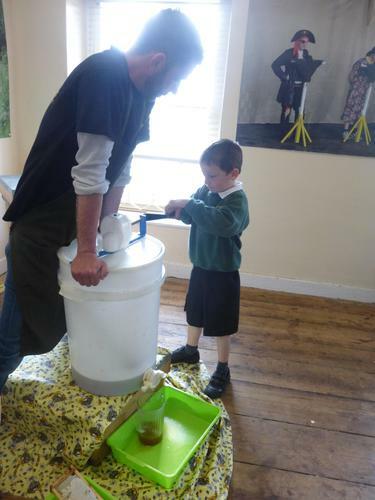 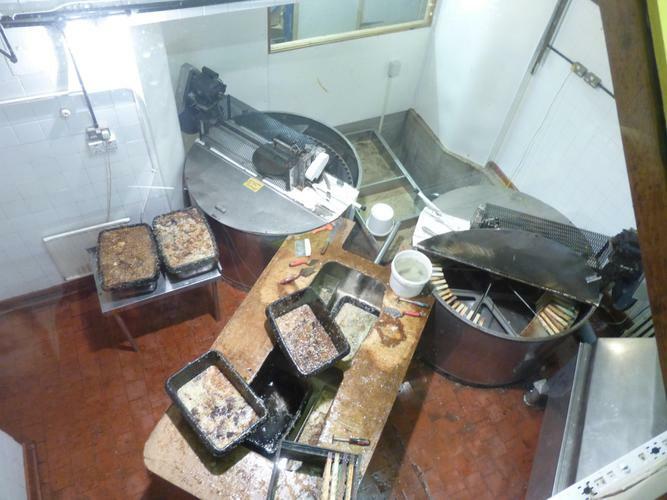 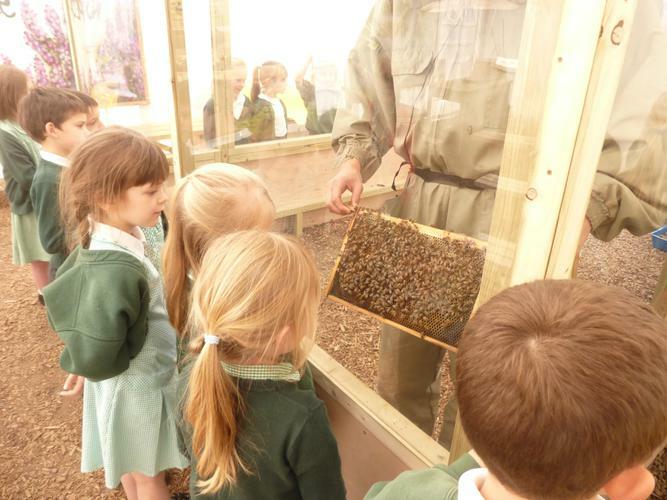 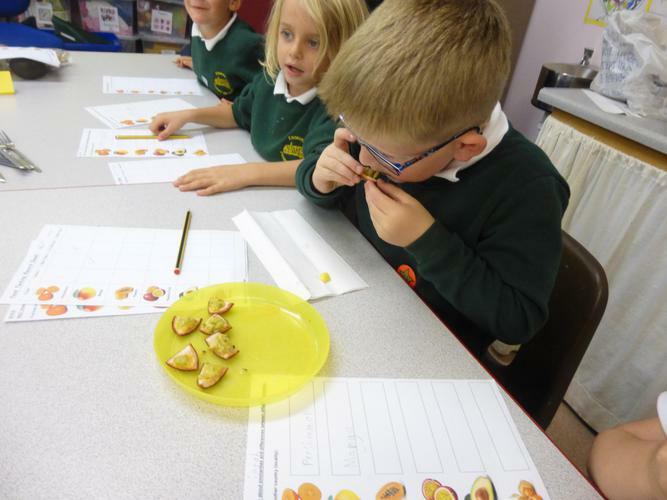 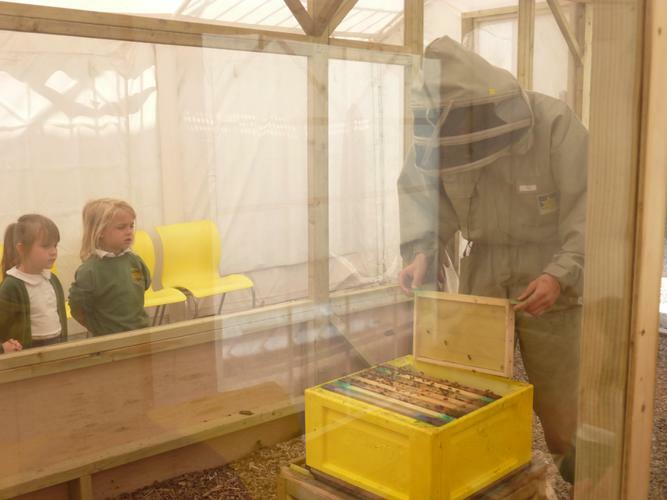 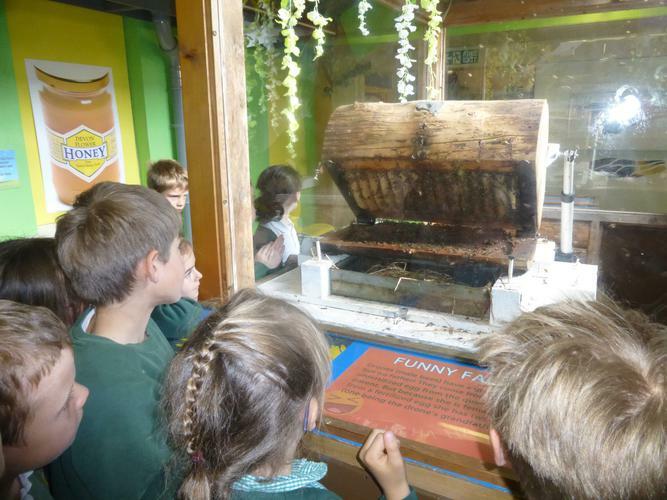 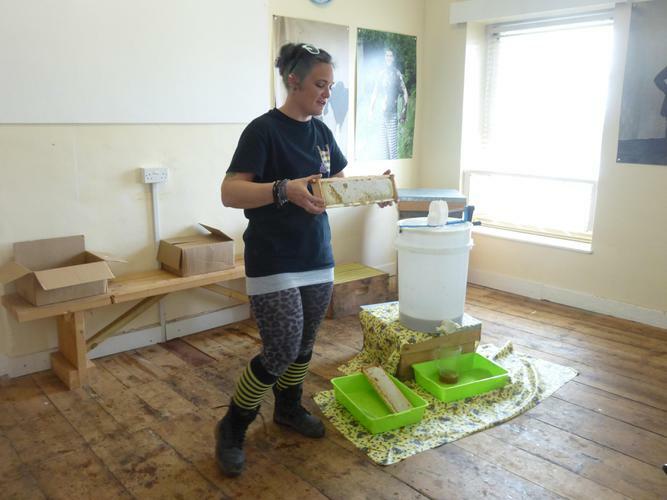 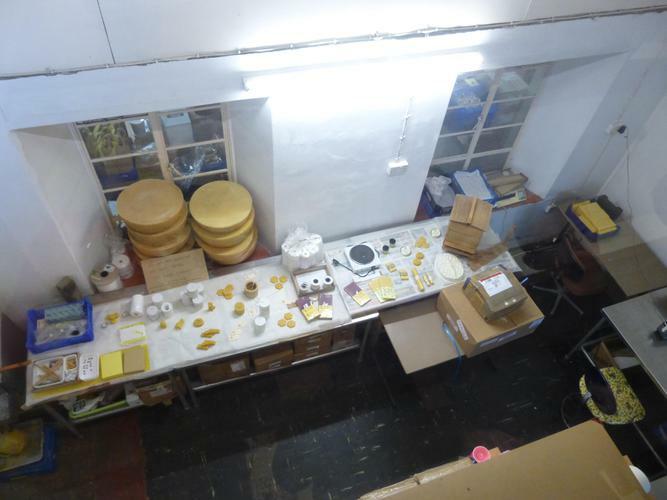 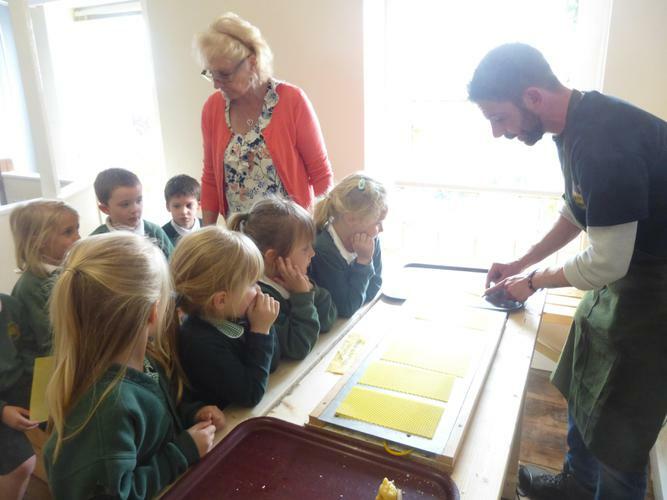 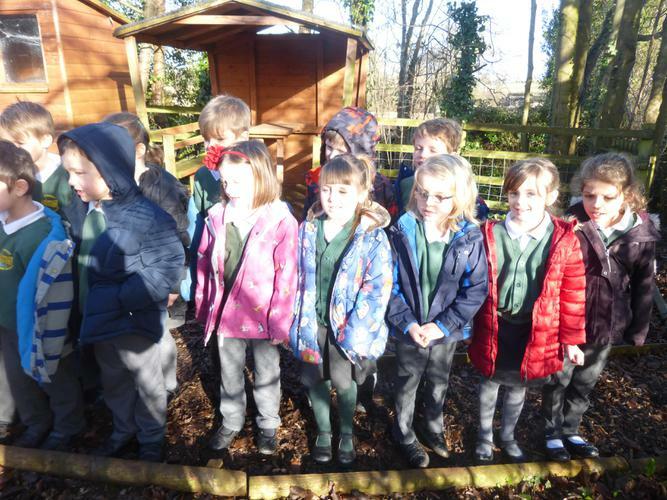 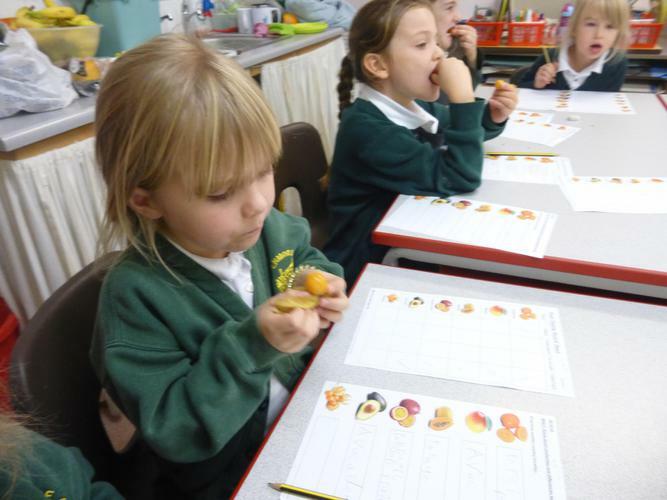 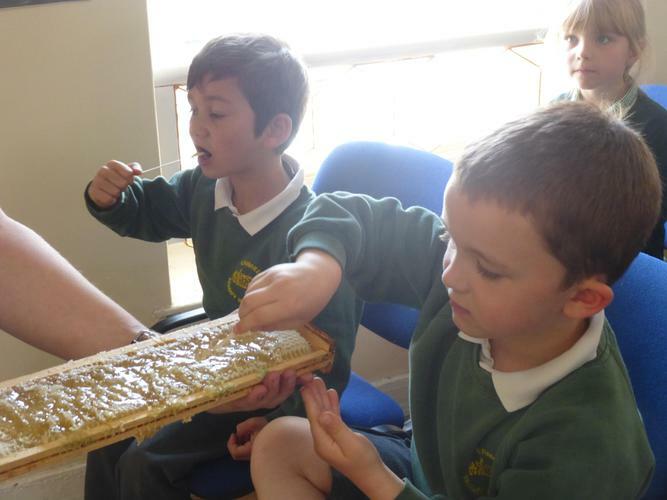 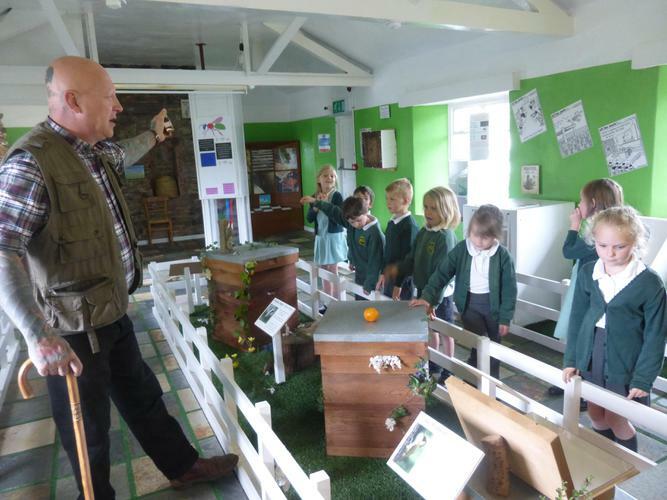 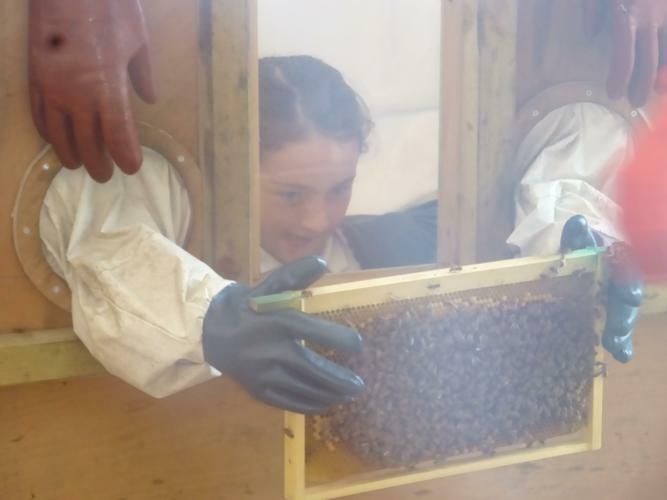 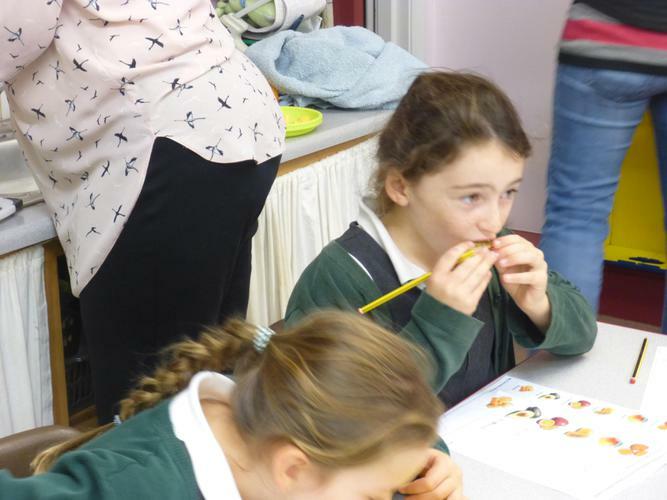 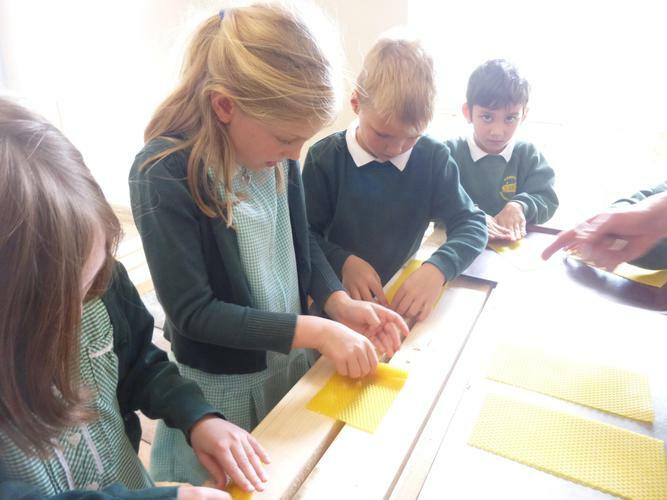 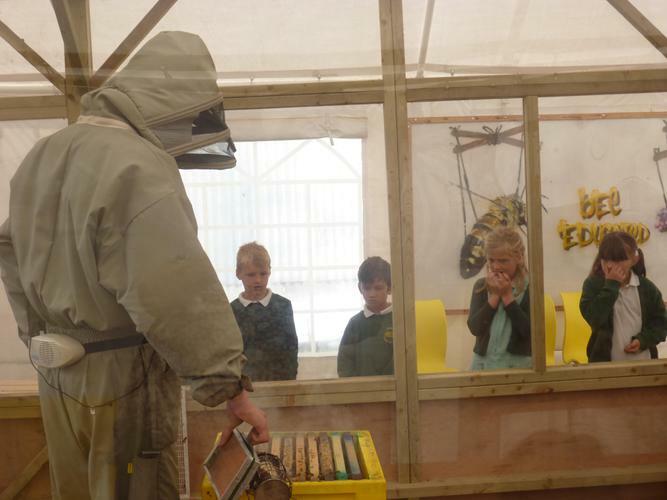 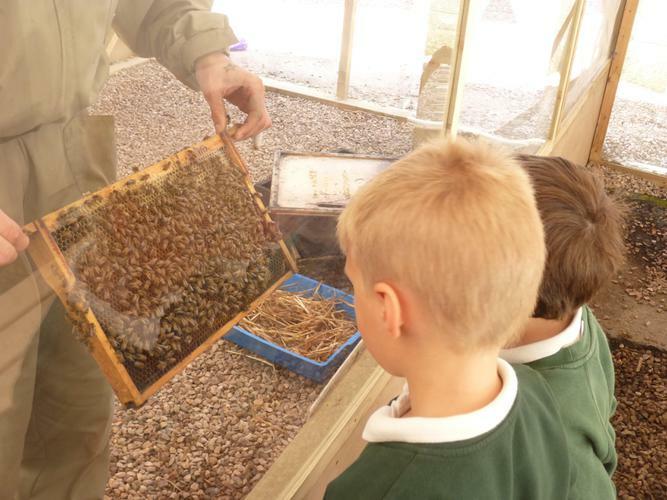 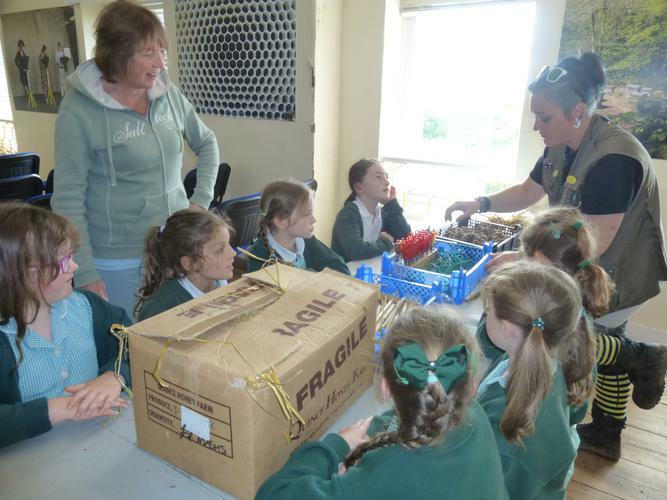 As part of our topic on plants and insects, we visited Quince Honey Farm to understand a little more about honey bees and why they are so important. 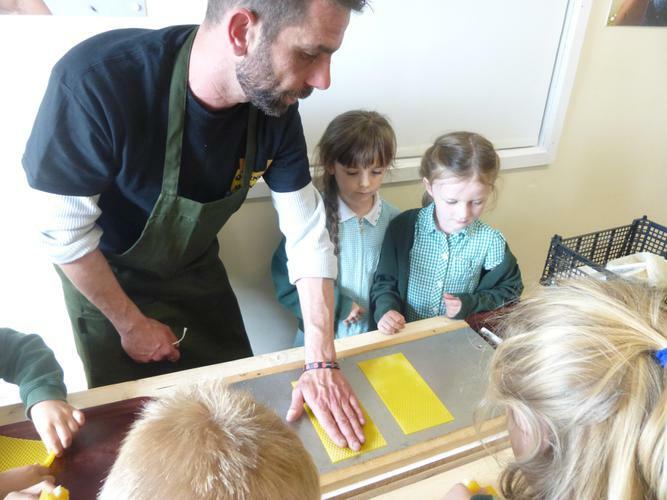 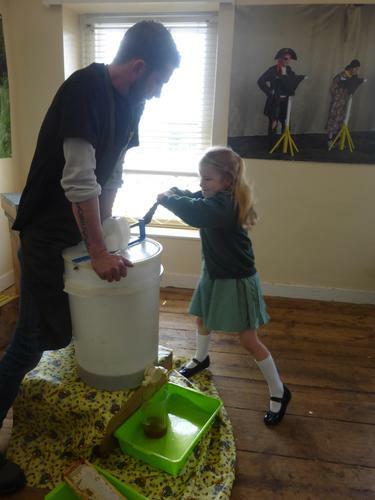 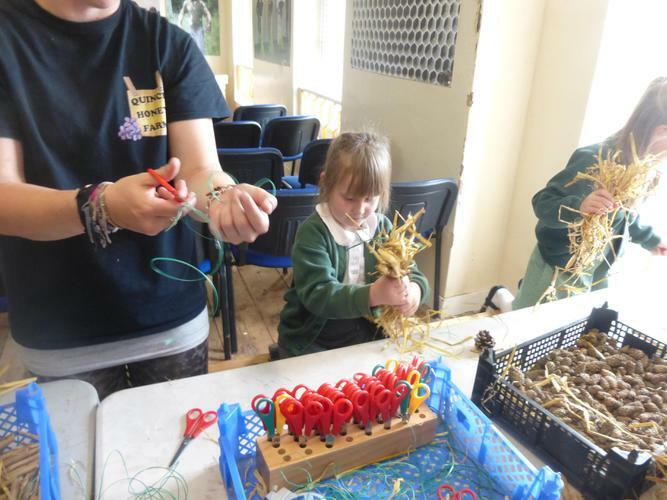 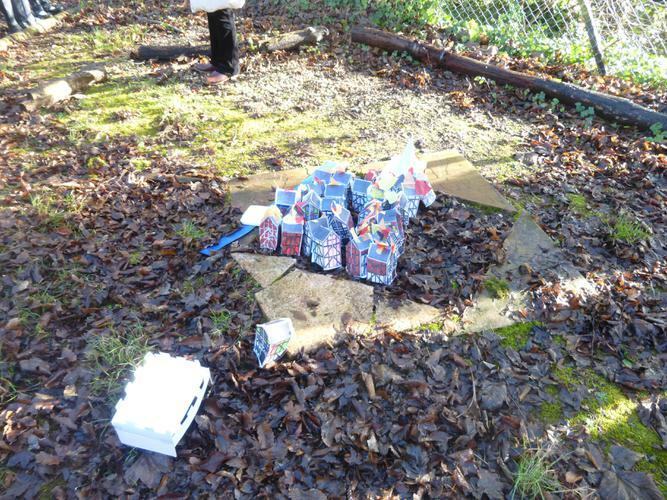 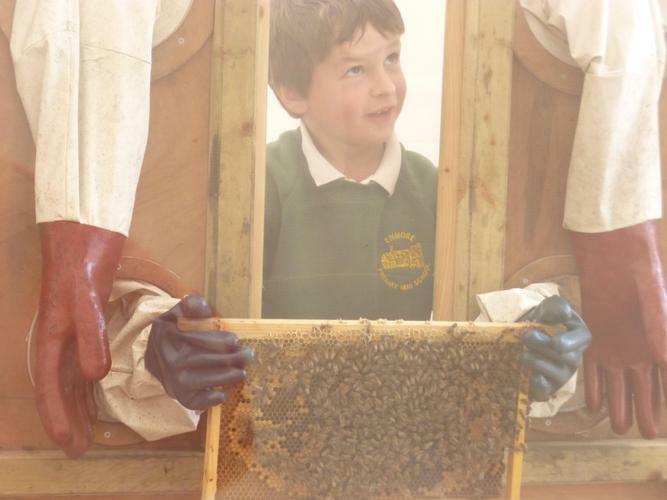 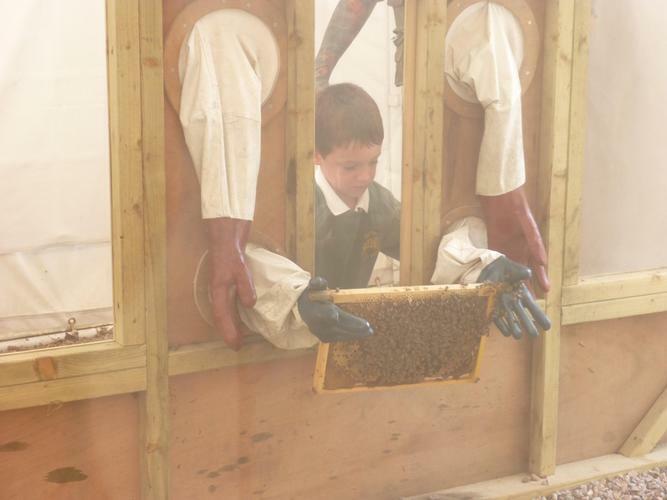 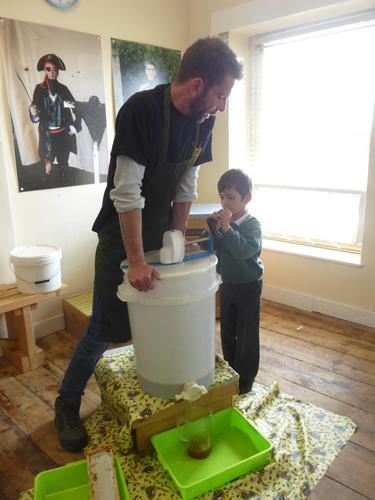 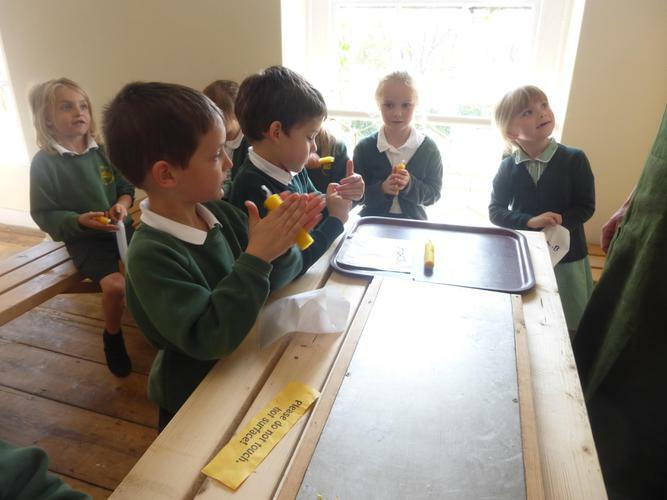 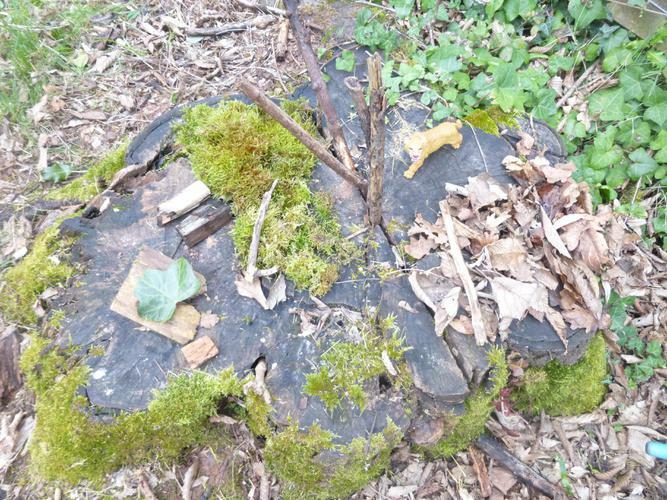 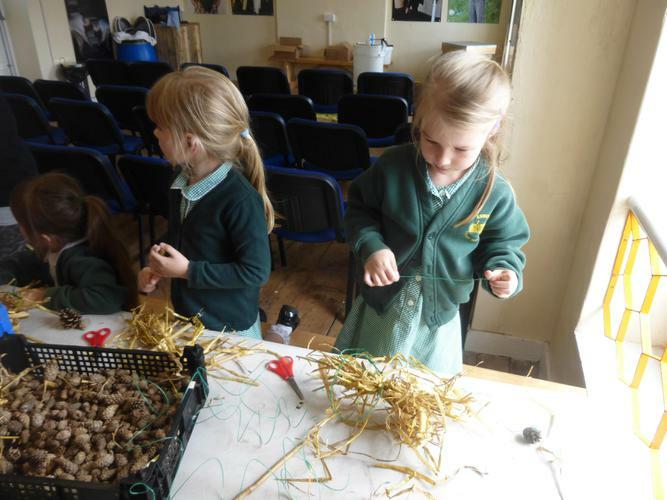 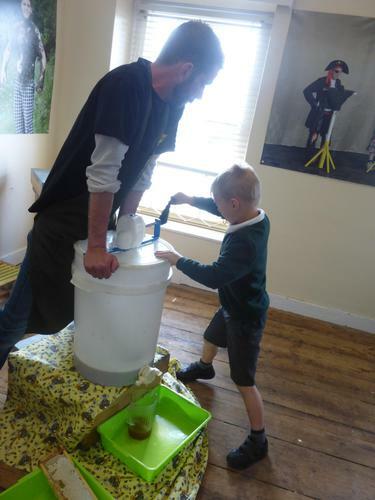 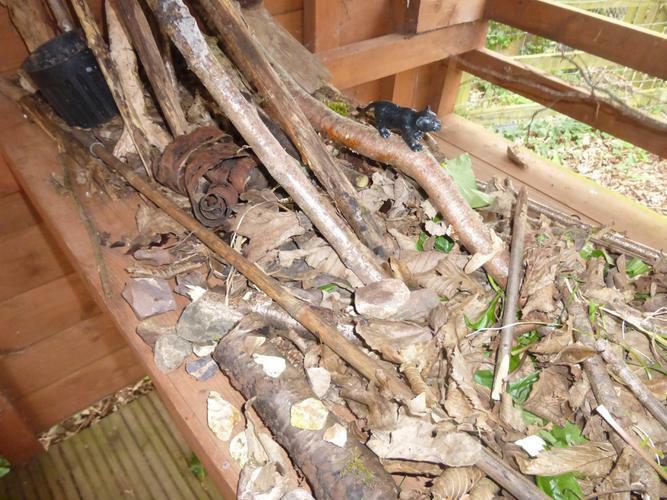 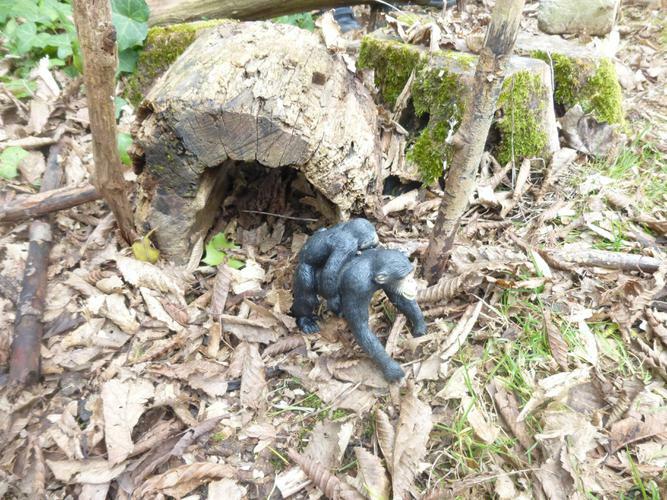 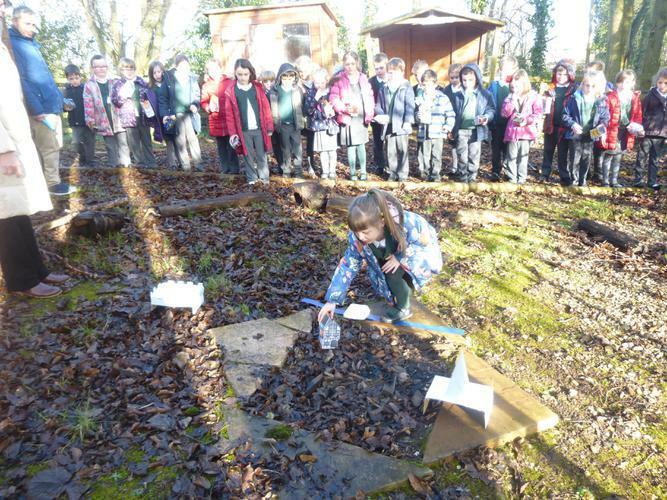 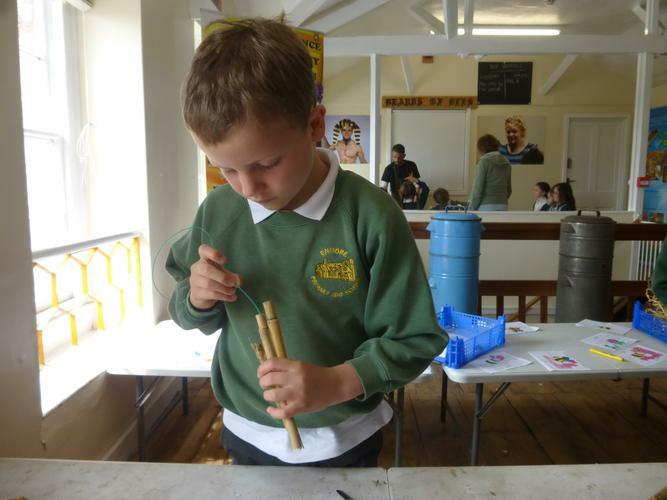 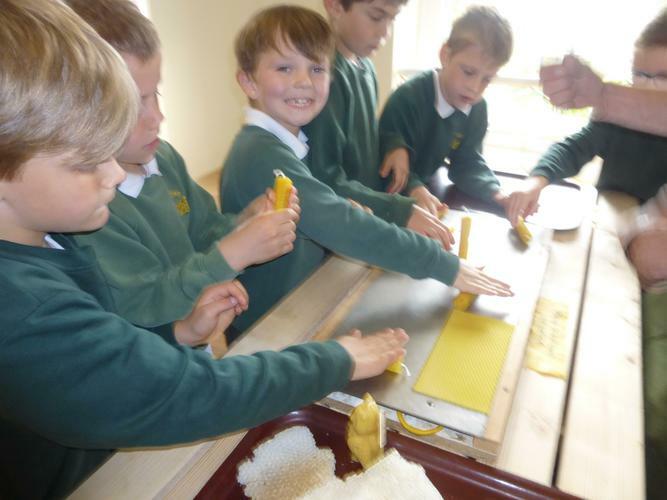 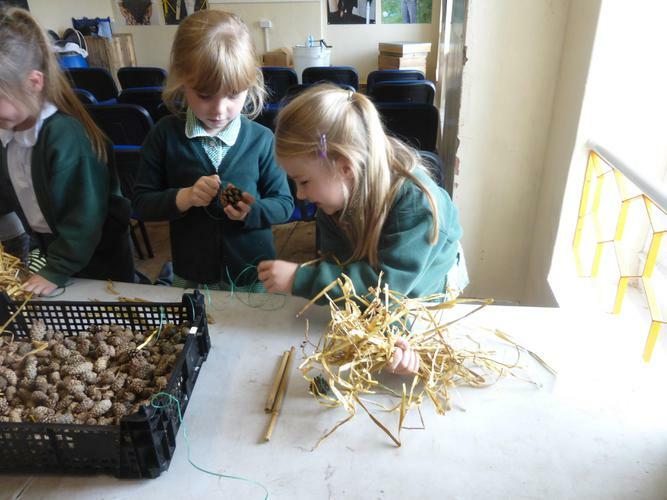 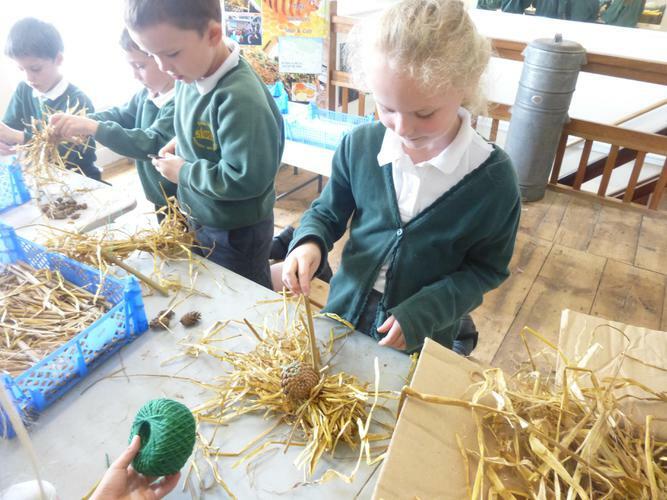 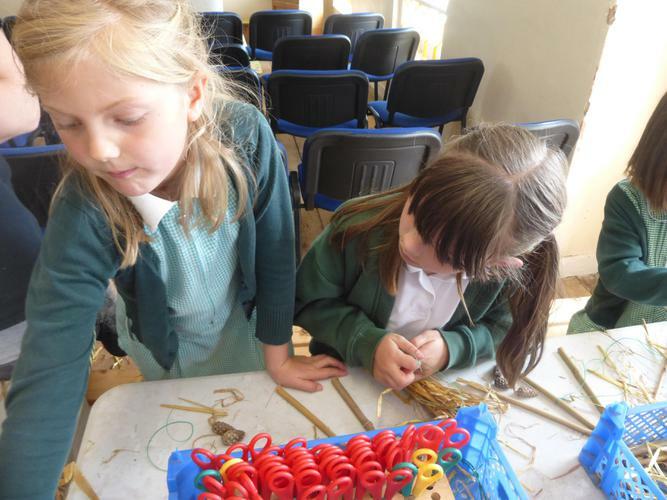 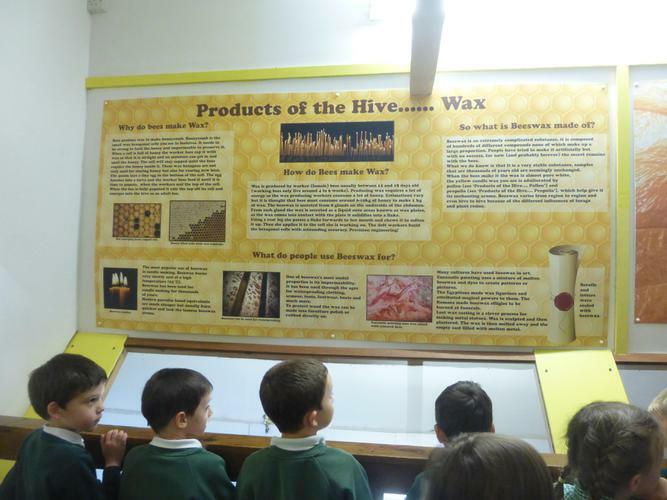 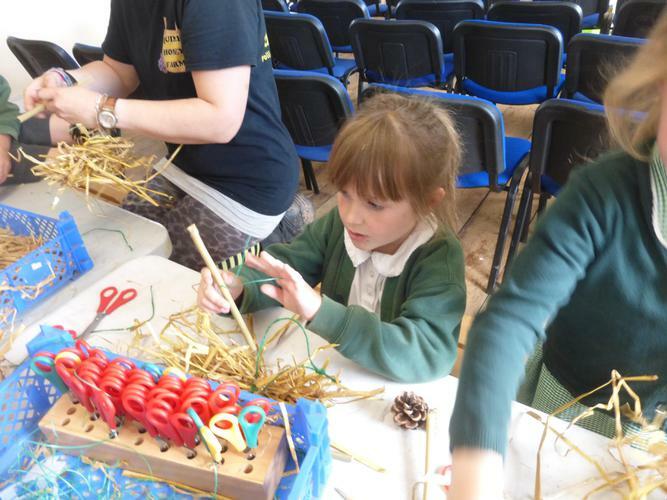 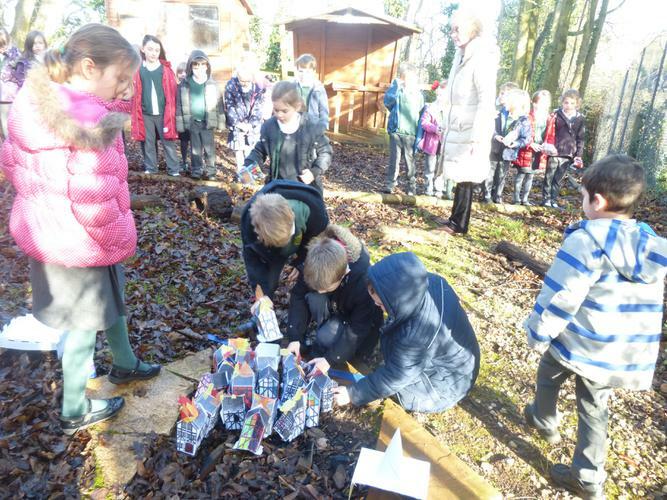 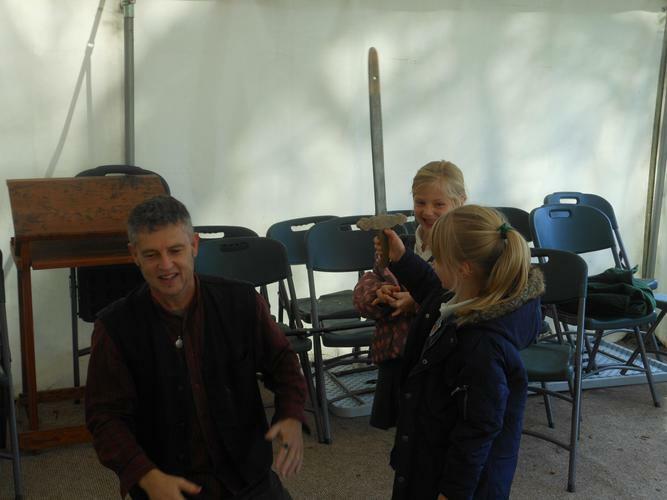 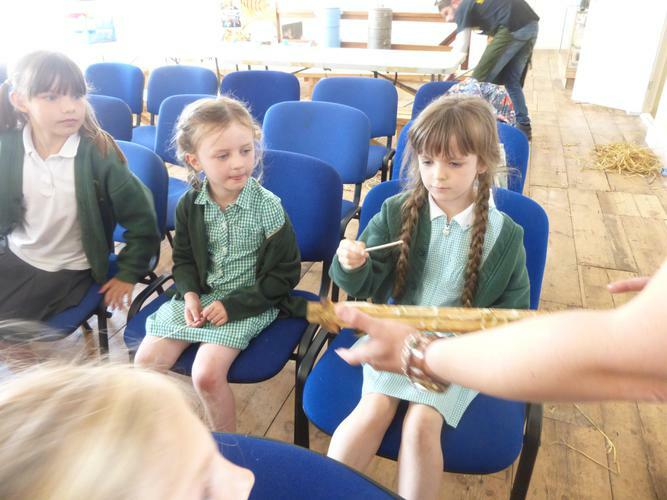 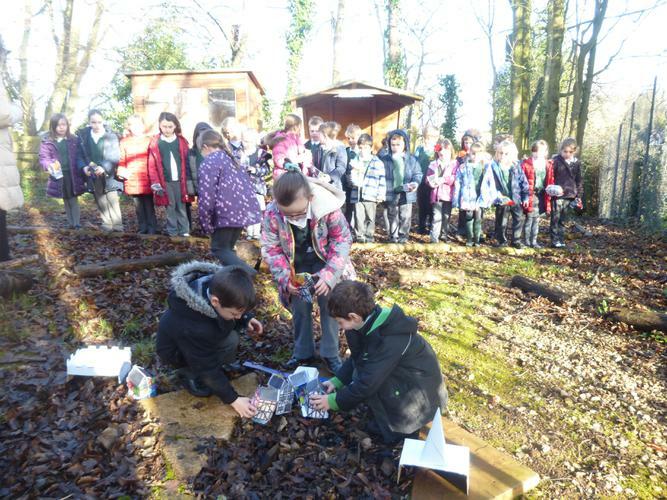 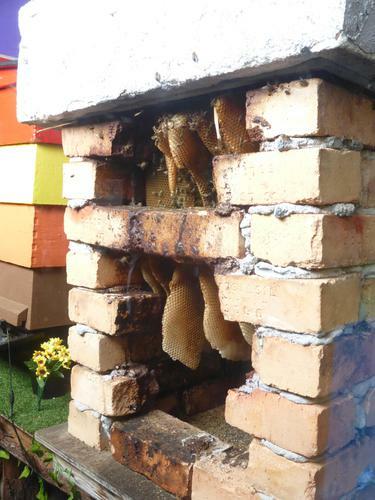 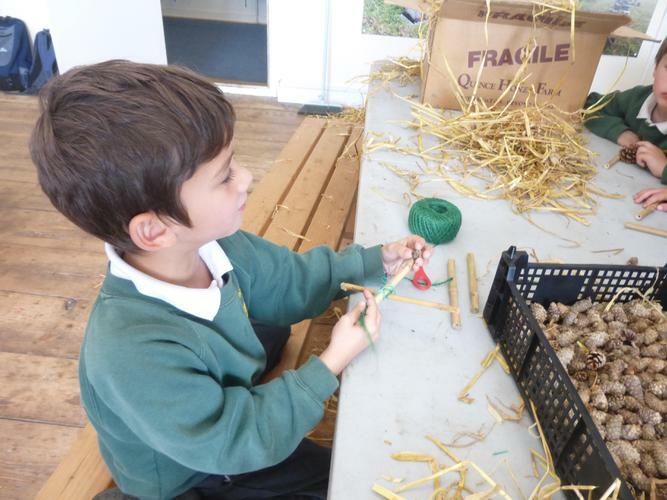 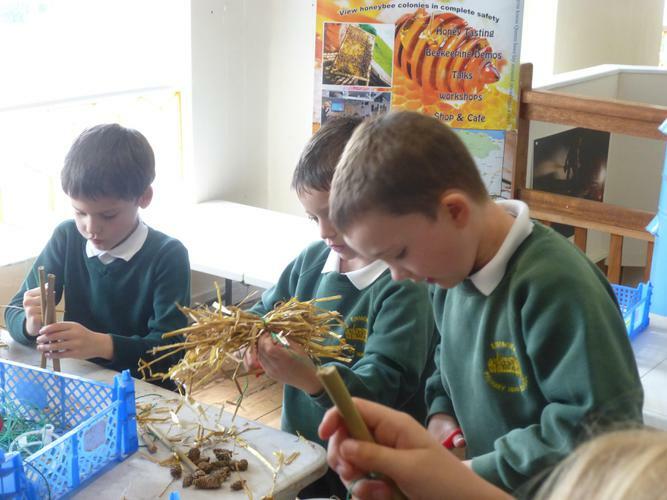 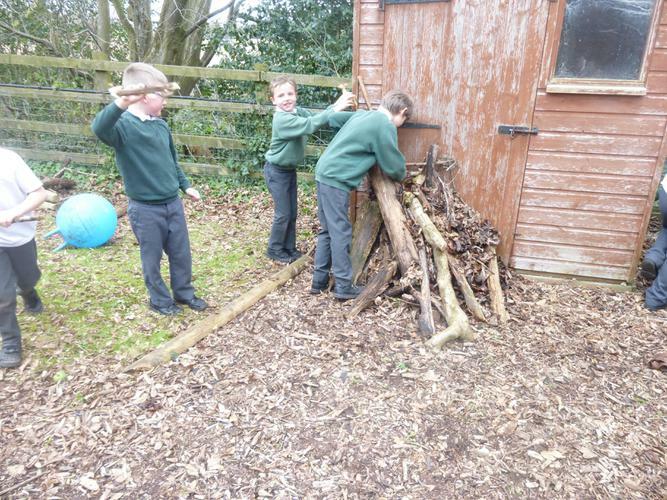 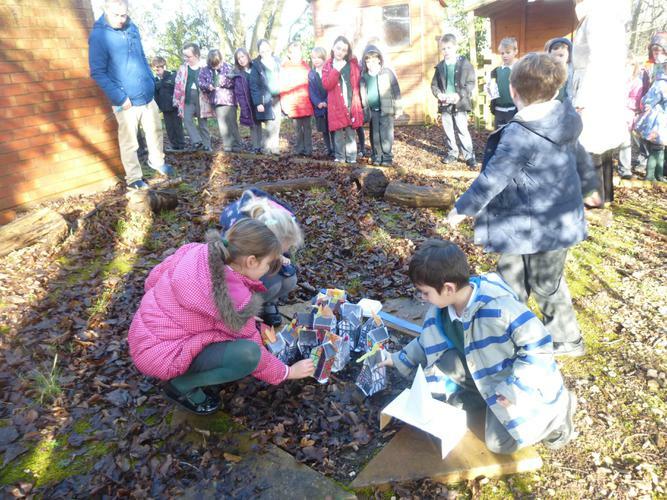 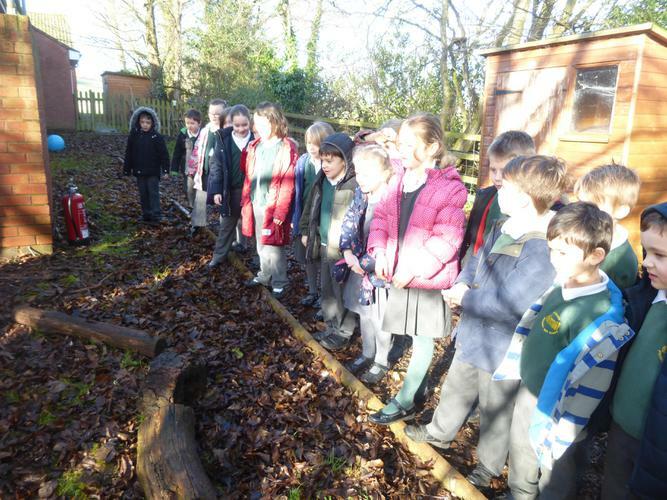 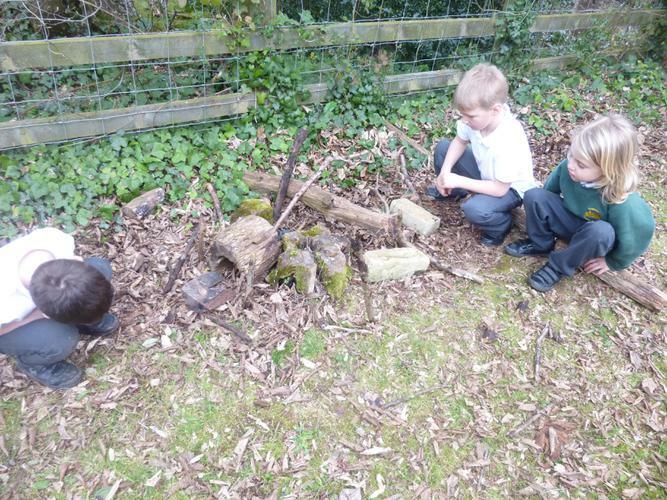 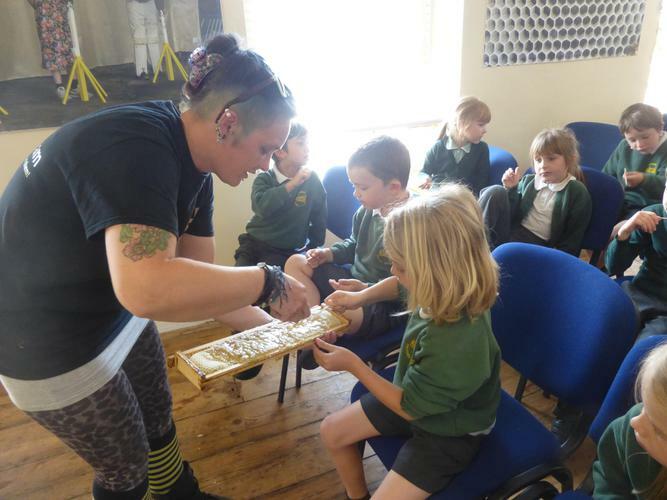 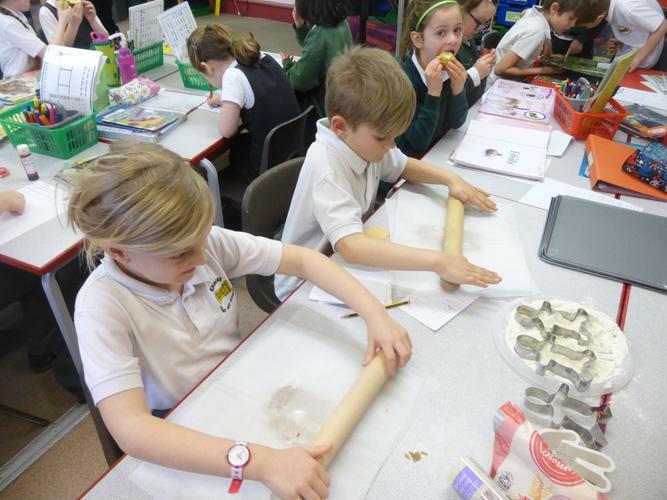 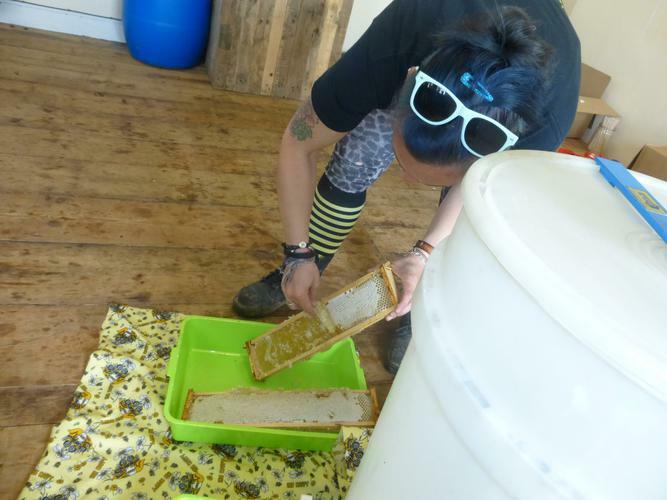 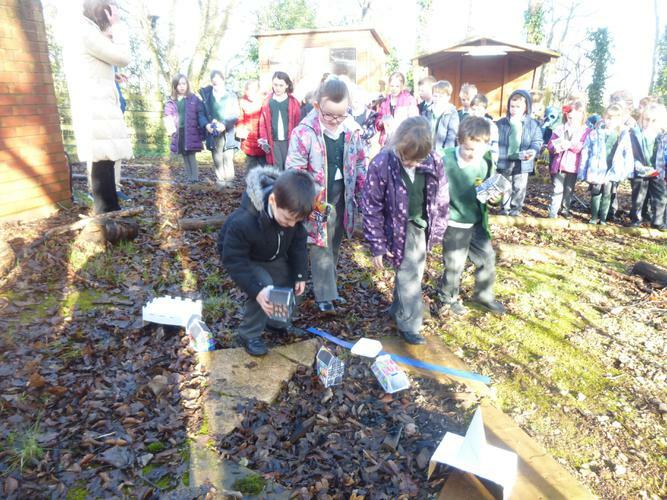 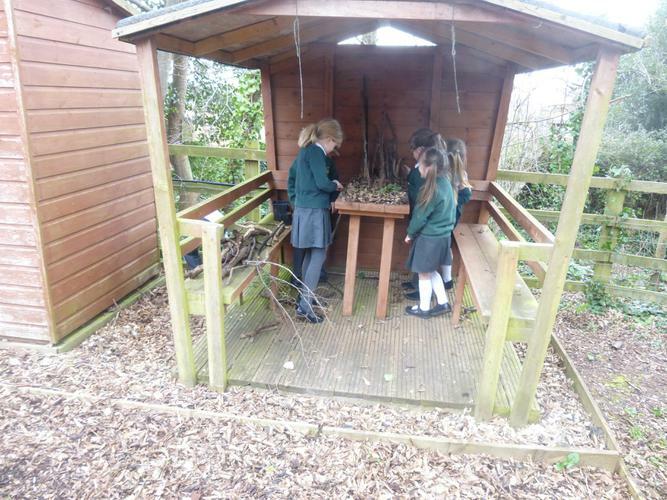 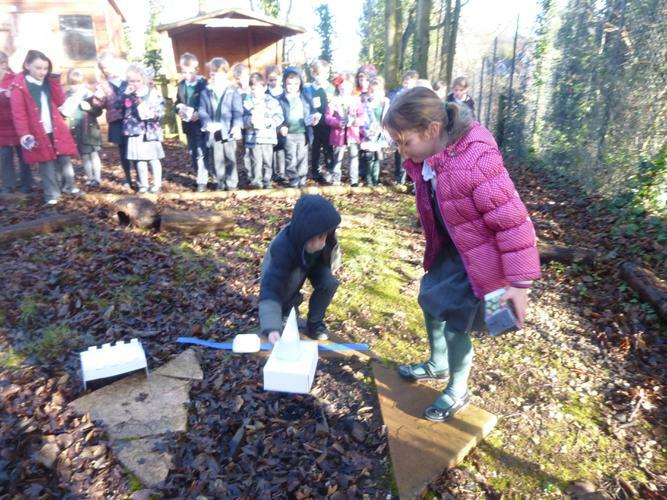 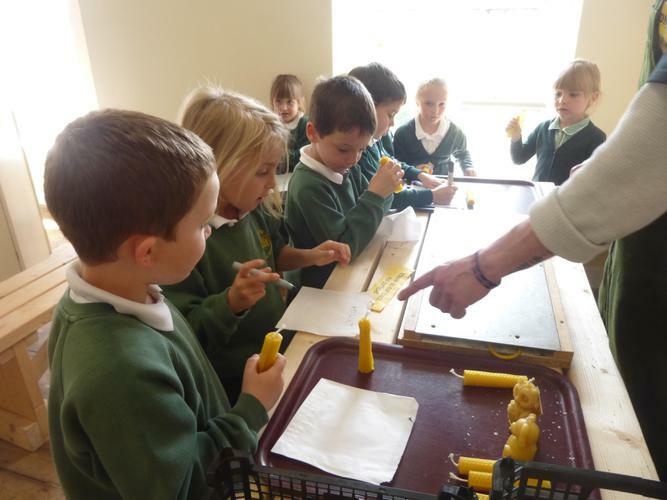 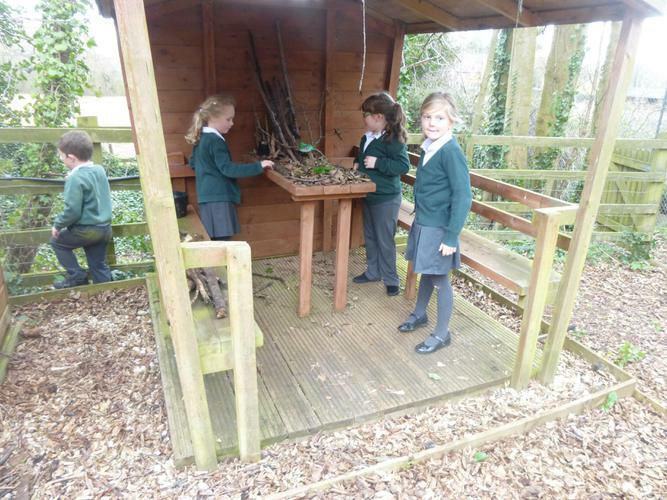 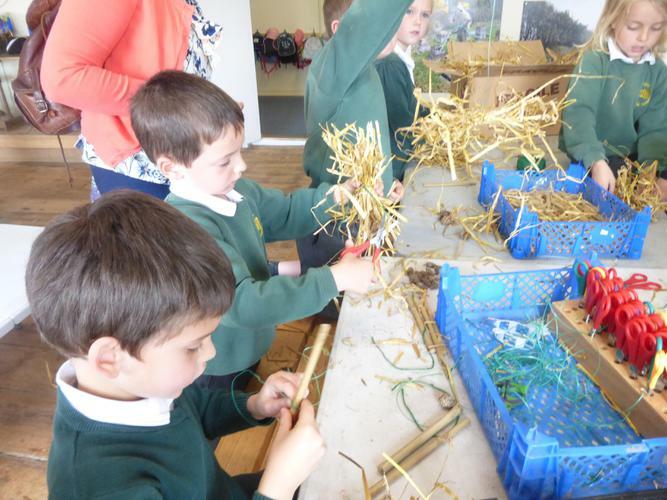 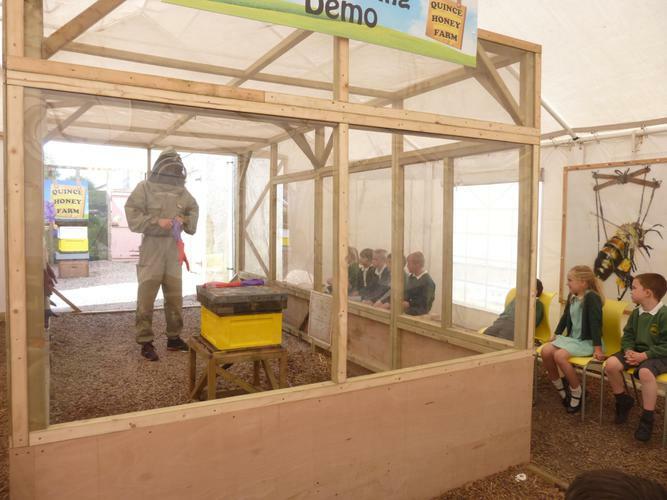 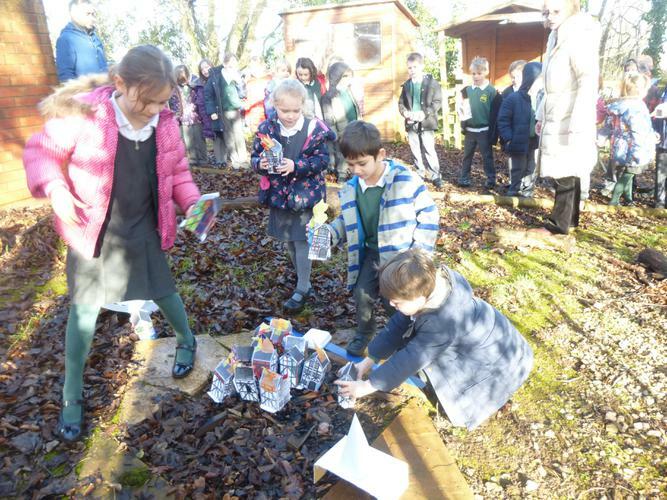 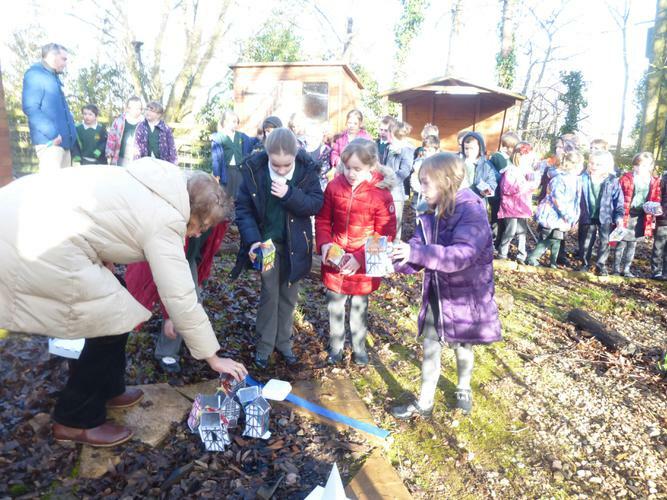 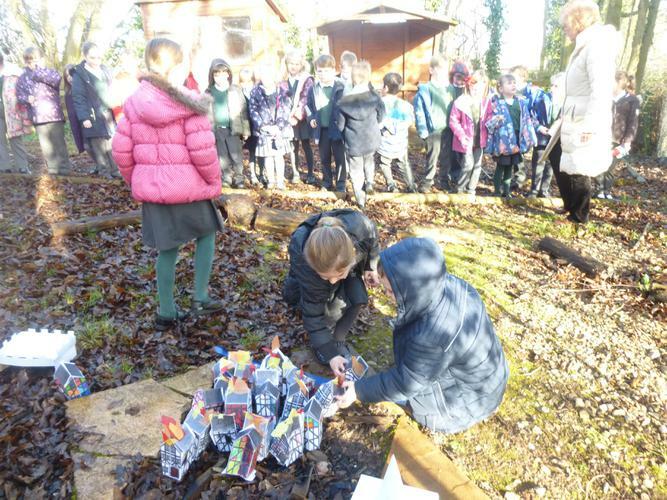 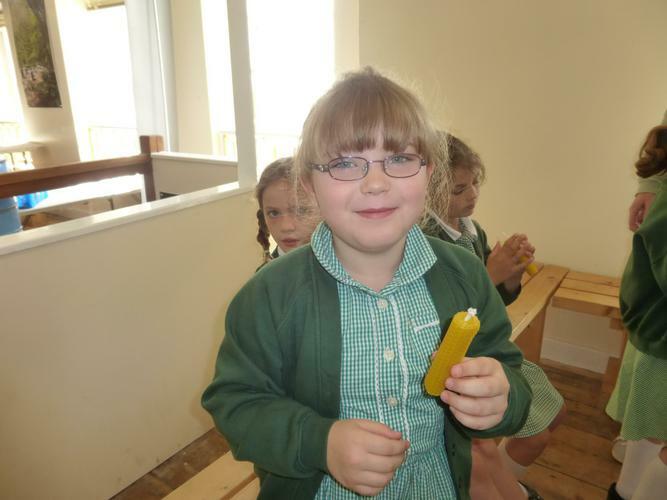 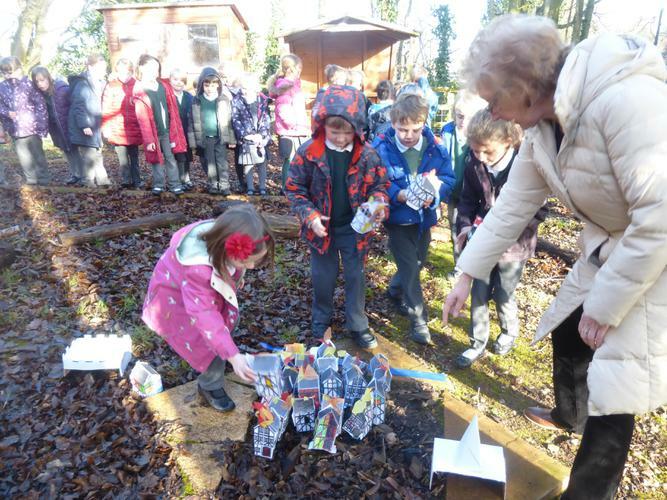 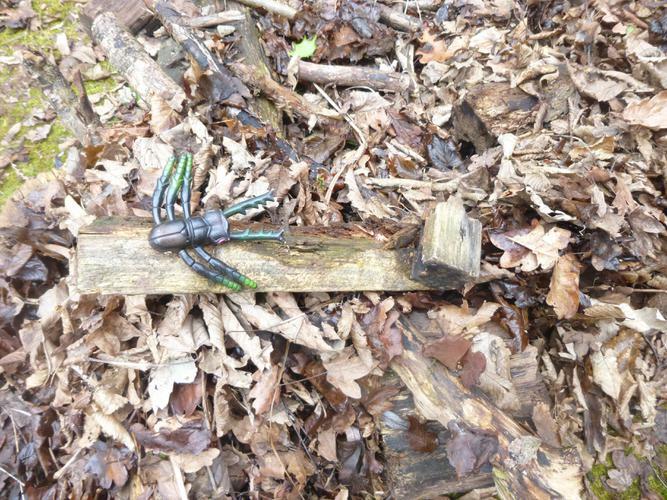 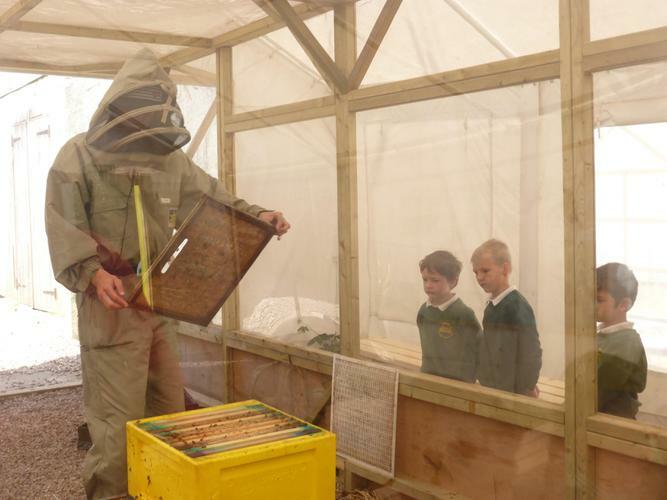 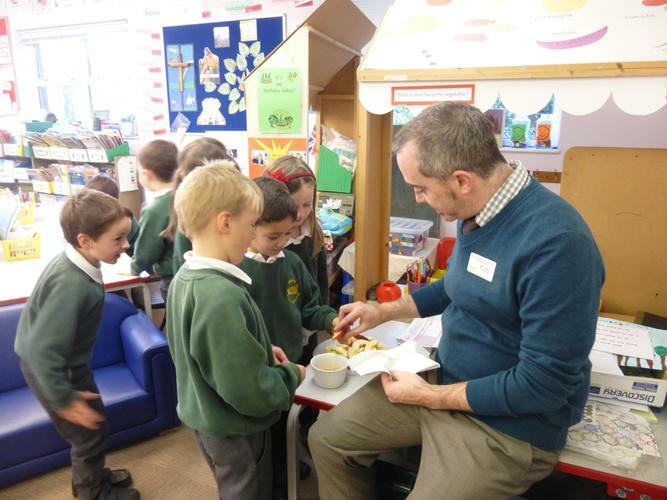 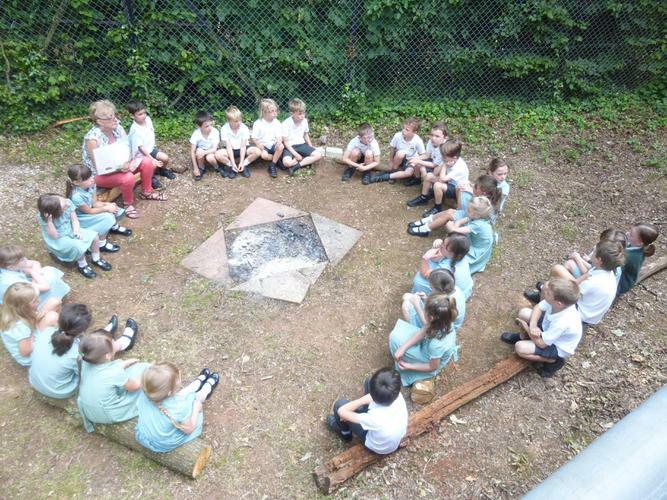 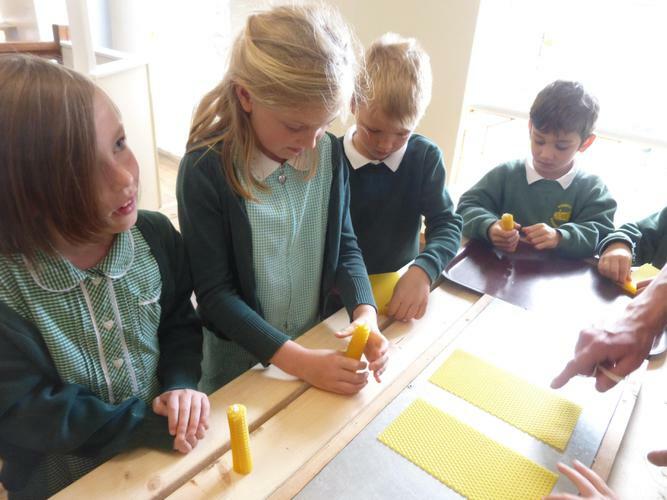 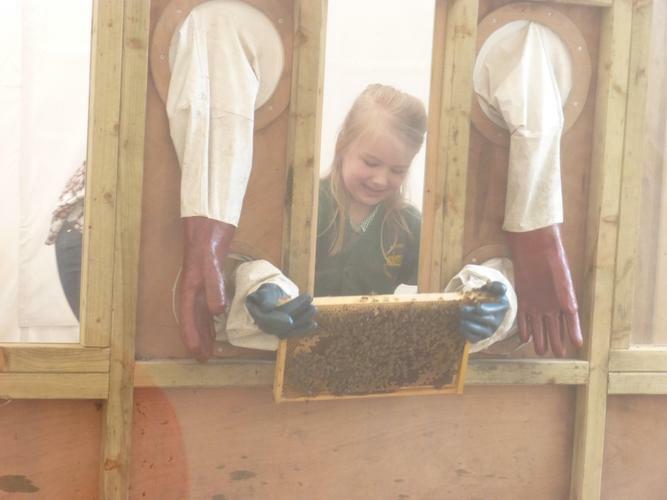 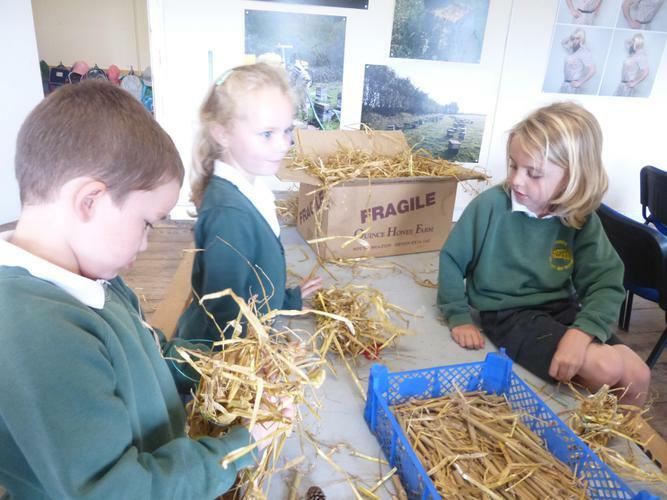 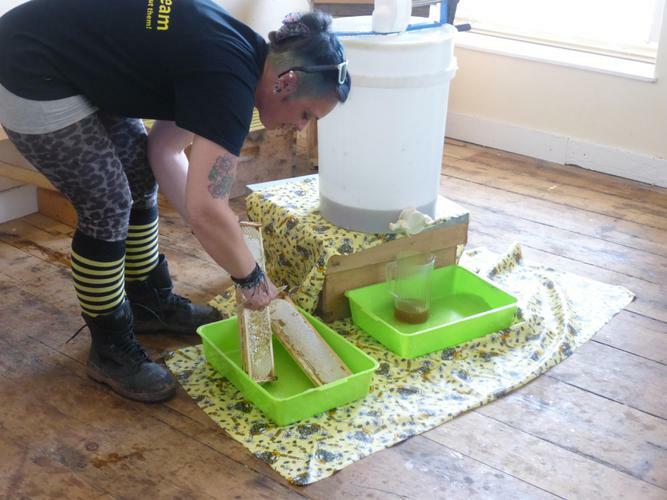 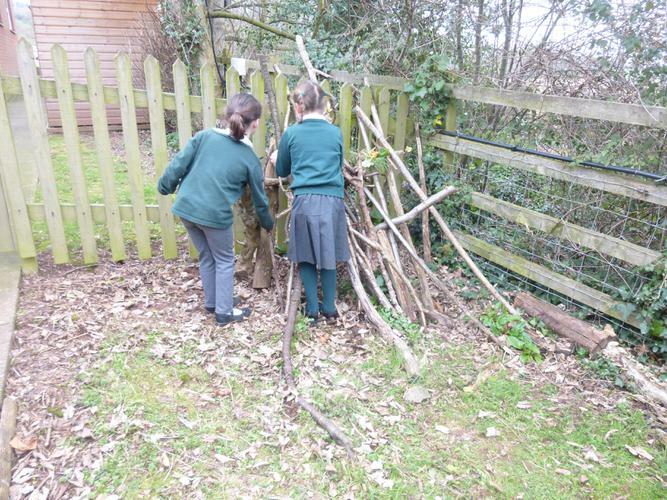 We also took part in candle rolling (out of bees wax), bug hotel building and honey extraction. 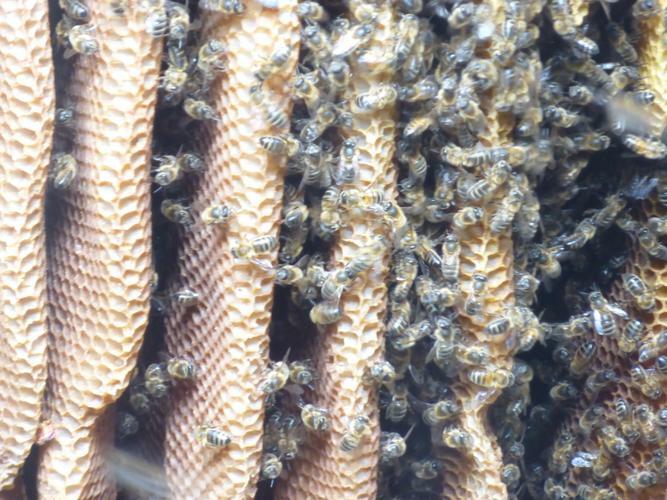 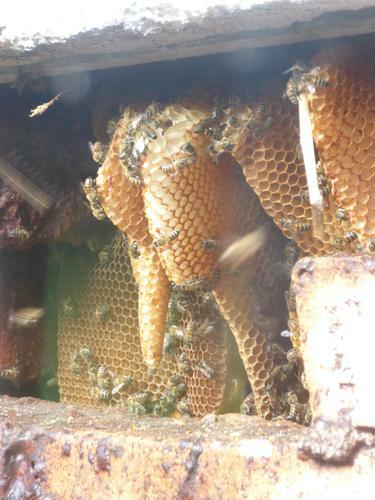 We also got up close and personal with several honey bee hives! 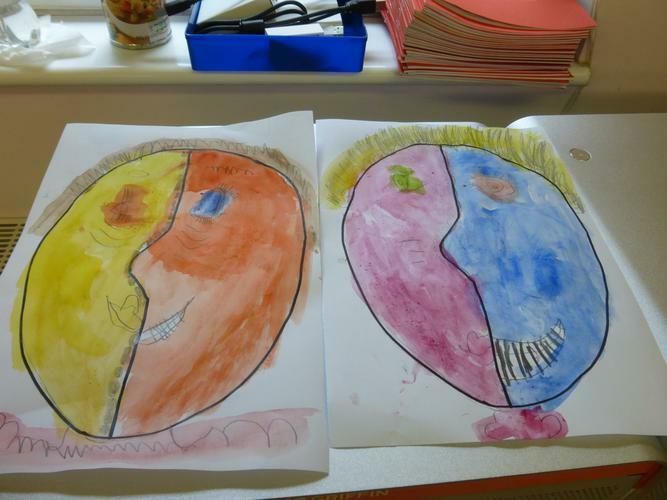 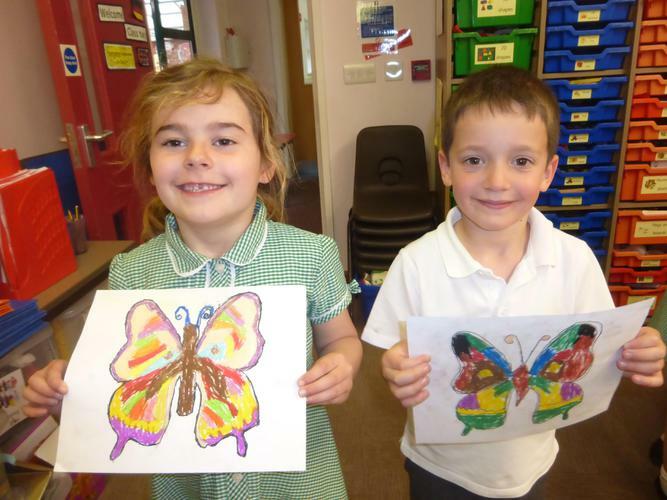 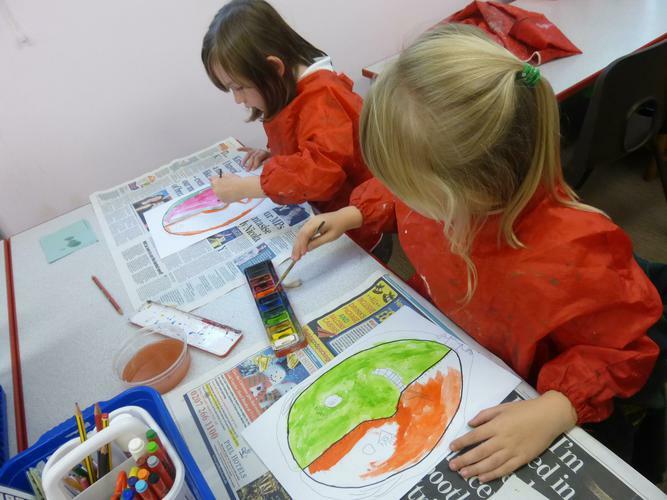 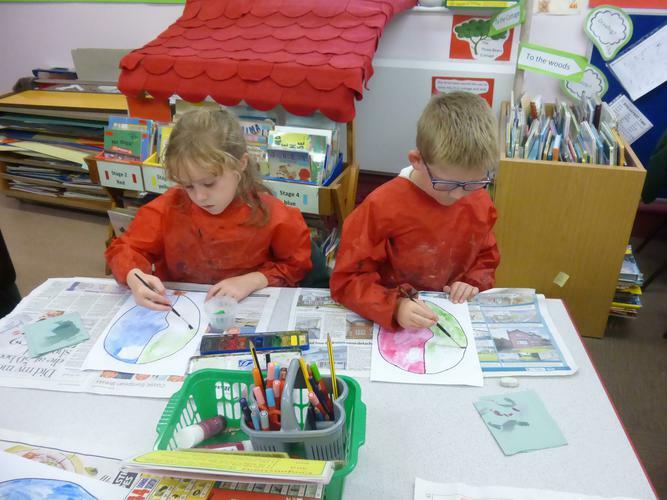 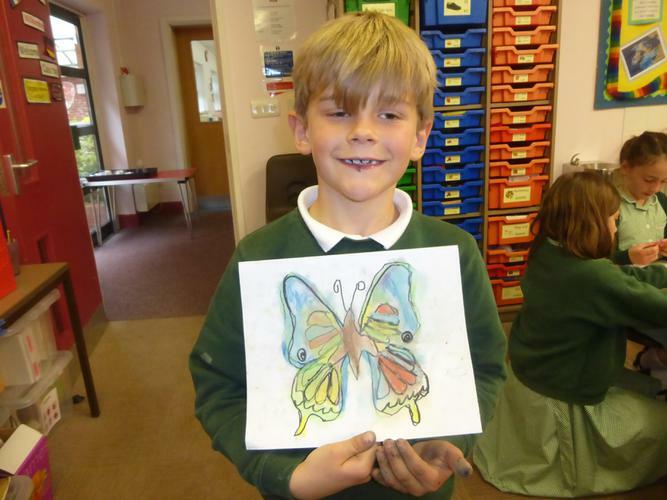 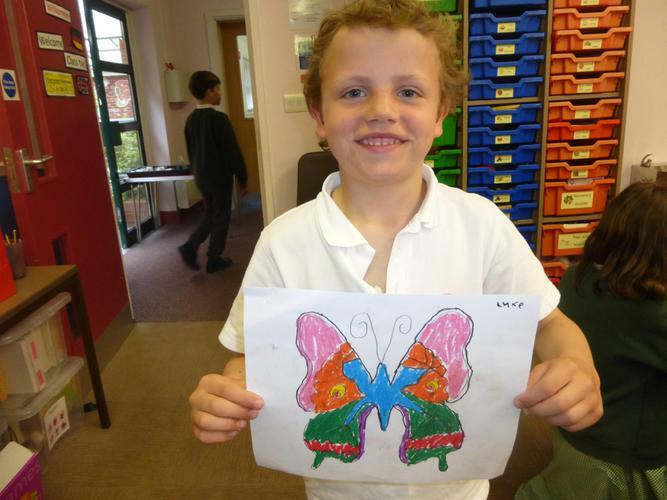 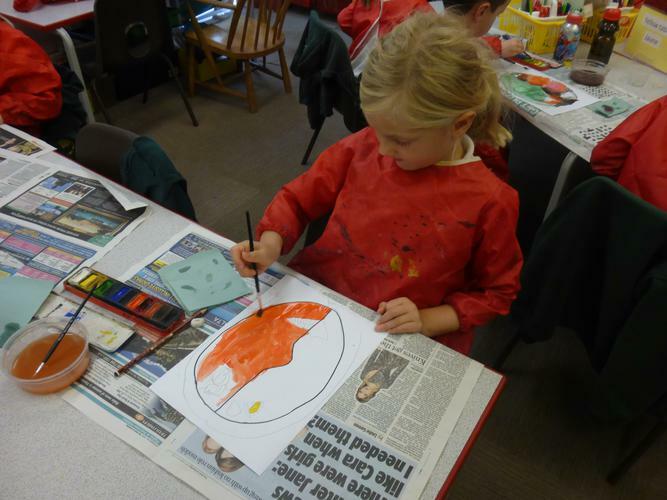 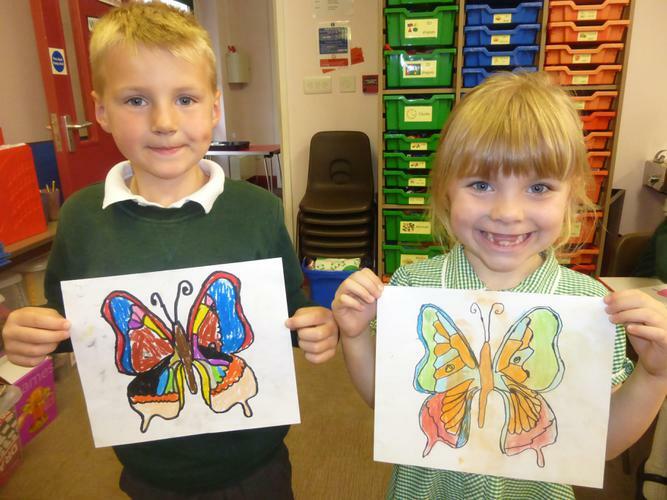 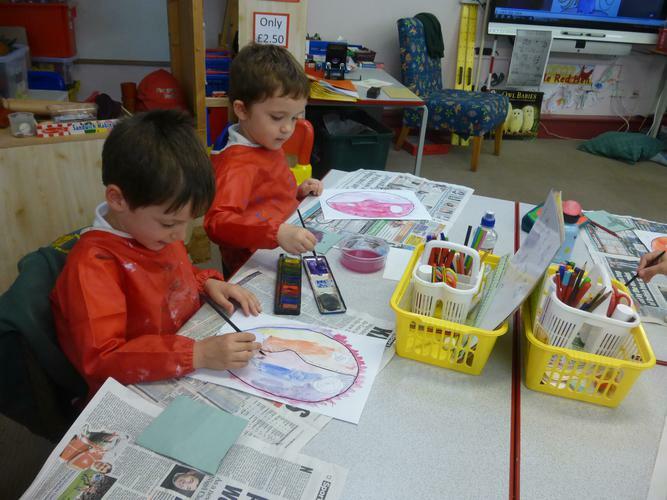 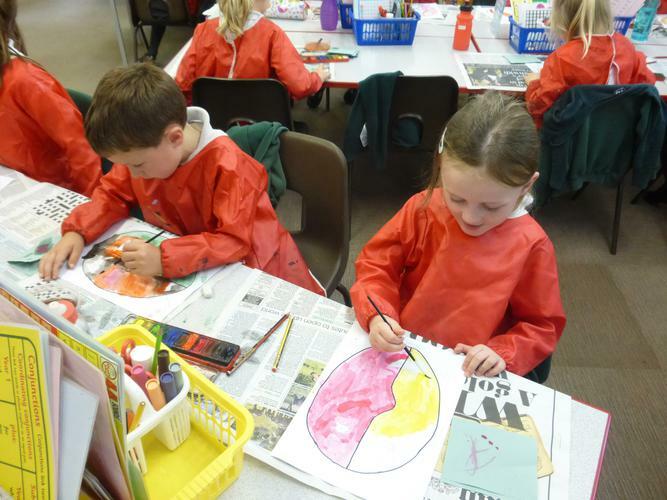 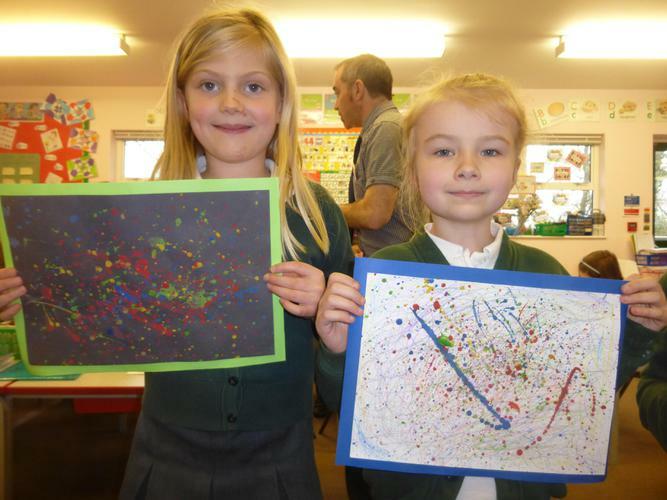 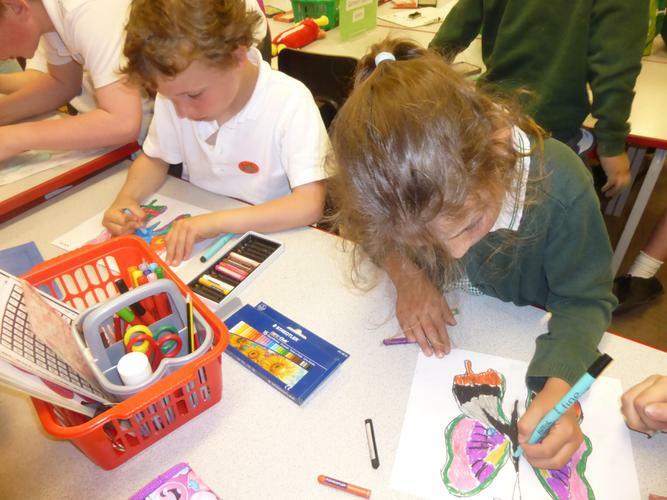 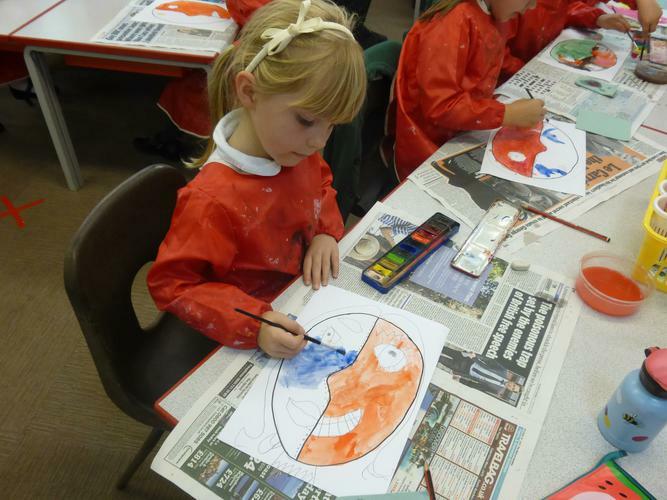 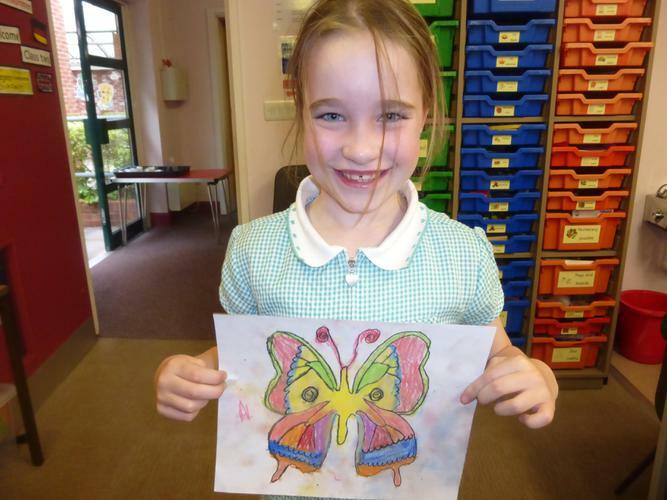 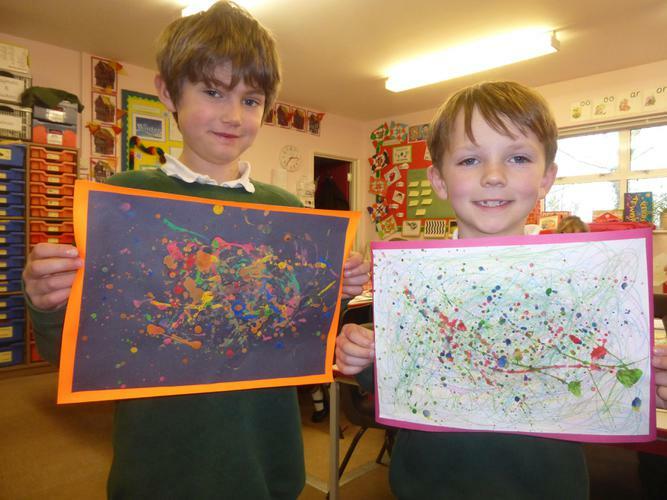 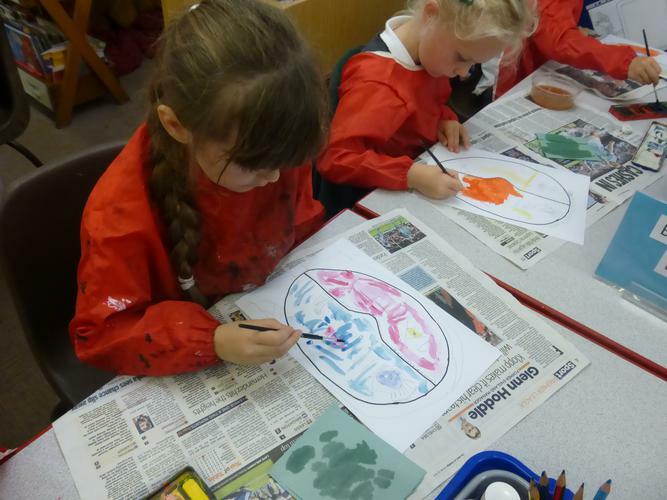 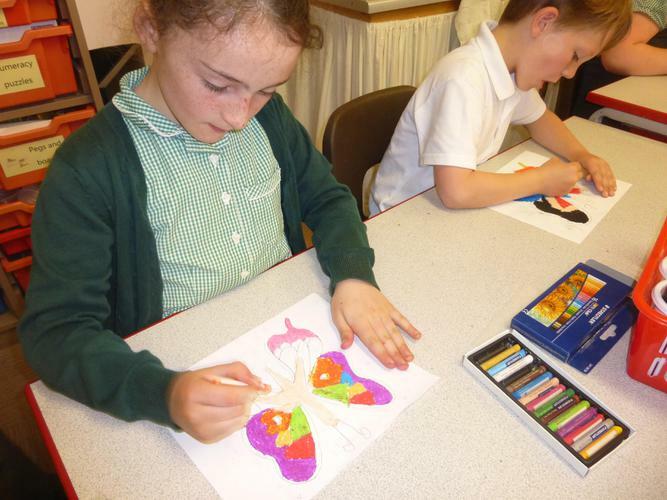 We have been using pastels to create some wonderful and vibrant butterfly pictures! 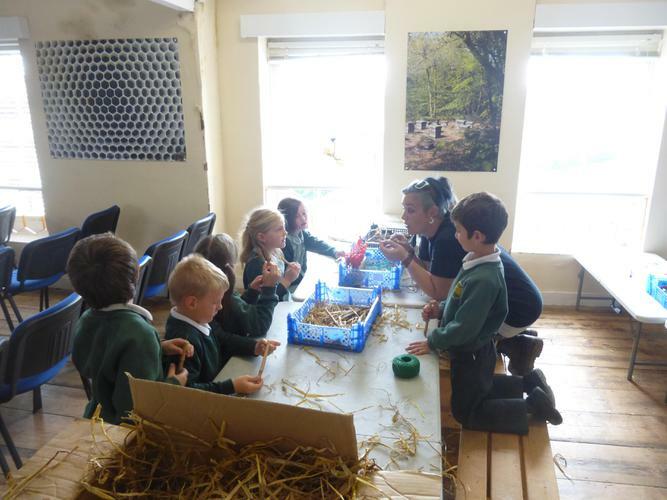 We have some ducklings in school. 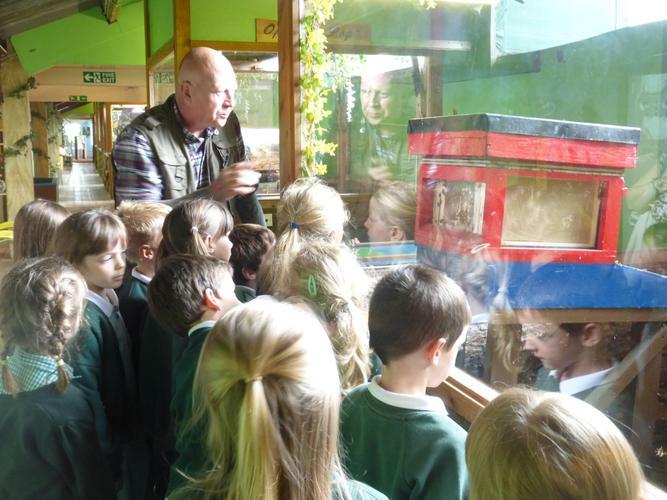 Last week we watched them hatch out. 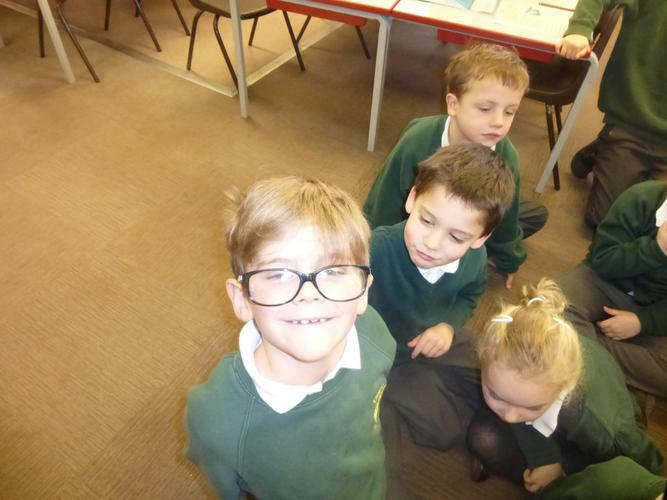 Now we are watching them swimming! 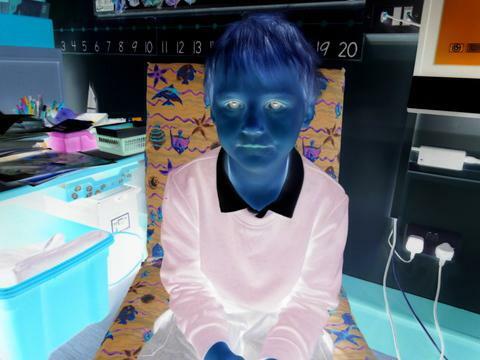 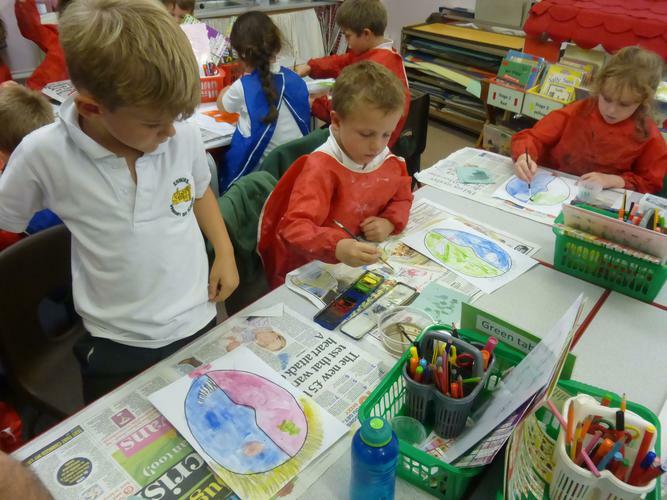 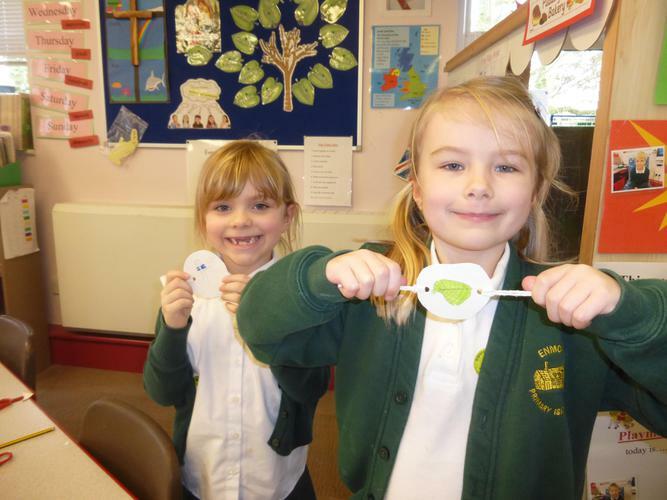 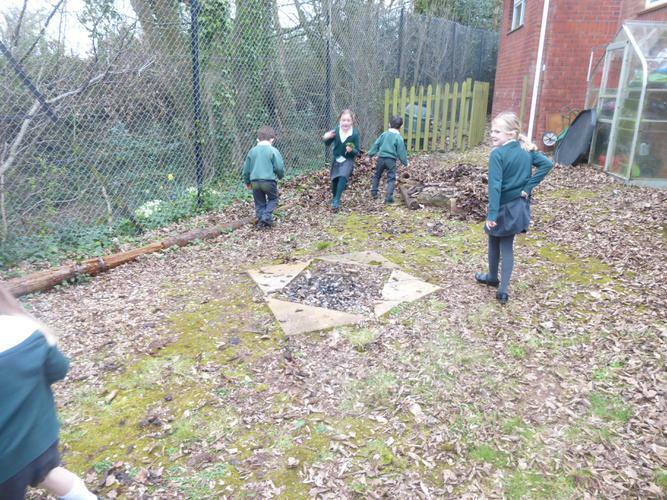 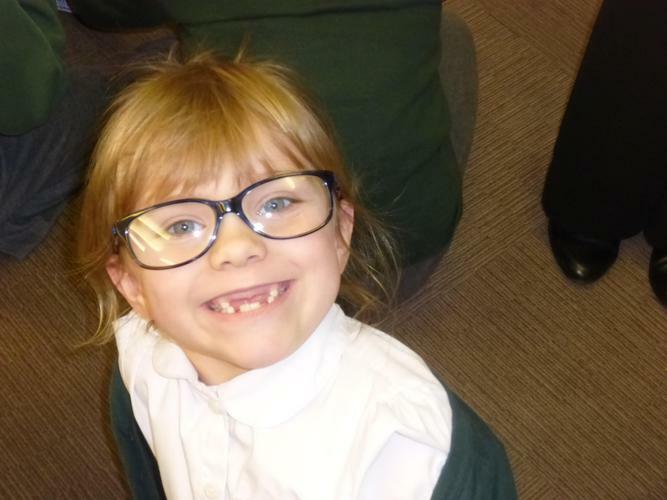 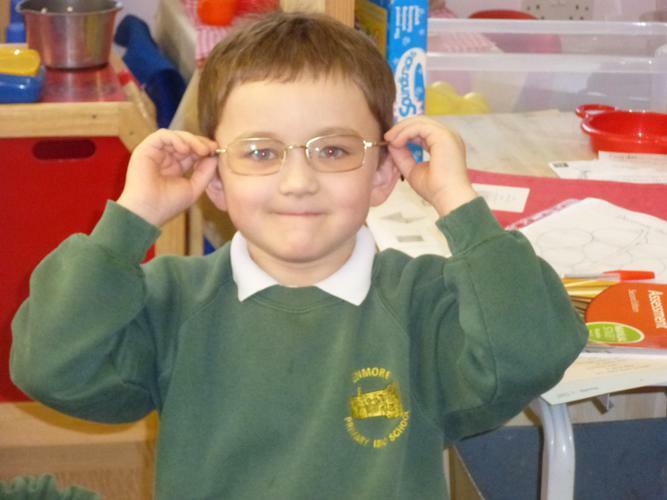 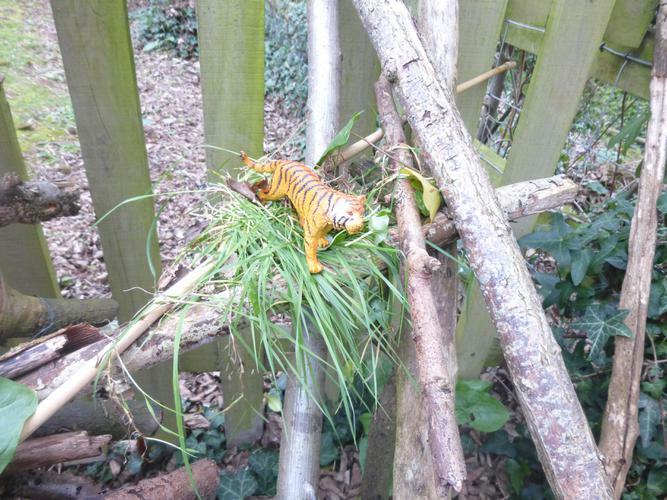 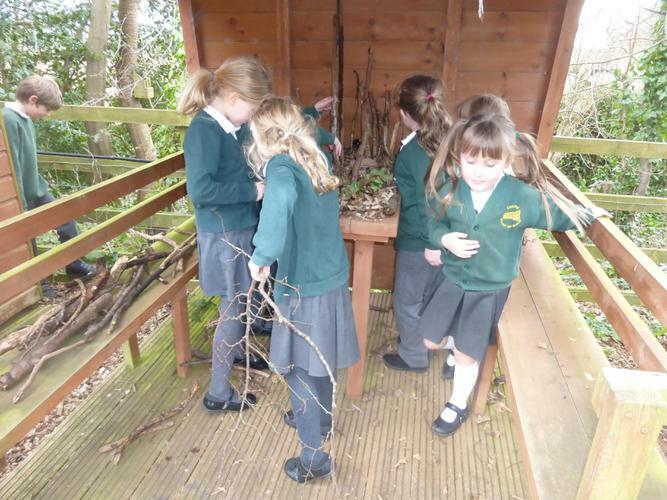 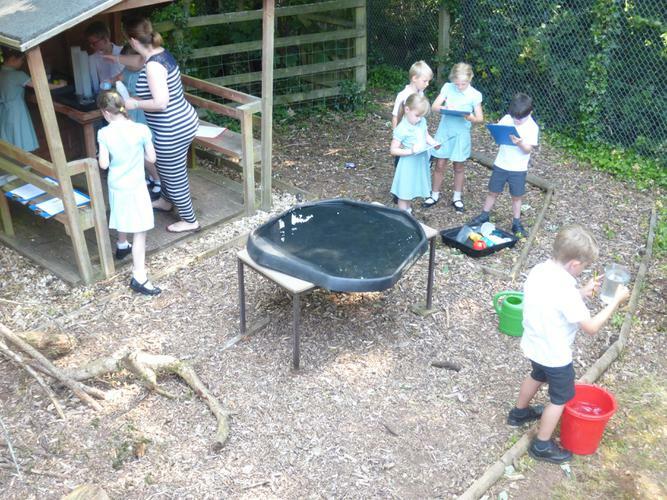 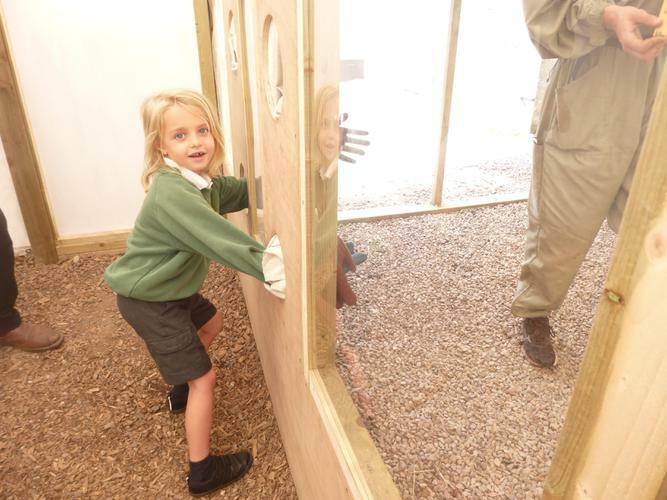 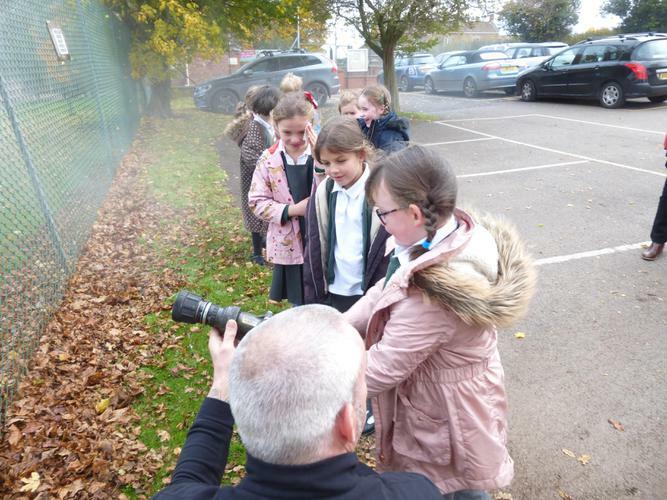 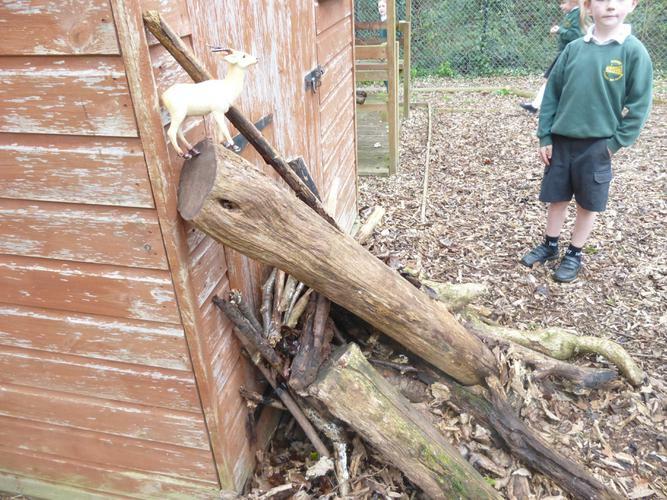 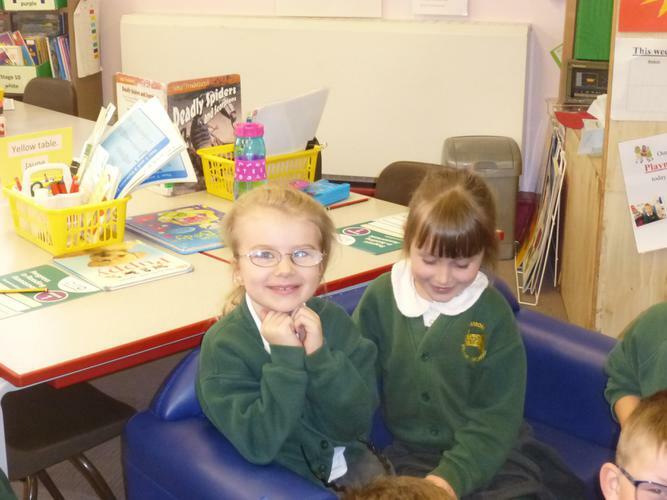 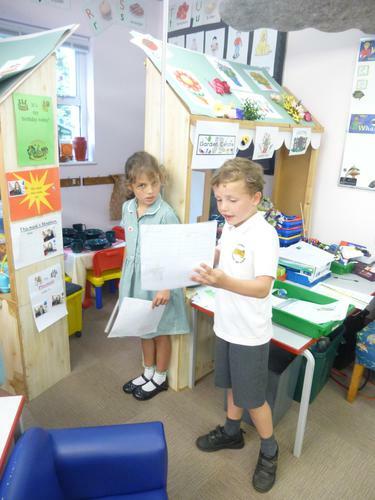 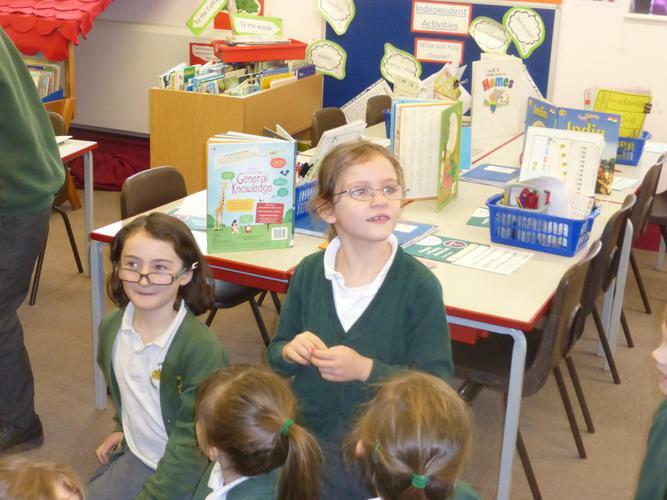 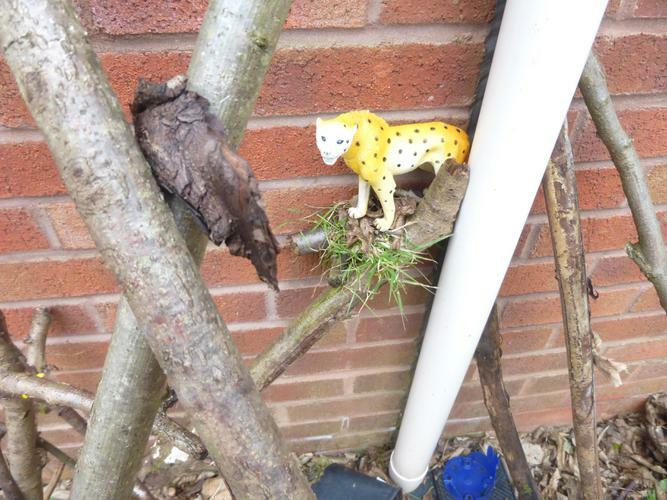 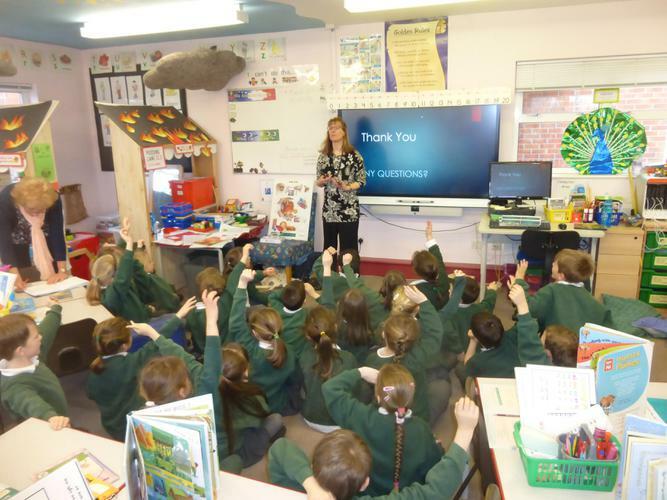 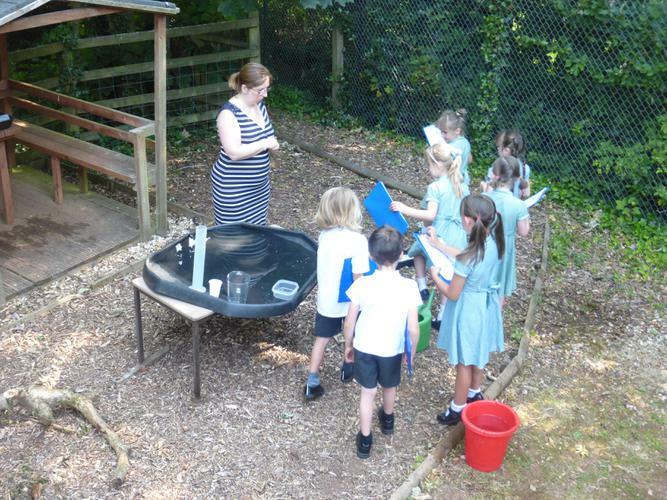 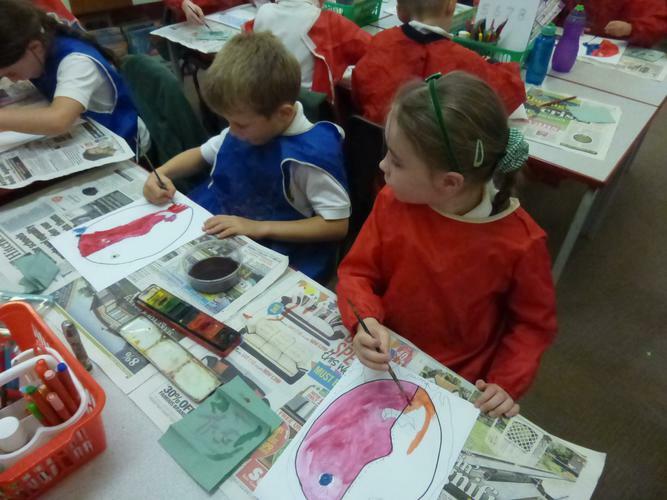 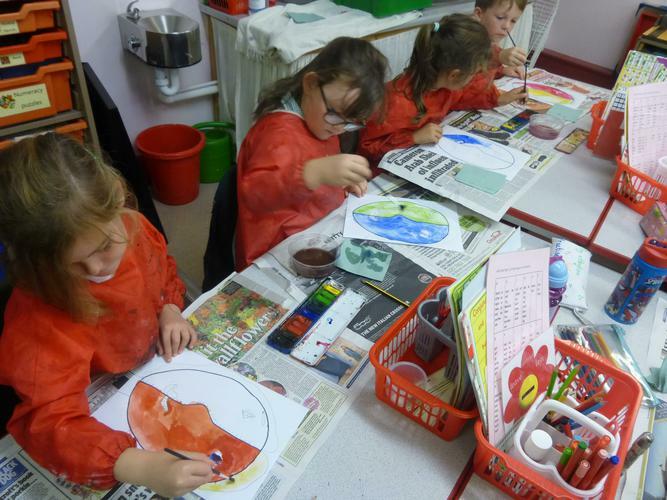 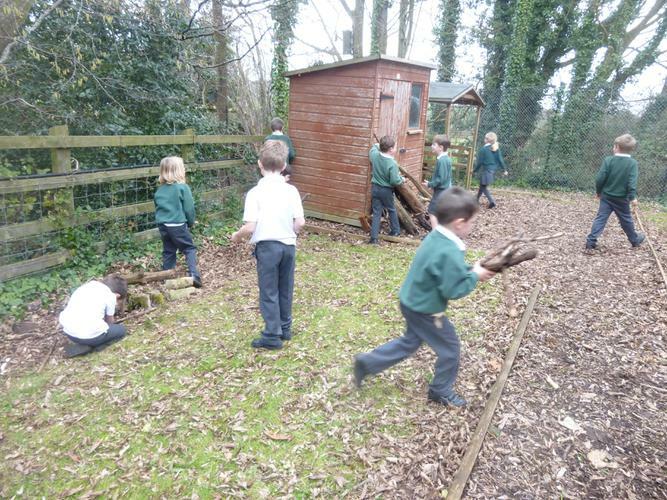 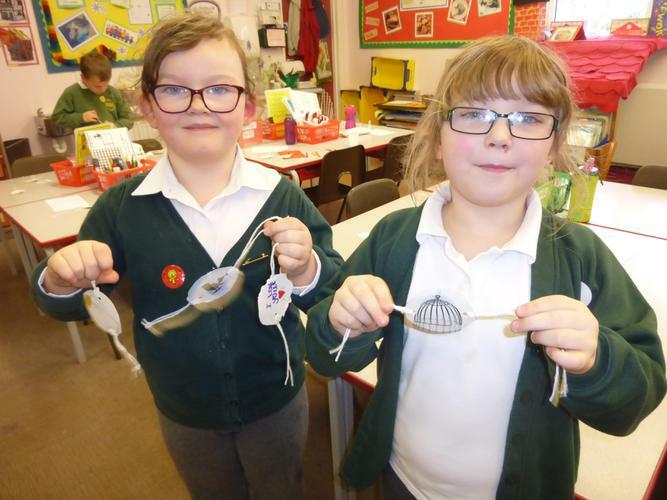 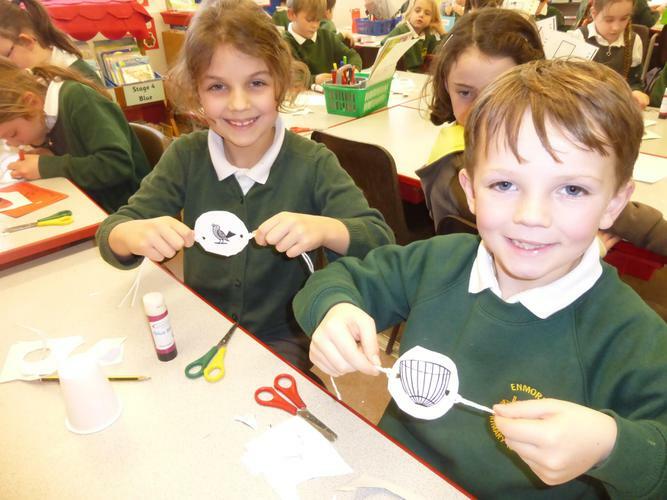 We are learning all about animals in our environment, life cycles and habitats. 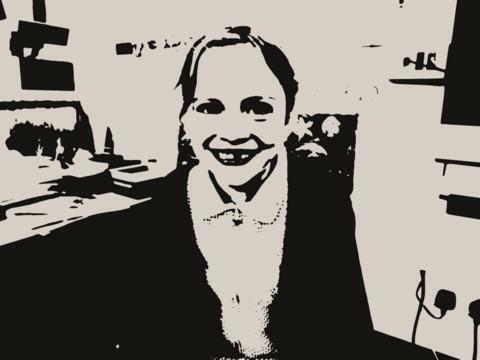 Money in the working World. 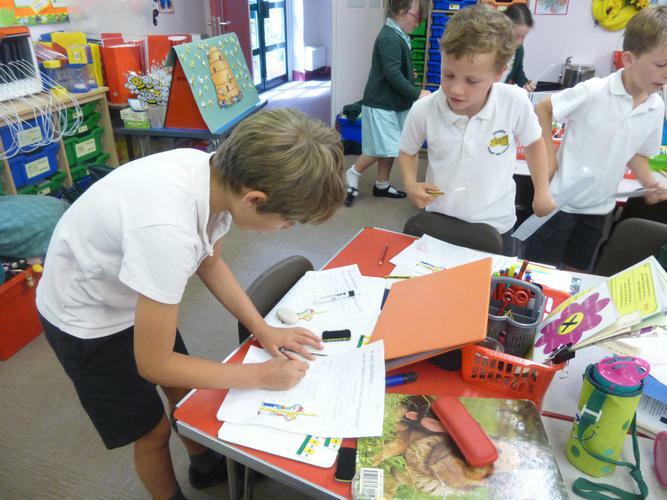 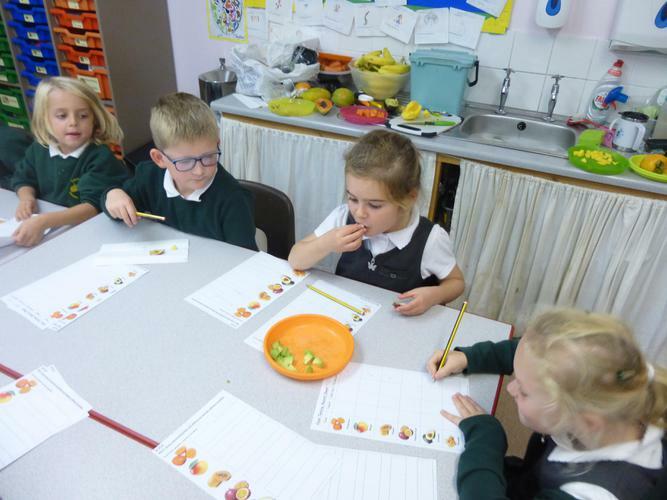 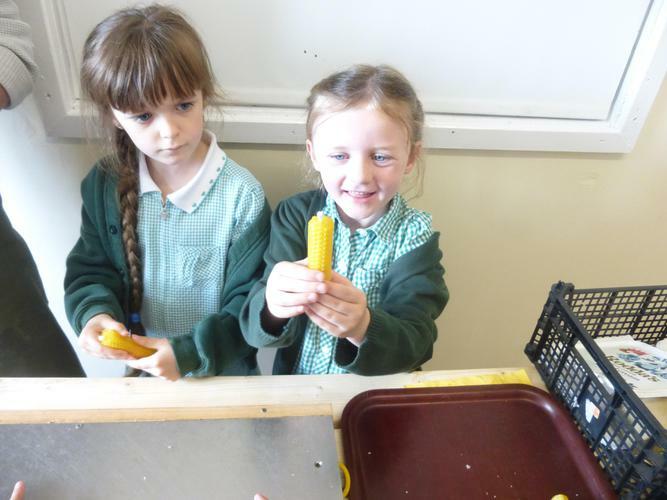 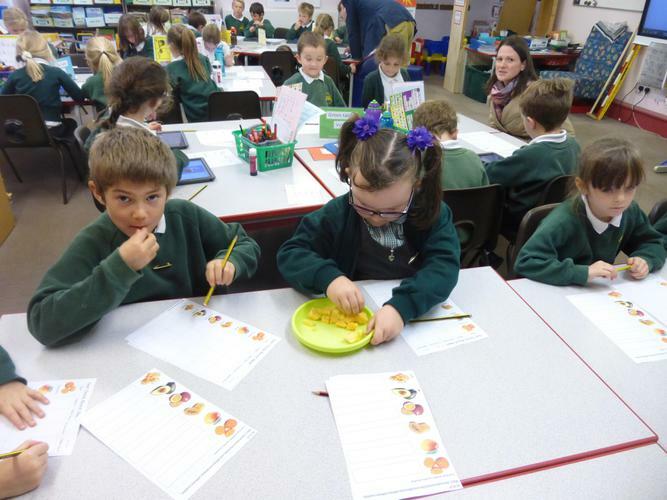 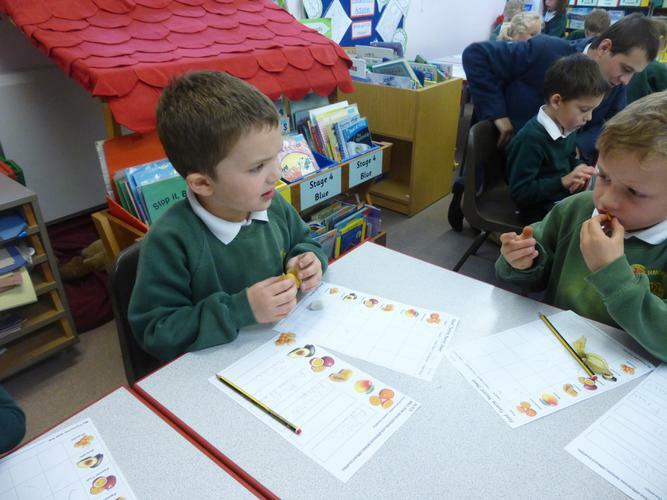 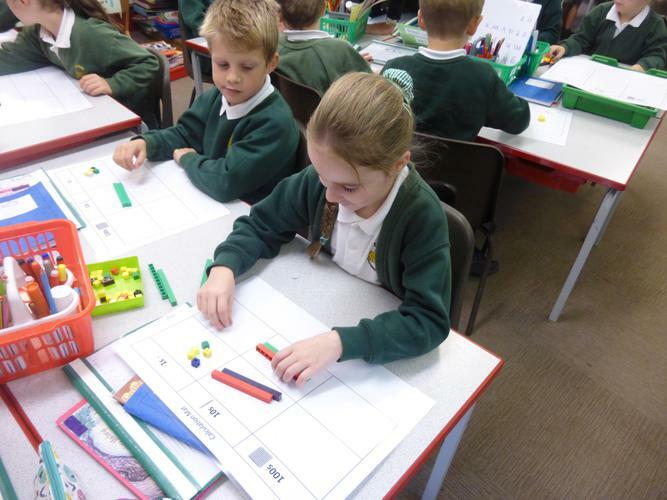 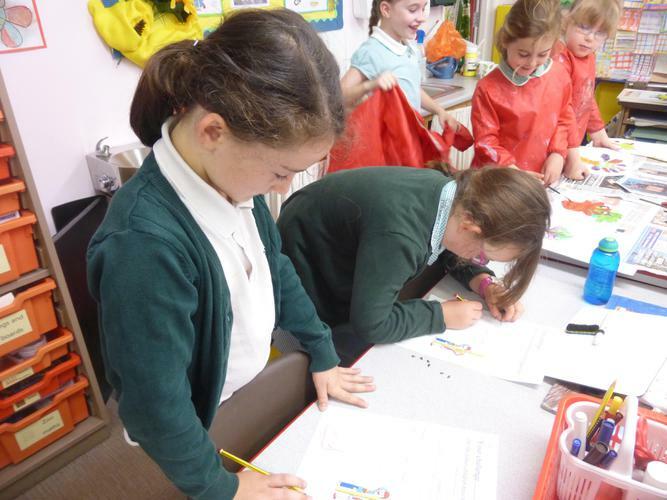 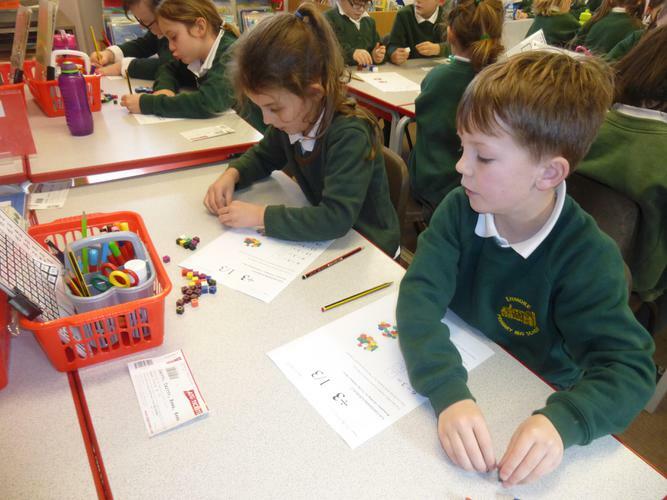 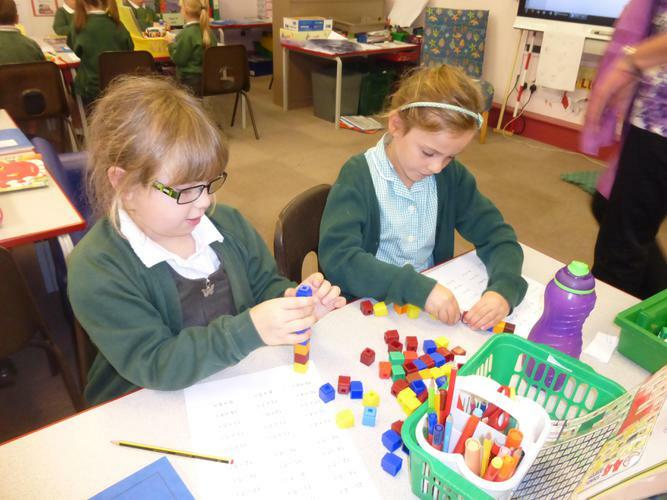 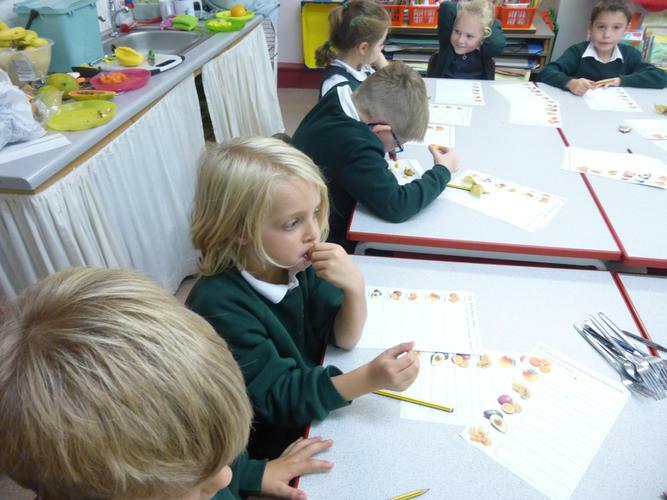 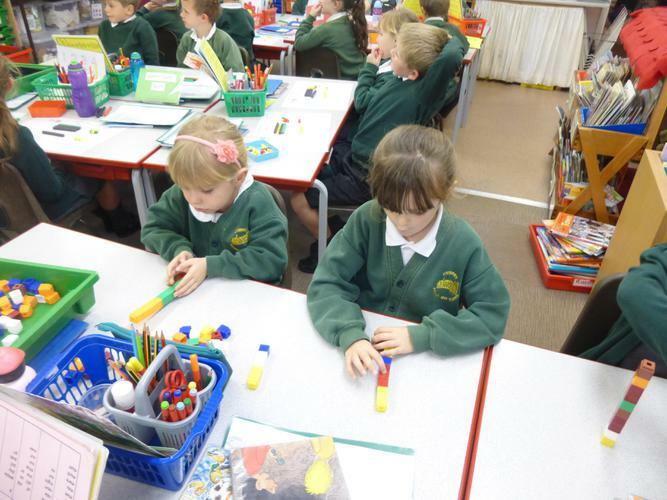 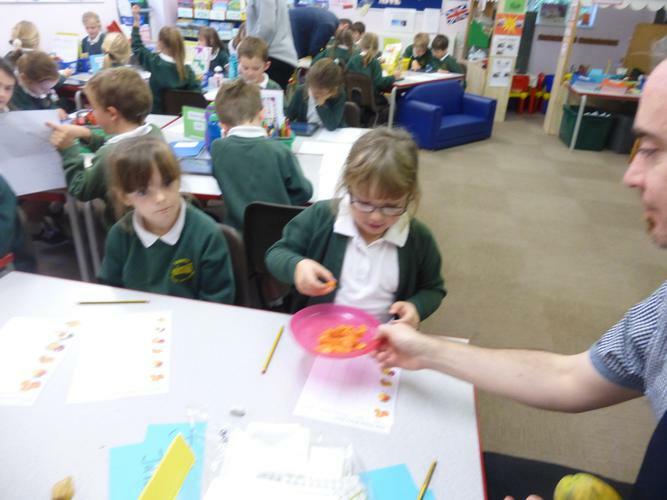 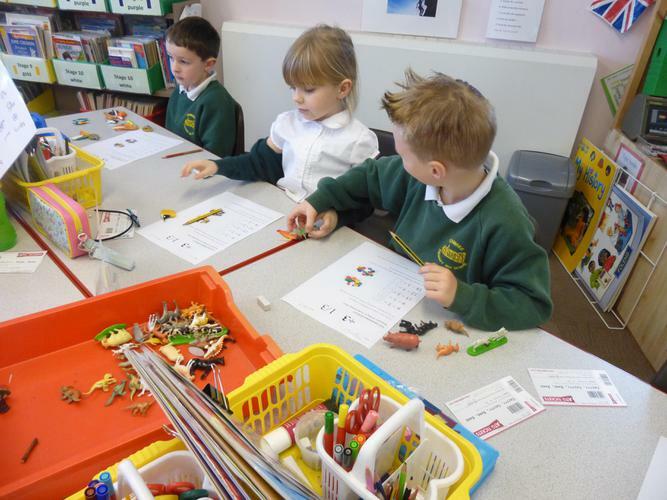 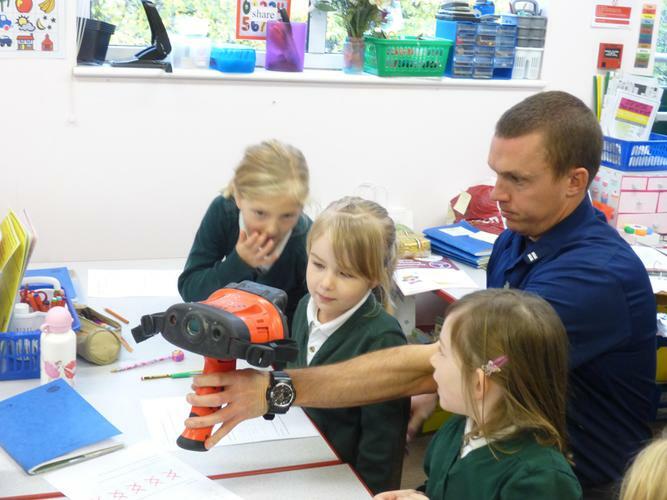 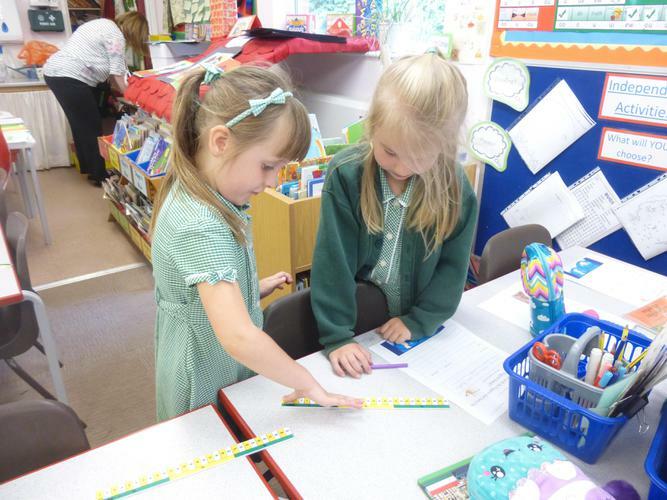 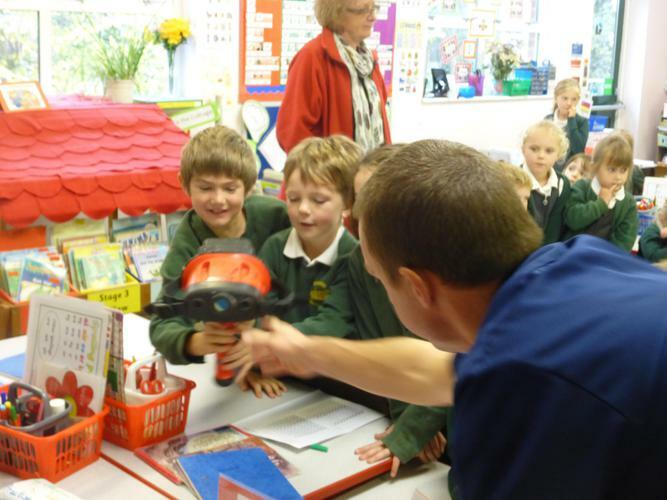 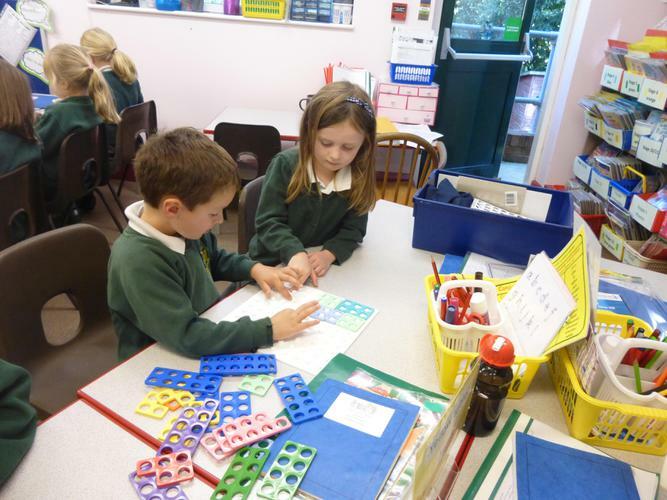 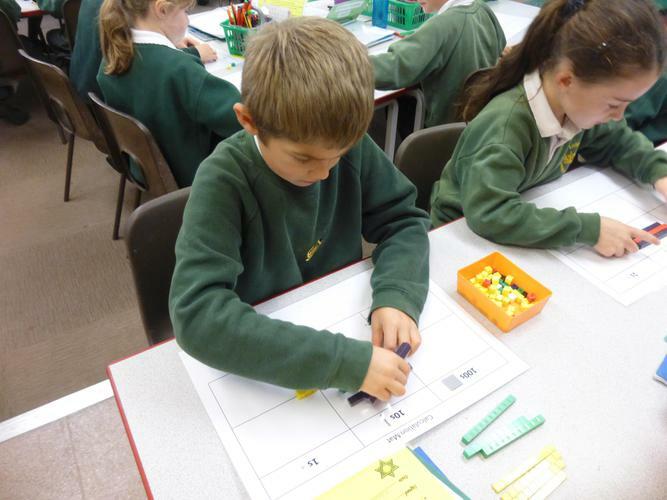 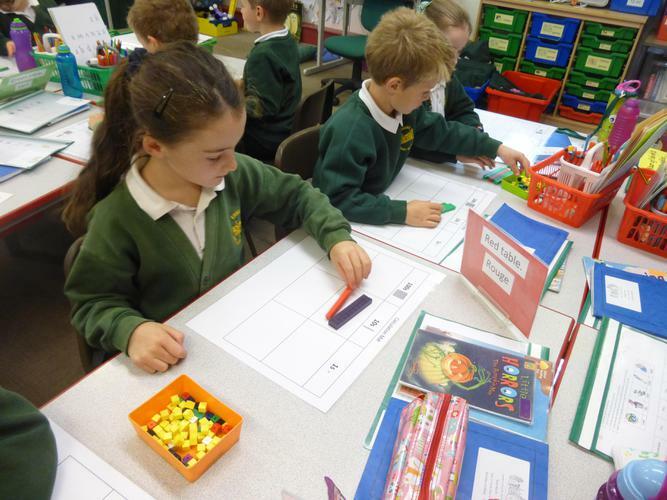 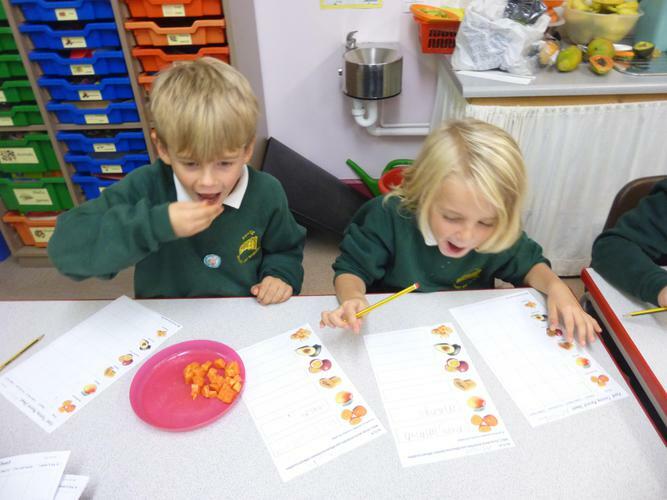 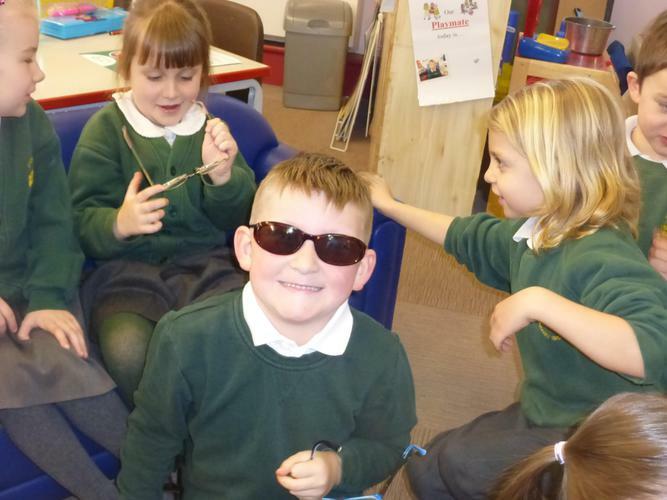 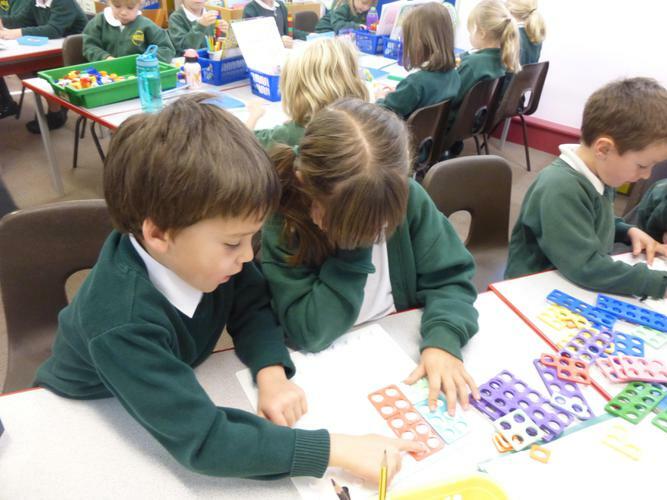 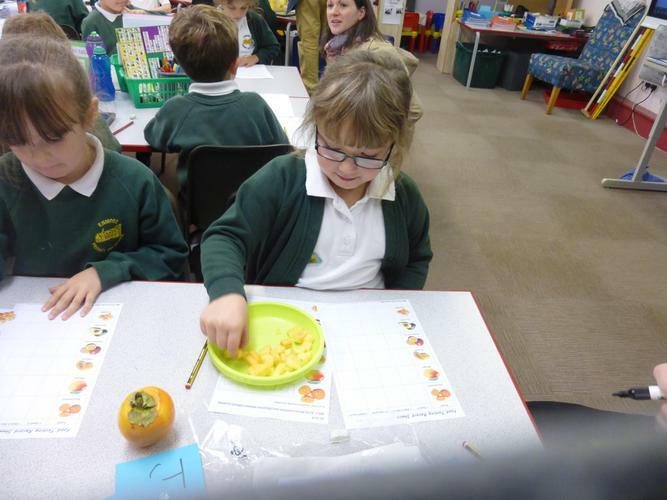 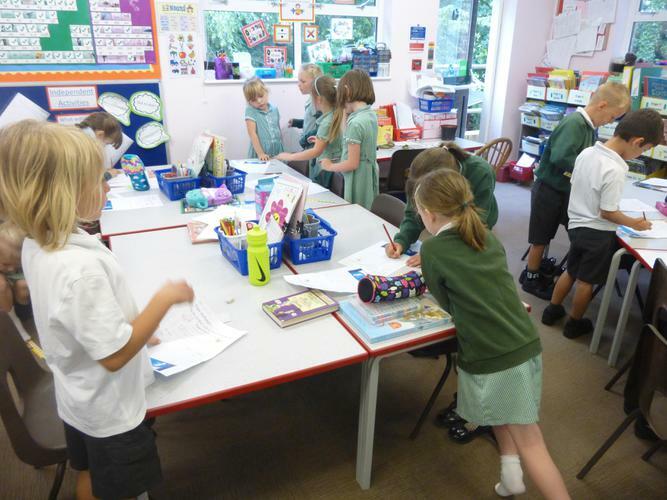 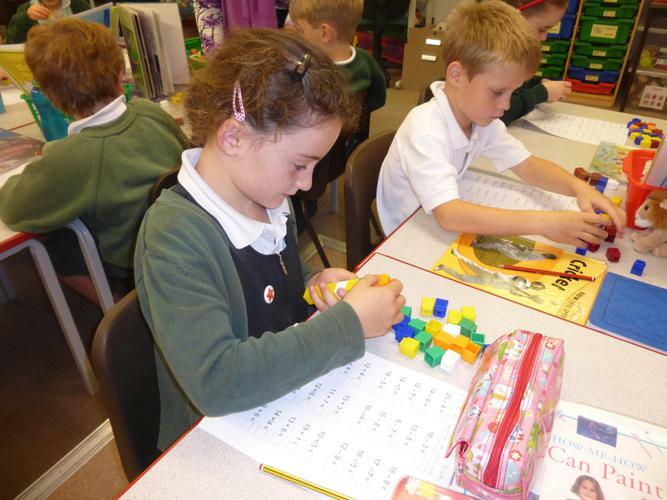 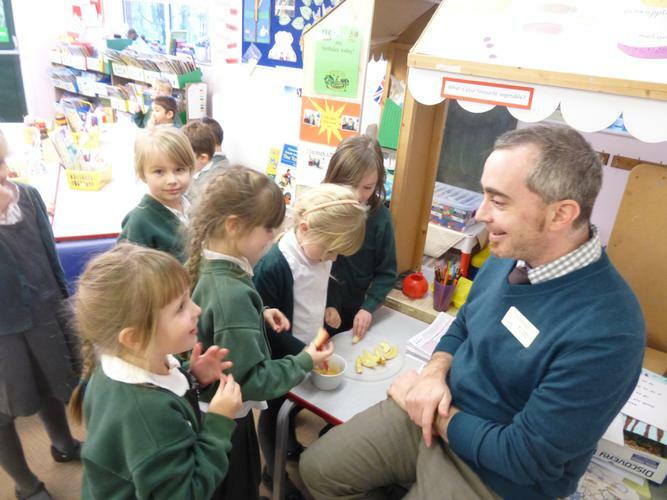 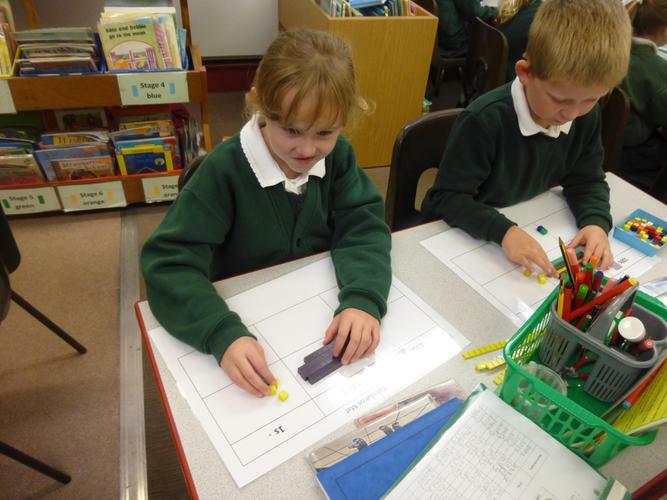 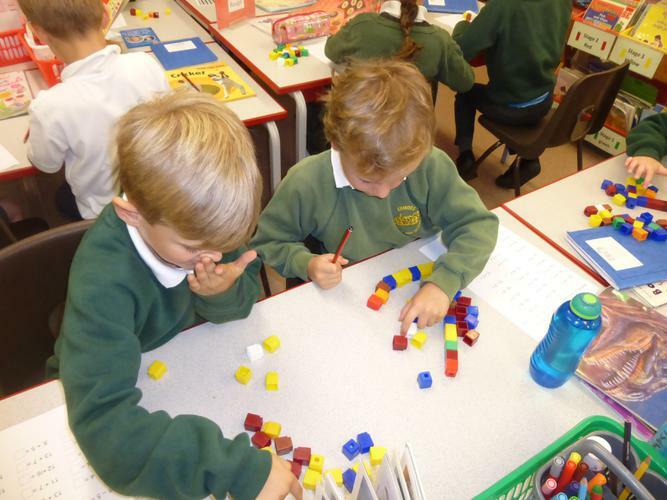 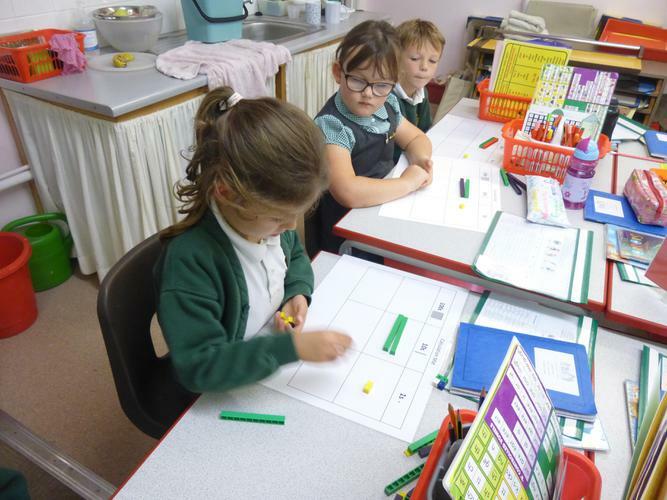 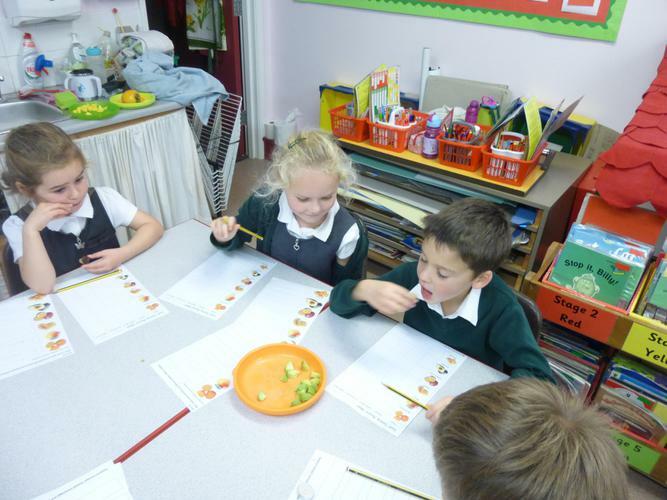 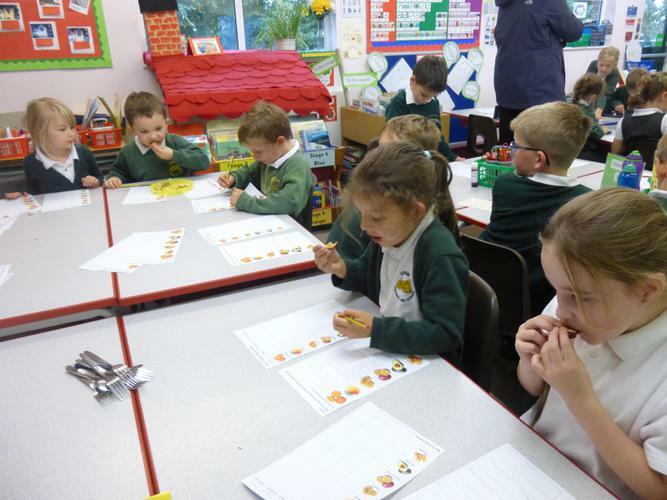 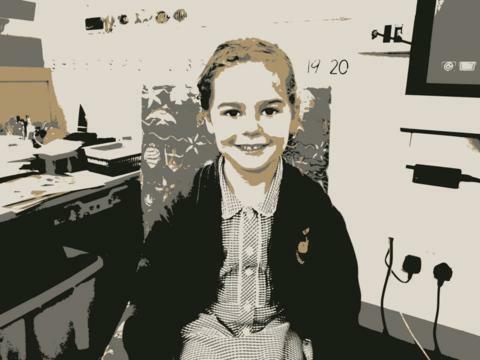 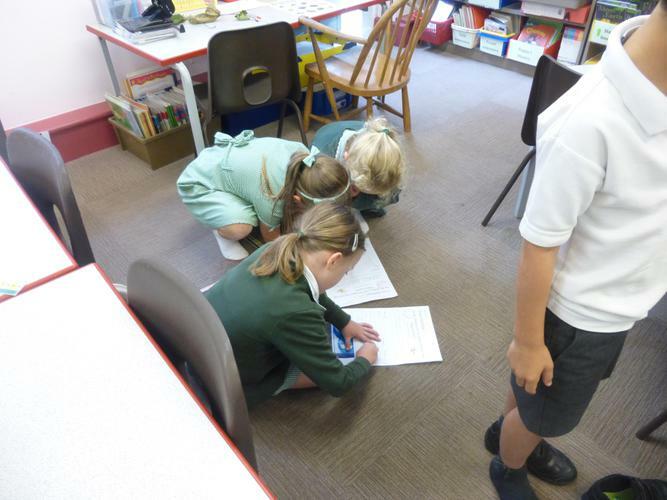 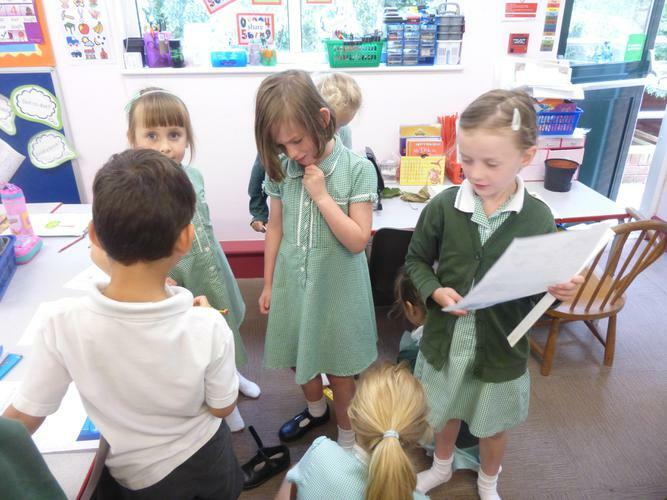 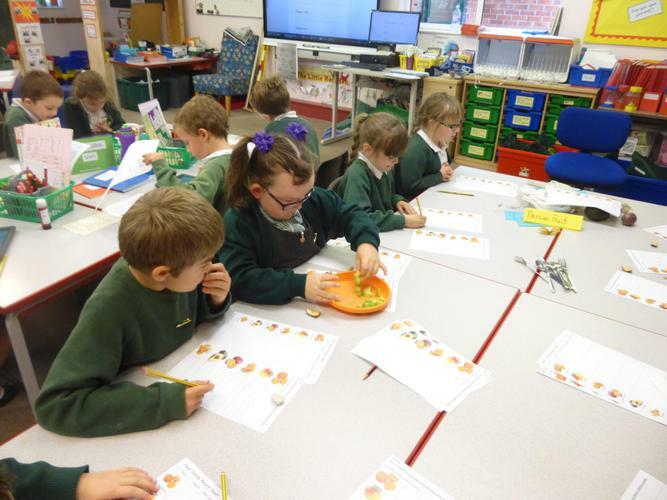 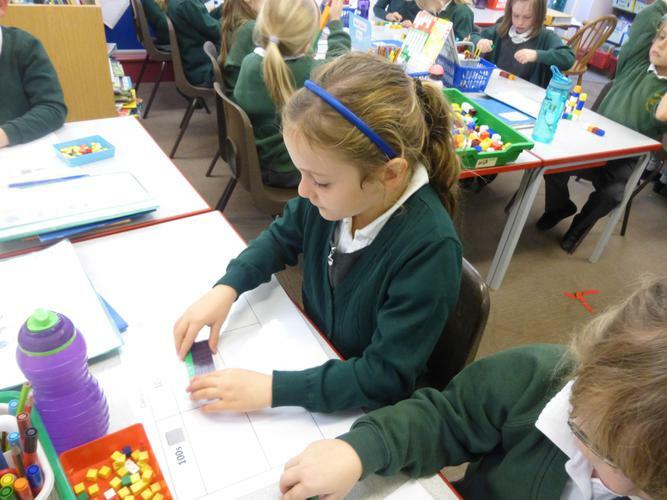 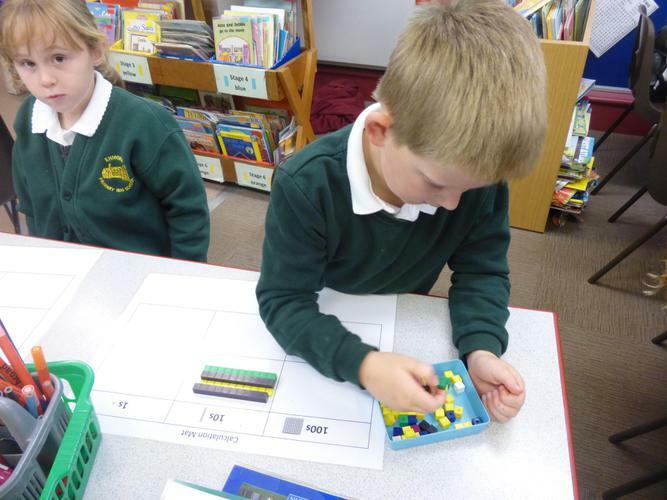 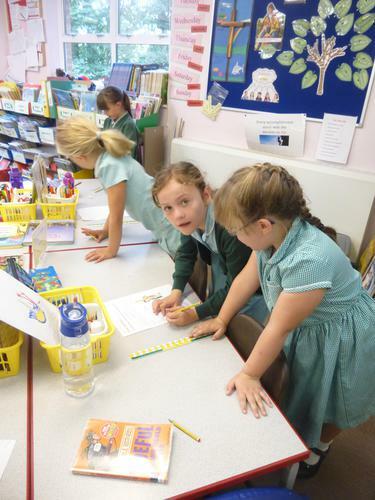 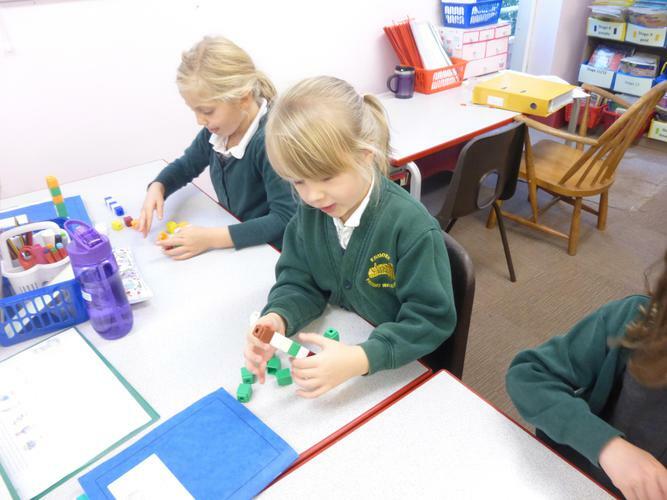 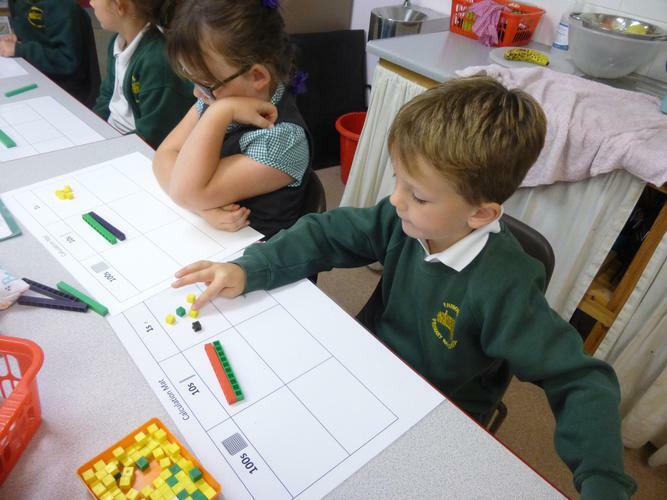 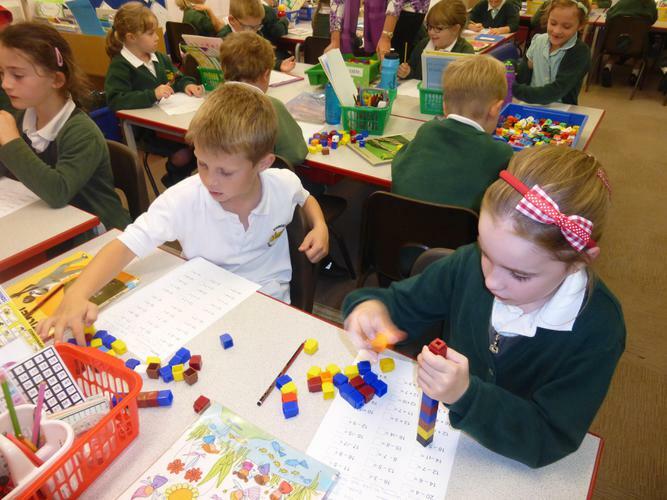 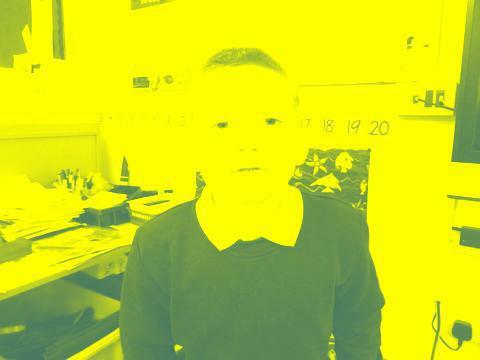 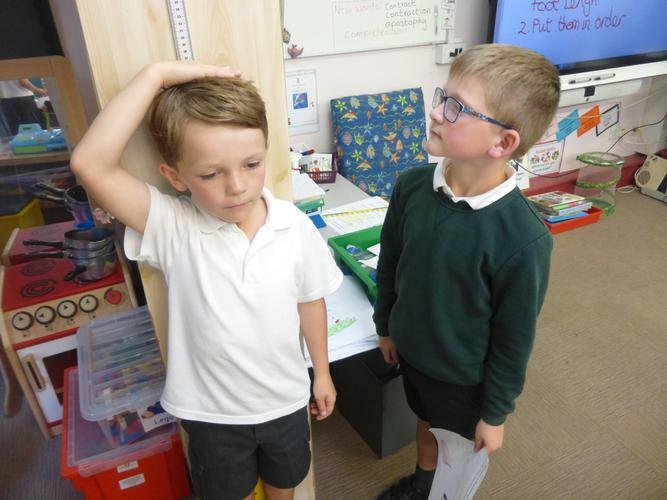 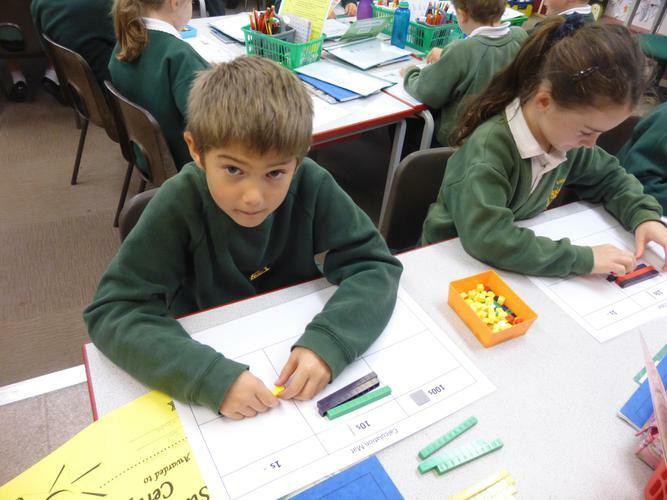 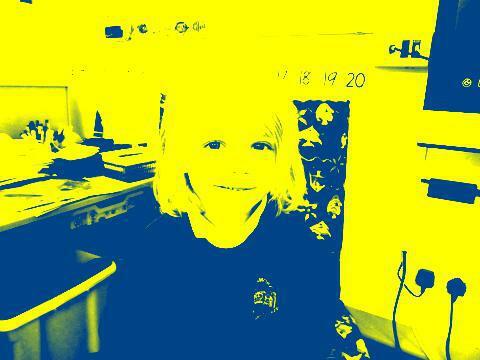 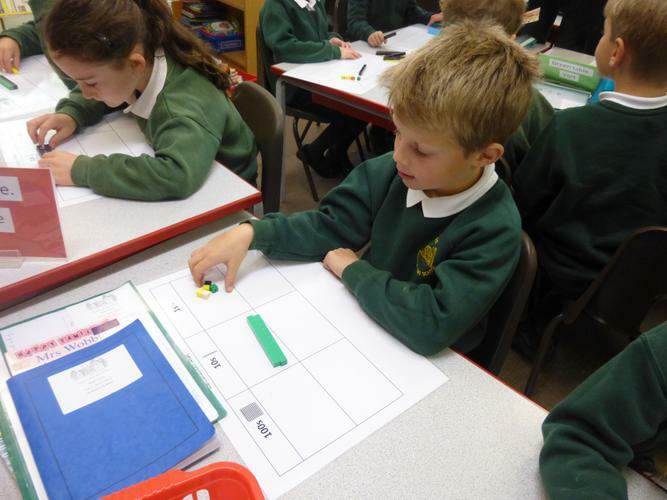 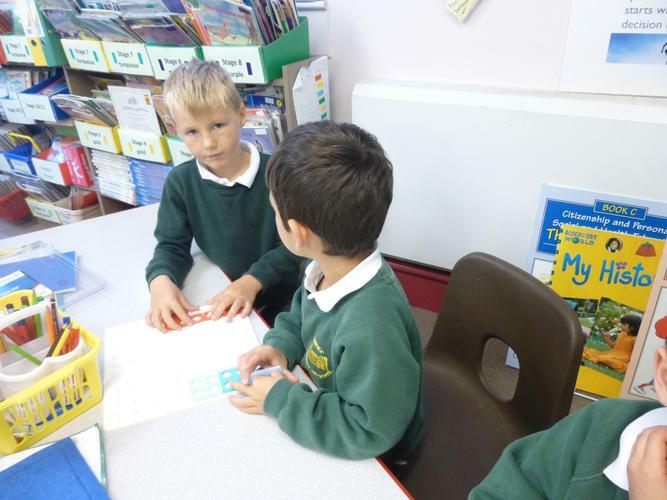 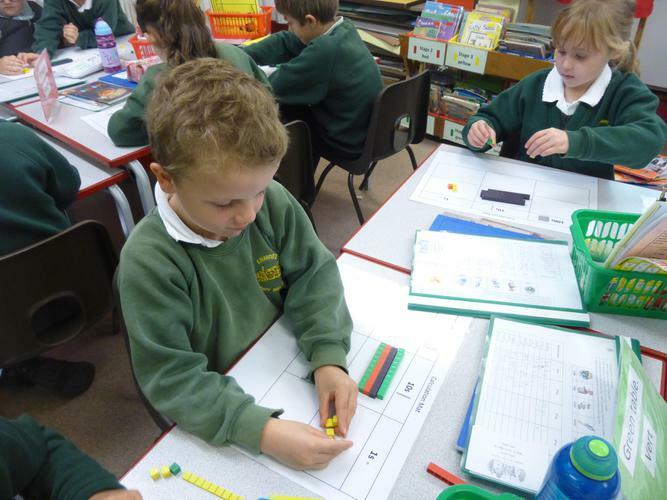 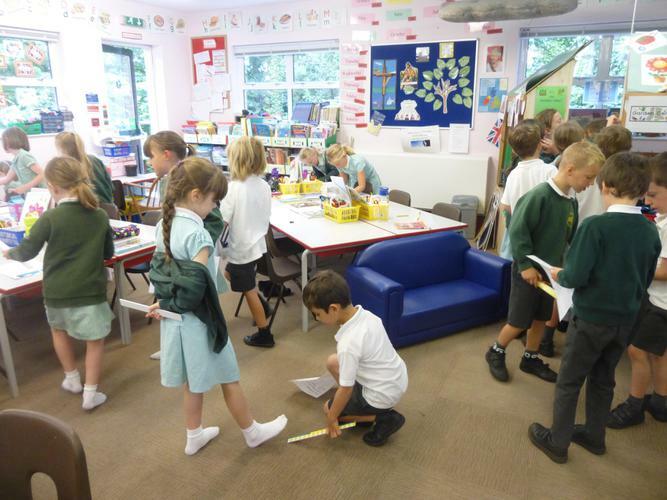 We have been finding out about the different jobs people do to earn money. 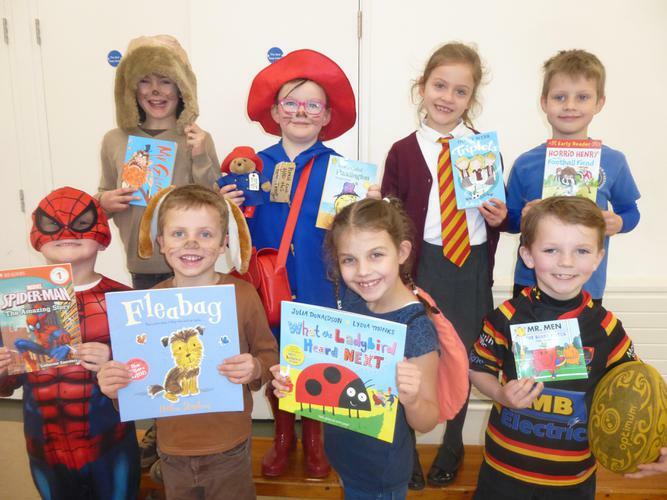 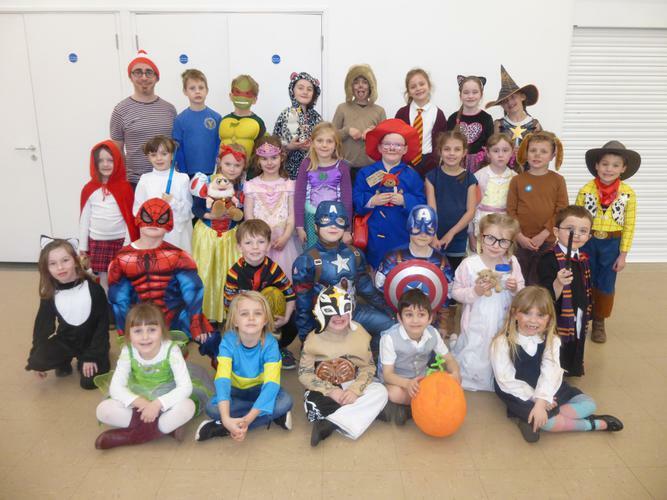 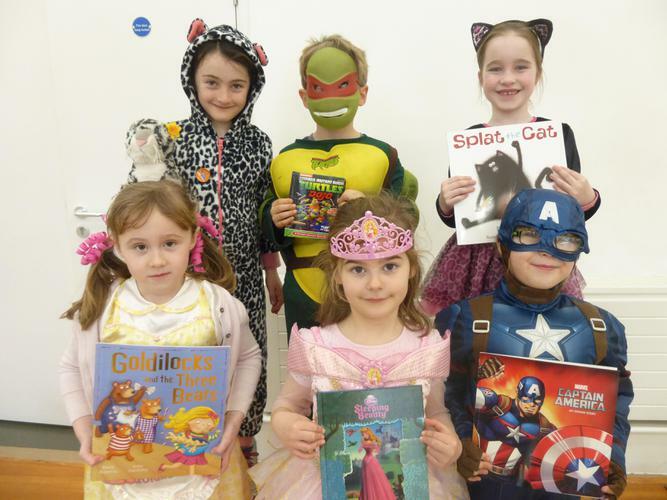 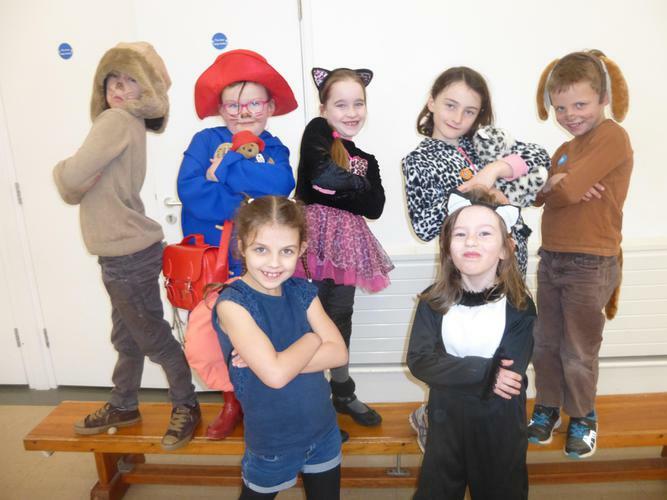 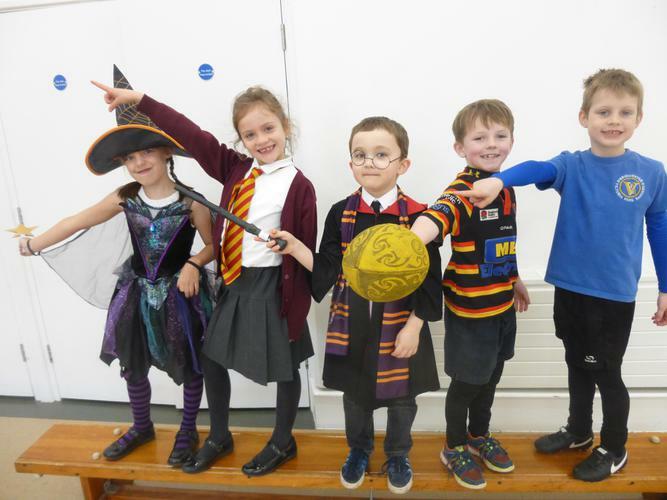 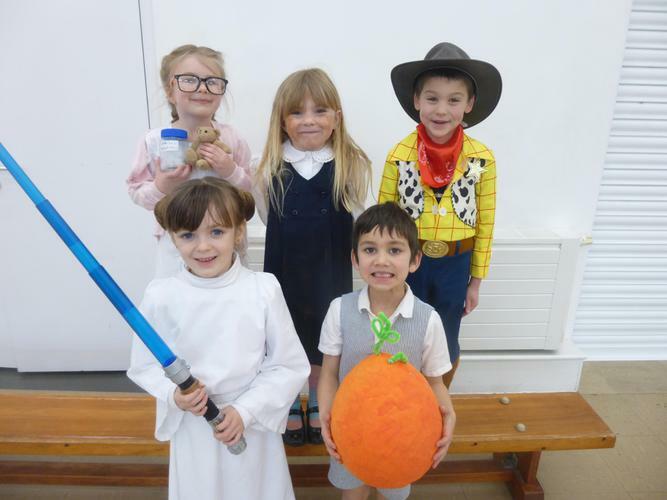 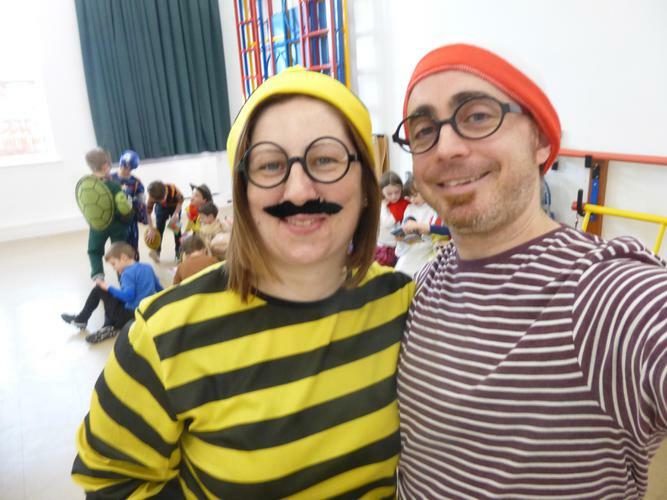 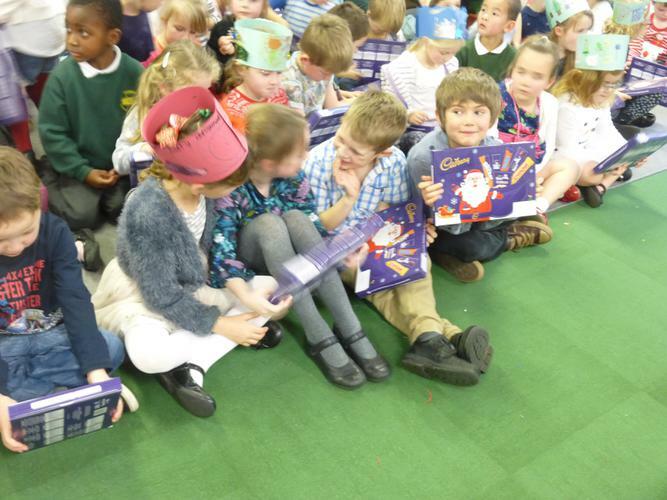 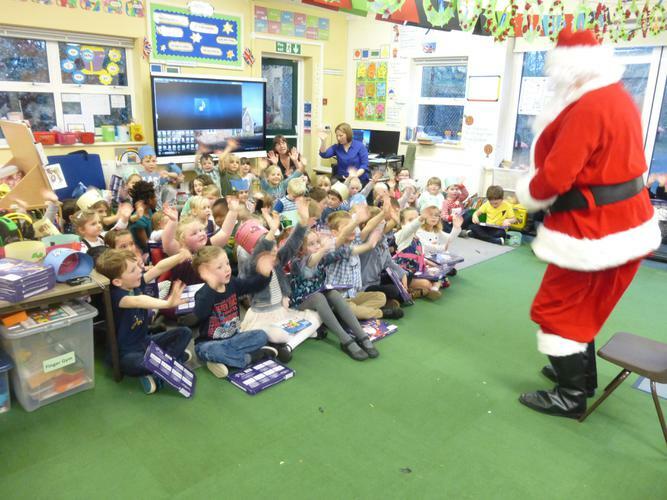 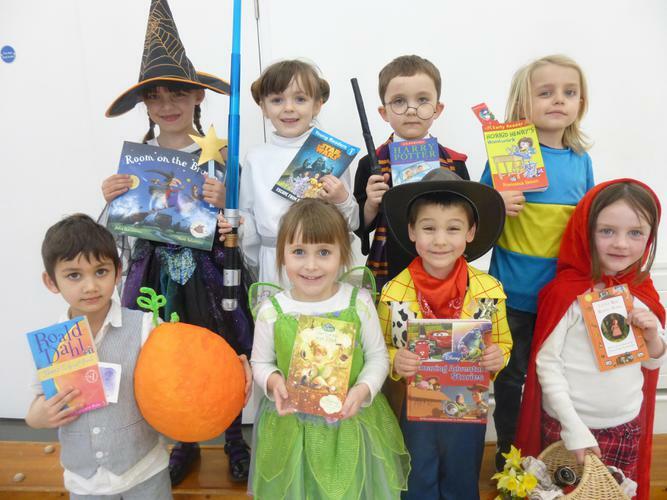 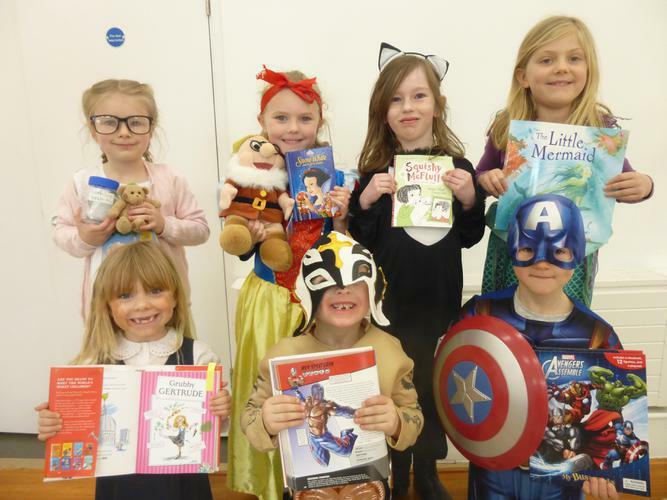 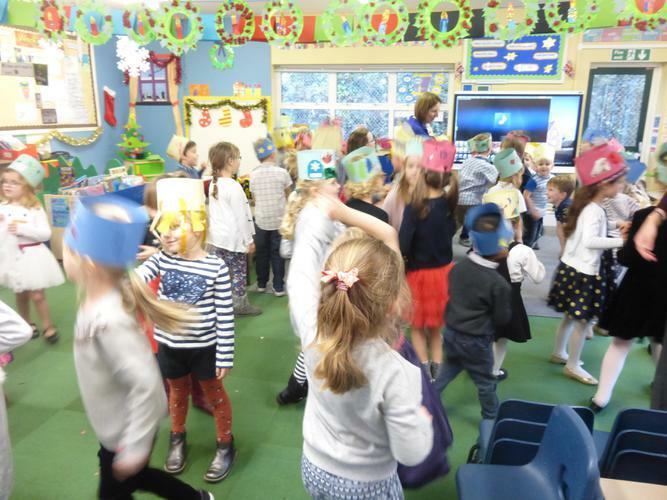 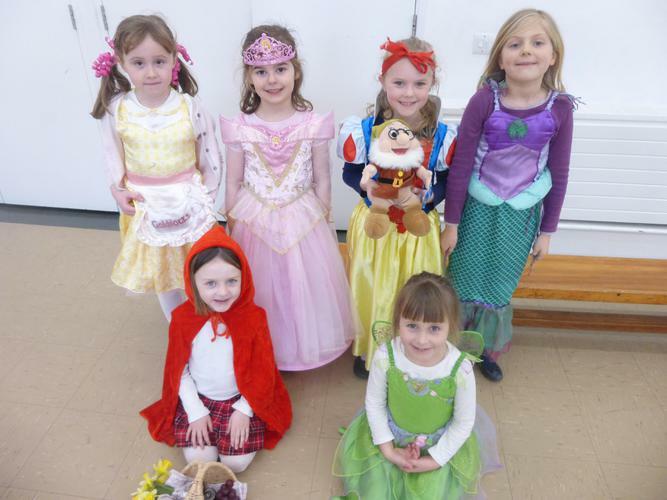 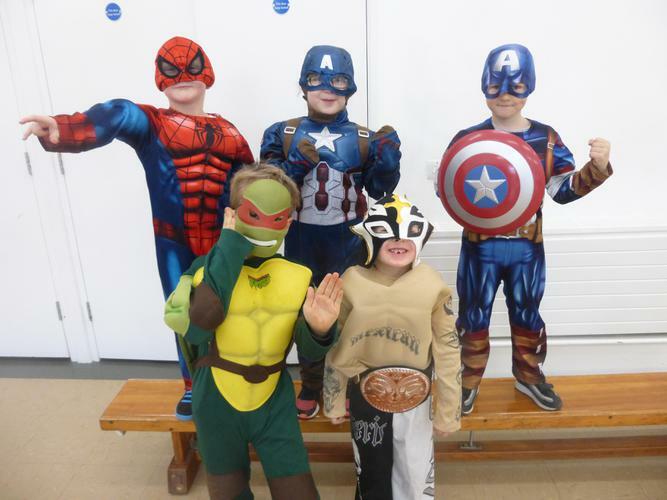 We had lots of fun today coming to school dressed as some of our favourite book characters. 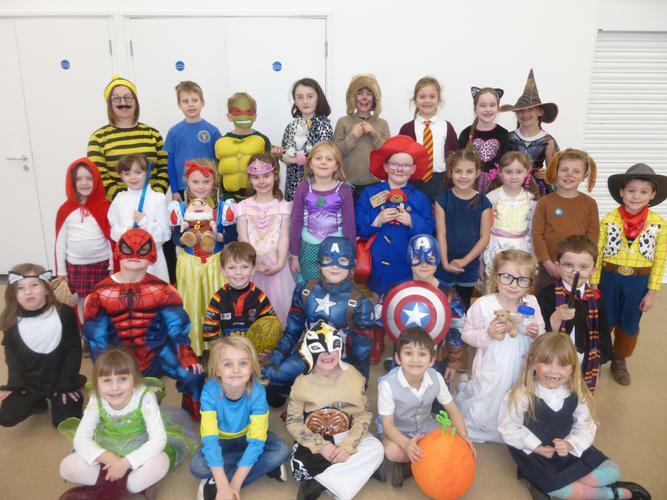 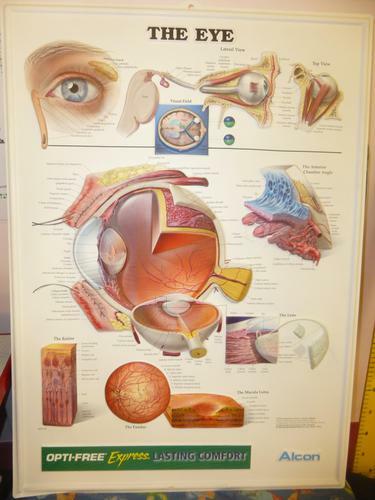 Are there any that you recognise? 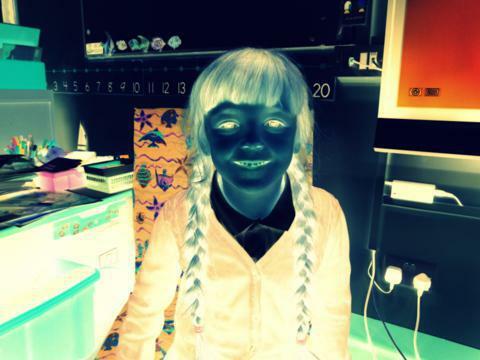 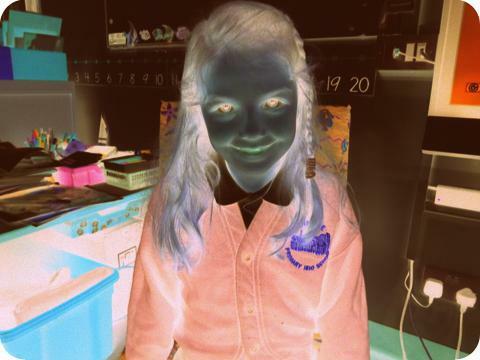 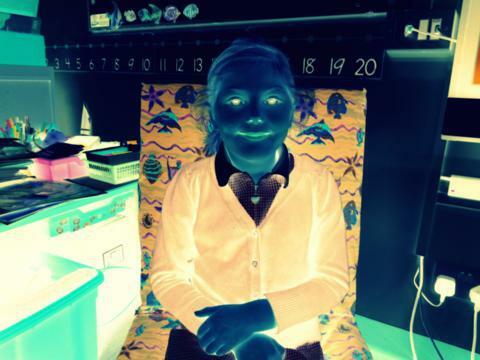 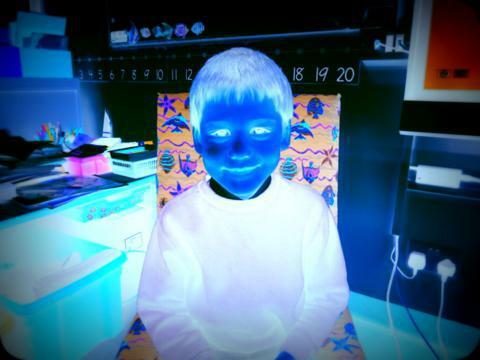 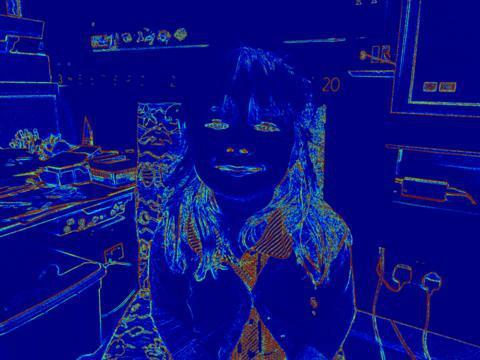 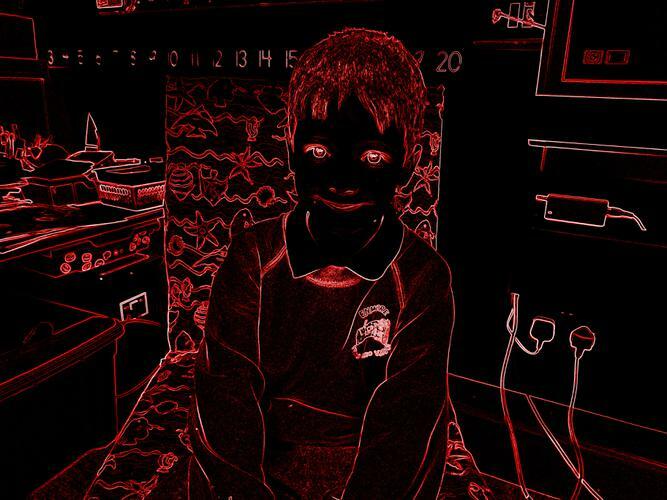 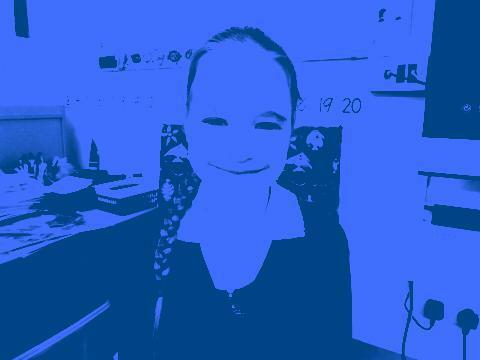 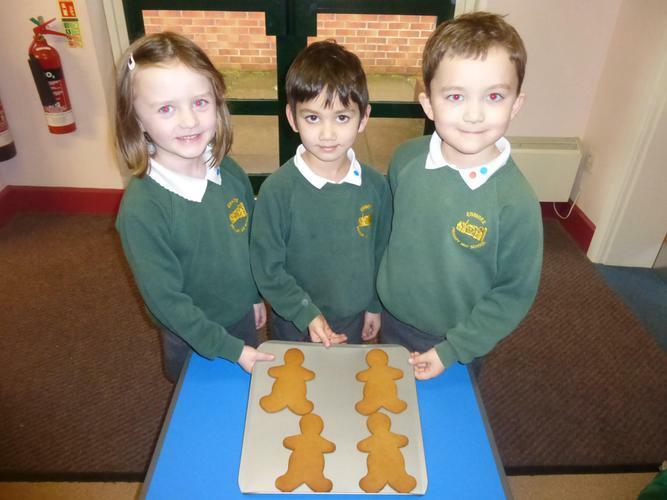 You can't catch me I'm the gingerbread man." 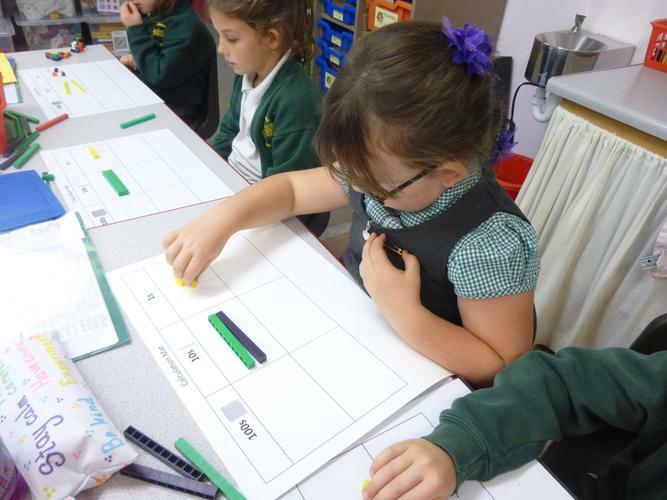 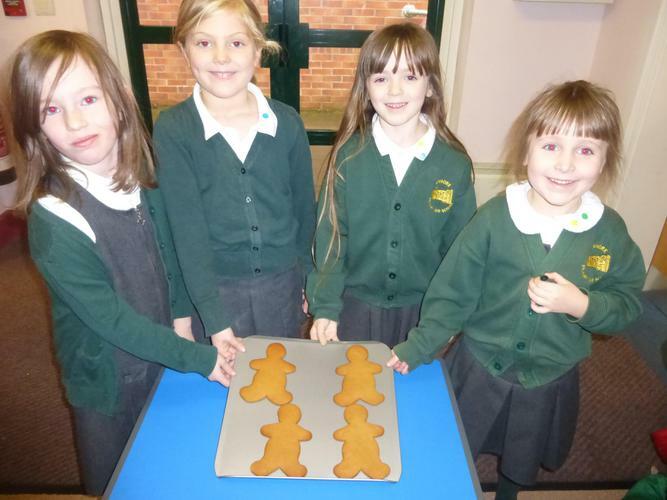 We've been using the gingerbread man story to learn about speech marks and contractions. 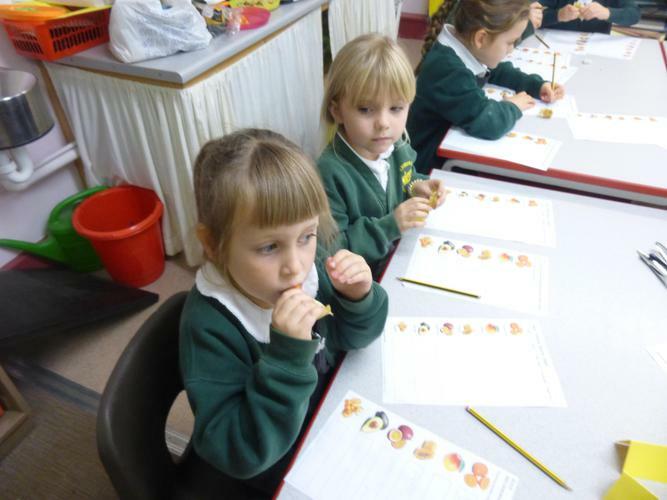 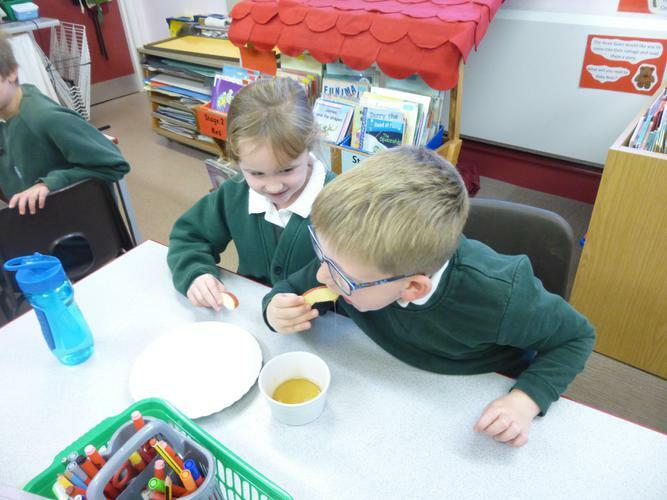 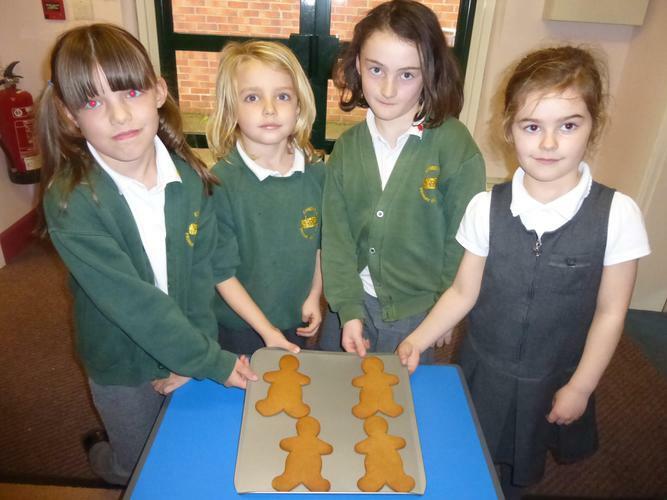 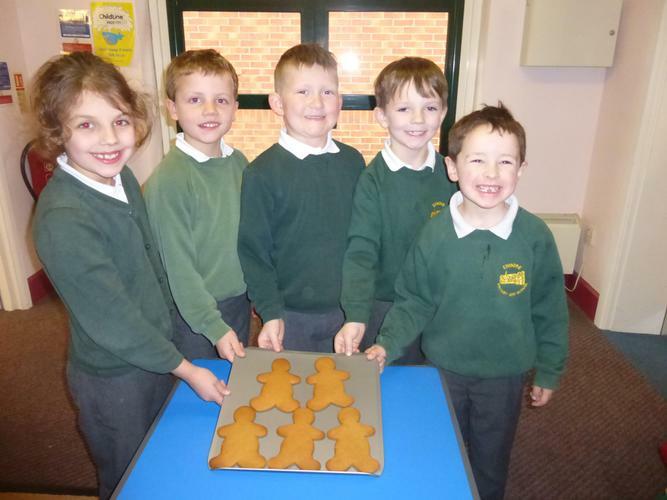 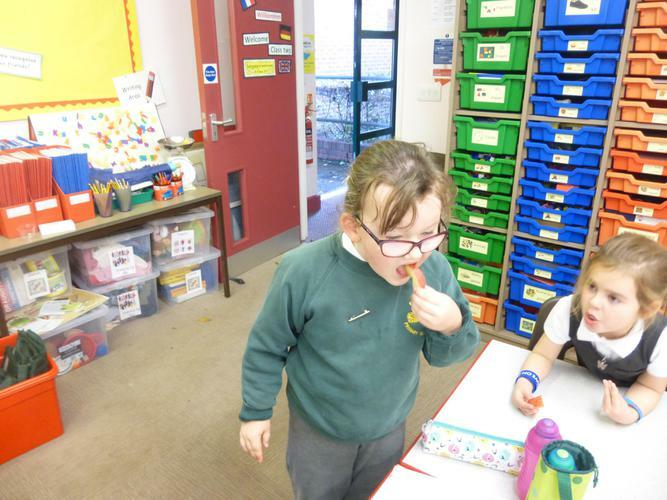 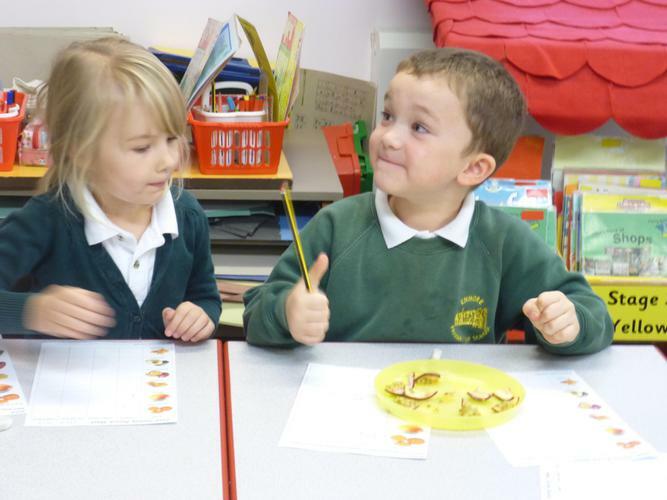 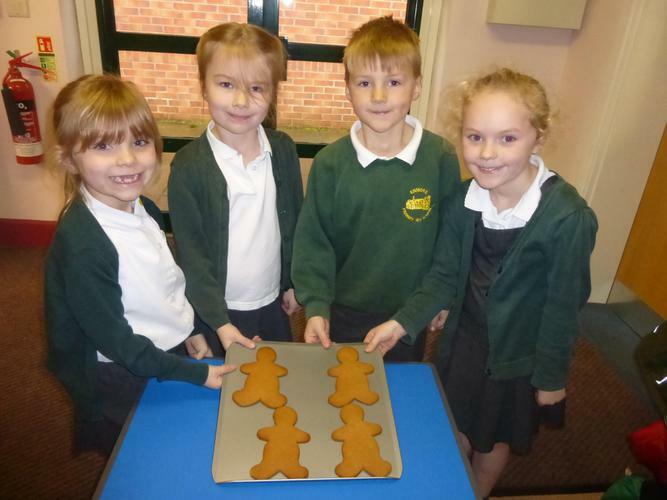 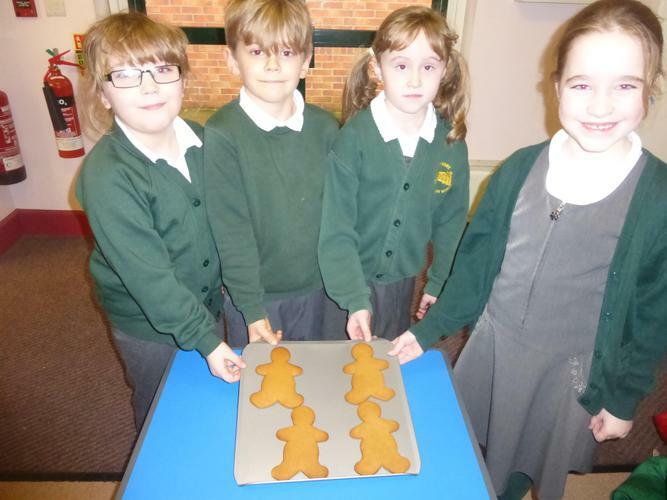 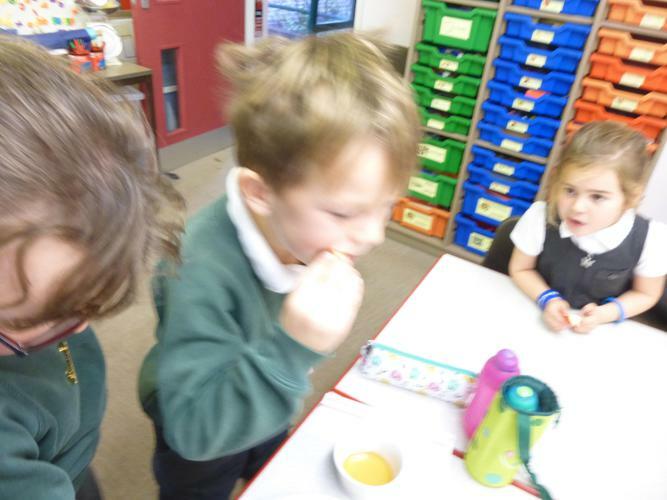 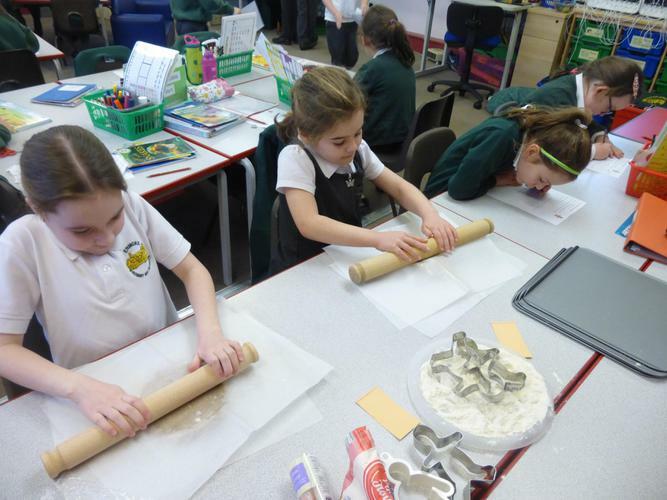 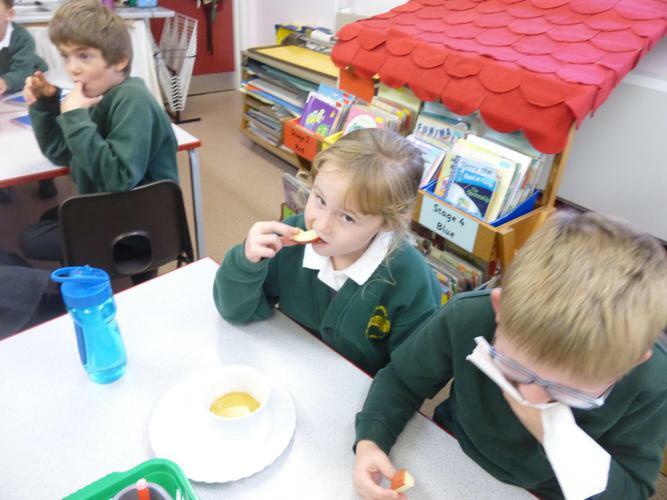 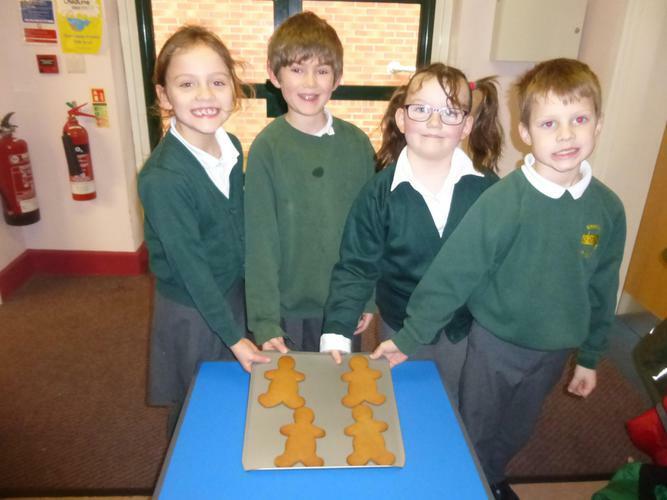 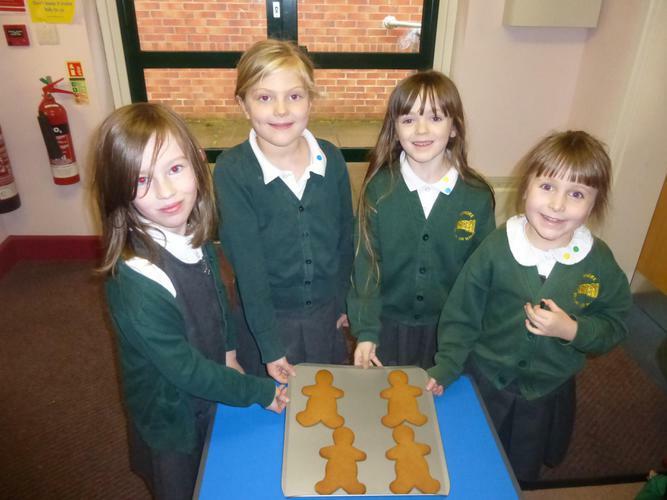 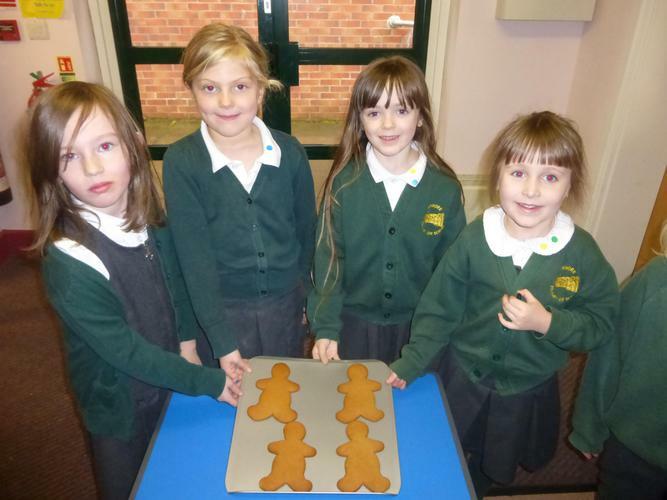 Then we made some gingerbread men - and ate therm! 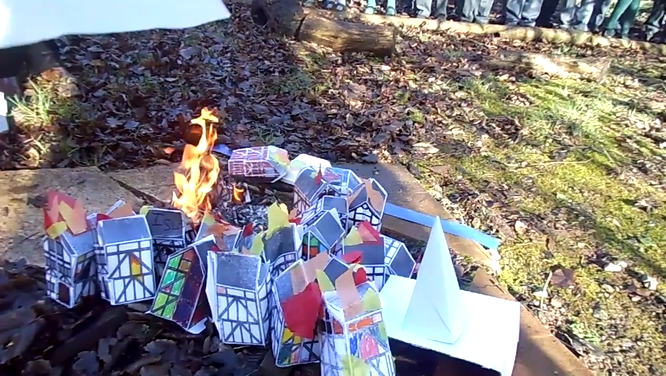 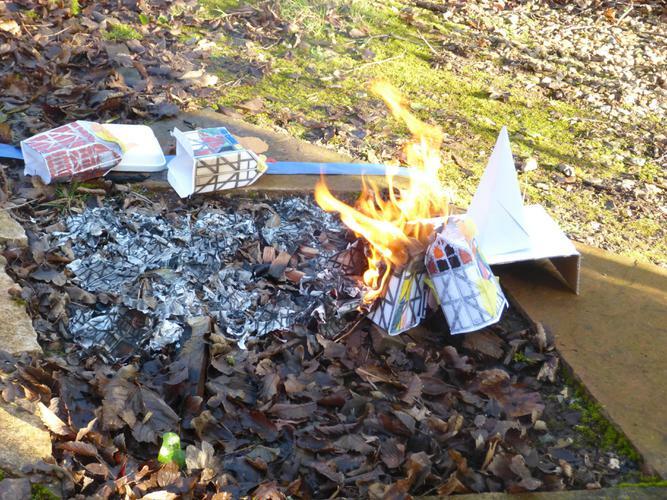 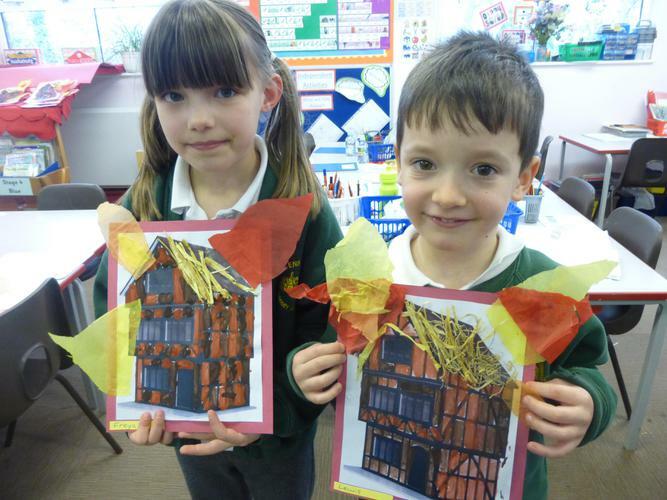 Our topic this half term has been the Great Fire of London. 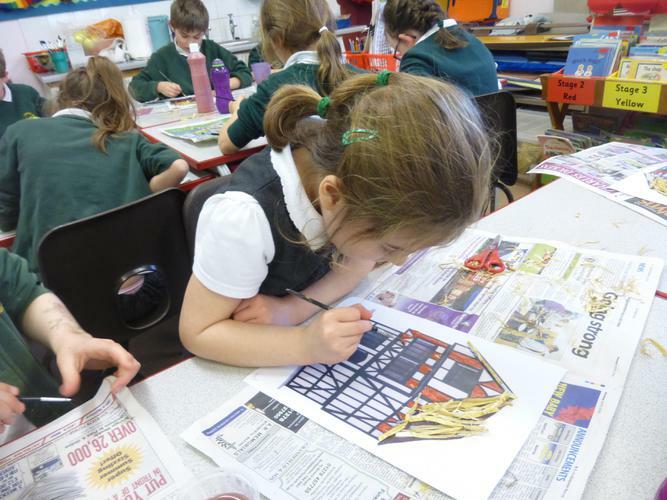 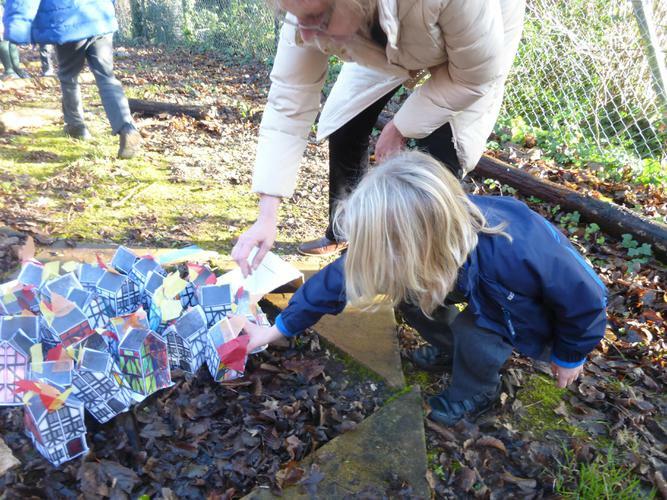 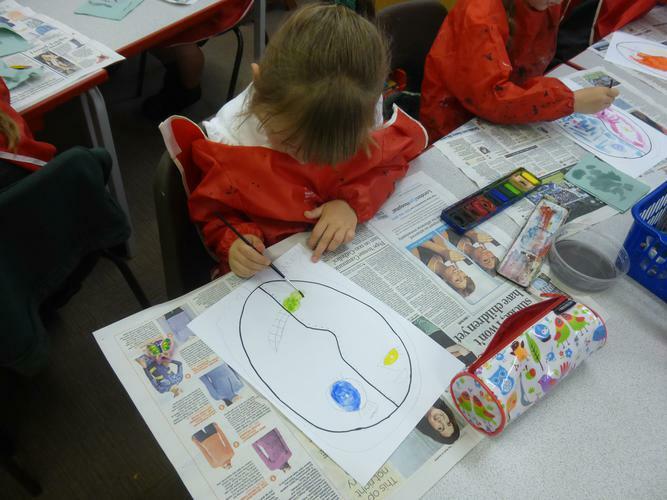 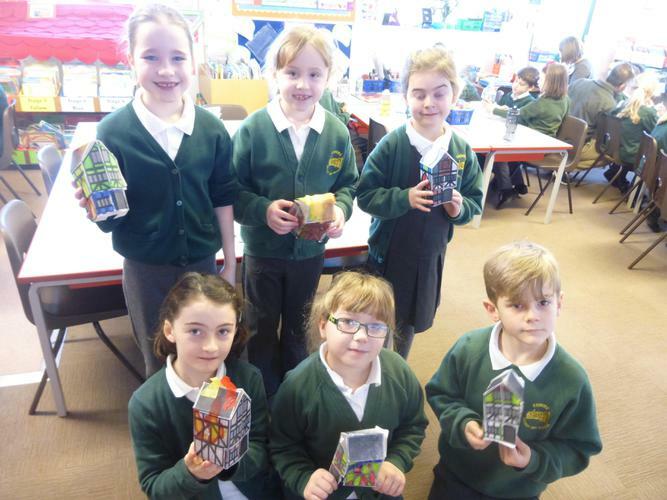 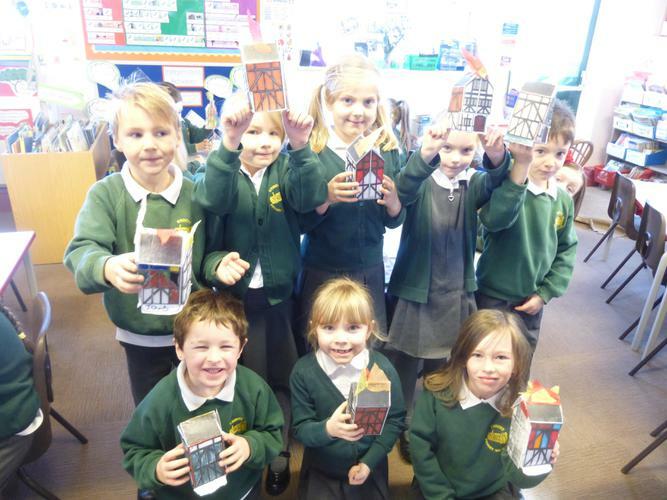 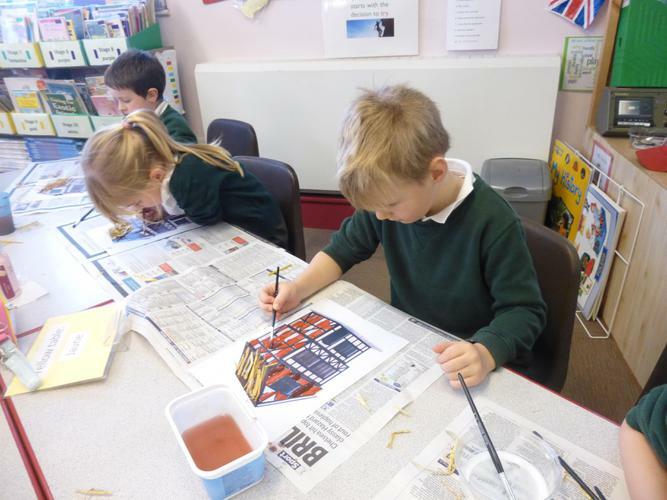 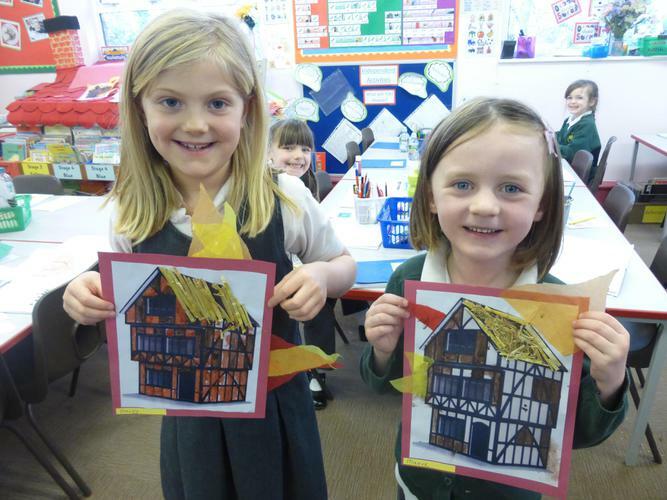 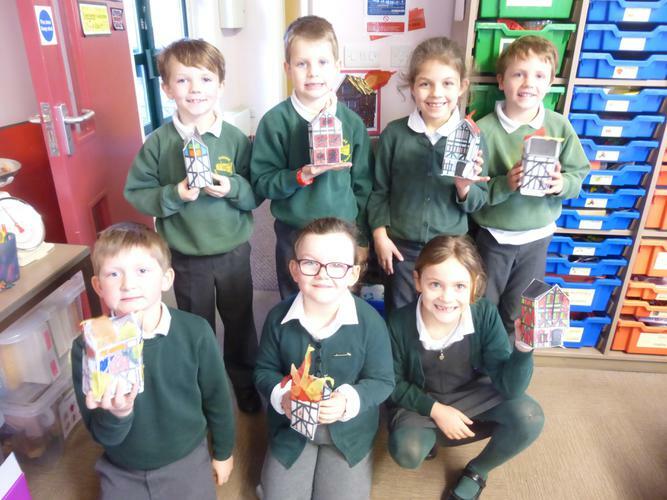 In art we made some 1666 houses and in geography we looked at a 1666 map of London. 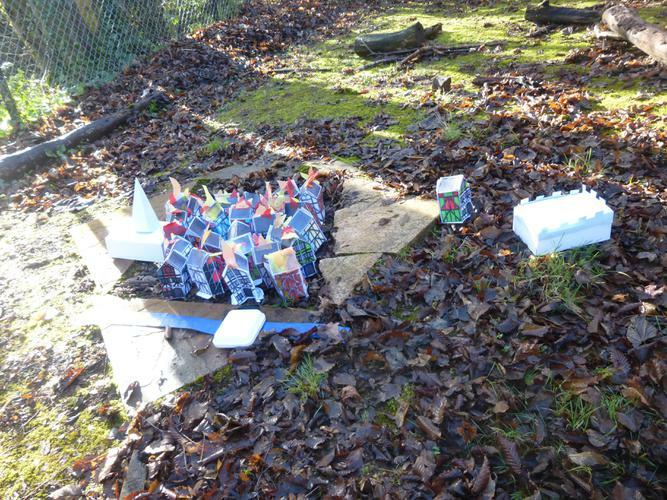 We then went ouside to build London. 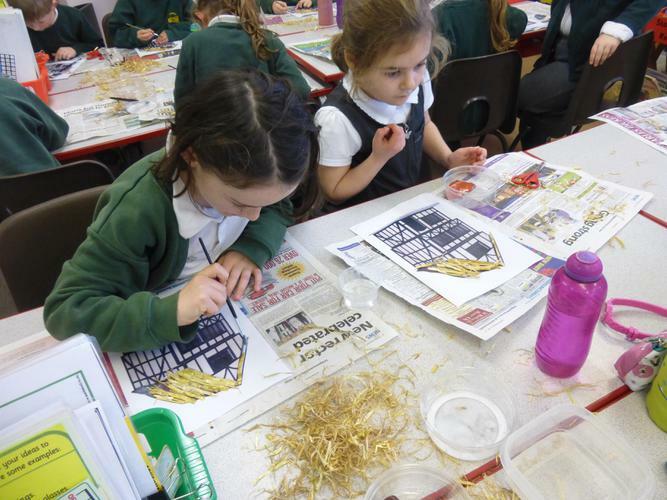 We put in the river Thames, London bridge, St Paul's Cathedral, Samuel Pepy's house and the Tower of London. 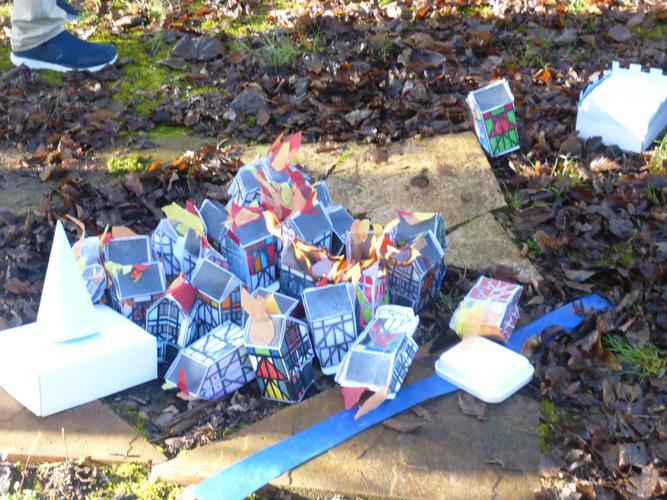 After that we used our houses to make Pudding Lane and the surrounding streets. 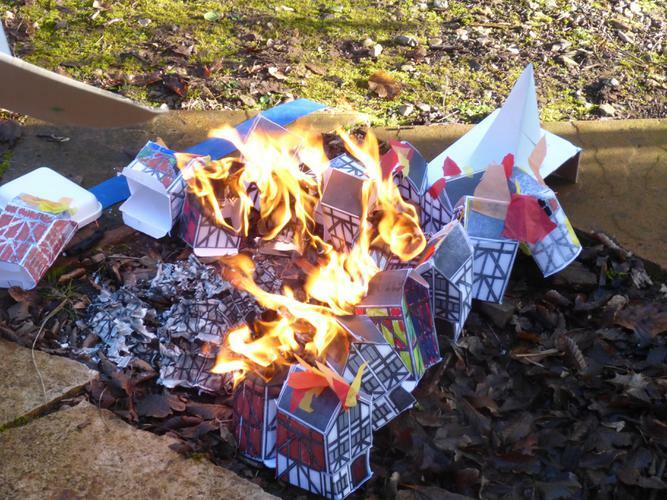 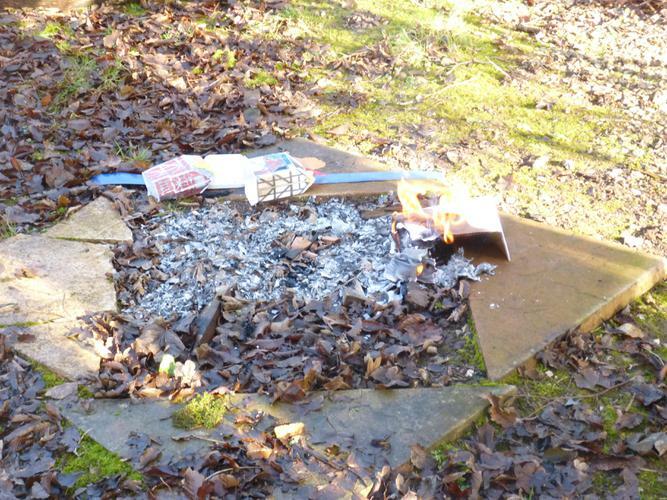 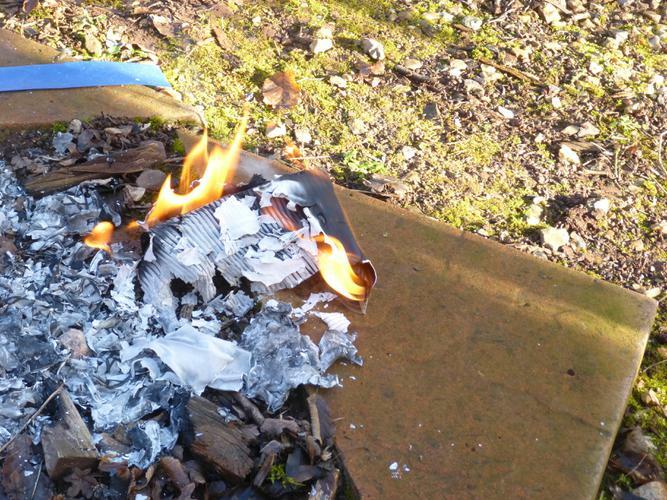 Then we set fire to London! 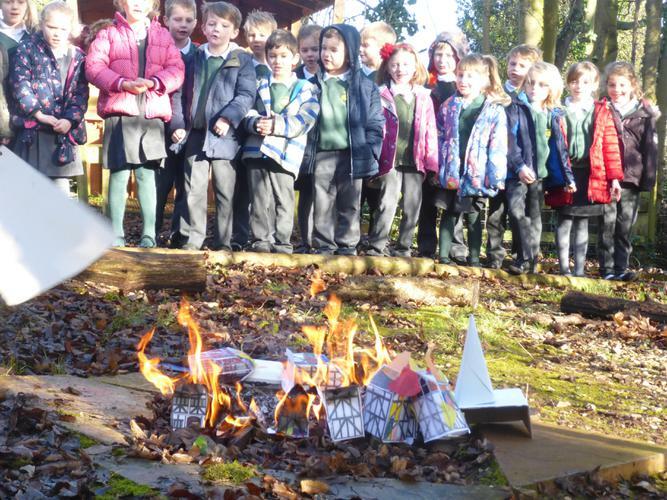 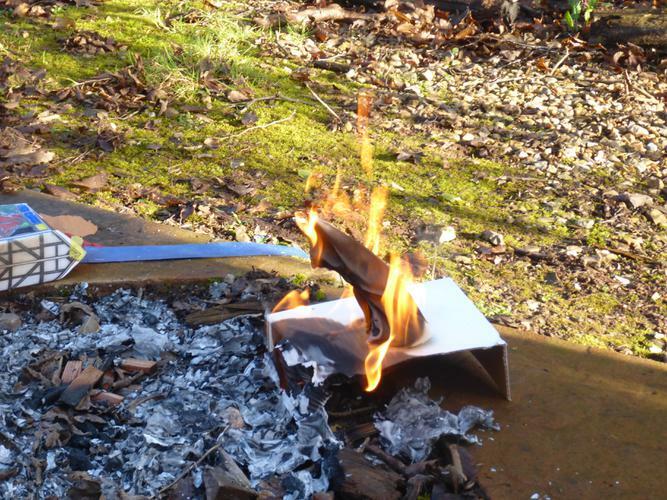 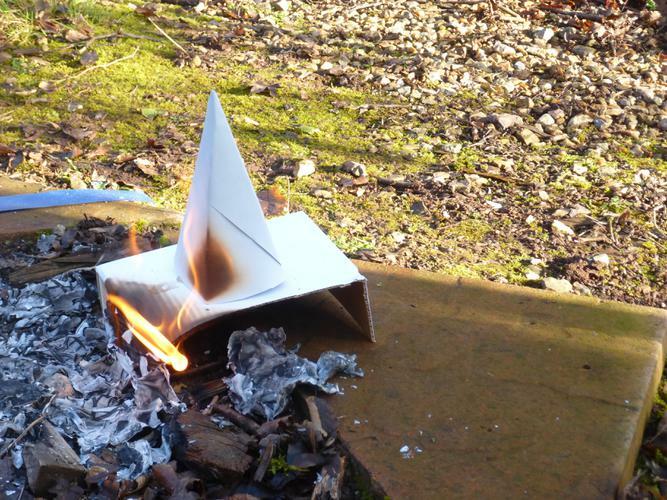 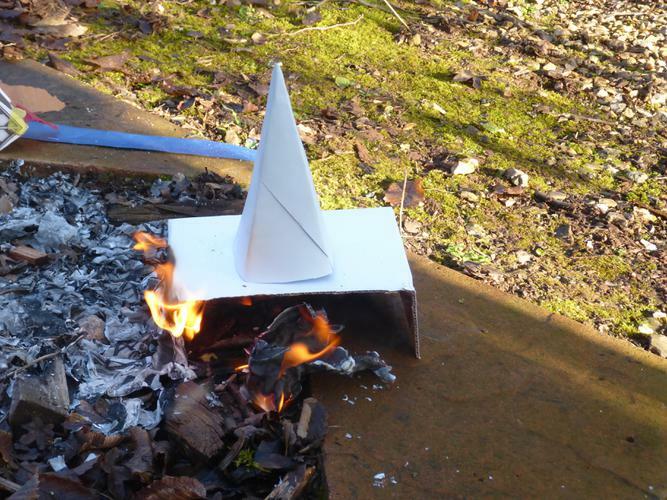 It was quite windy in 1666, but there wasn't very much wind the morning we did this so we had to fan the flames to create a wind. 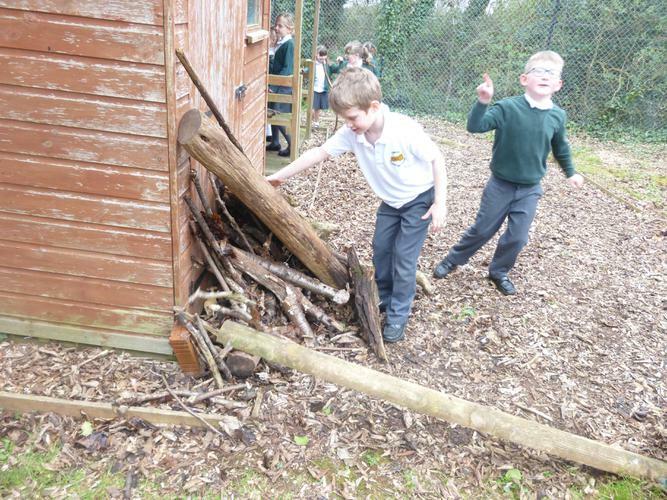 We made sure it was blowing from the East. 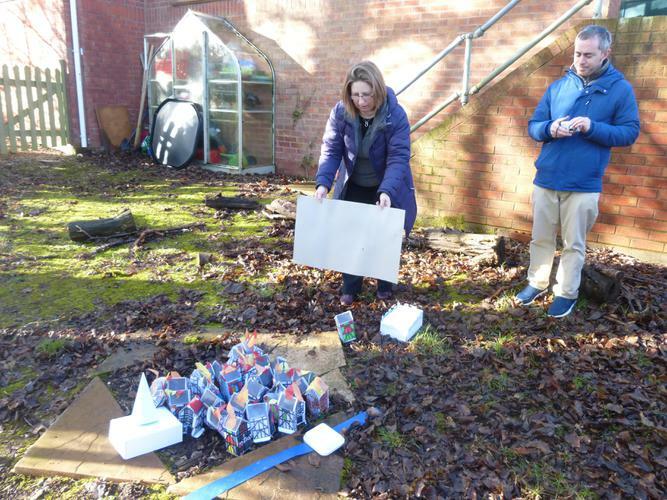 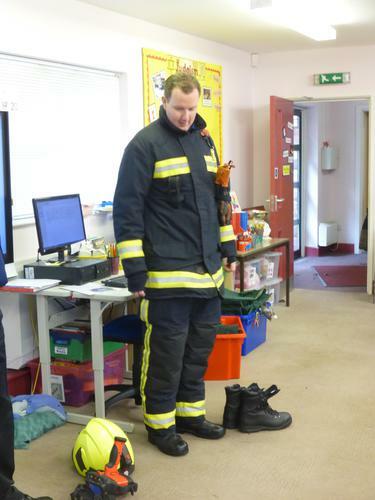 Mrs Marshall made the wind, Mrs Evans stood by with a bucket of water and Mr Green was in charge of the fire extinguisher! 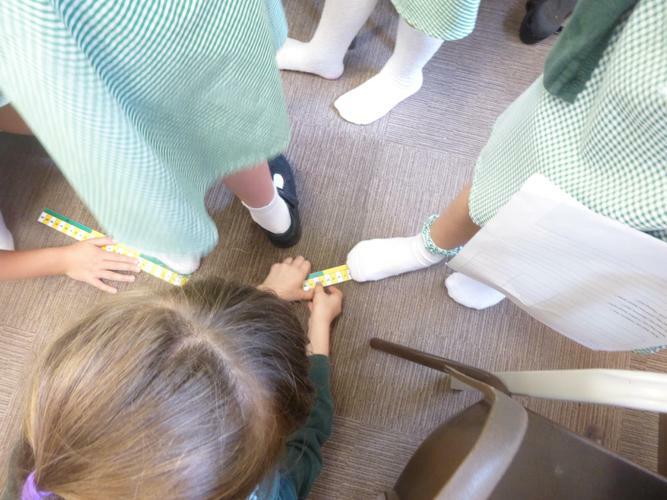 Today we spent the day reflecting on the word TRUST. 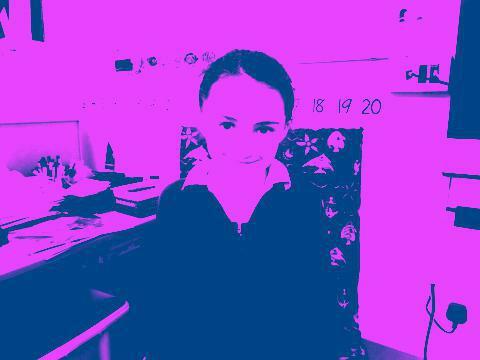 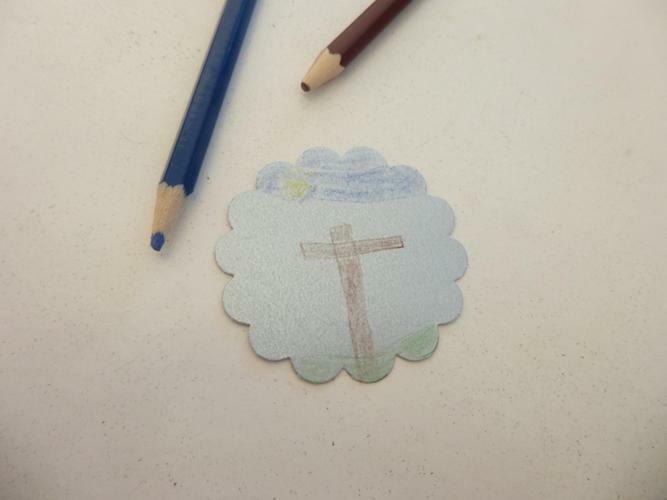 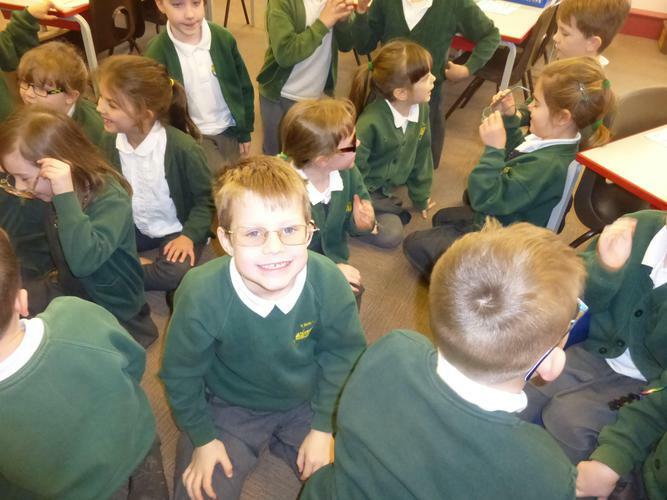 We thought about who we could trust and why, and how we could learn to trust God. 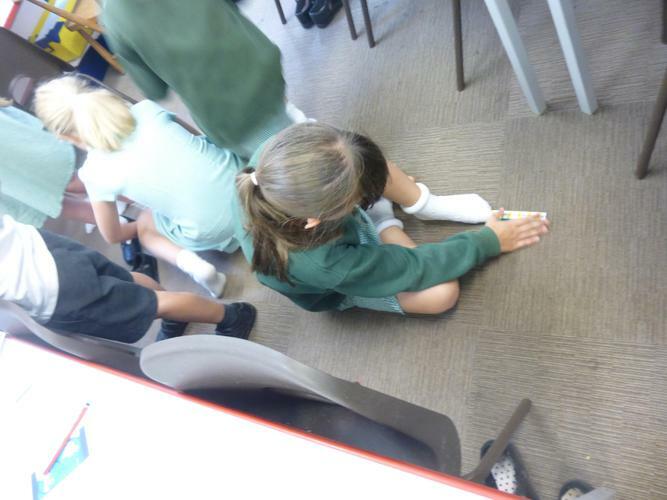 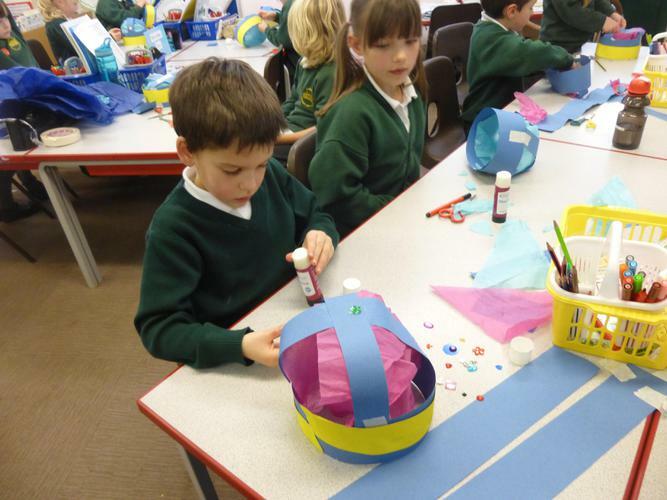 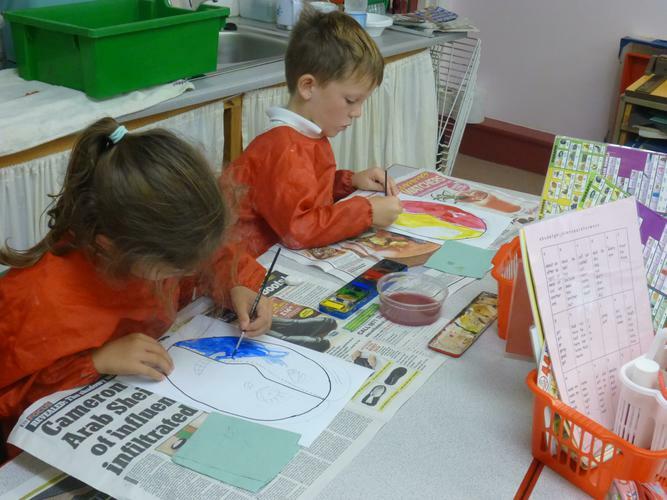 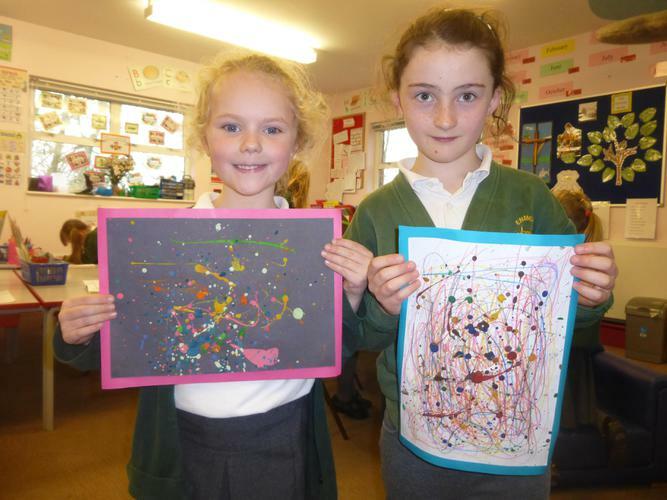 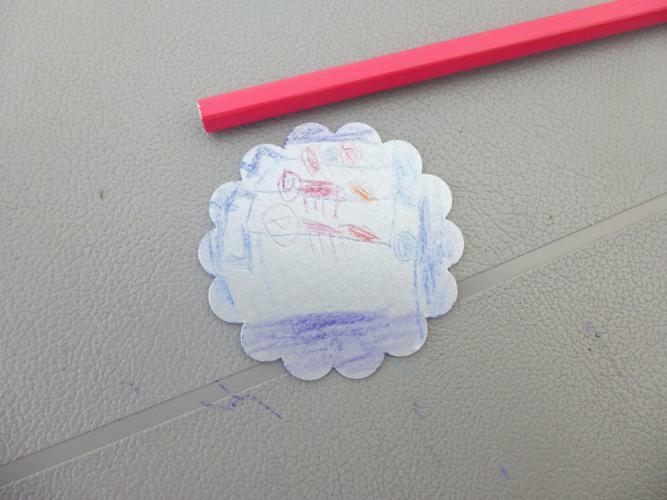 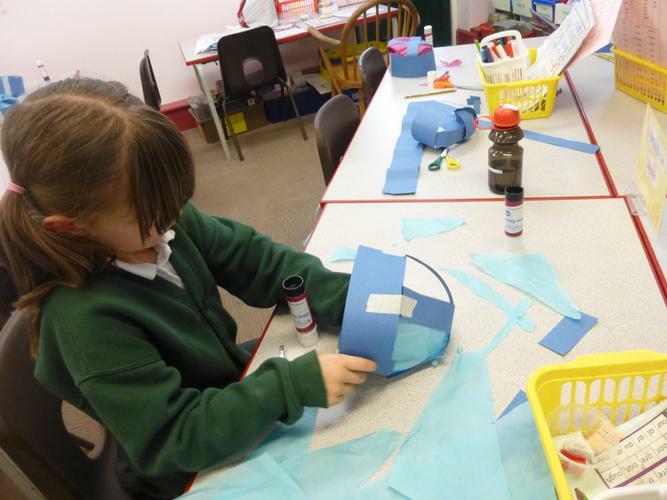 We explored the story of when Jesus calmed the storm and we made wave collages. 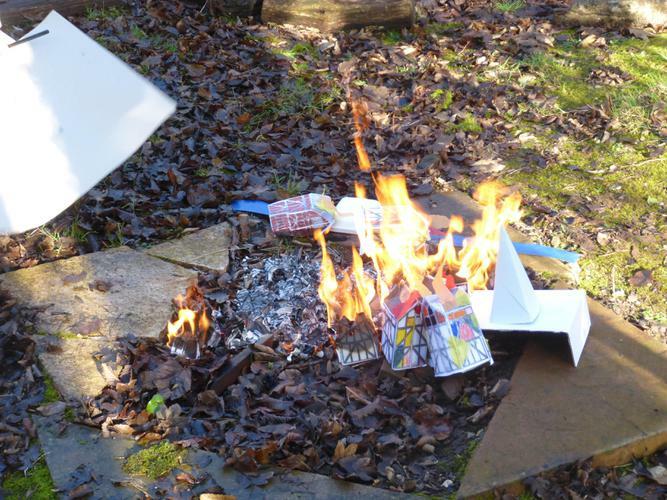 Our Nativity was called "A Present for the Baby". 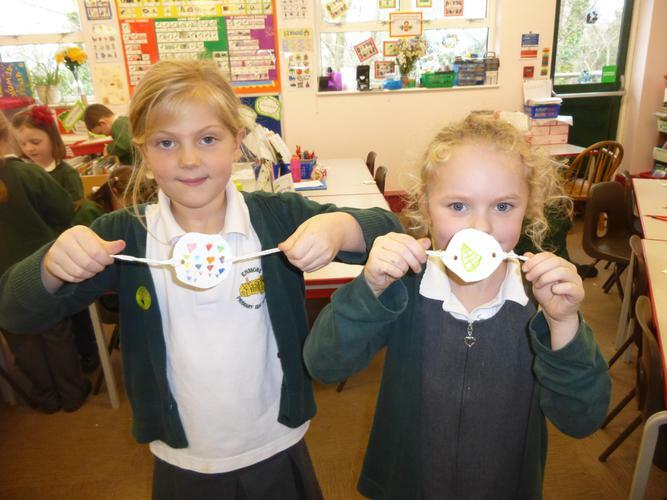 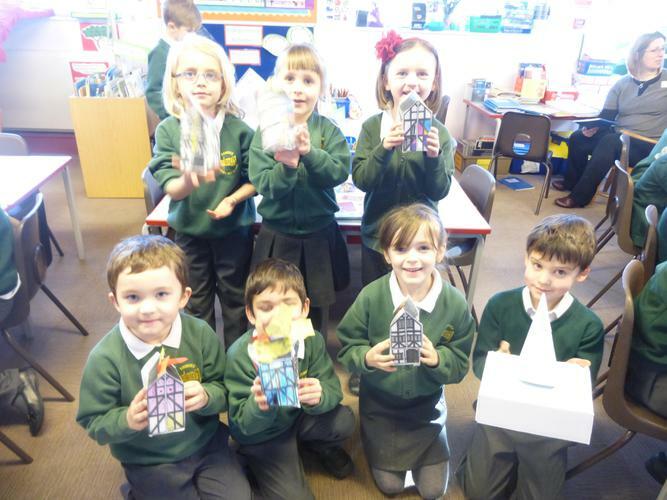 We made Christmas decorations to decorate our classroom. 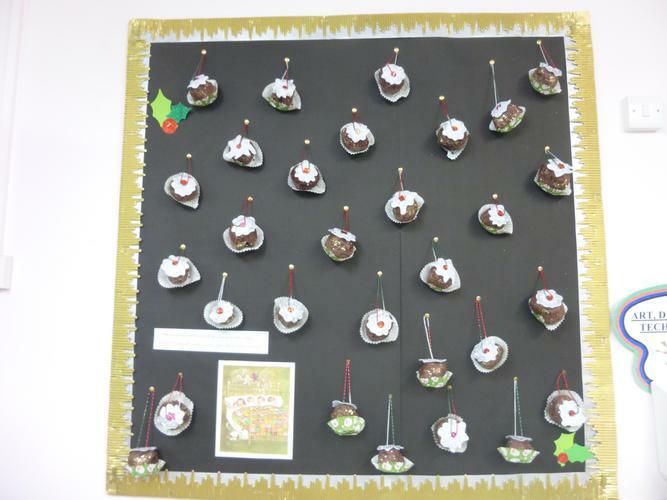 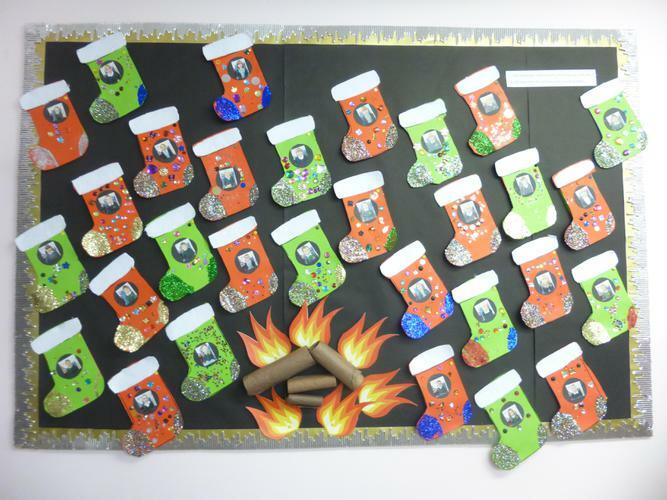 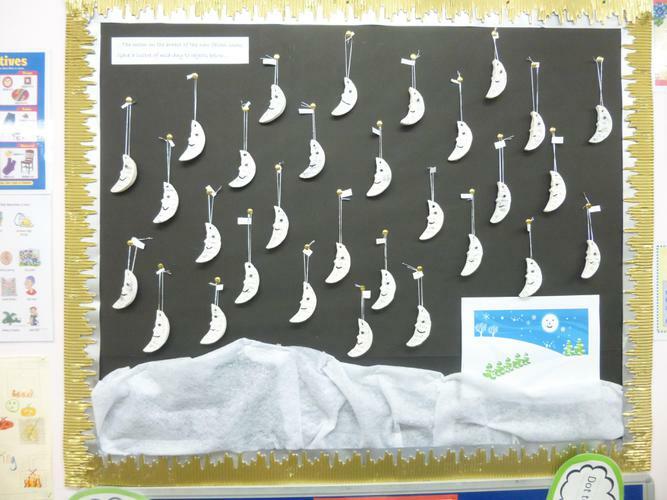 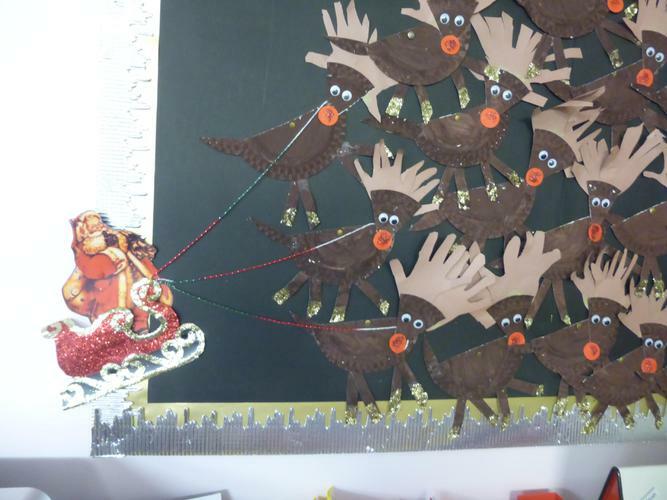 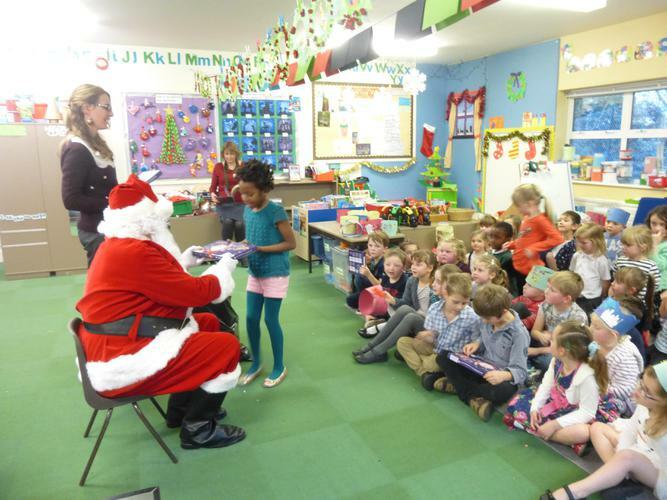 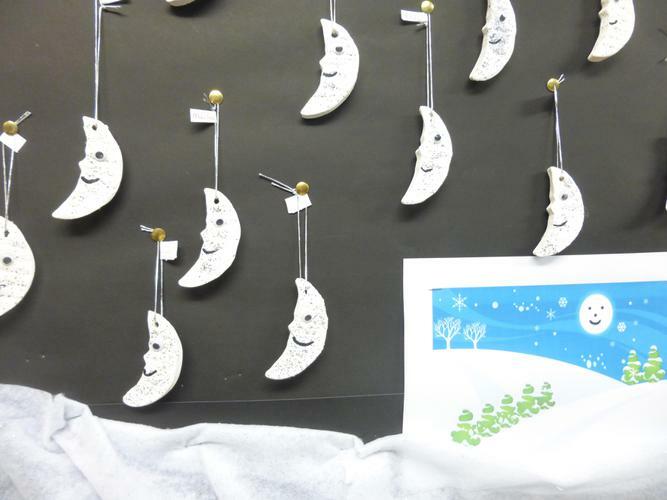 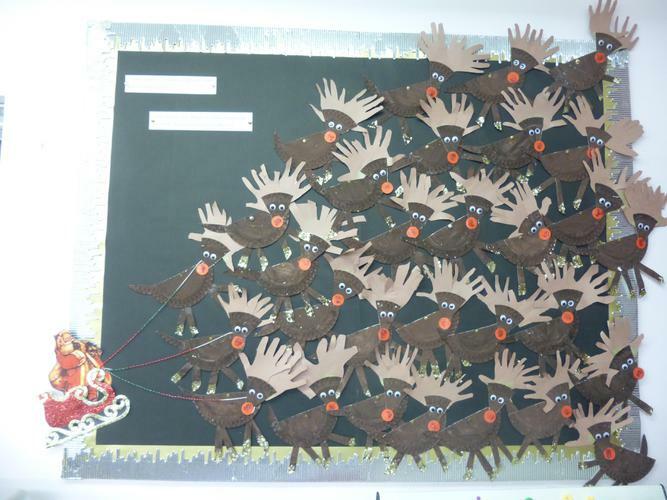 This year our decorations were all based on a poem we read called "Twas the Night Before Christmas" by Clement C Moore. 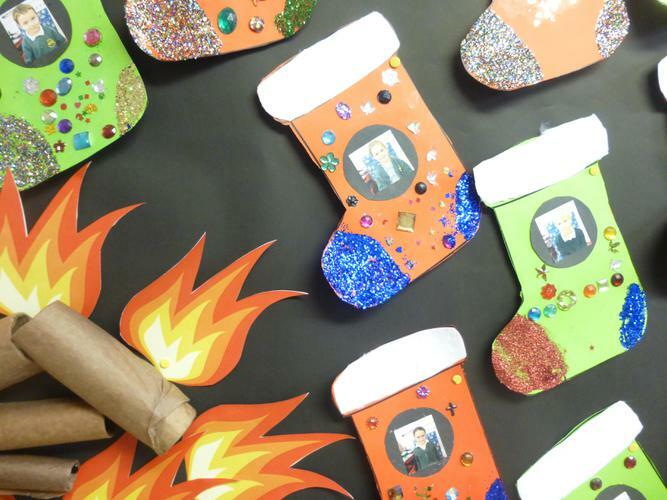 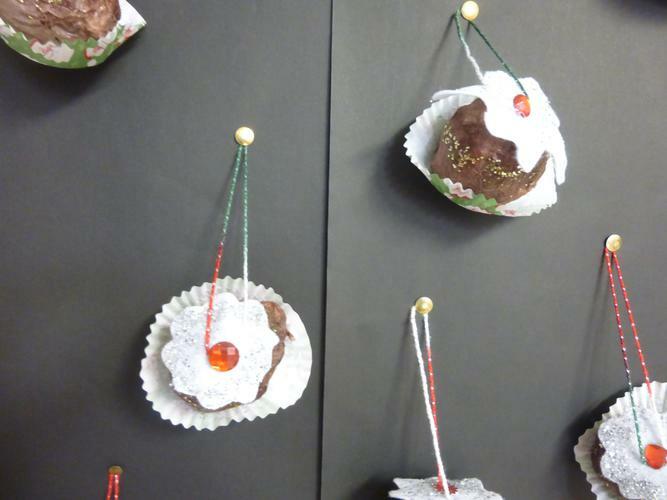 We made stockings, reindeer, sugar-plums and moons. 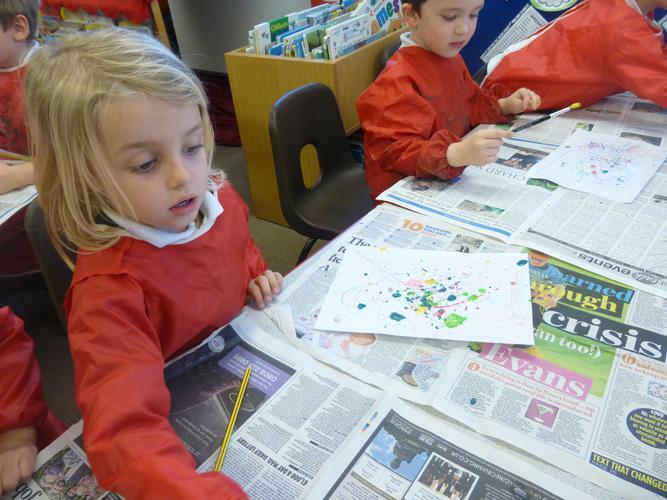 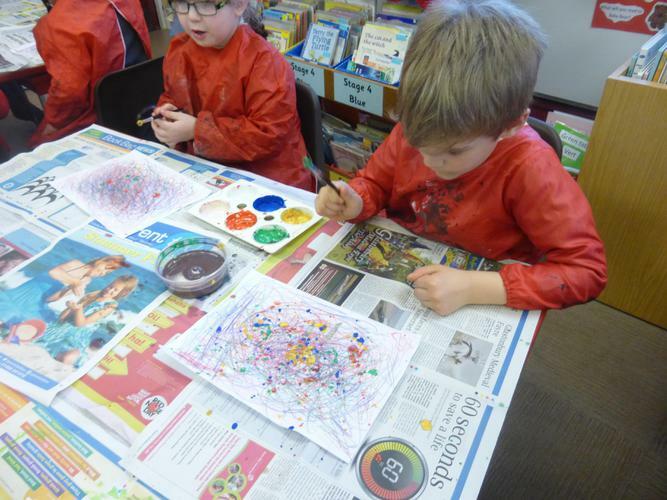 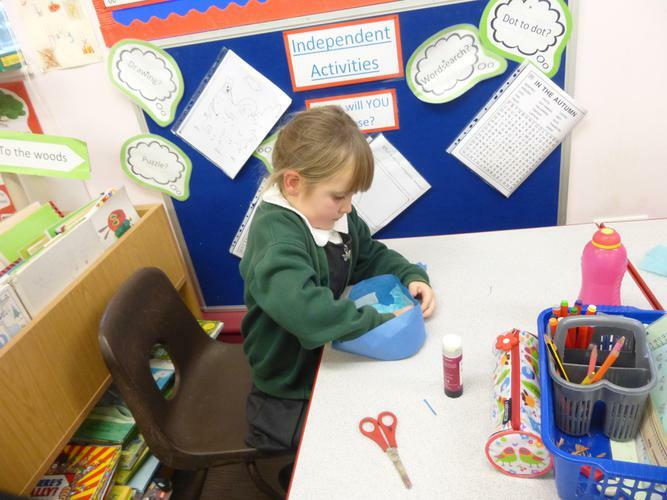 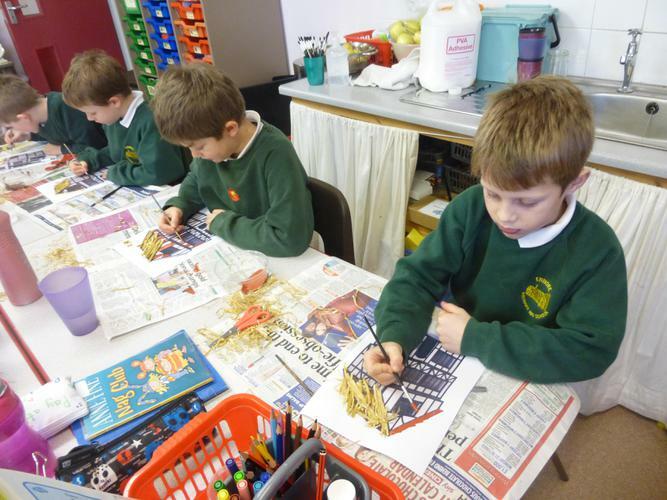 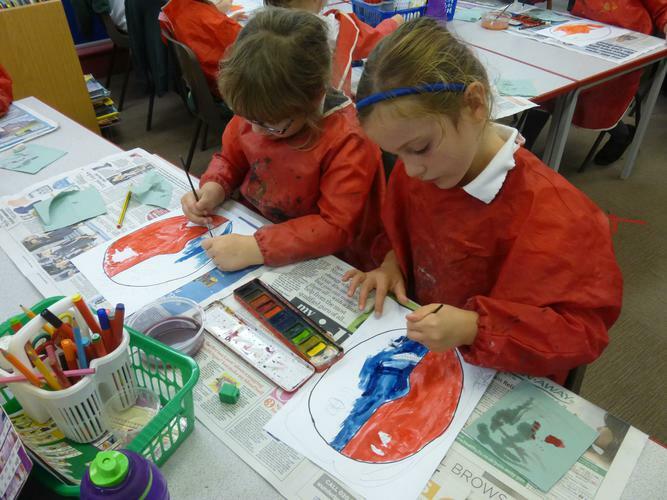 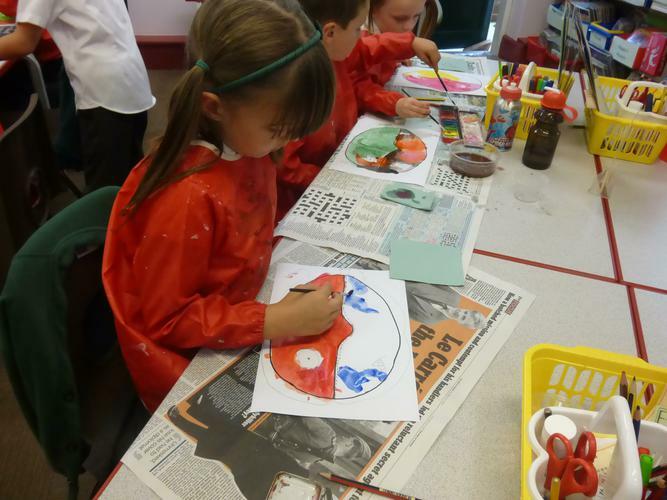 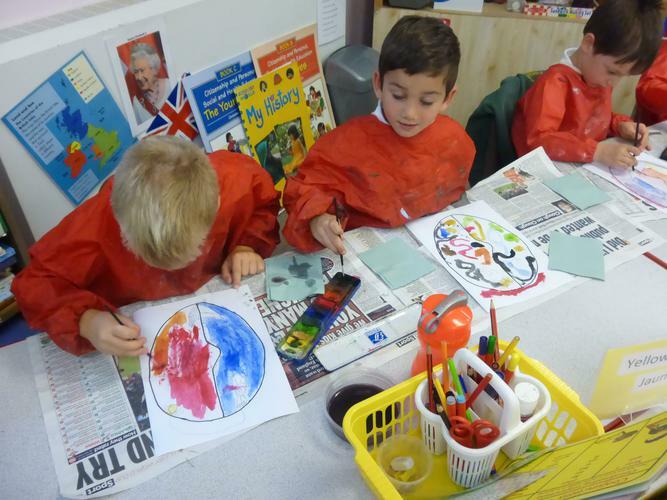 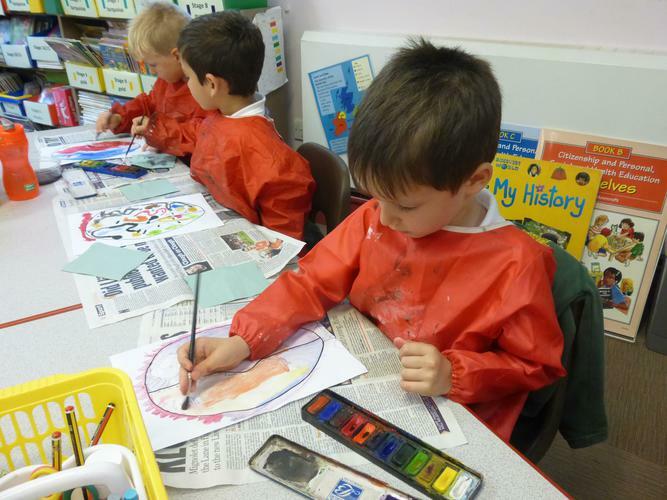 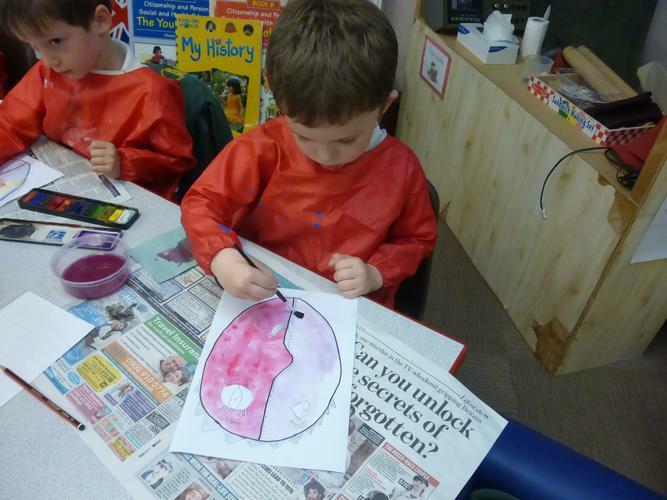 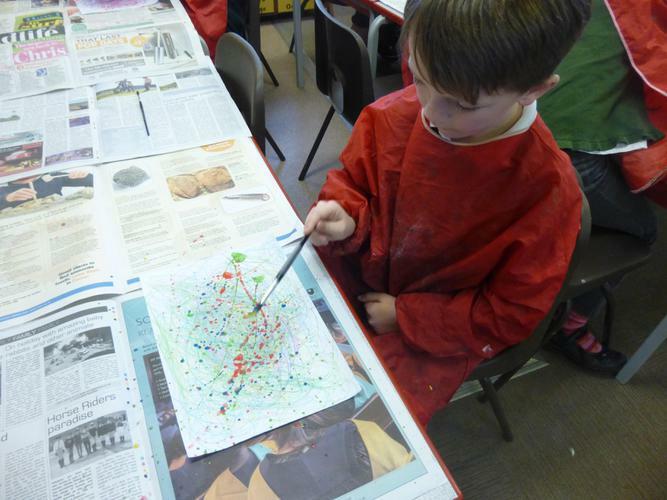 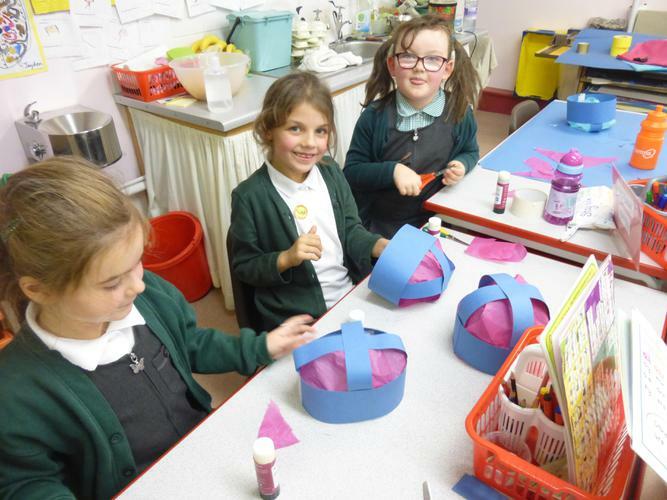 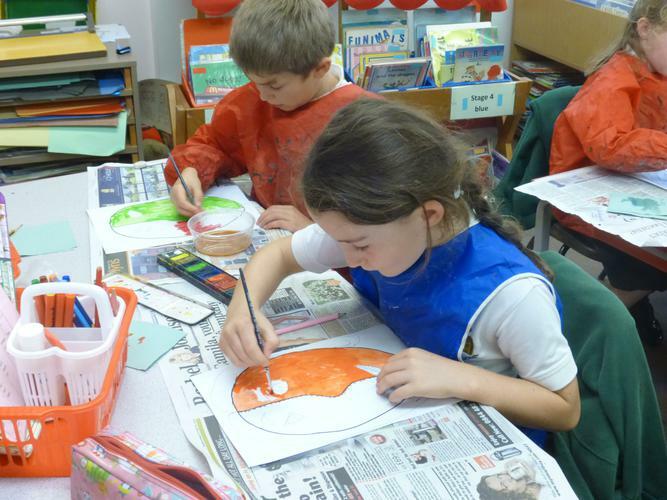 We used papier mache, salt dough, paper plates and lots of paint, glitter and jewels. 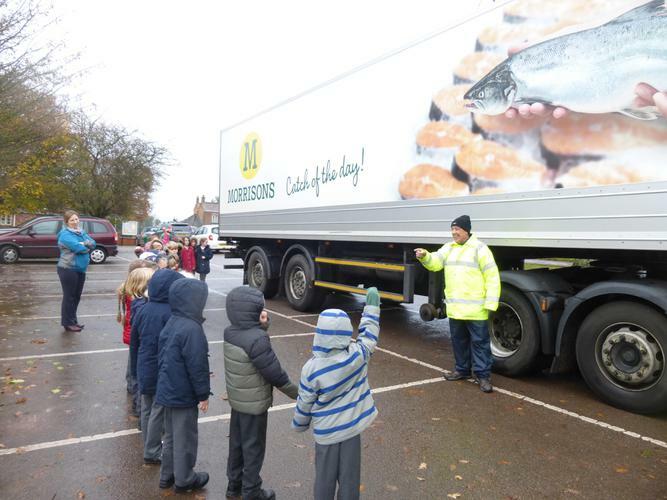 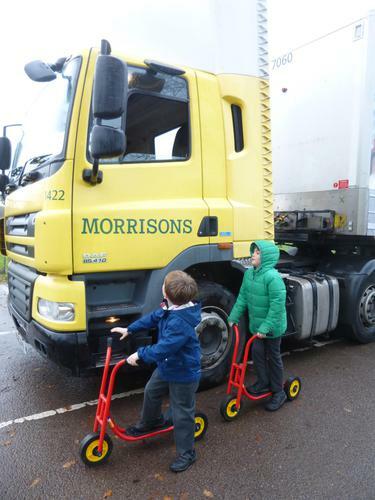 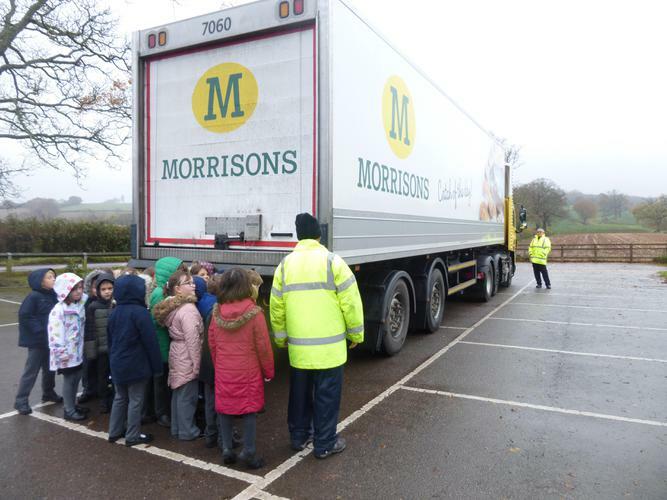 We had a visit from a Morrison's Lorry. 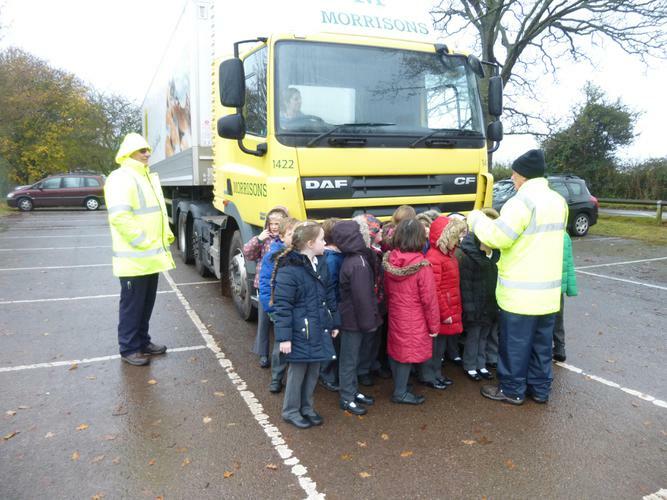 The men driving it told us all about how to keep safe. 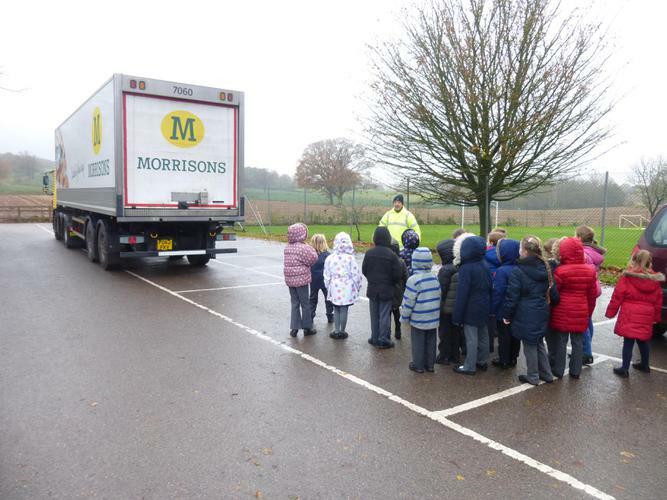 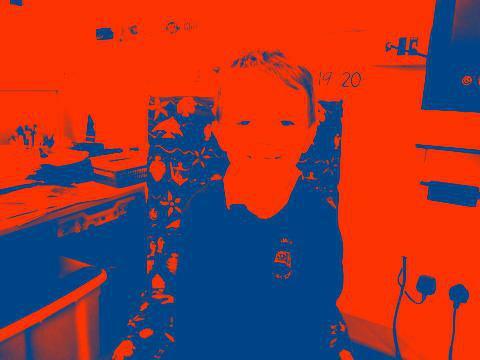 We learnt that the driver can't always see us so if we're on a bicycle we need to keep a good distance away. 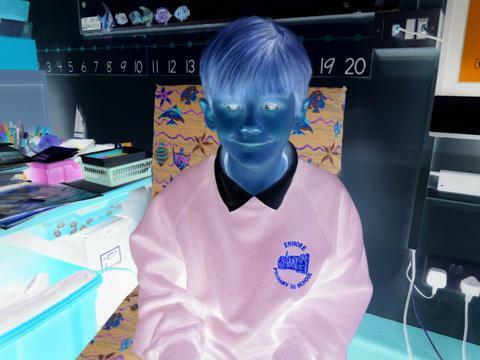 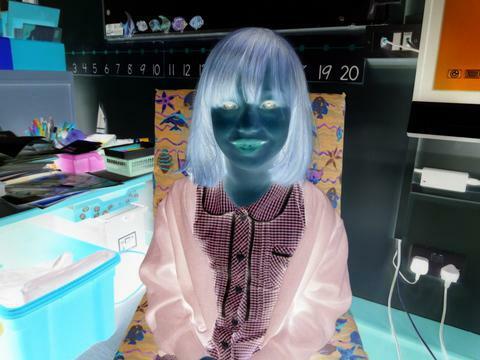 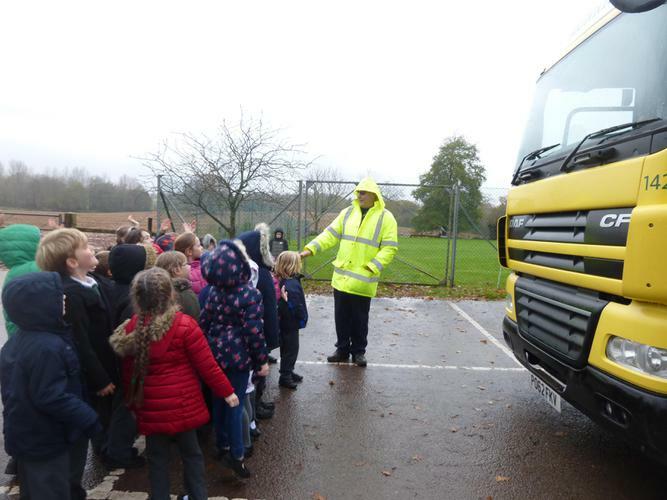 Mrs Marshall prenended to be the driver and told us when she could see us in her mirrors. 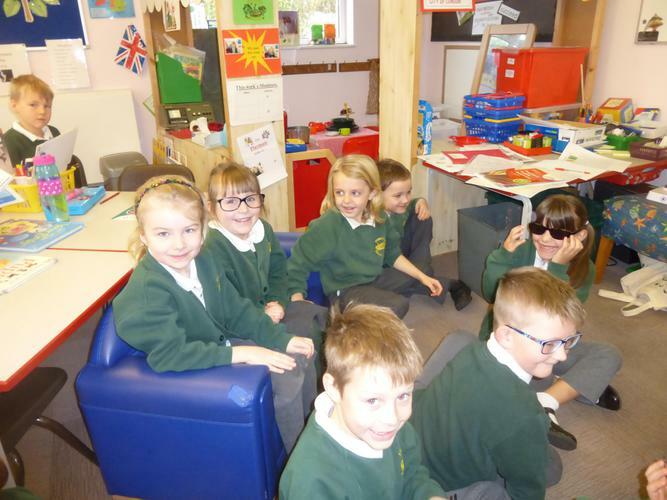 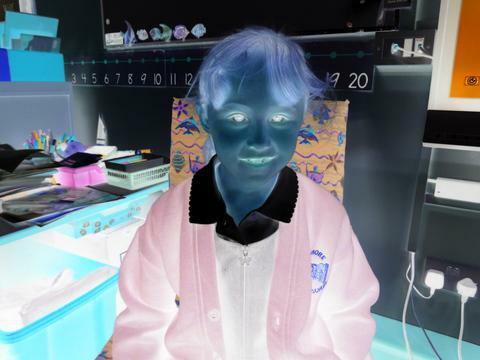 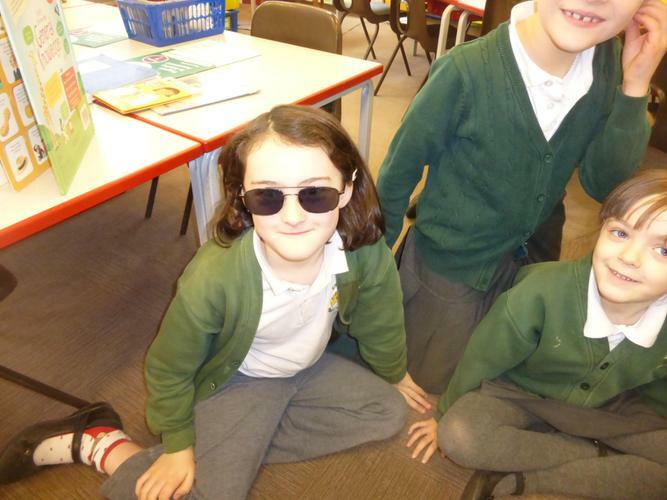 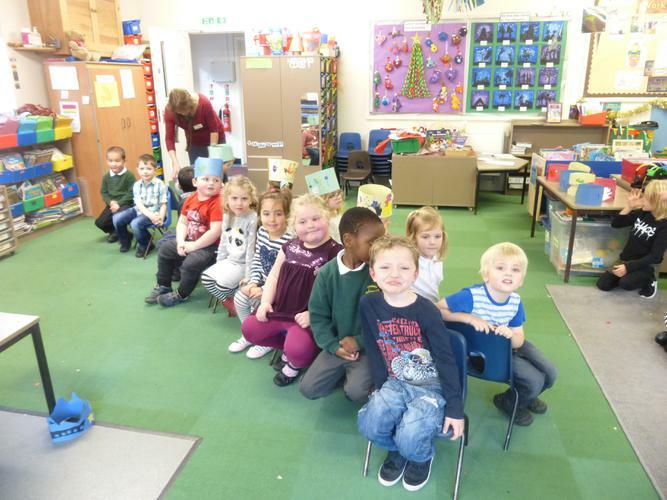 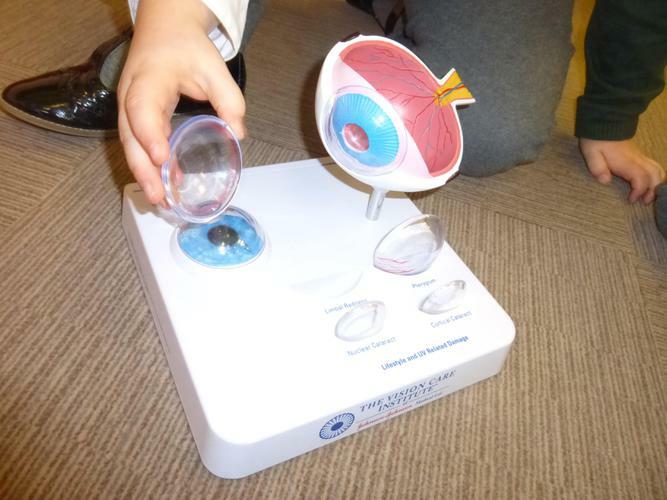 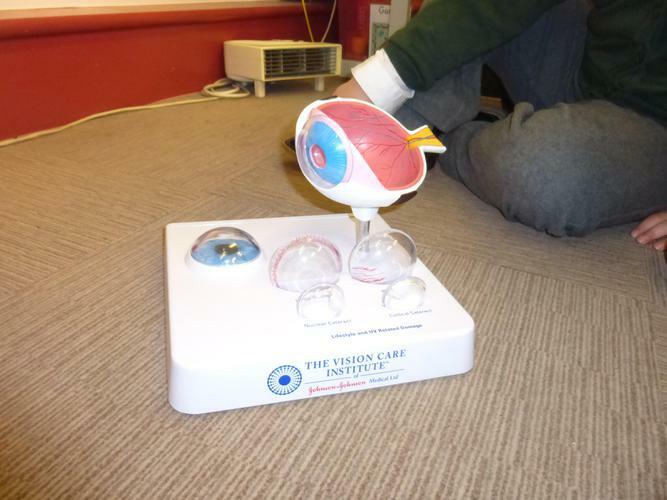 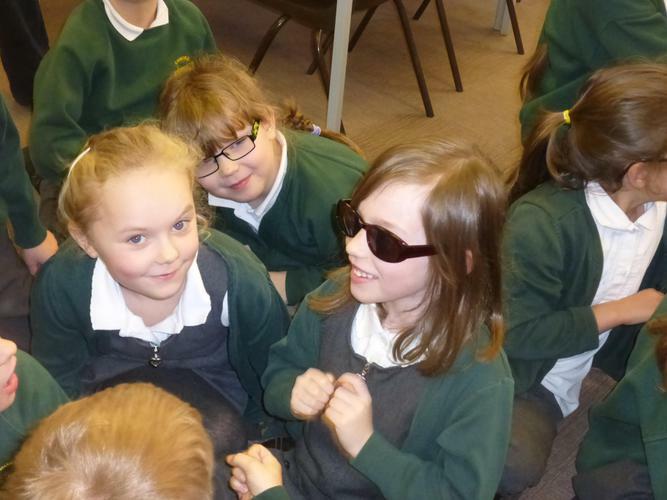 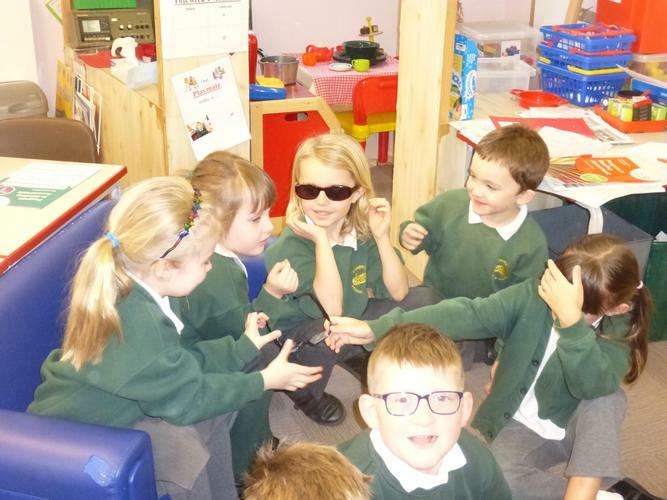 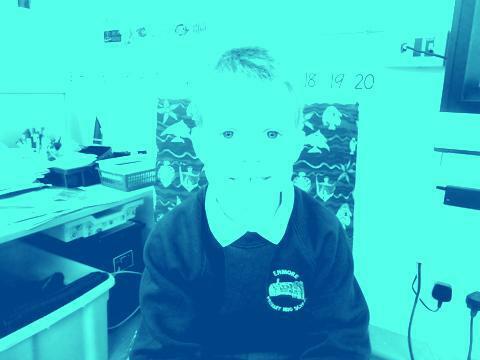 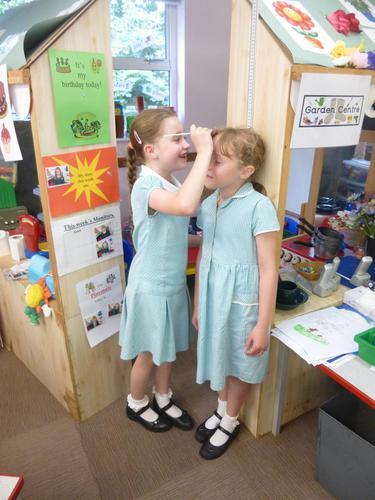 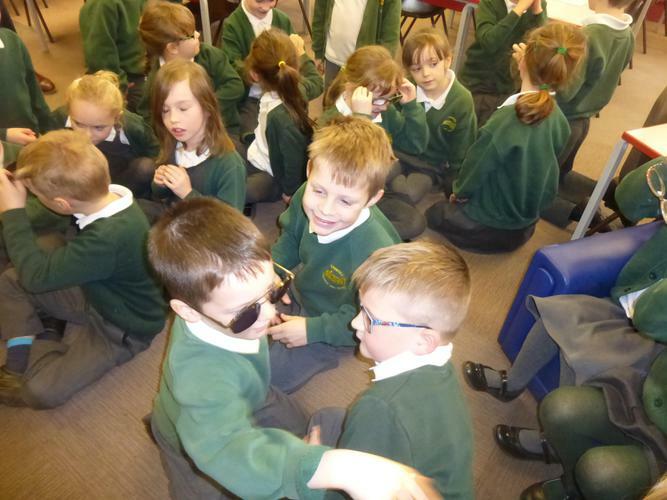 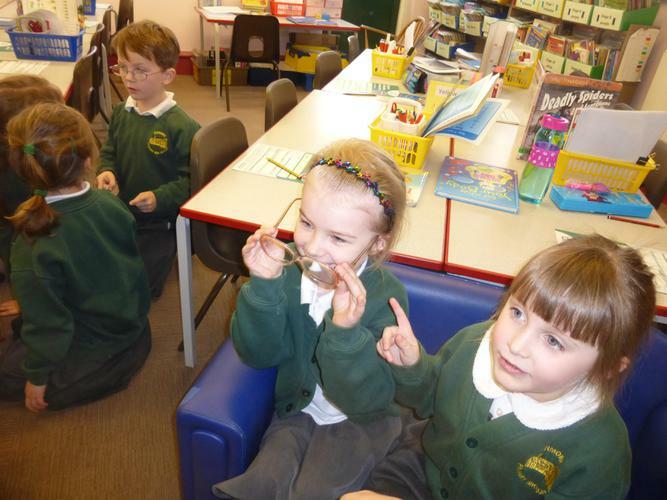 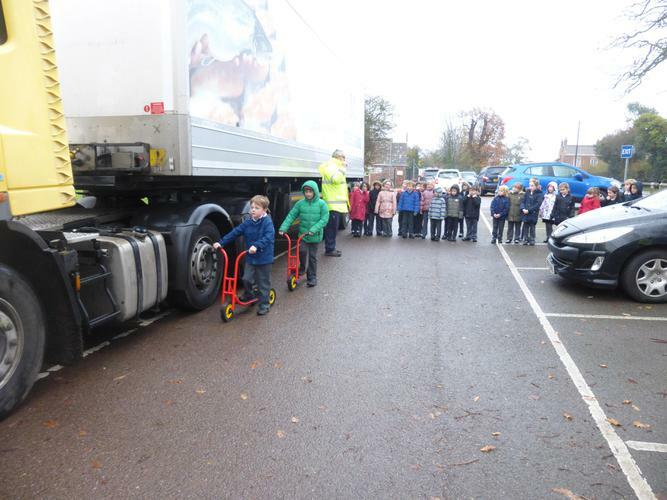 We learnt what a driver's 'blind spot' is . 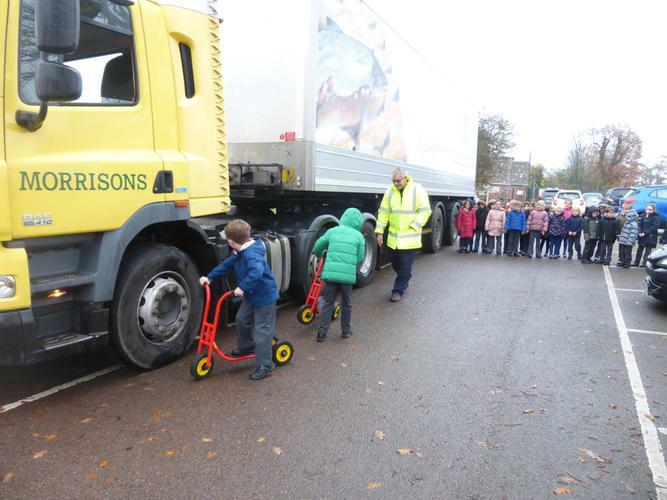 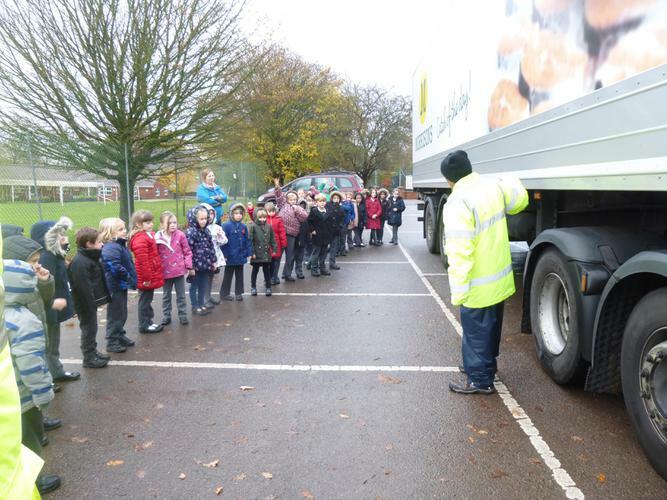 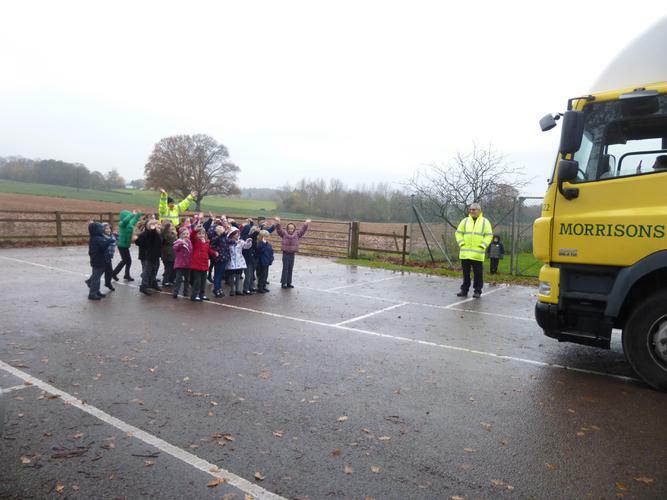 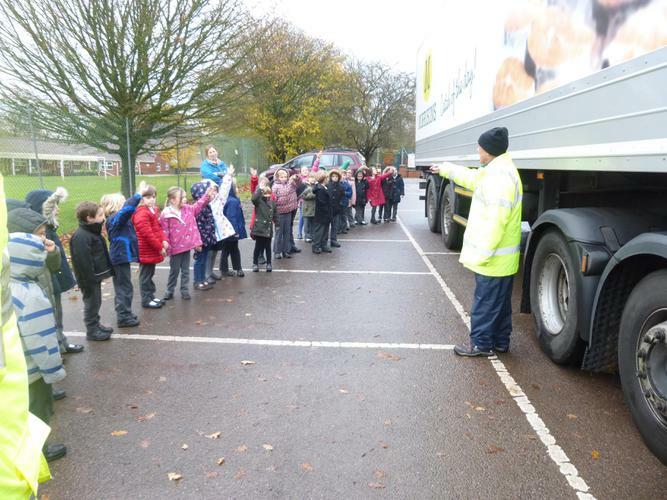 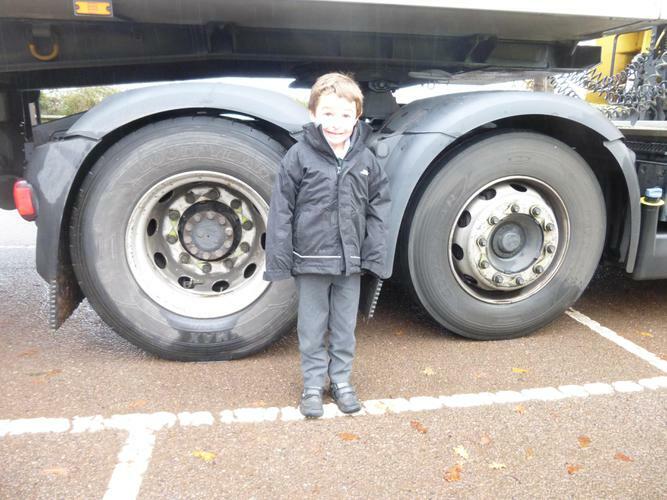 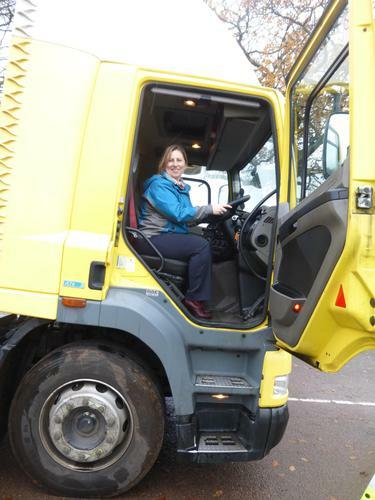 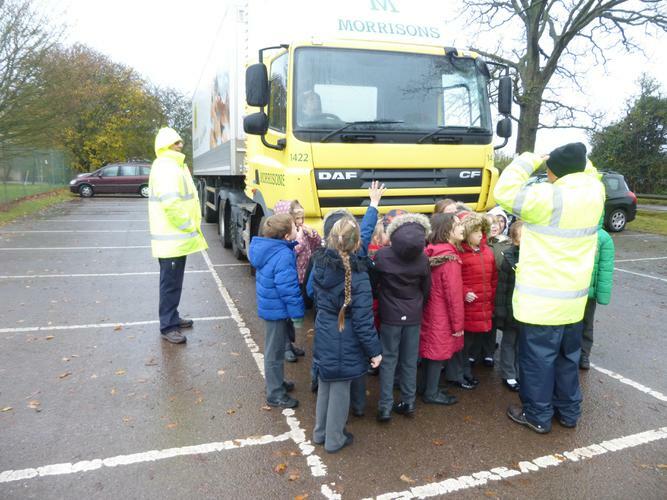 We also learnt that we should never play near big lorries. 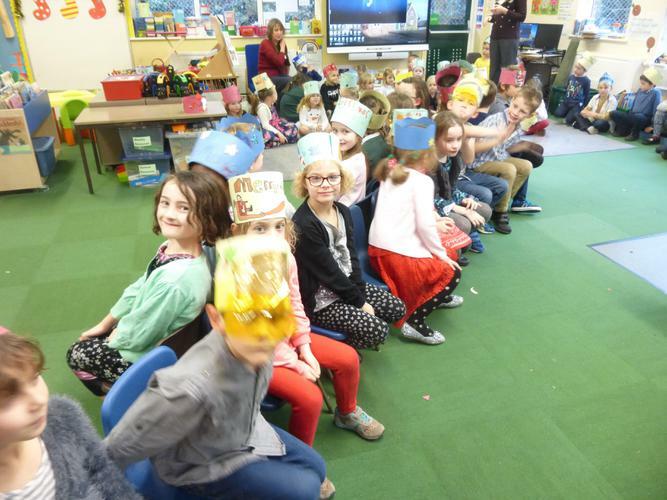 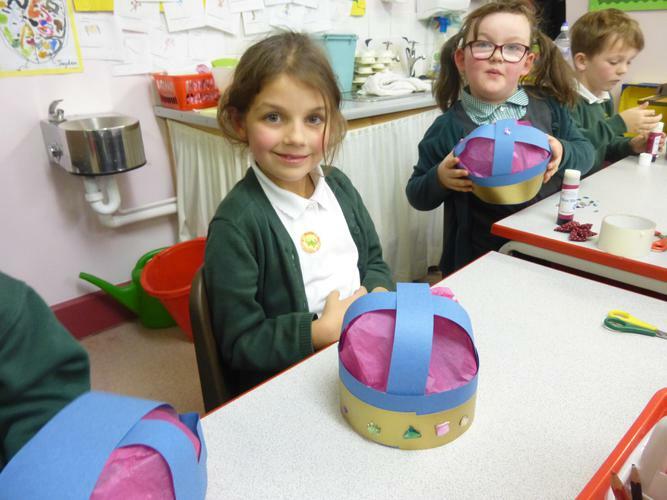 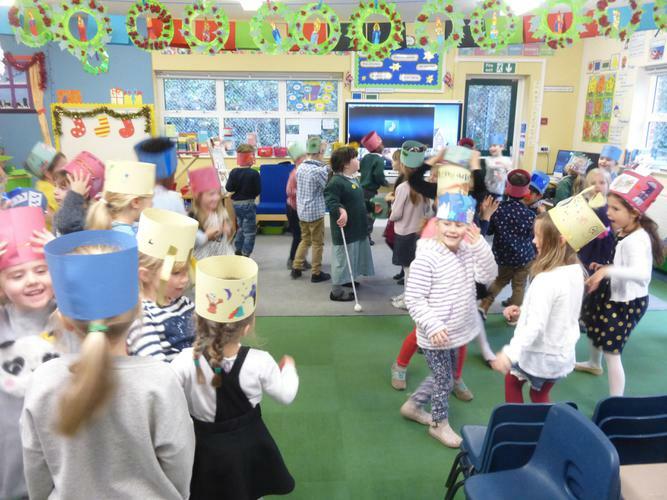 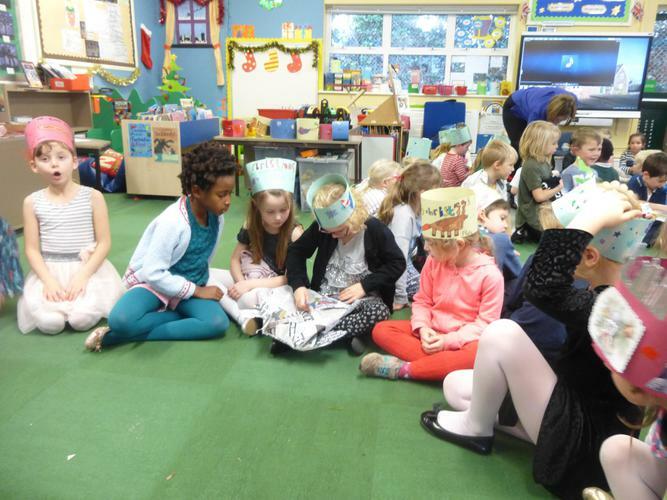 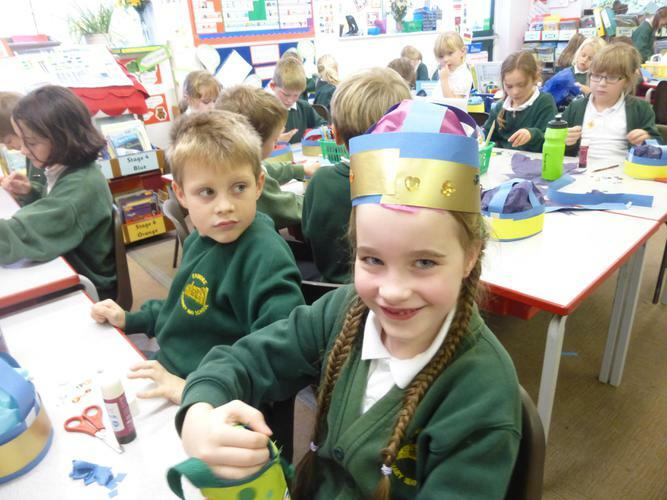 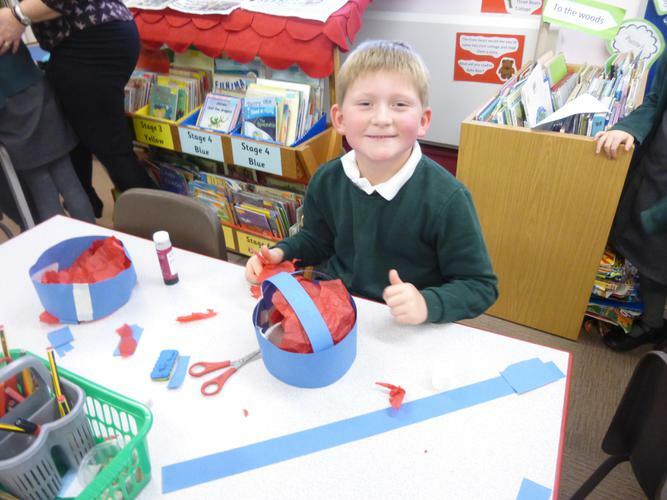 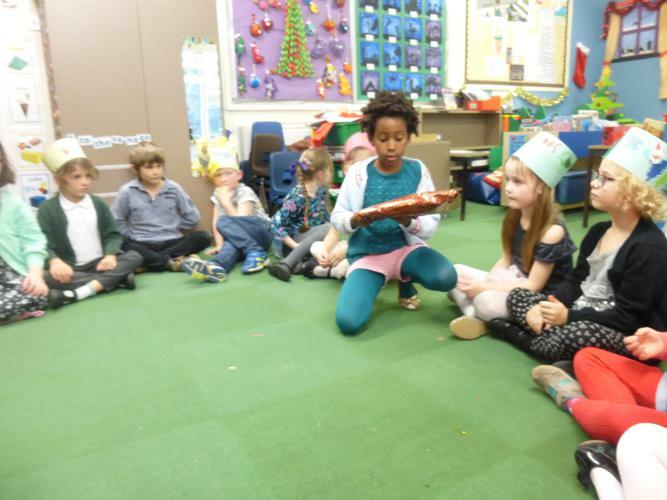 Making Crowns - Retelling the story of King Arthur and Excalibur. 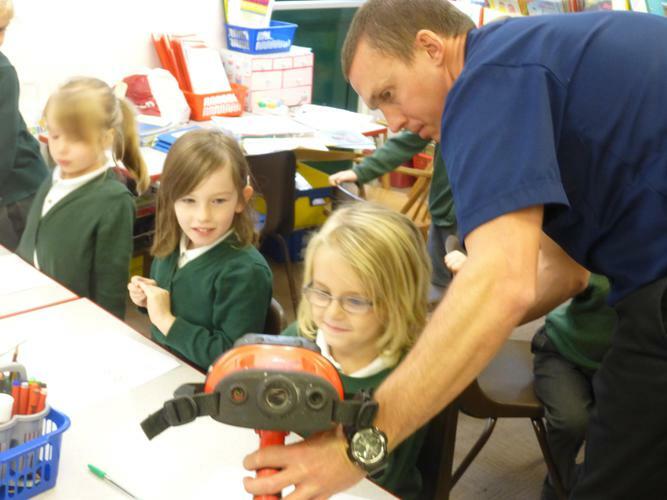 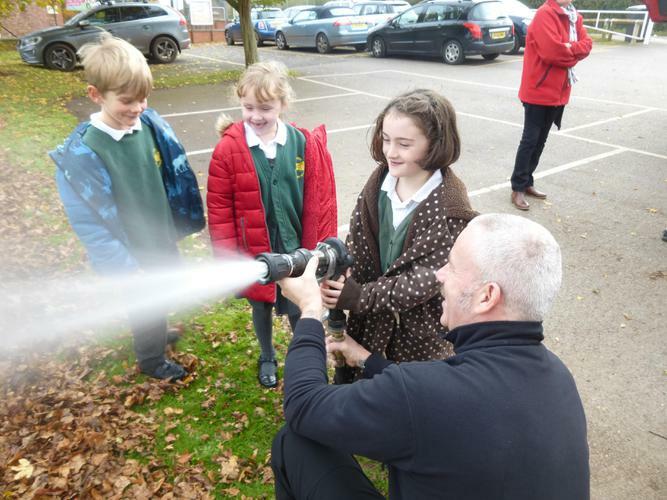 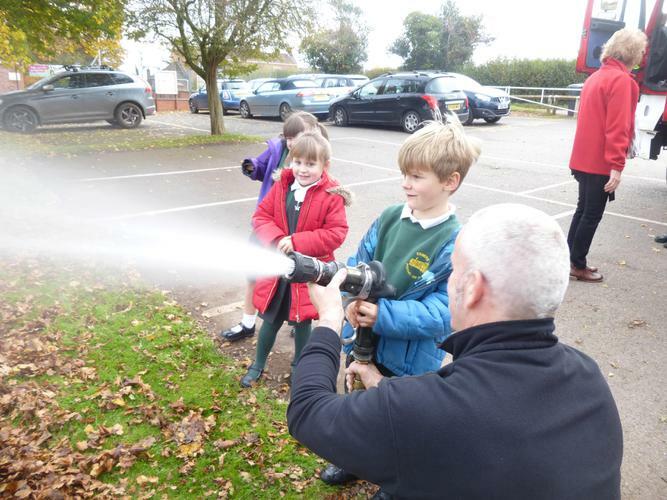 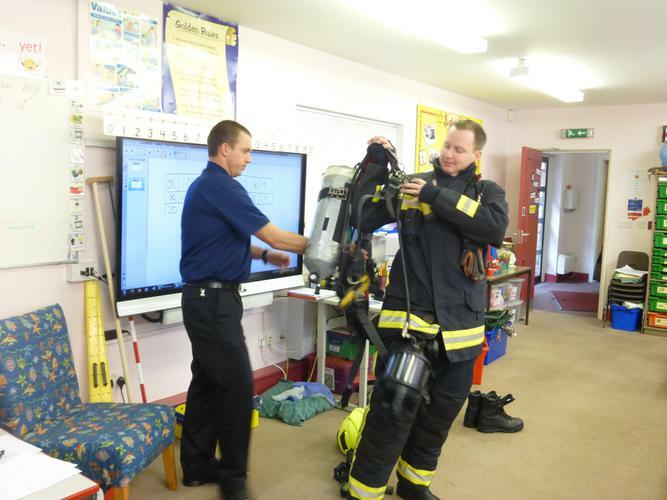 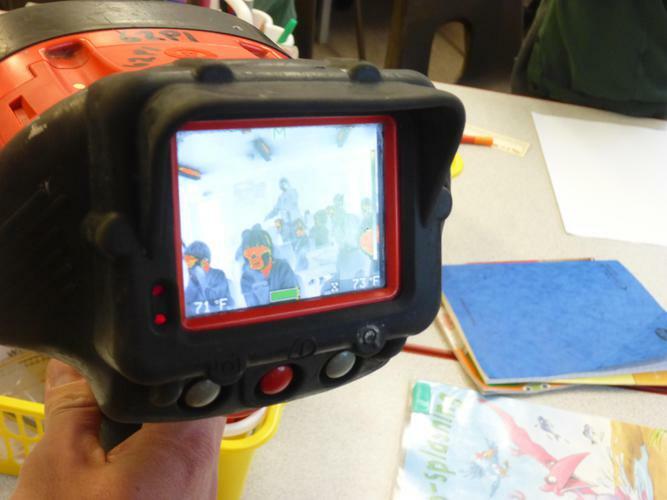 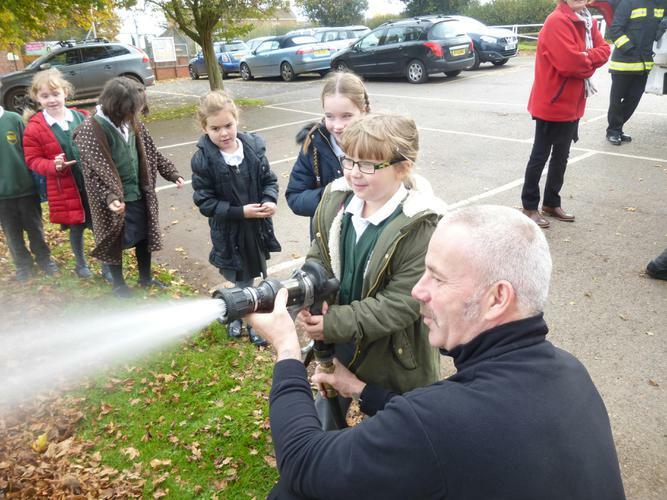 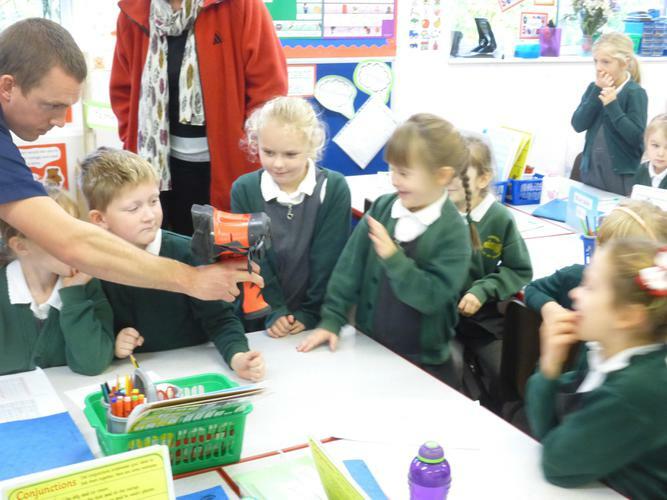 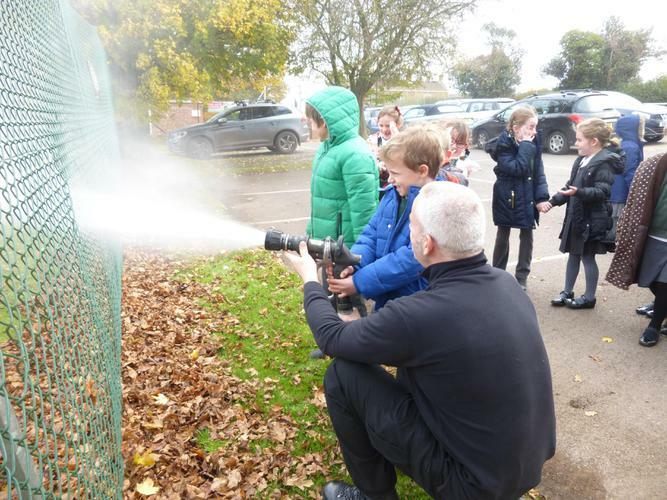 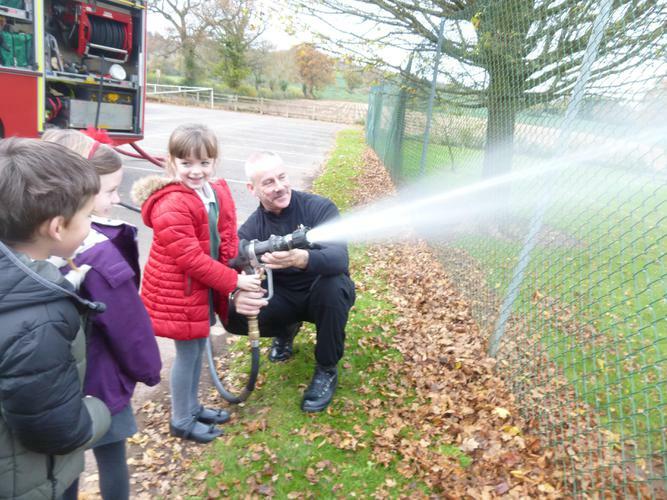 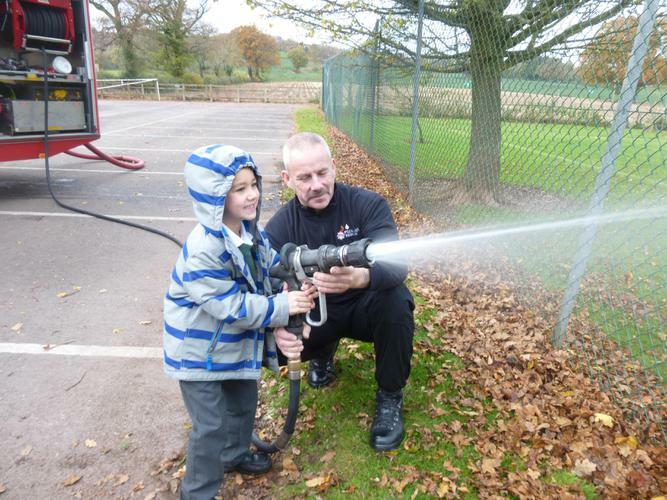 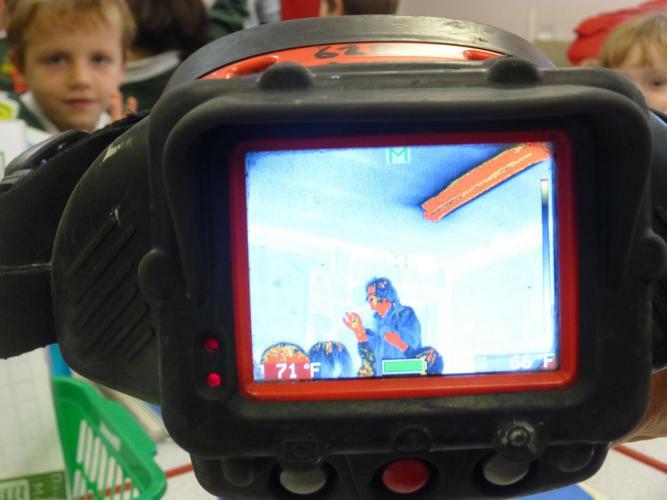 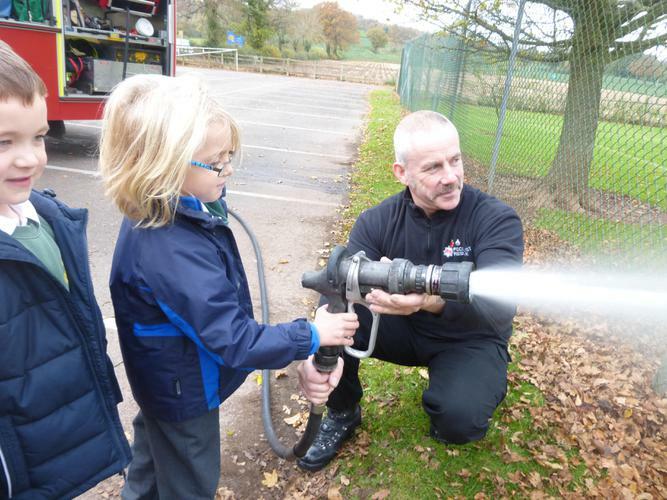 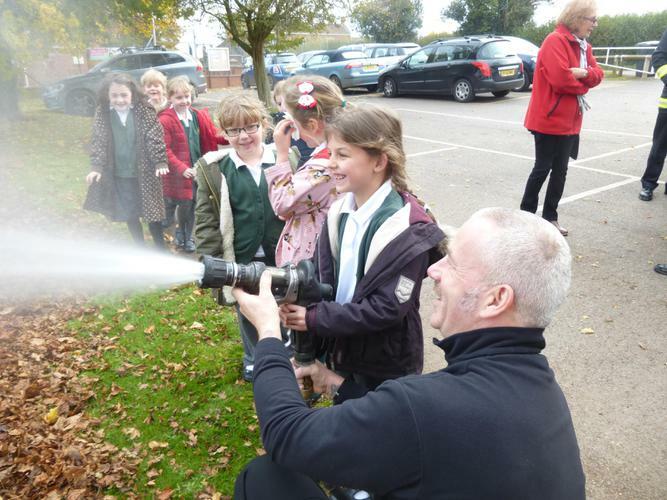 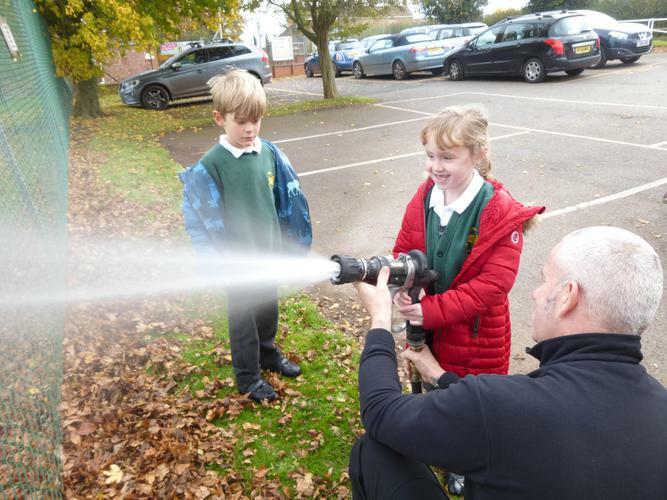 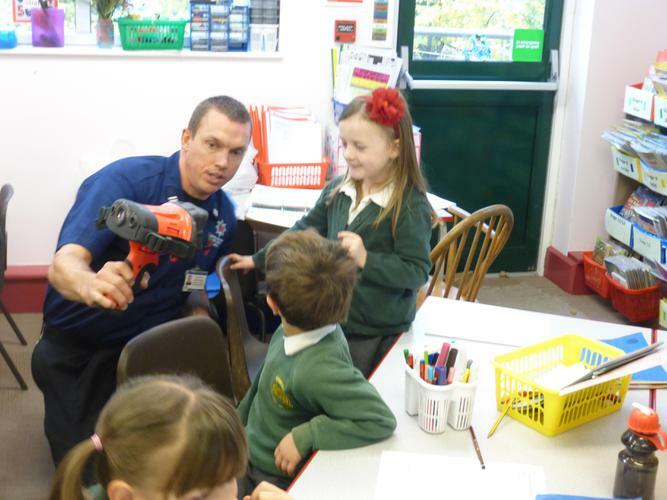 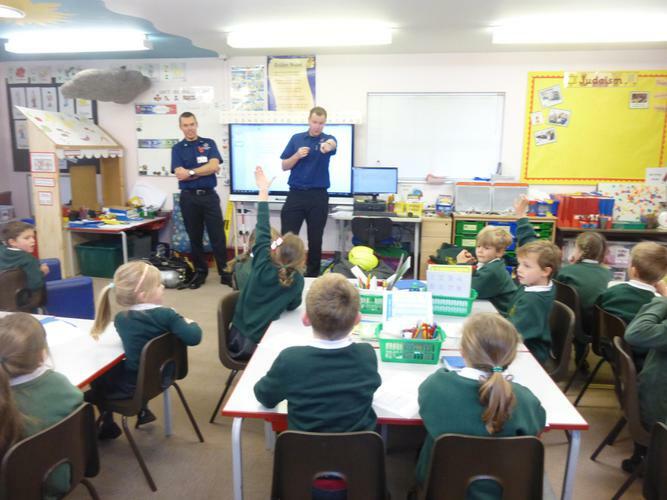 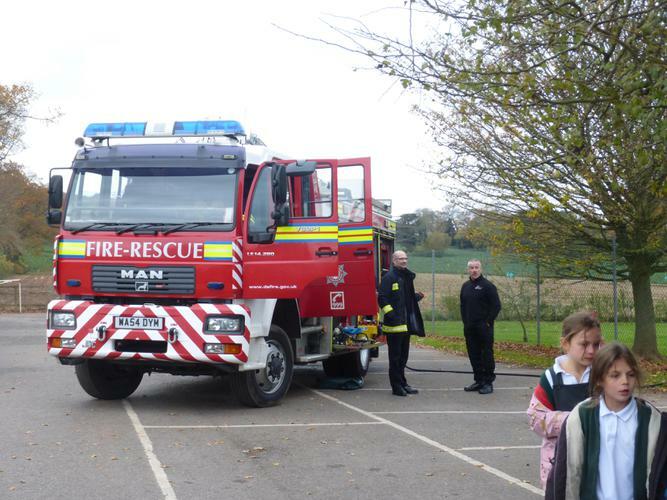 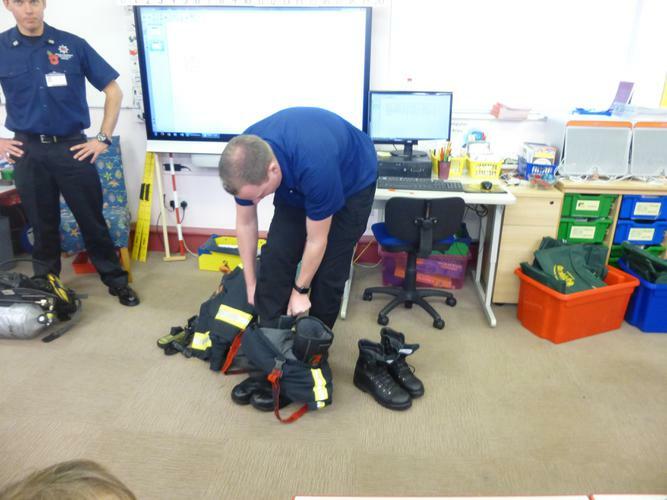 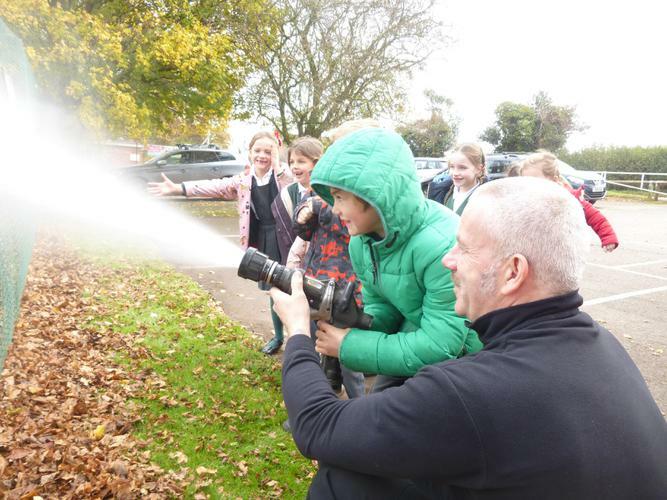 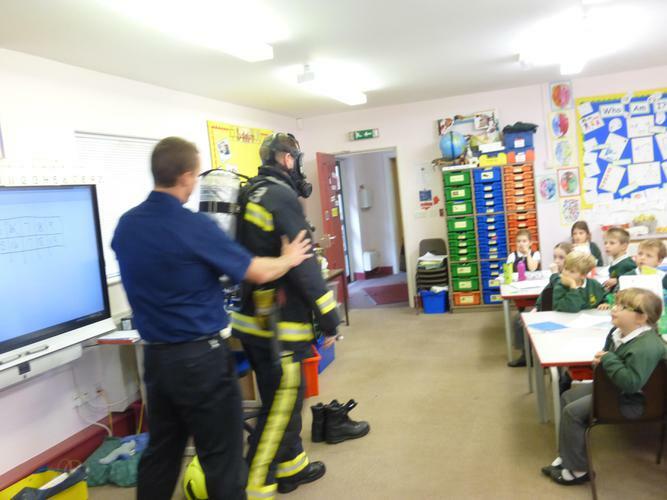 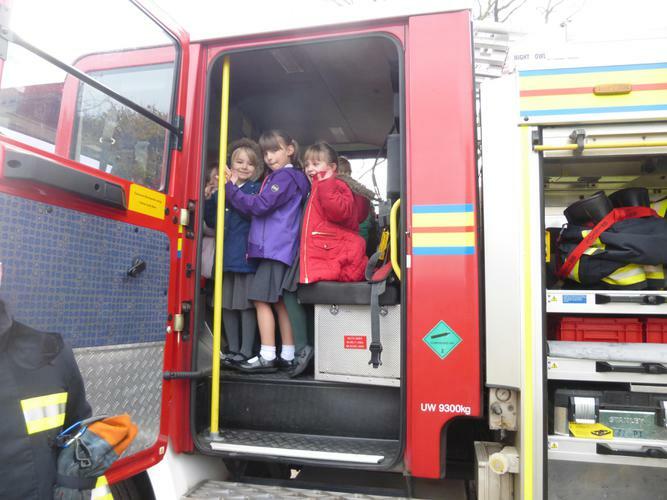 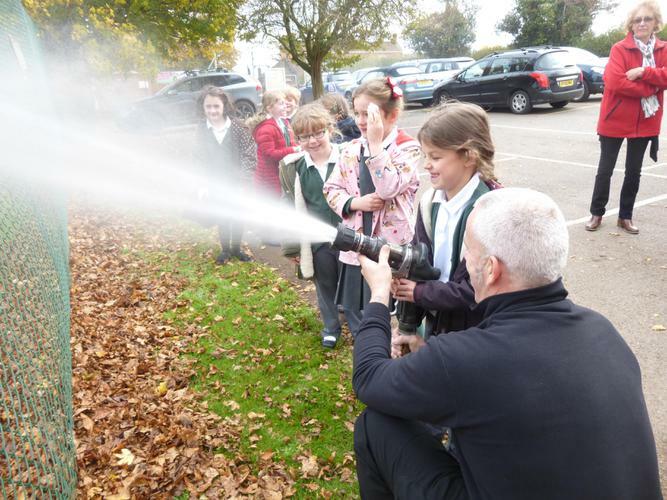 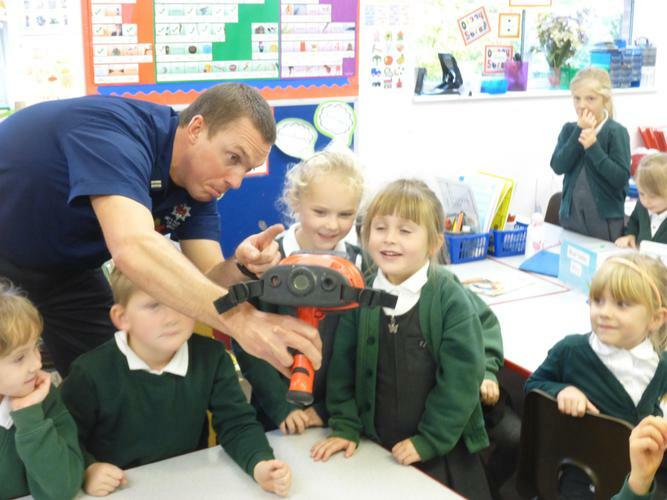 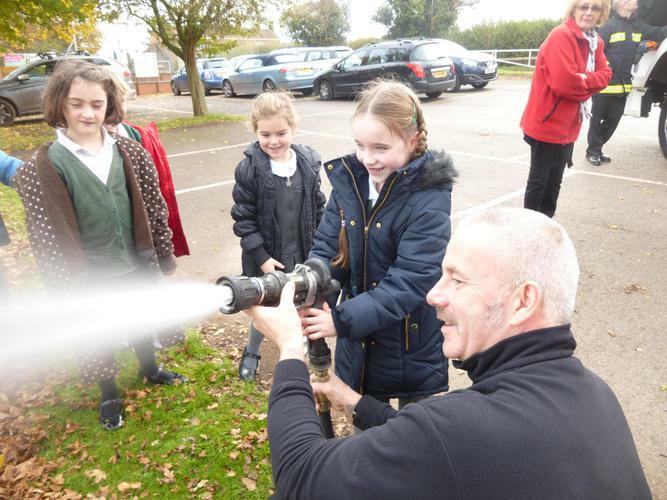 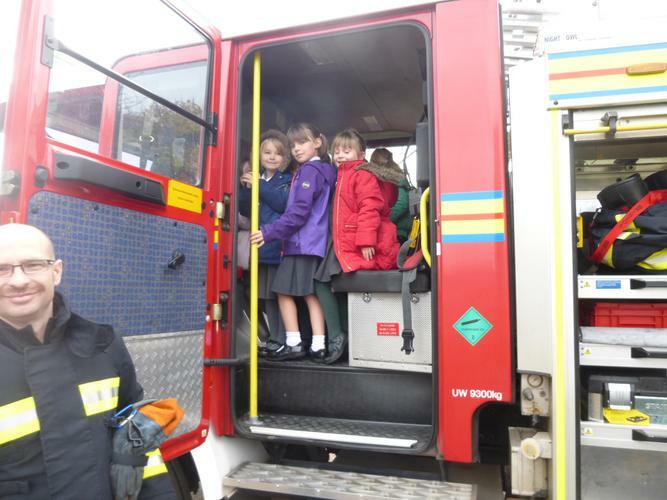 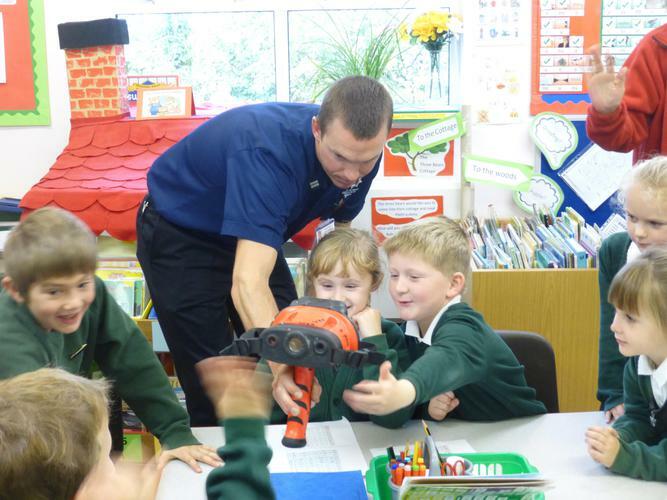 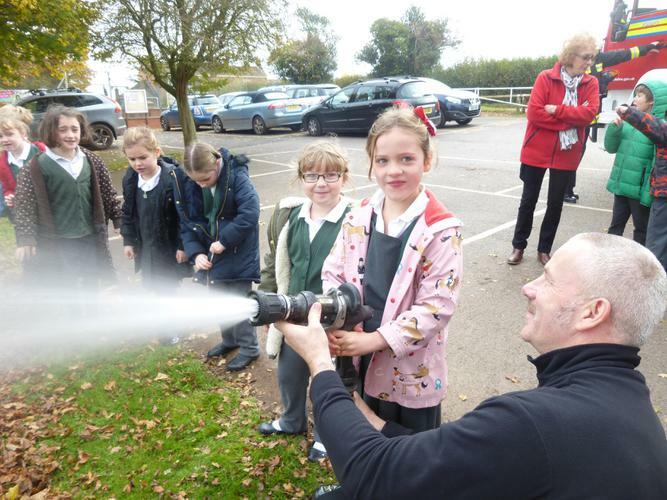 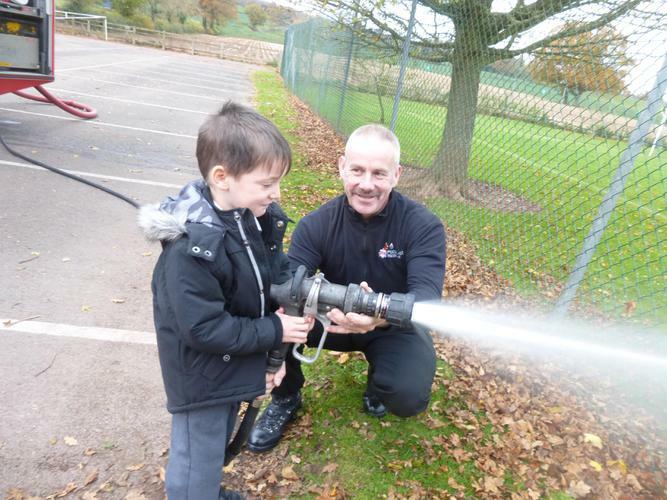 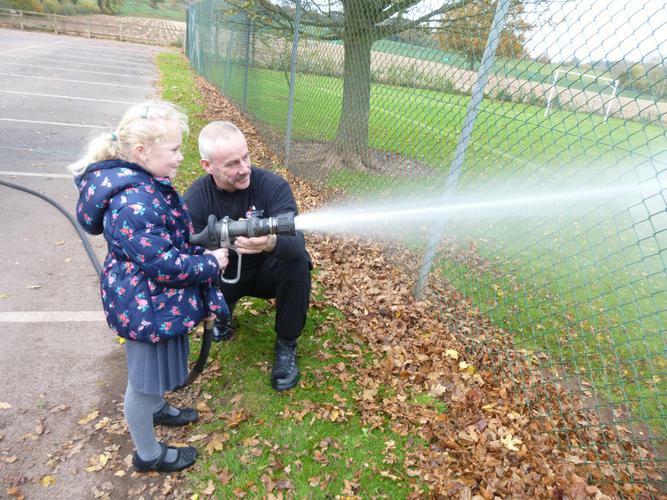 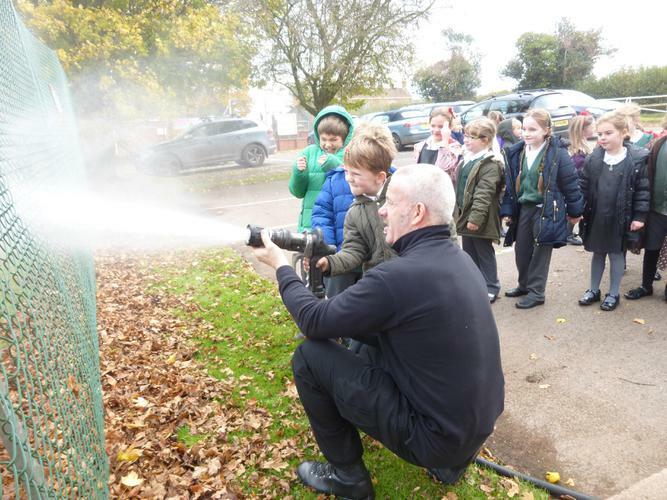 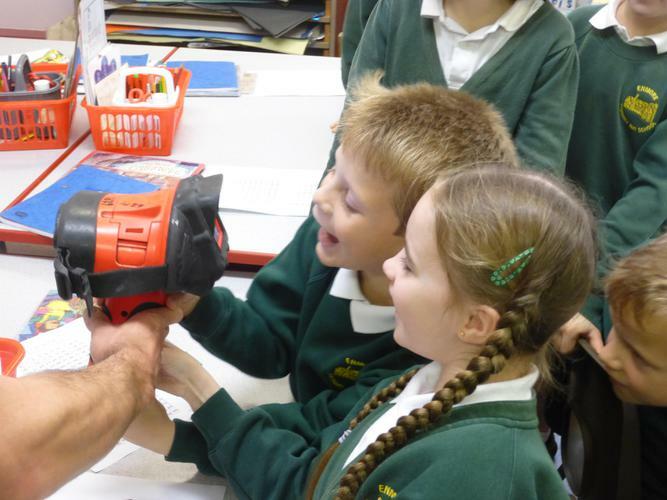 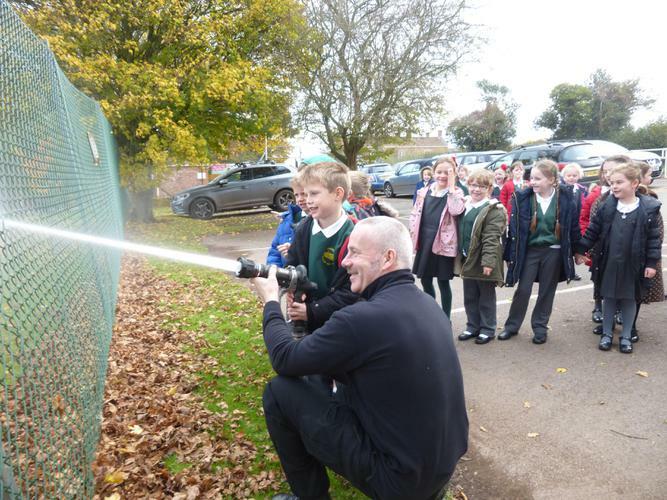 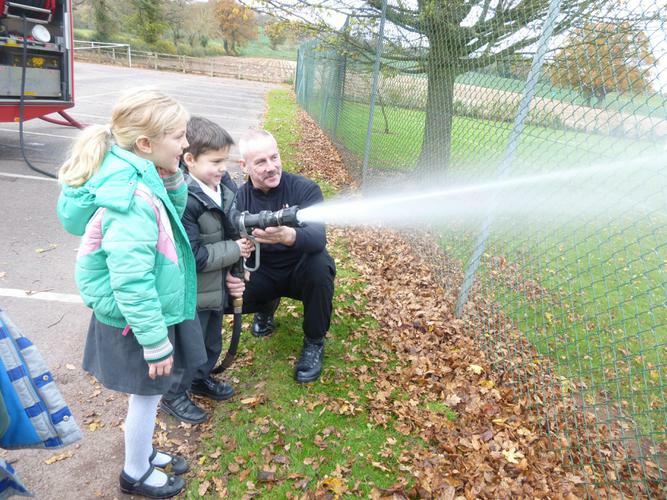 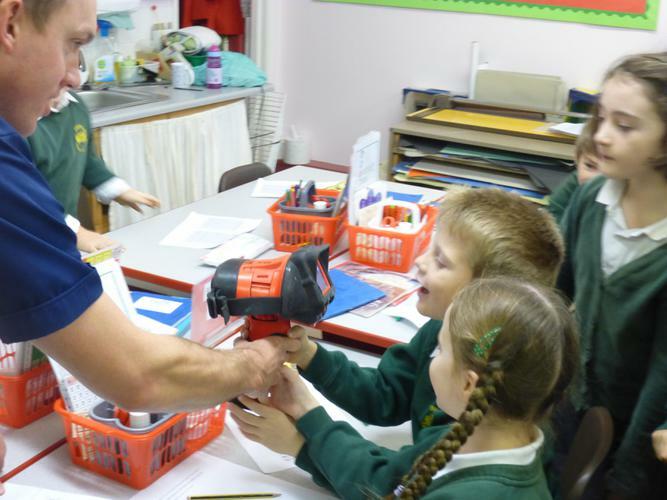 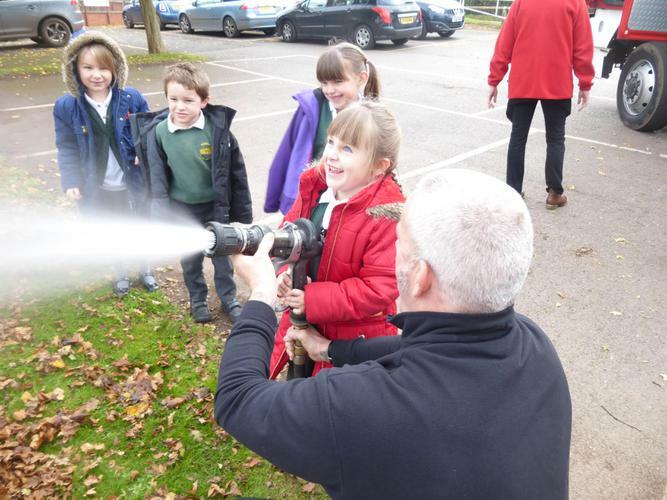 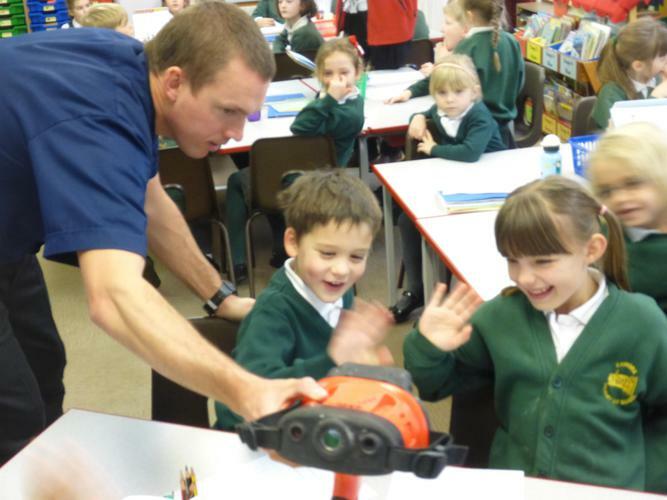 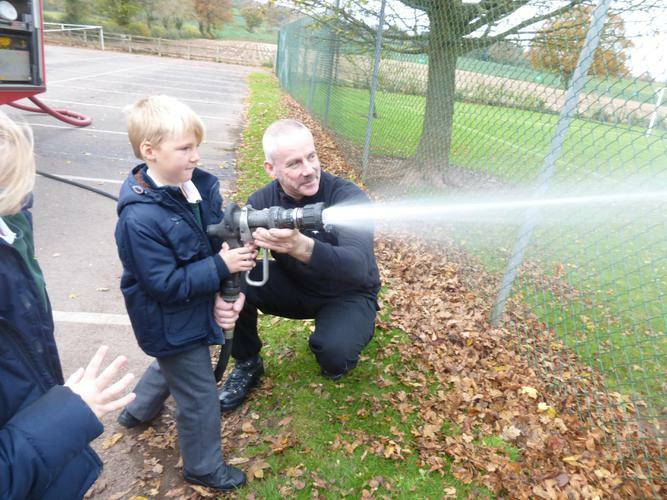 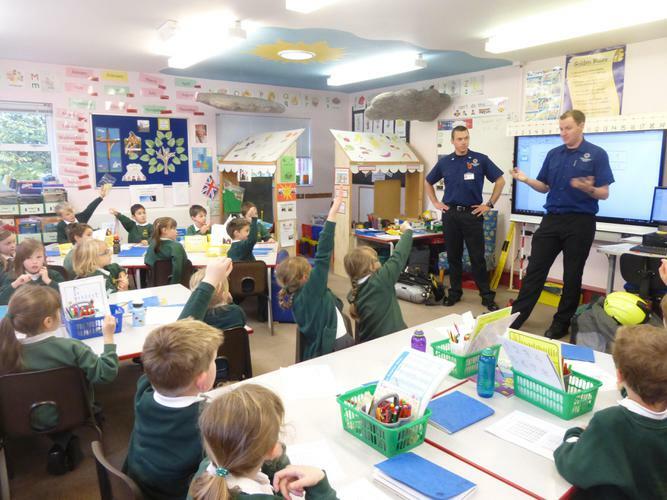 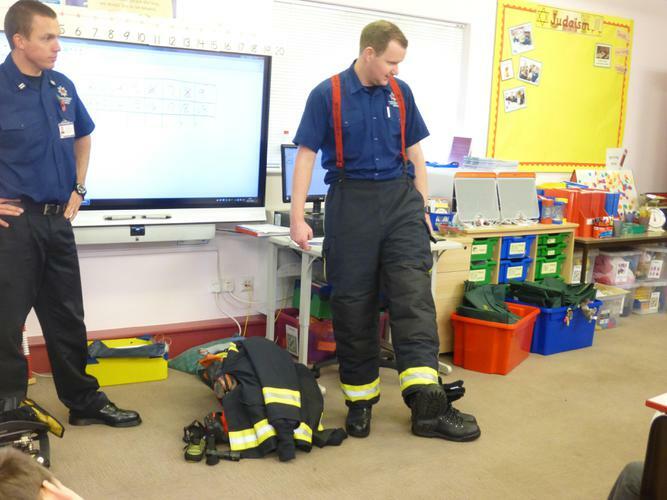 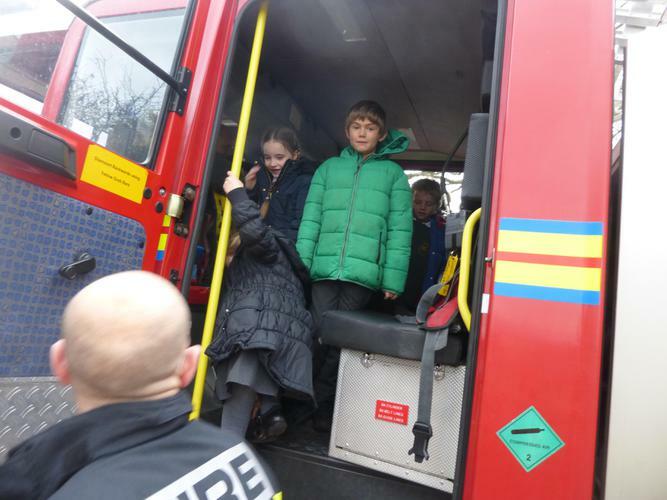 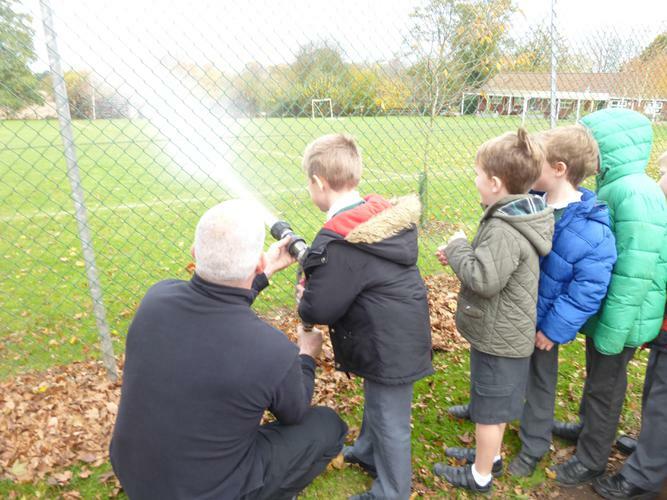 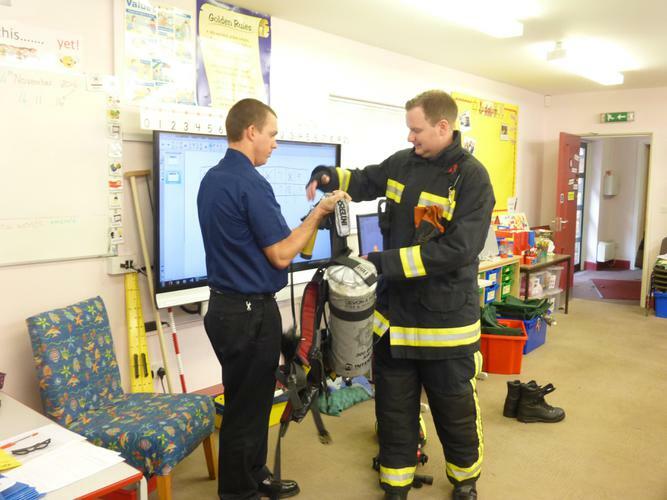 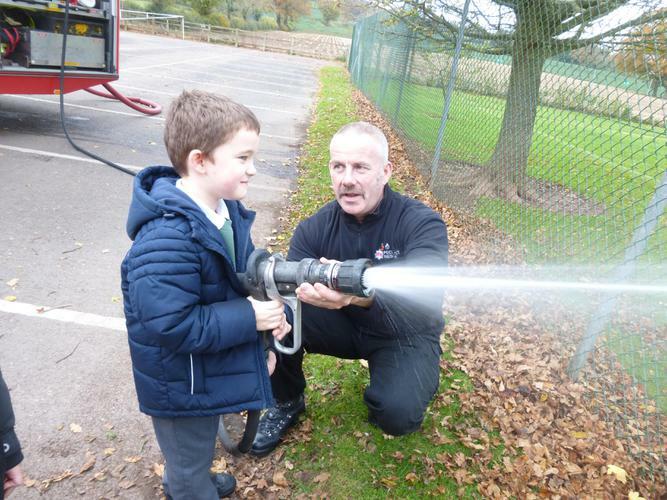 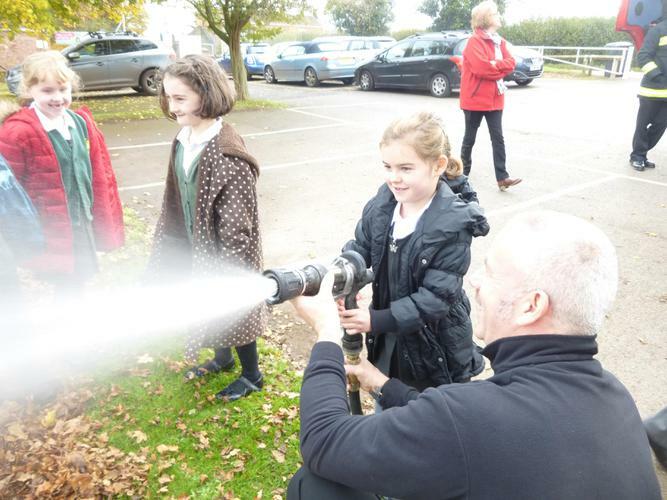 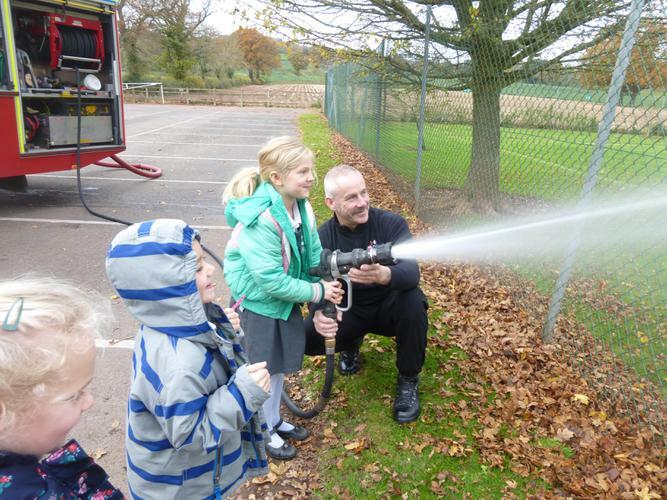 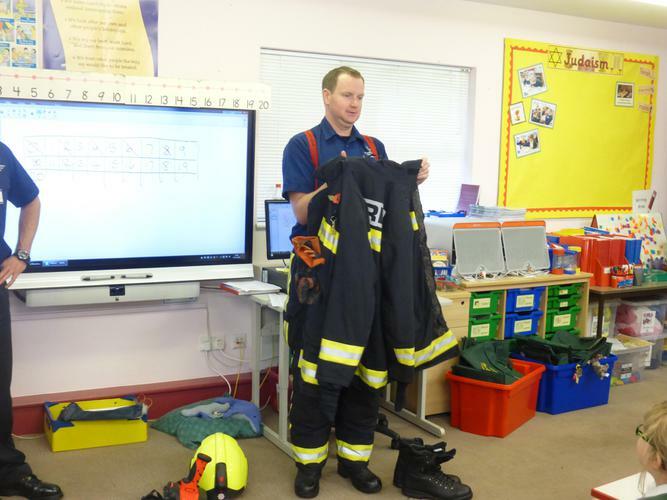 A visit from the Fire Service. 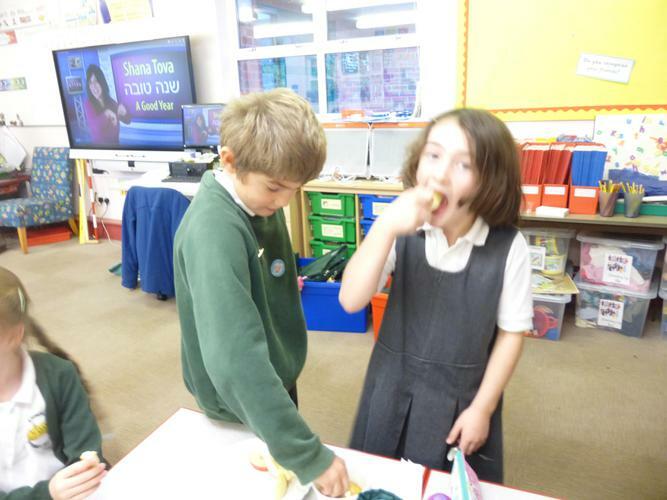 Rosh Hashanah - Jewish New Year. 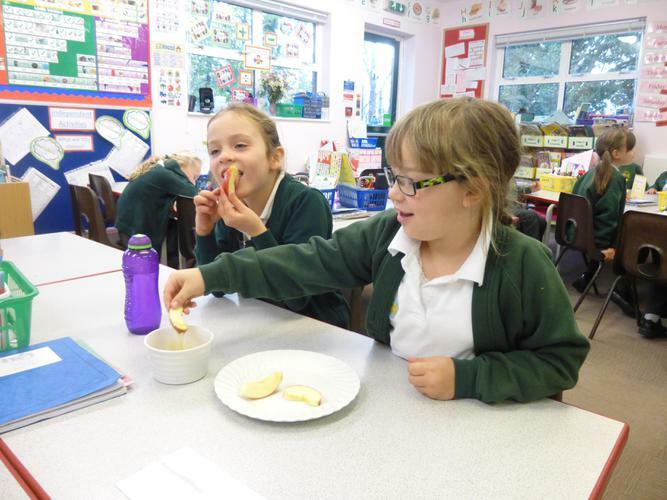 Celebrating with apple and honey! 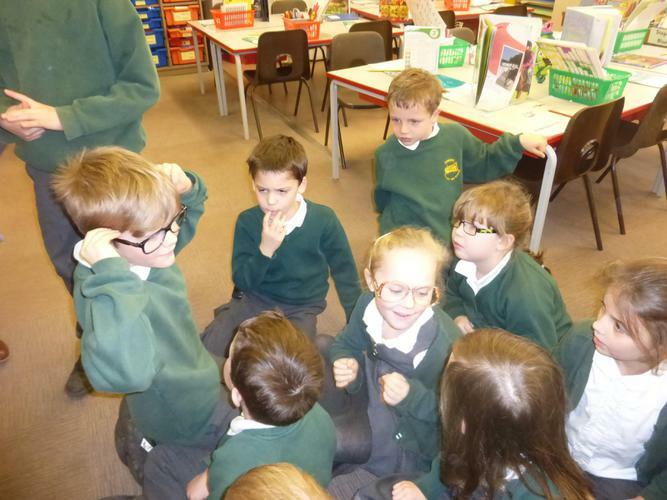 Our topic for the second half of the Autumn term is "The Stories People Tell." 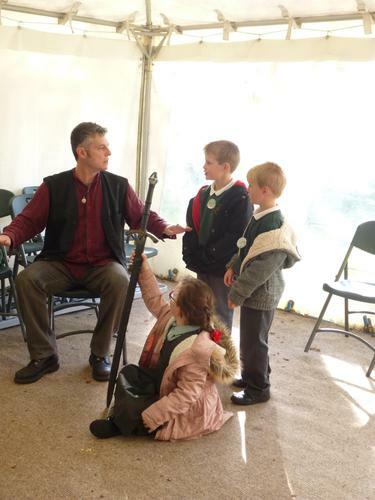 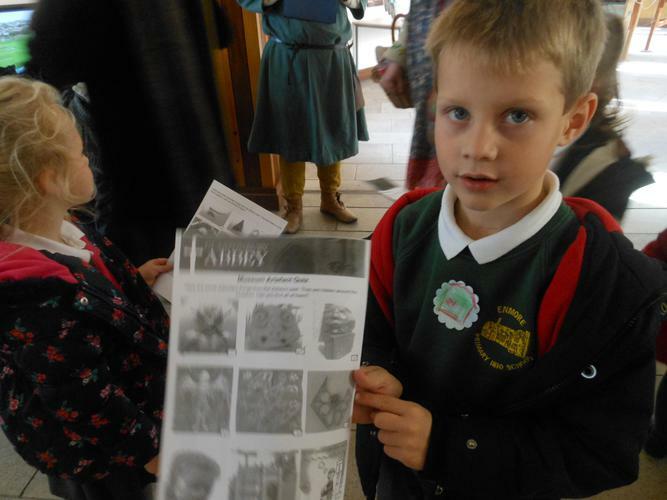 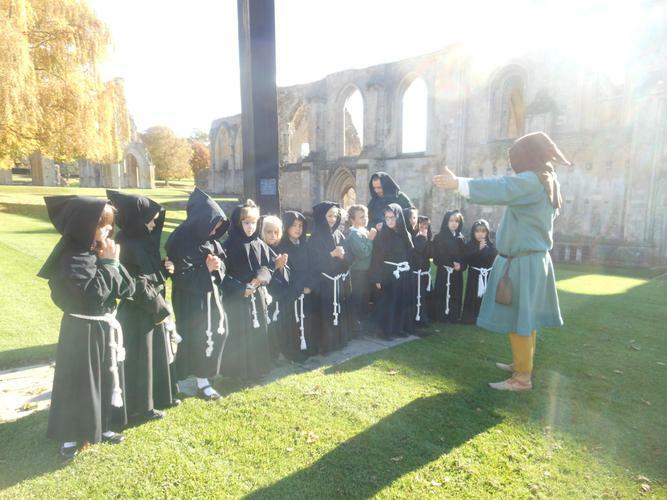 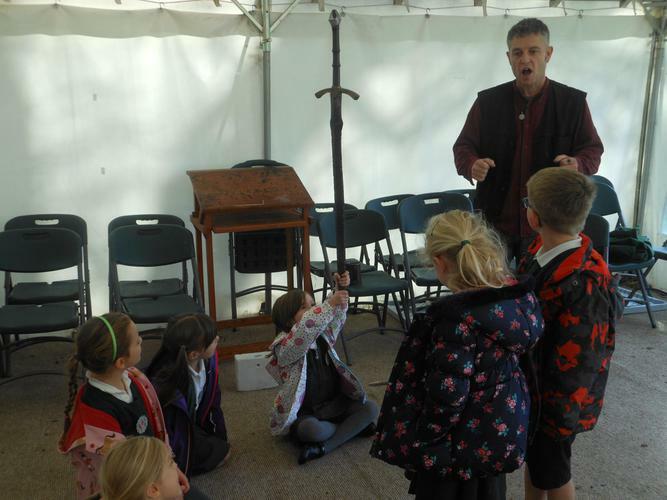 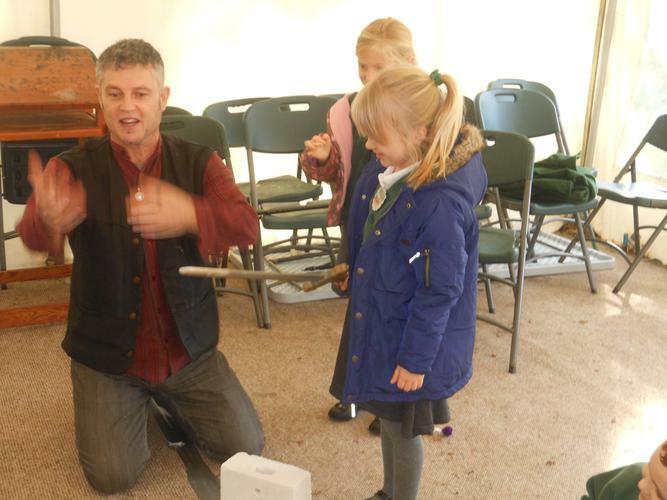 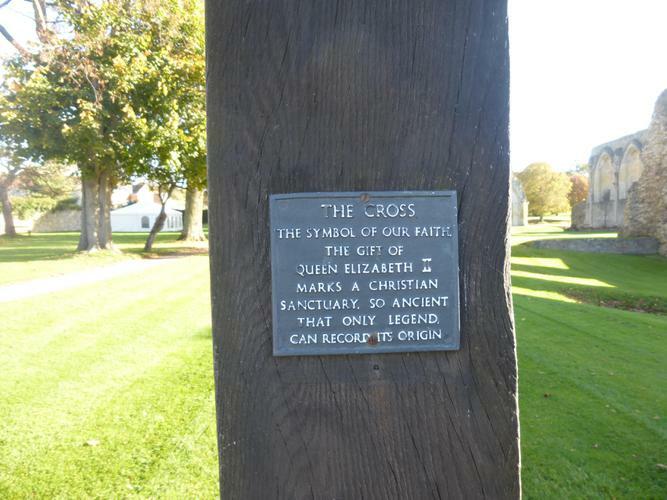 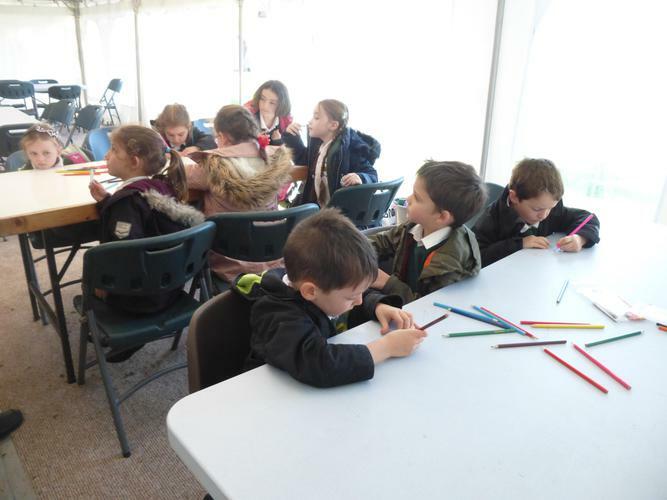 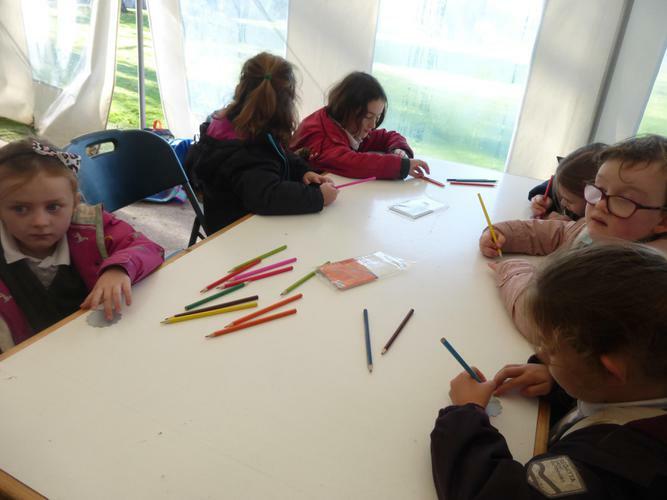 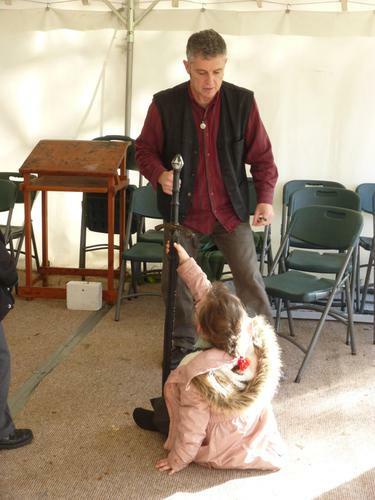 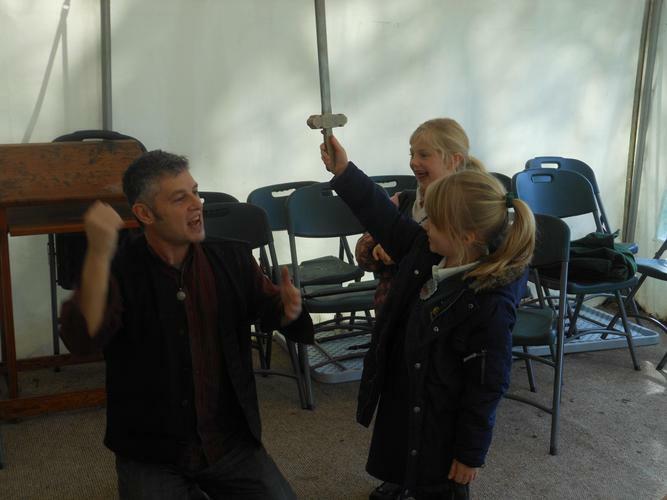 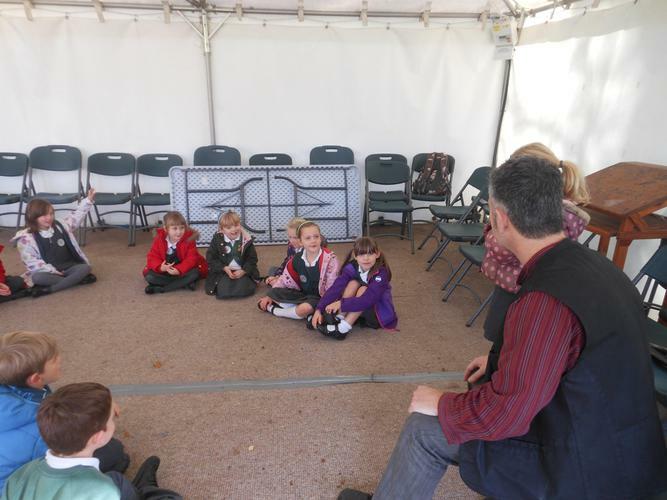 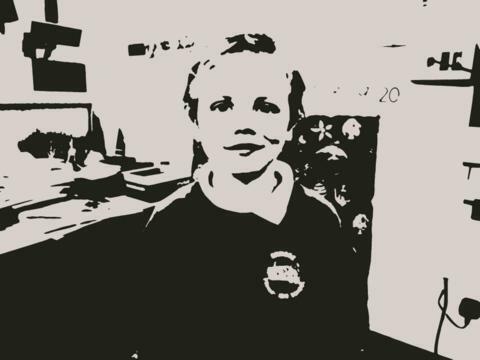 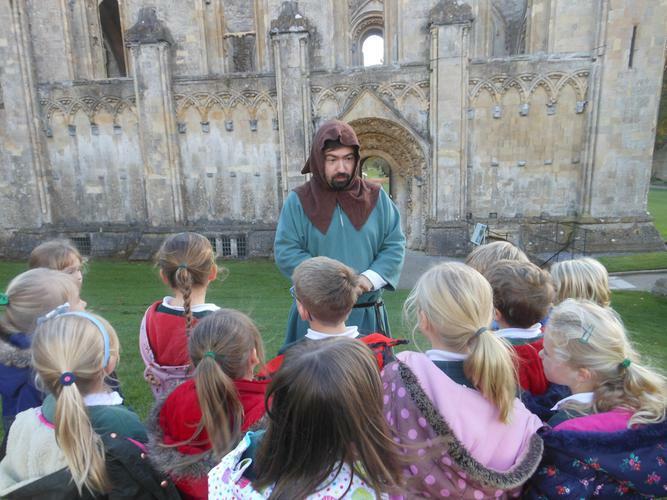 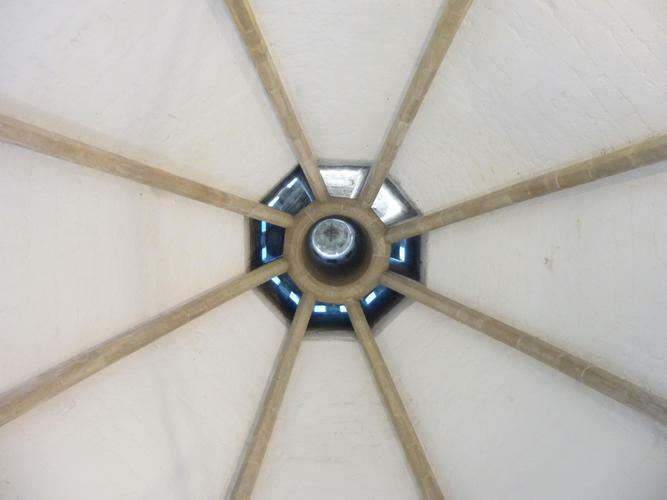 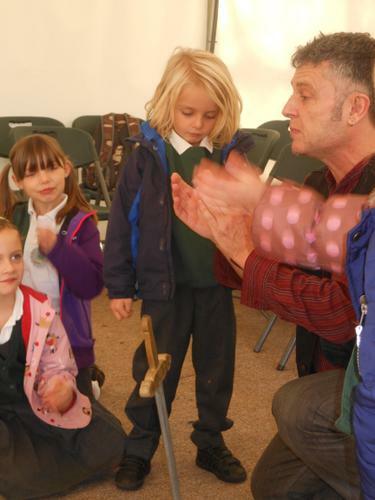 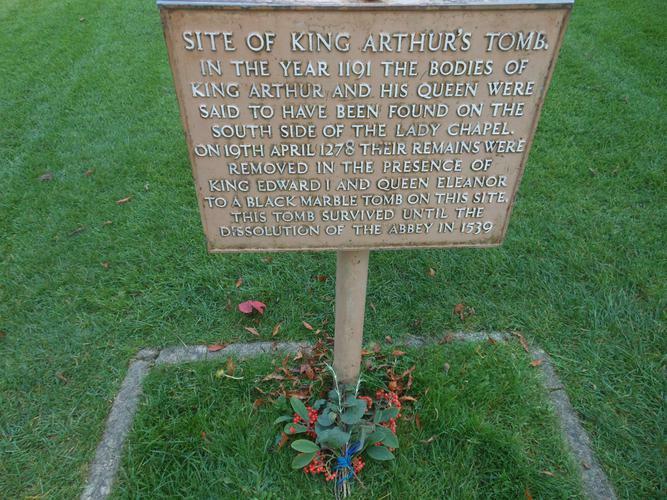 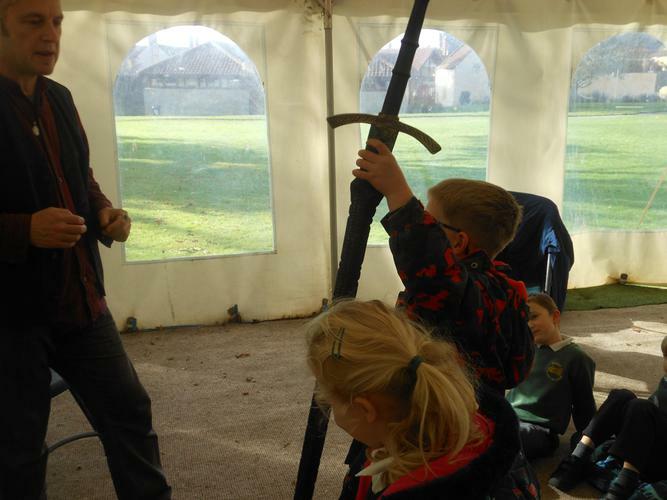 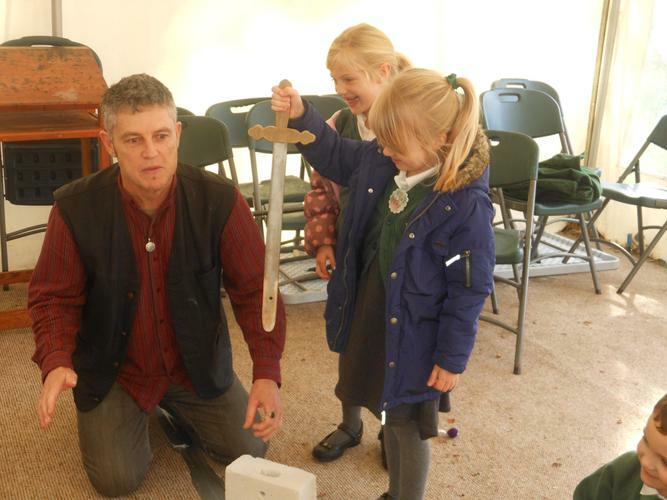 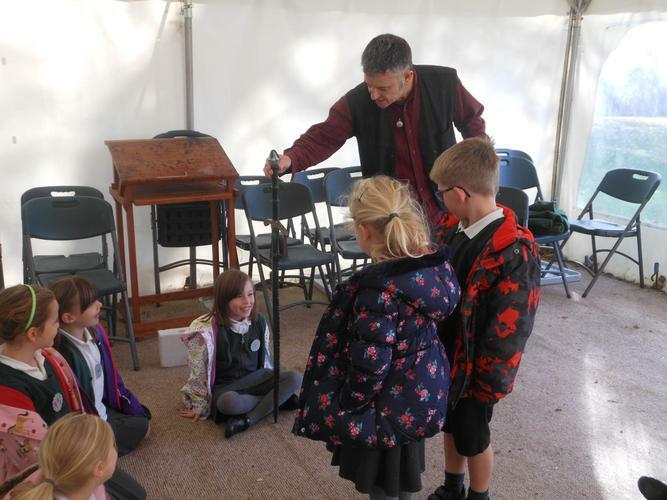 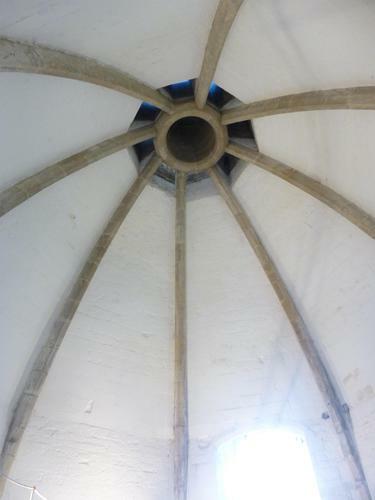 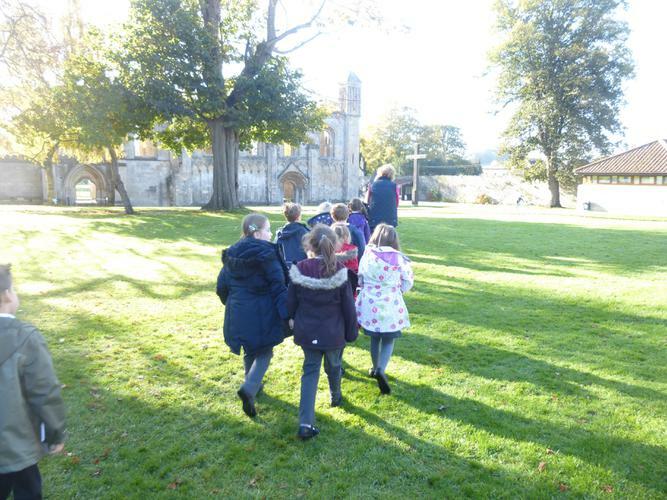 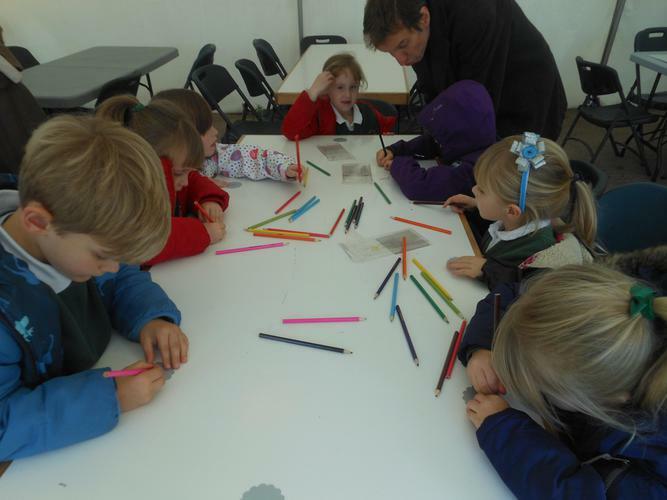 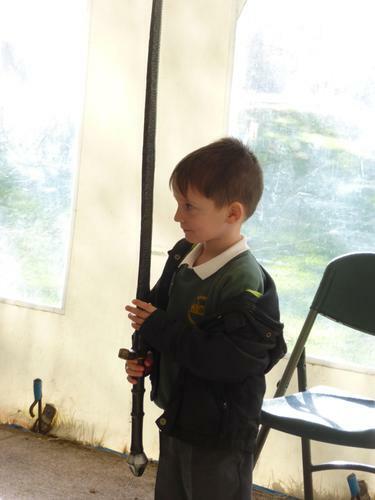 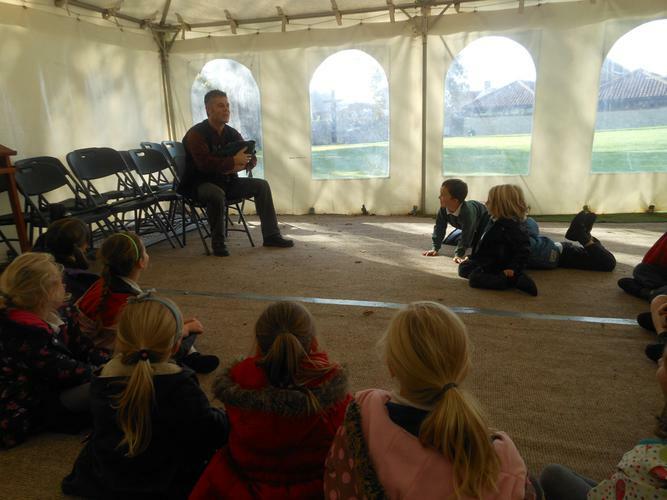 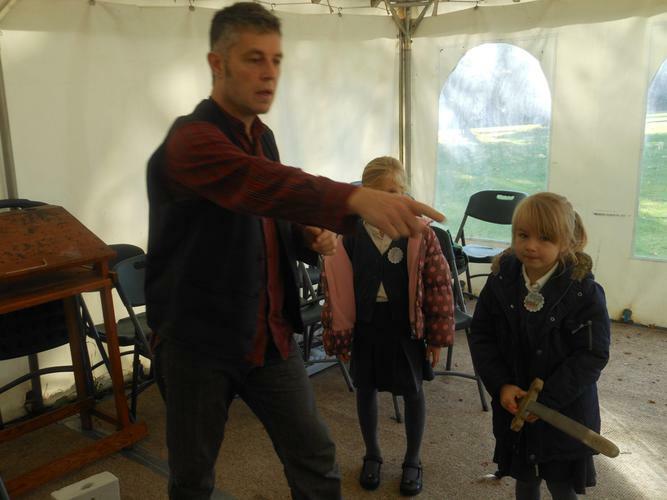 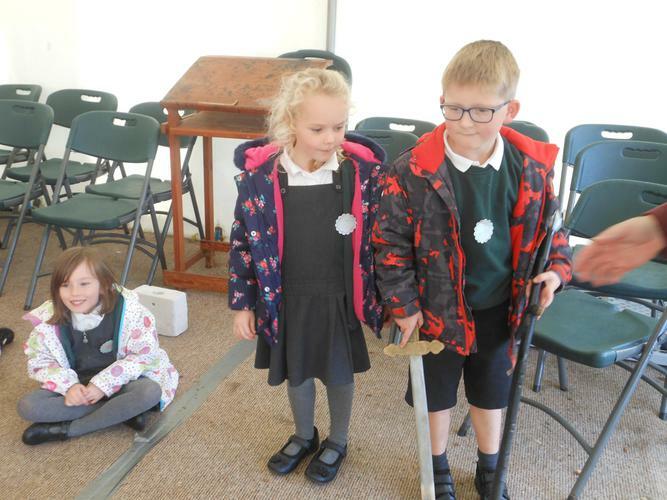 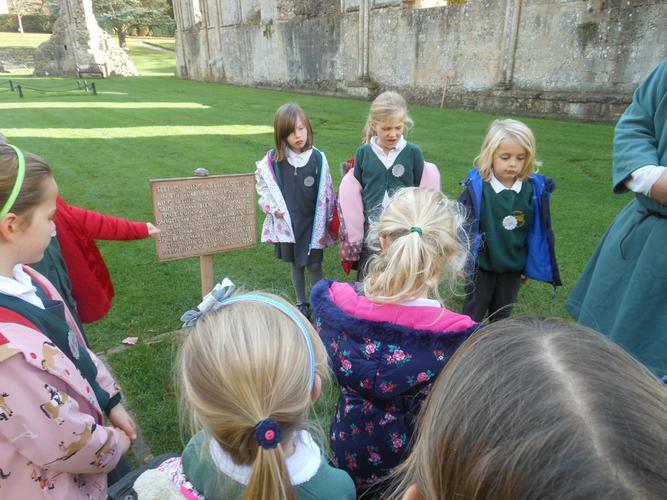 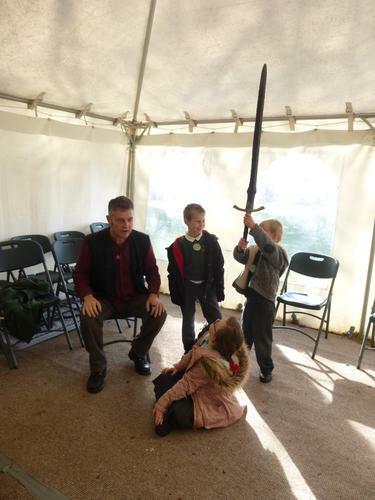 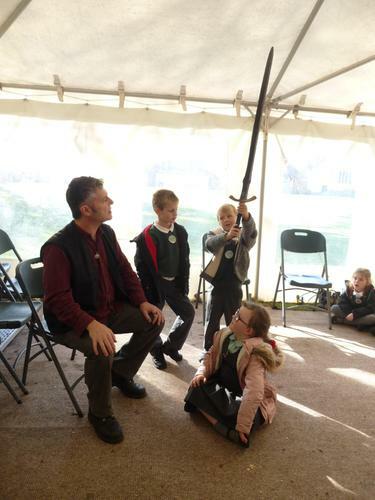 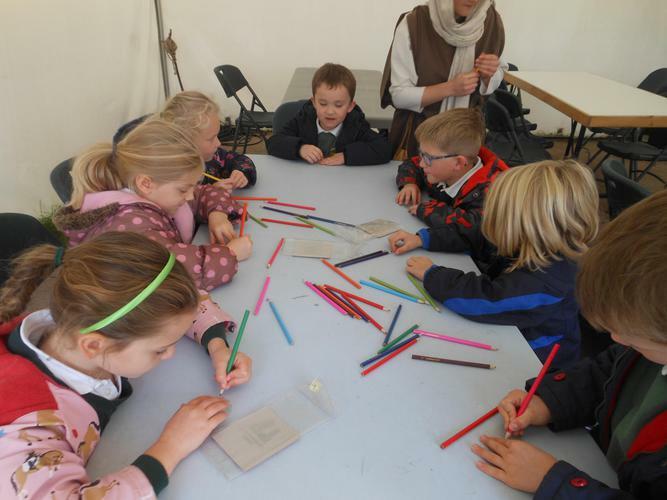 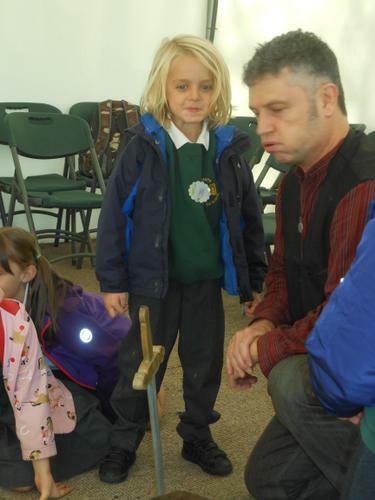 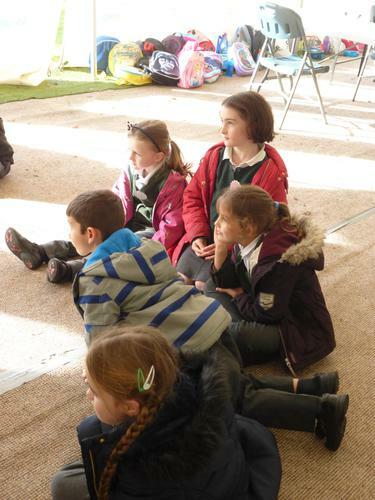 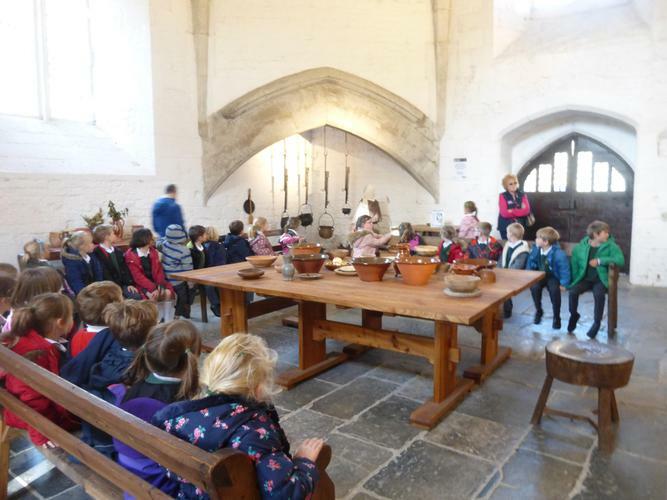 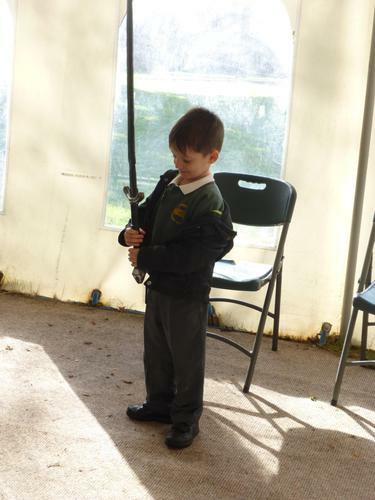 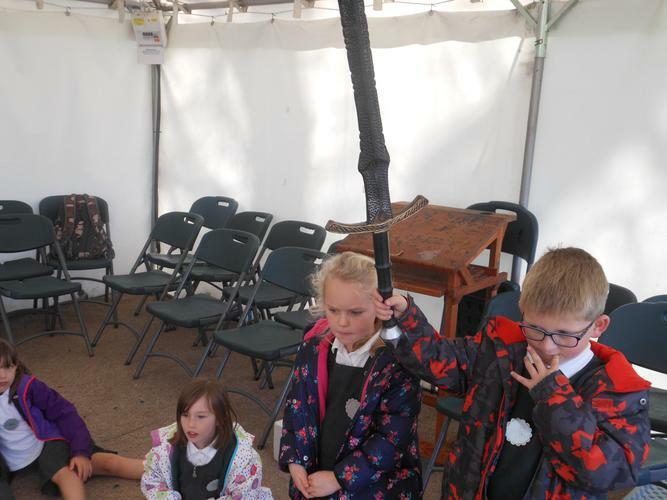 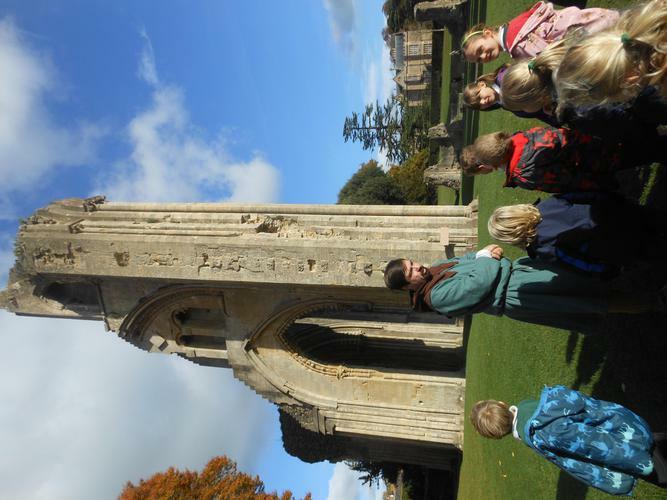 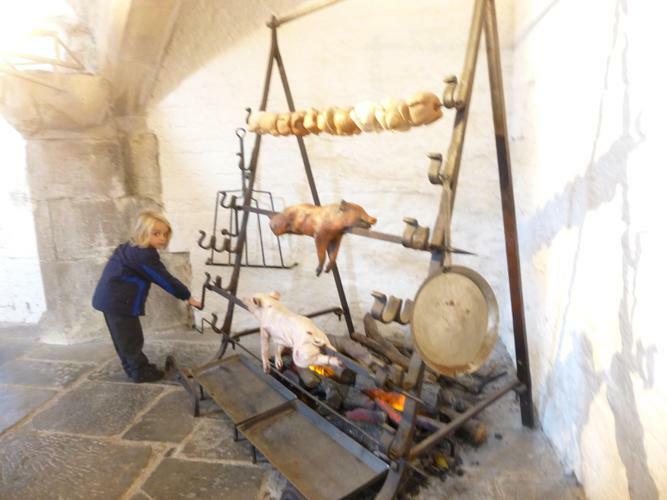 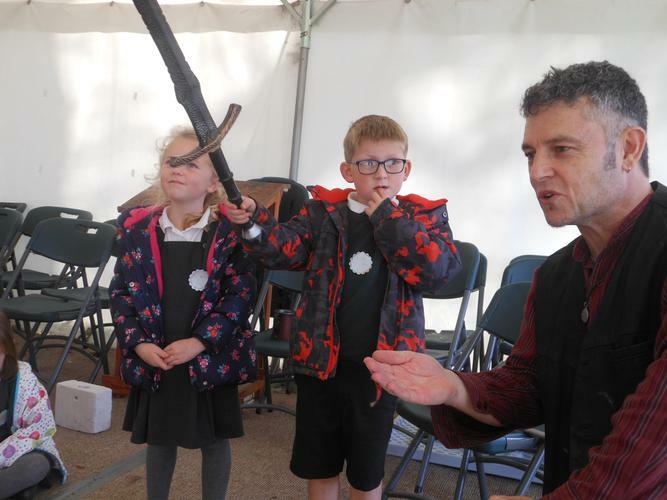 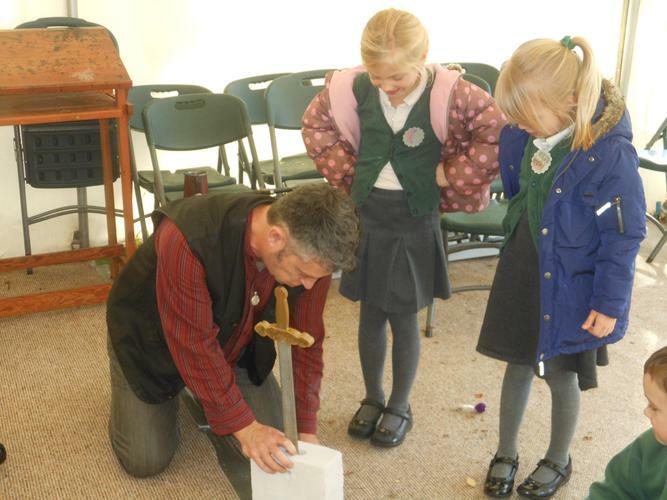 We went on a trip to Glastonbury Abbey to hear the Legend of King Arthur. 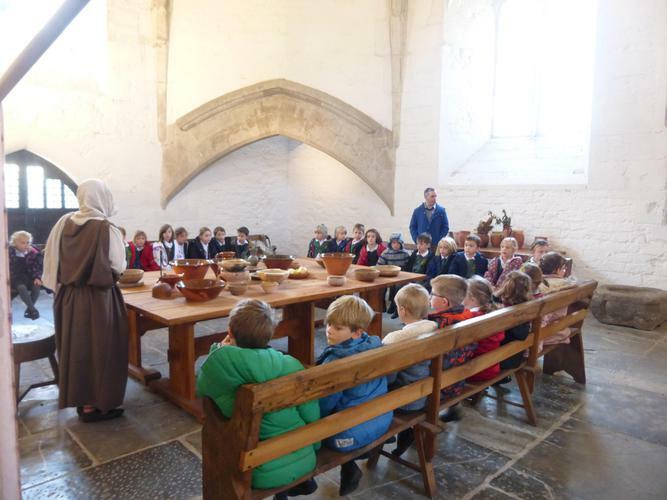 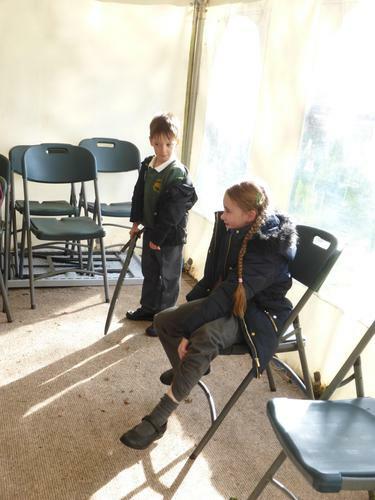 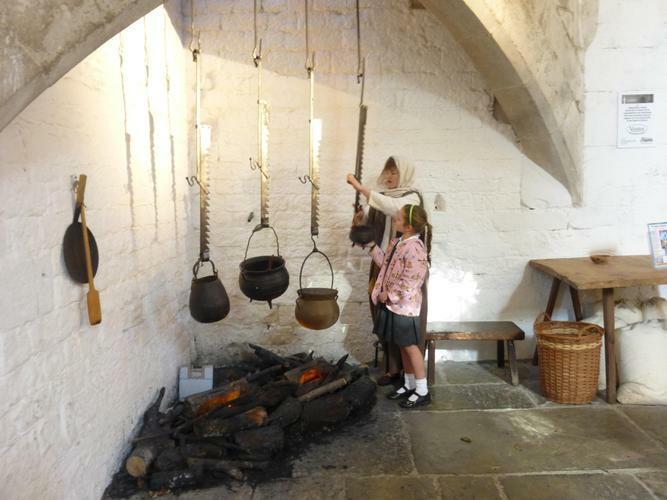 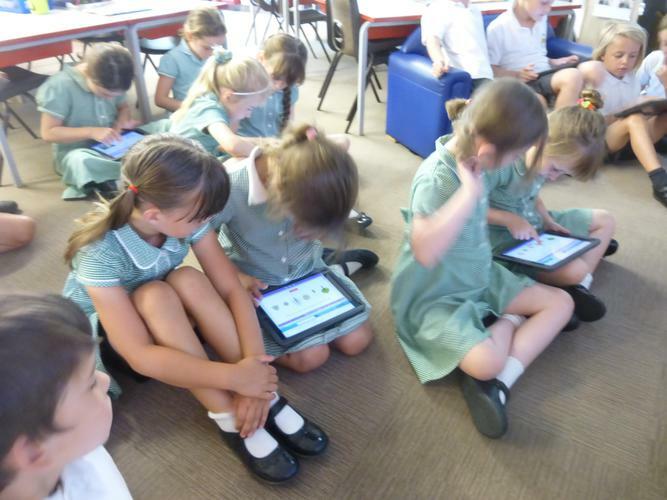 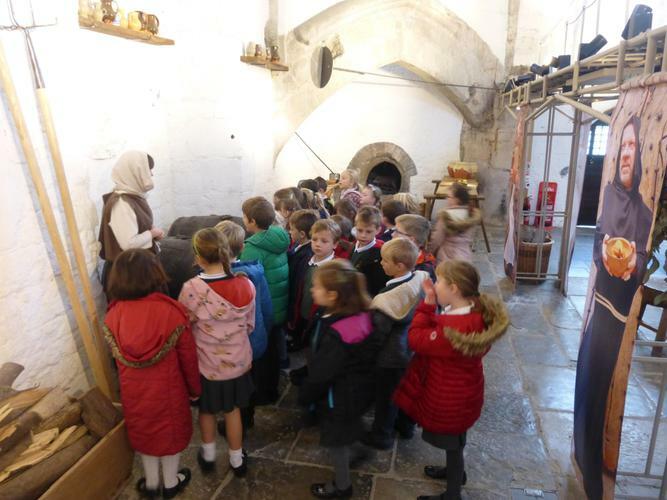 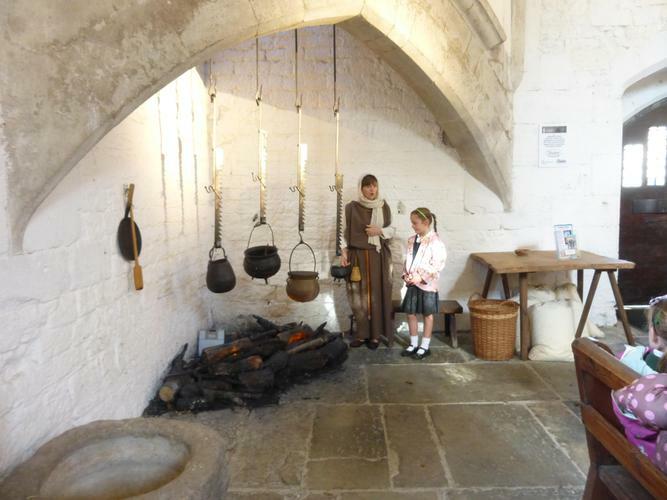 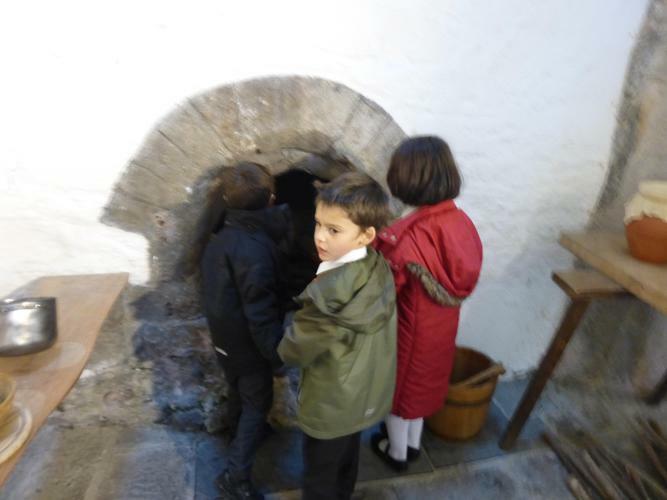 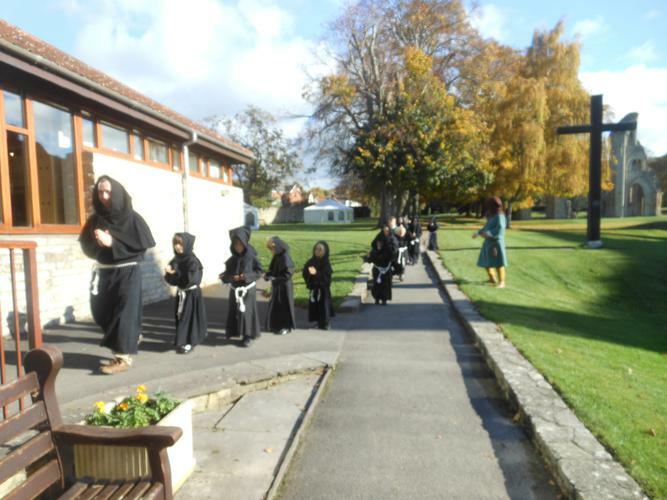 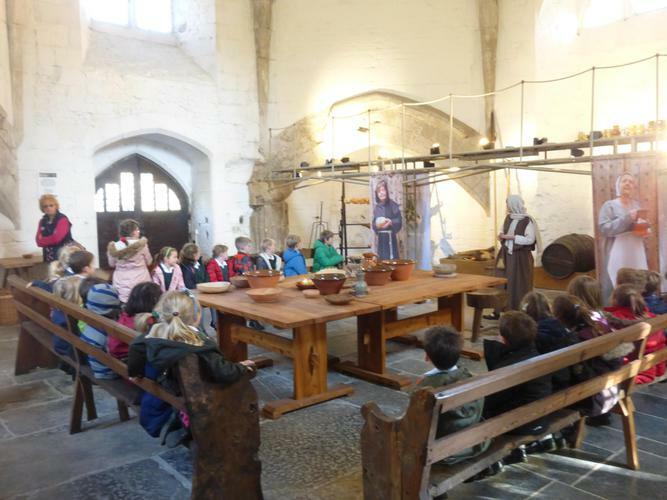 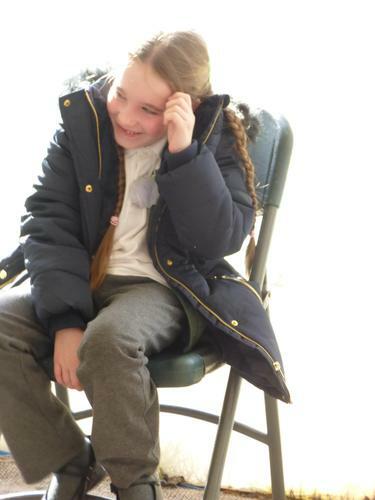 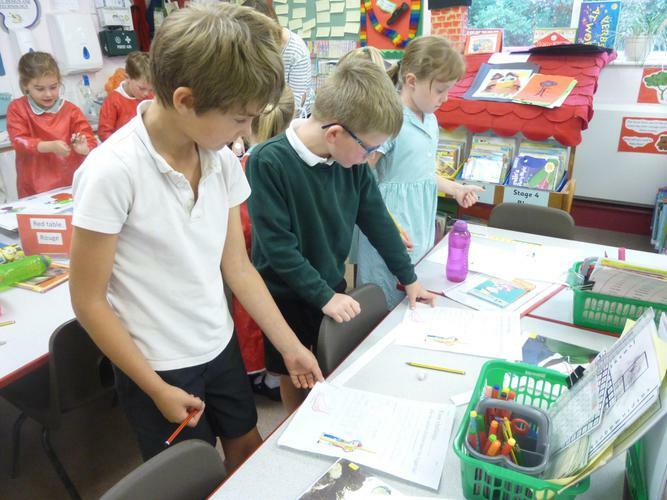 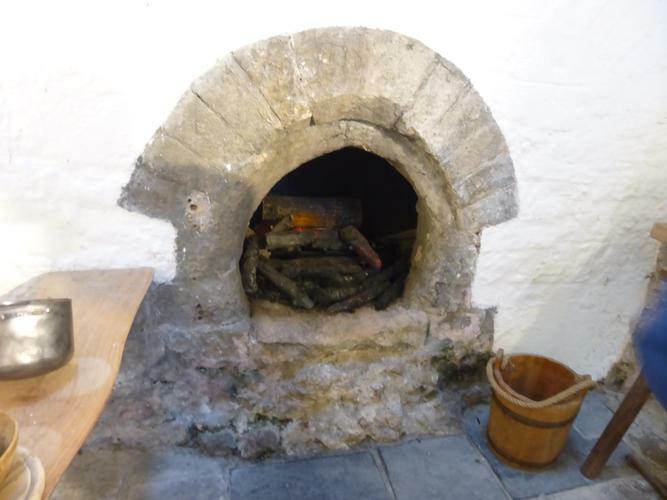 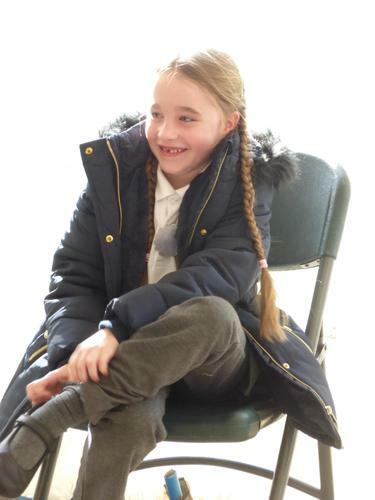 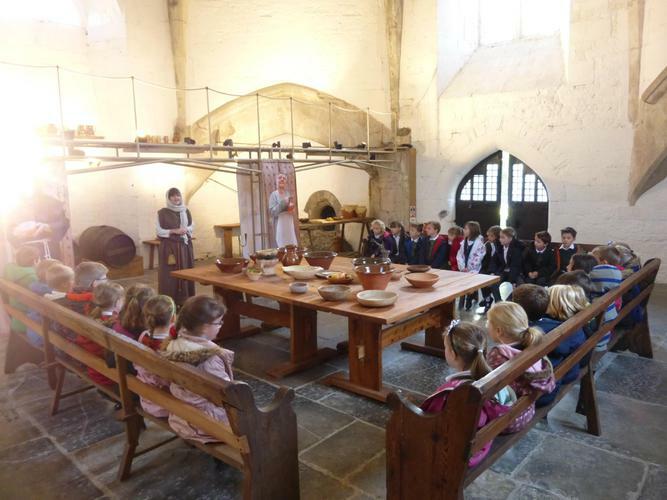 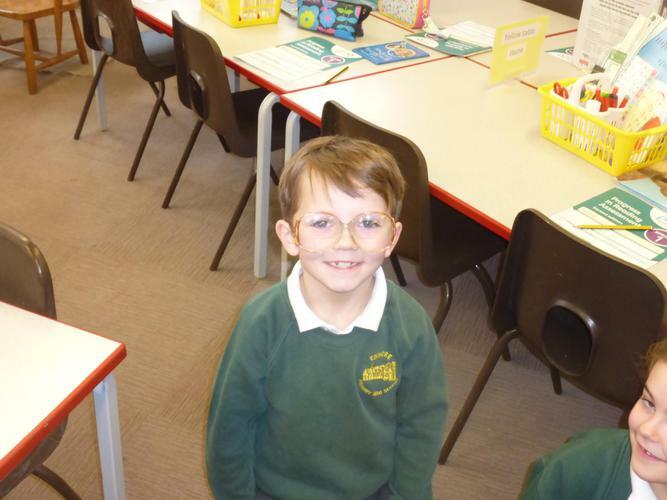 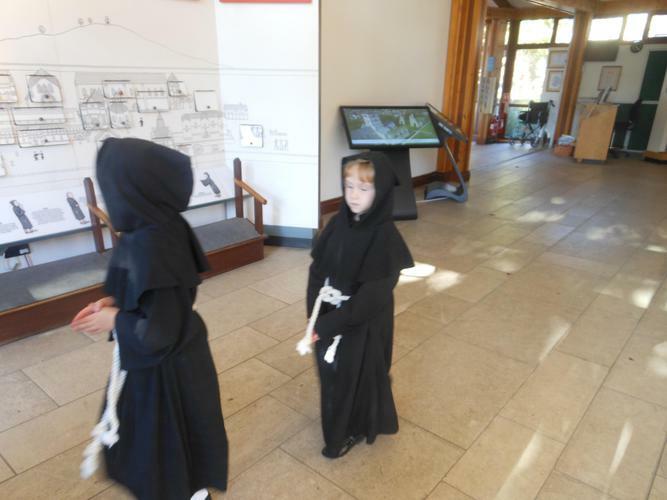 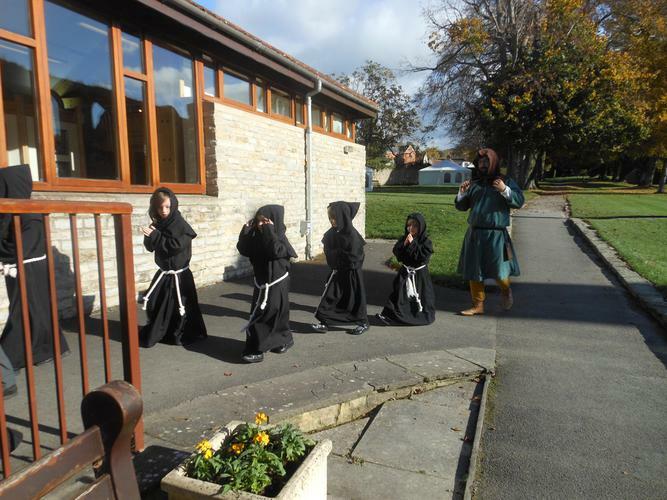 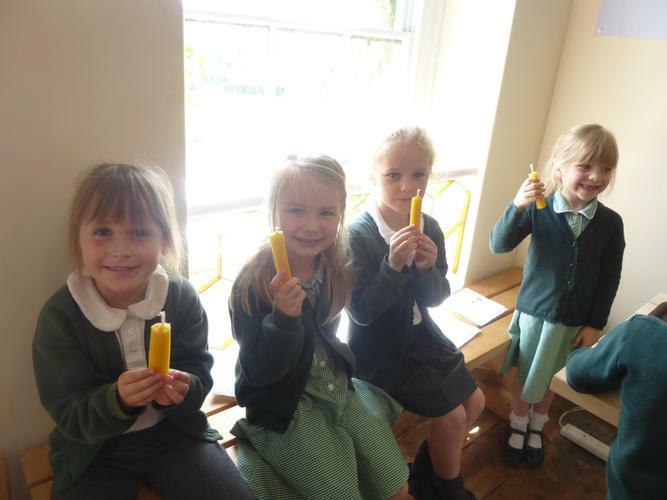 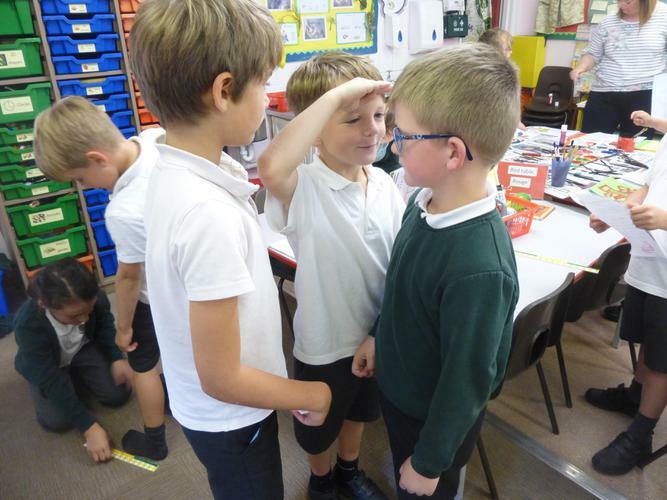 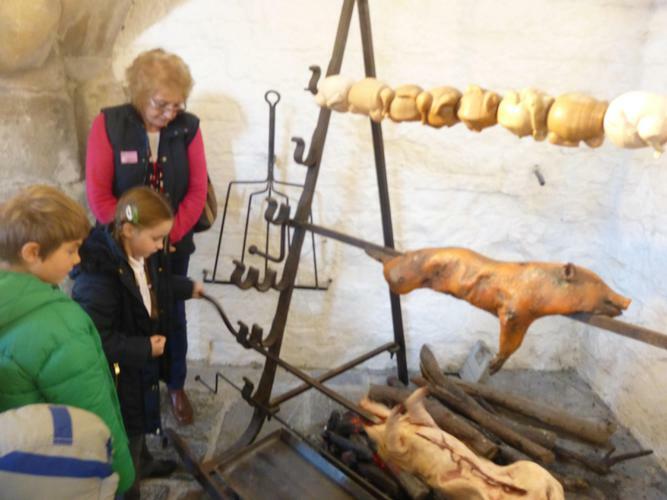 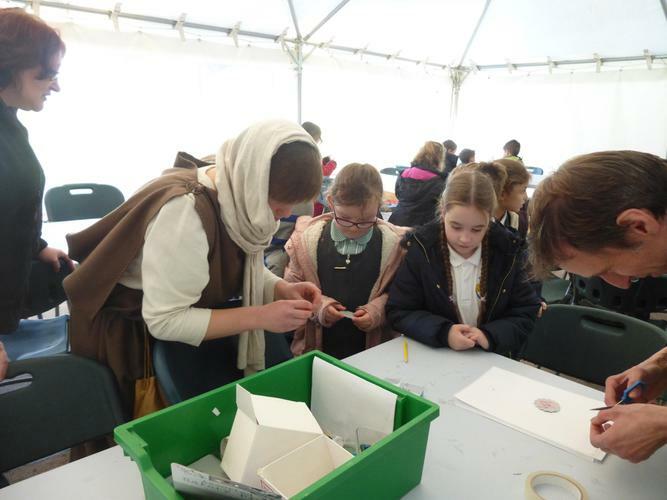 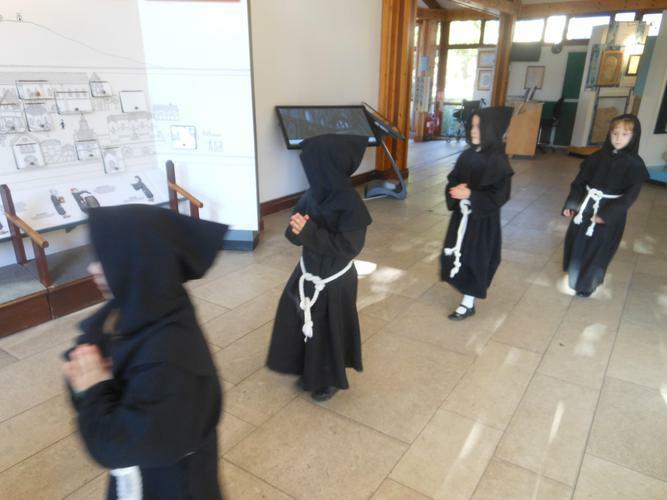 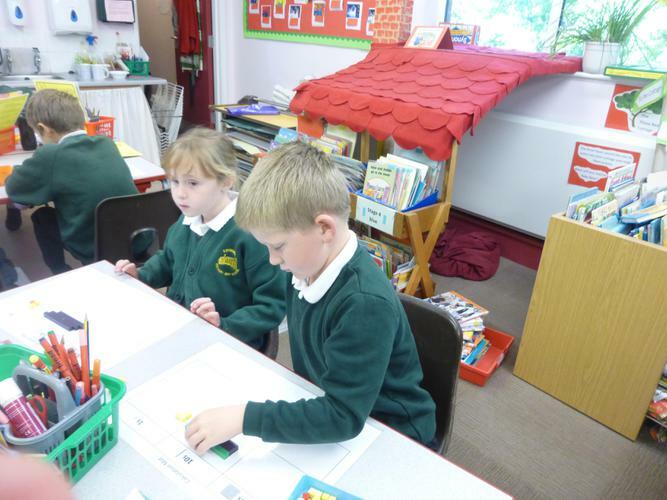 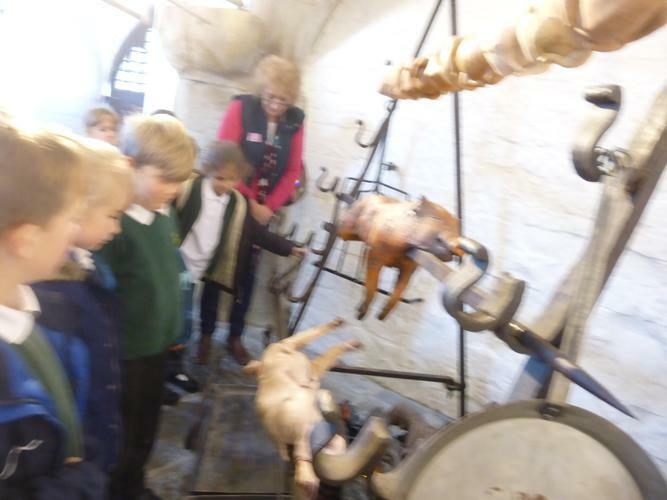 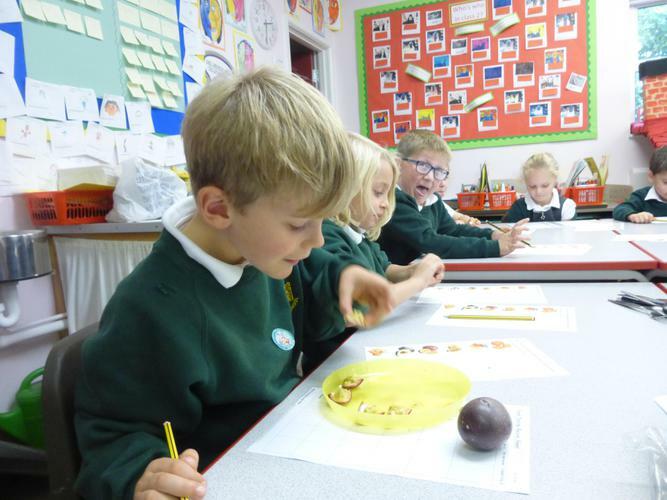 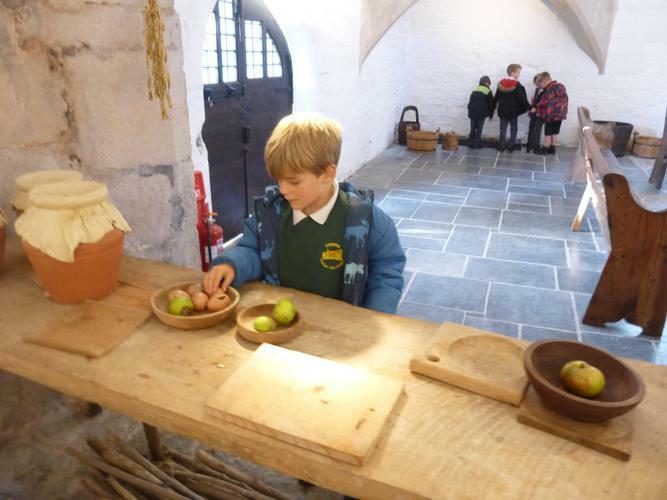 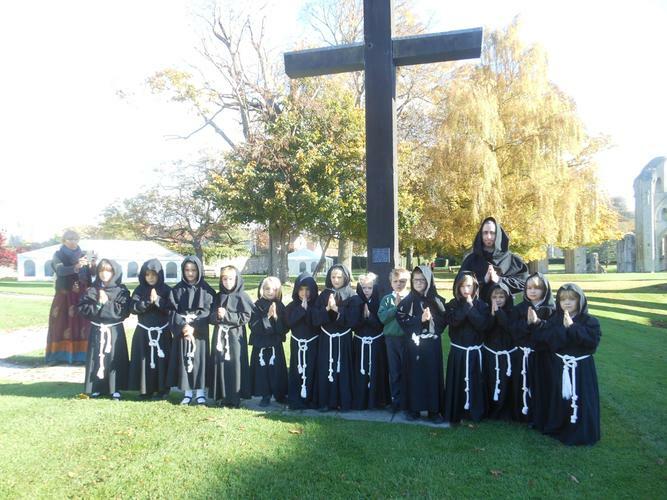 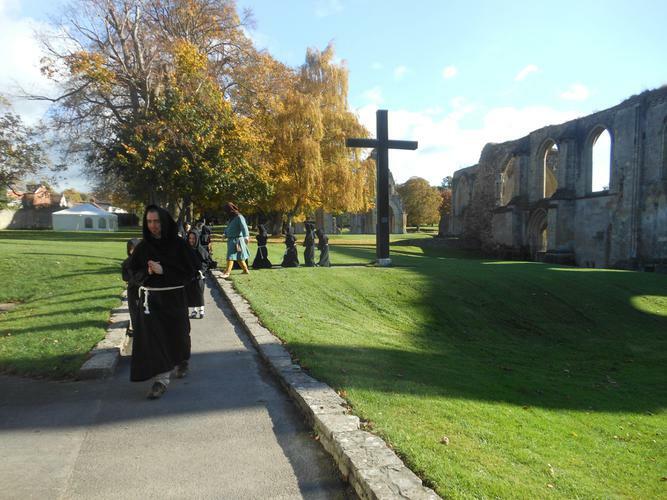 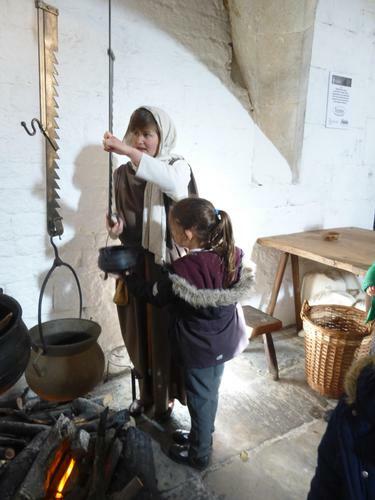 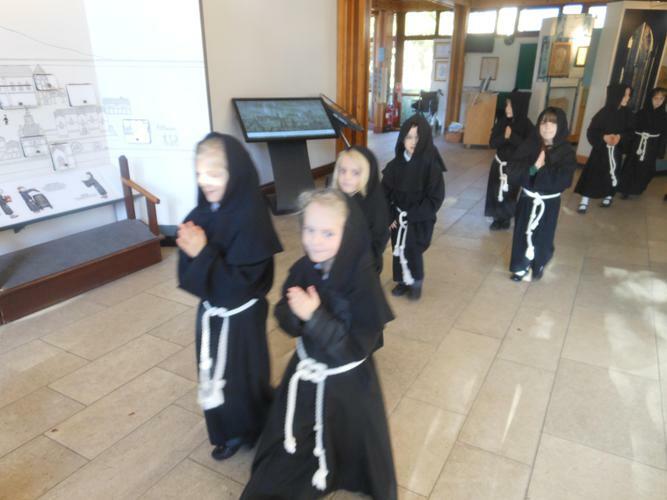 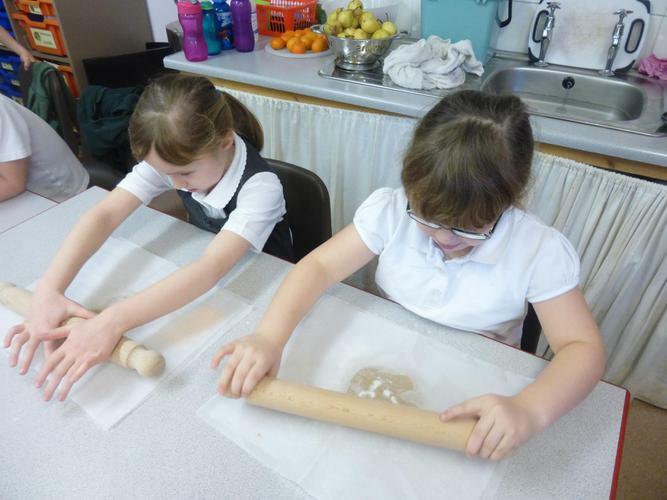 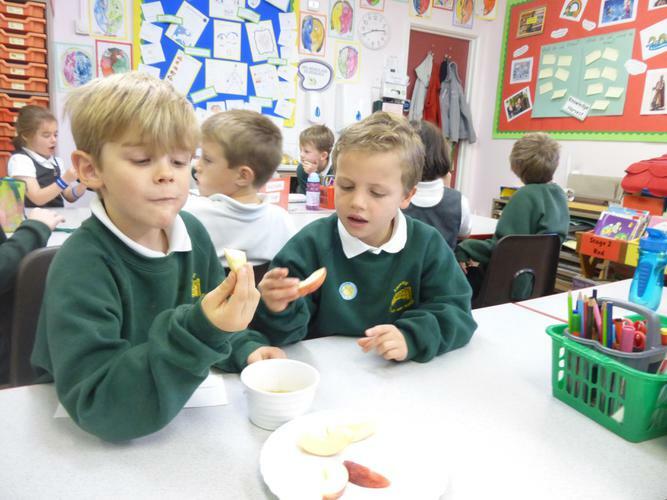 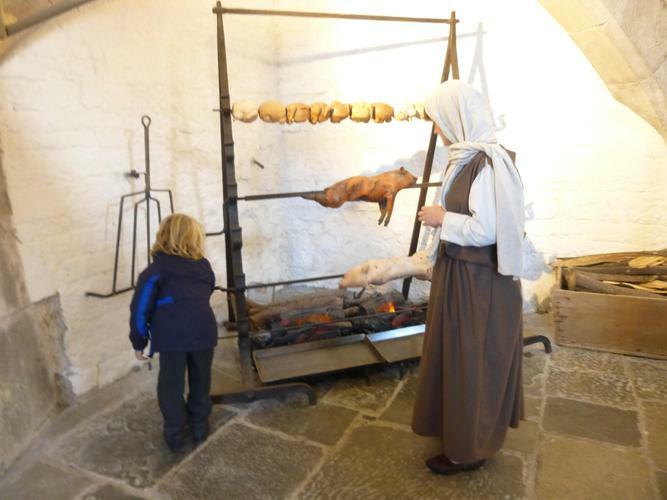 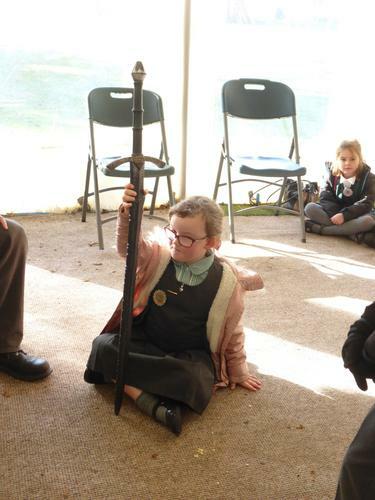 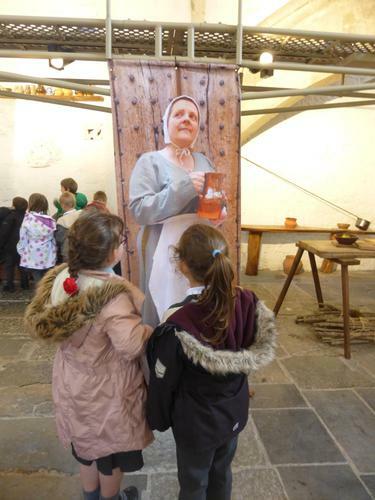 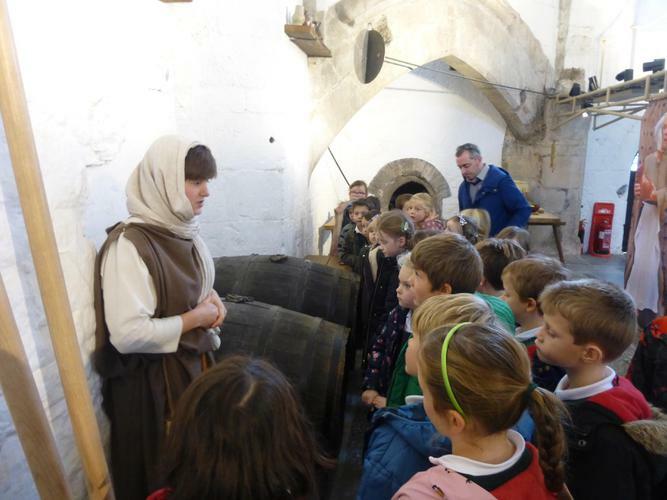 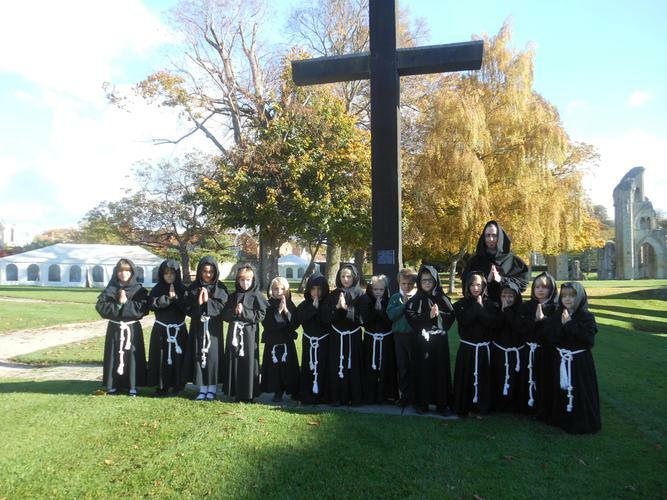 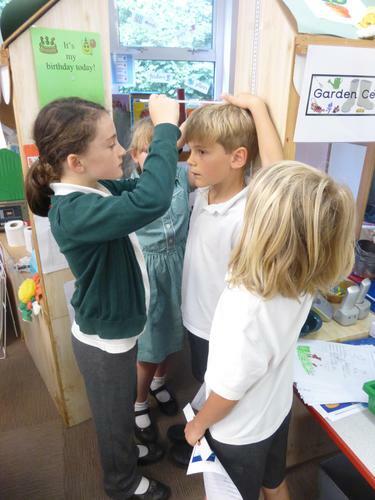 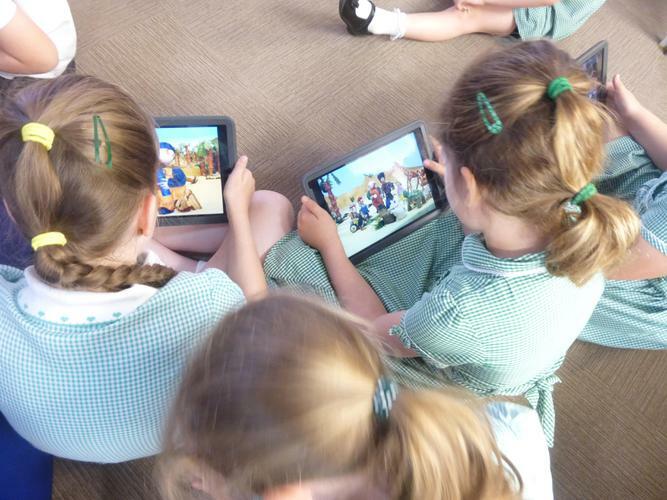 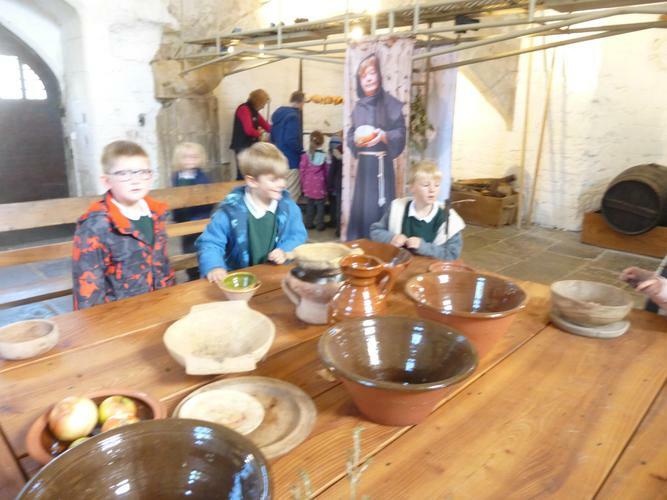 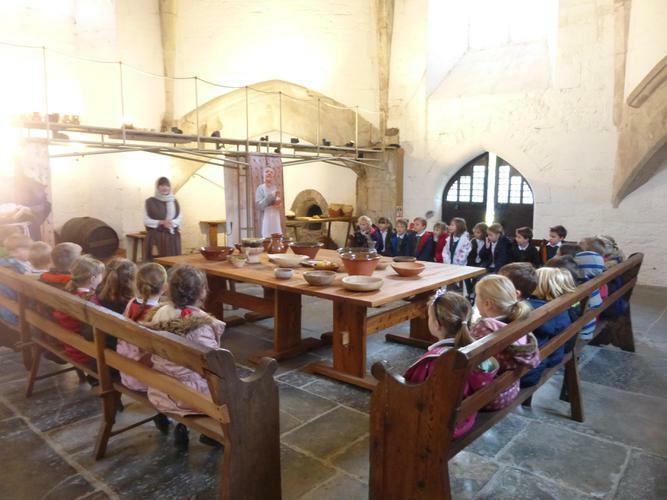 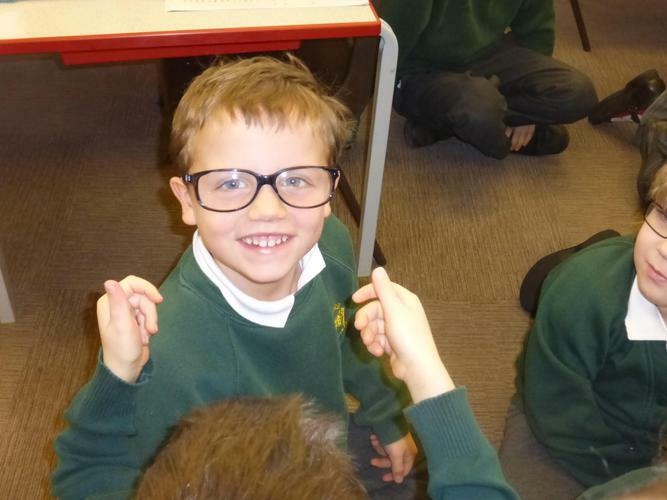 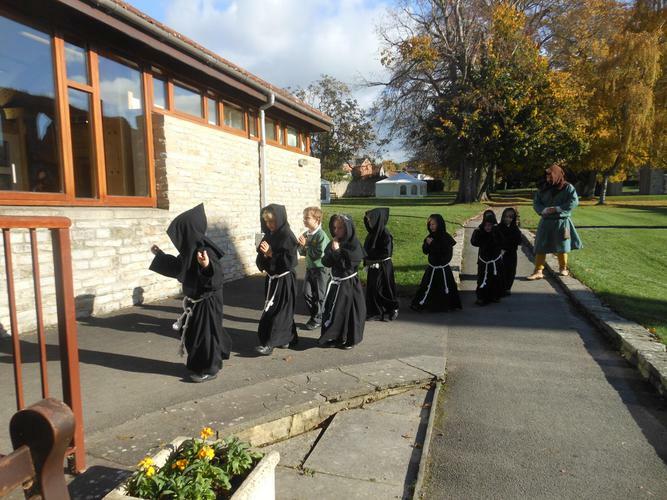 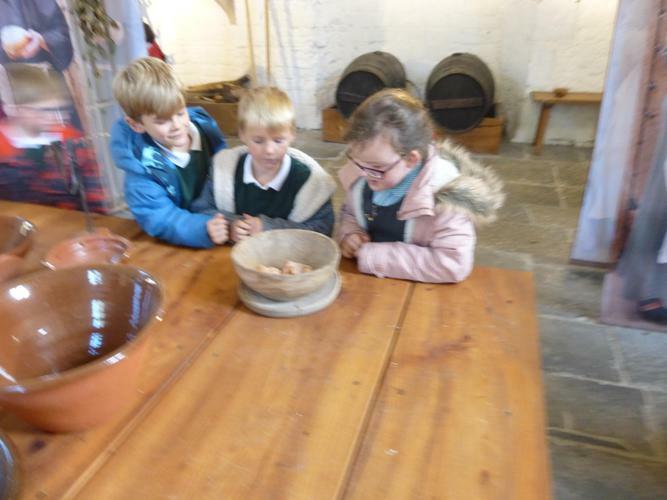 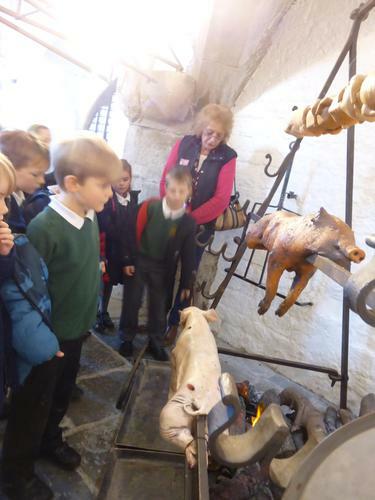 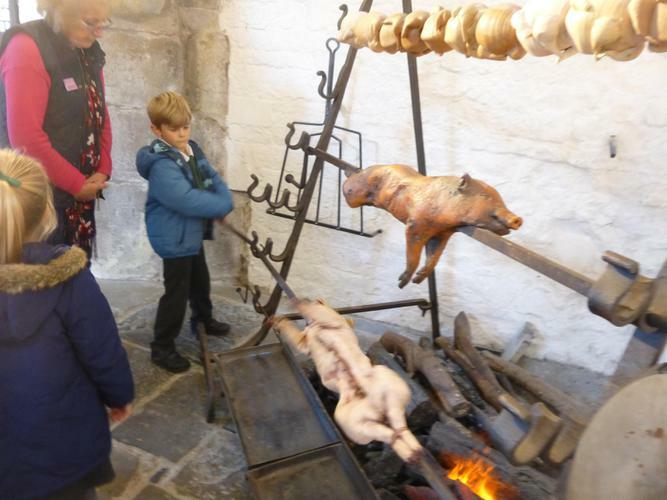 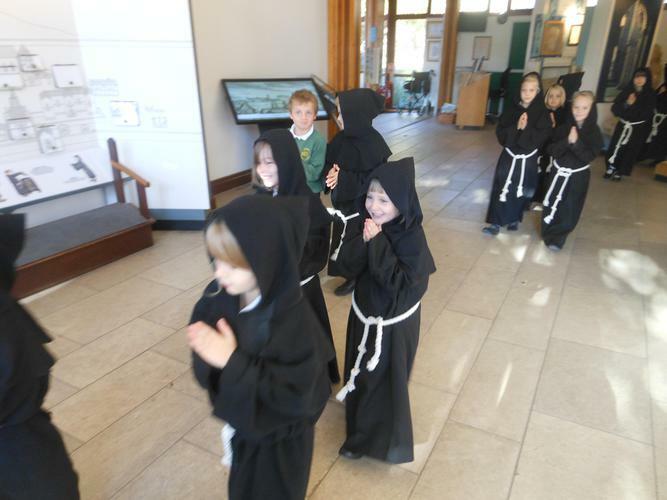 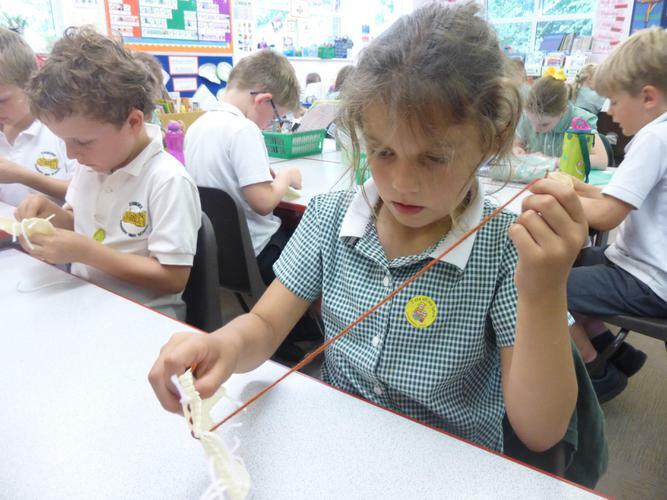 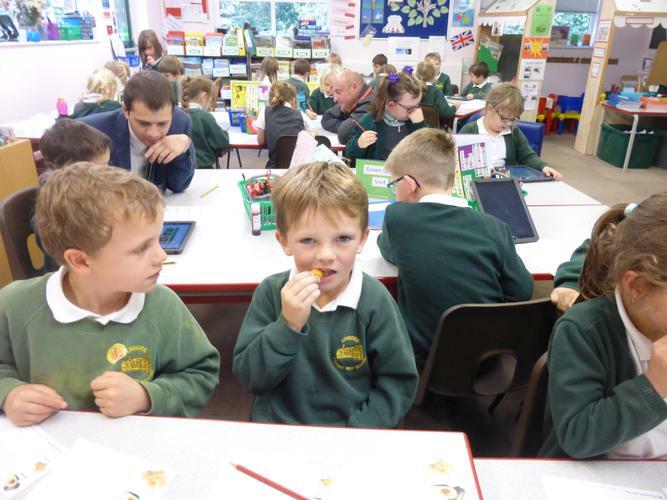 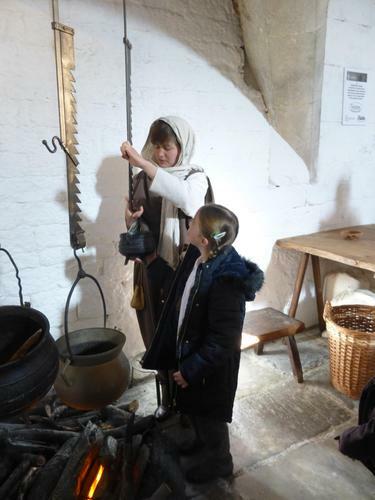 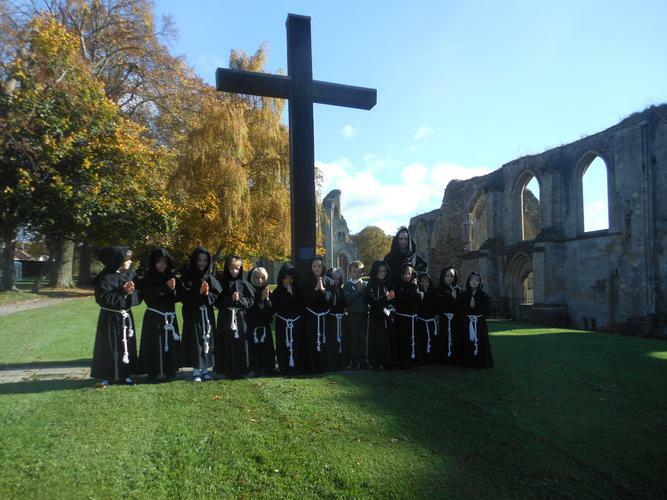 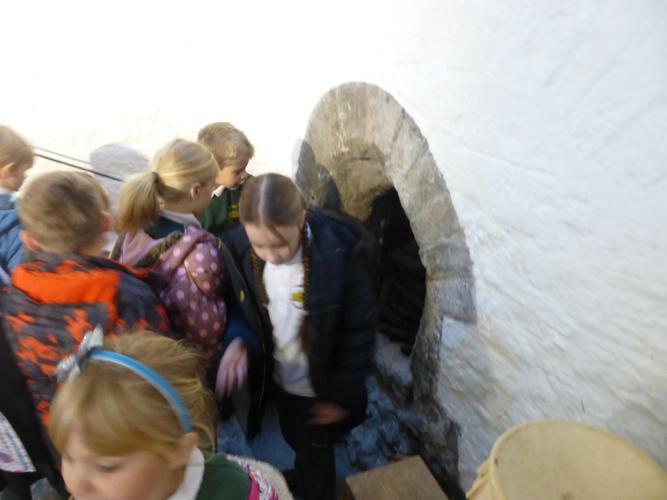 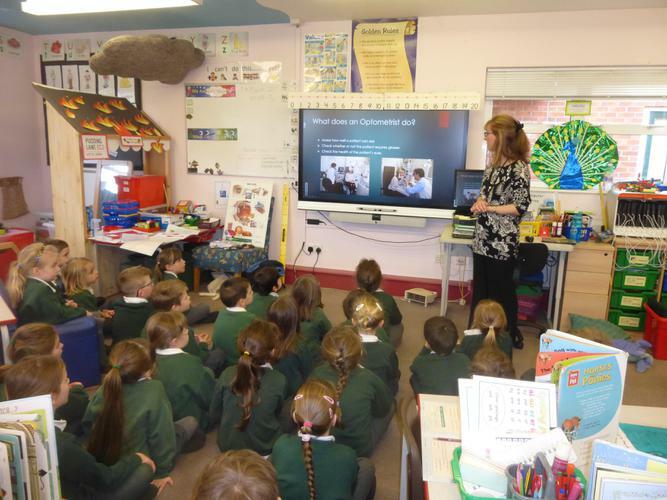 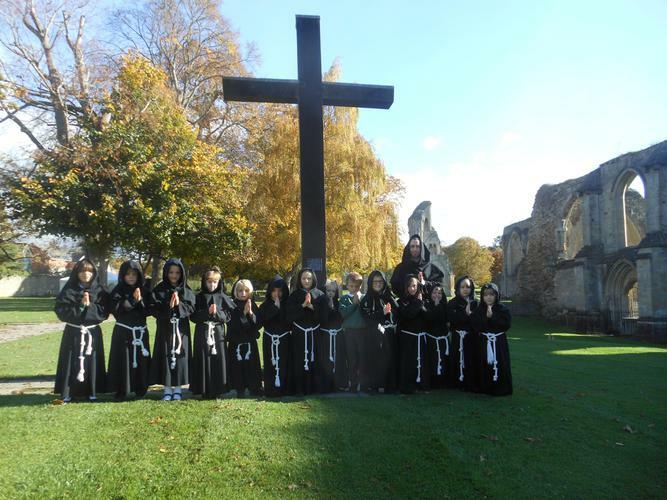 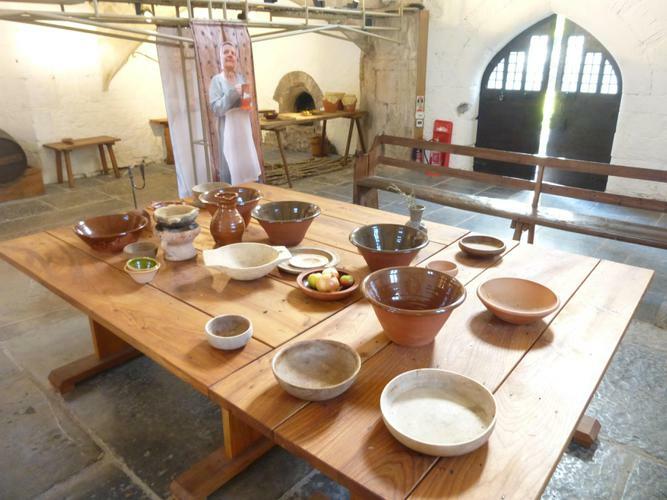 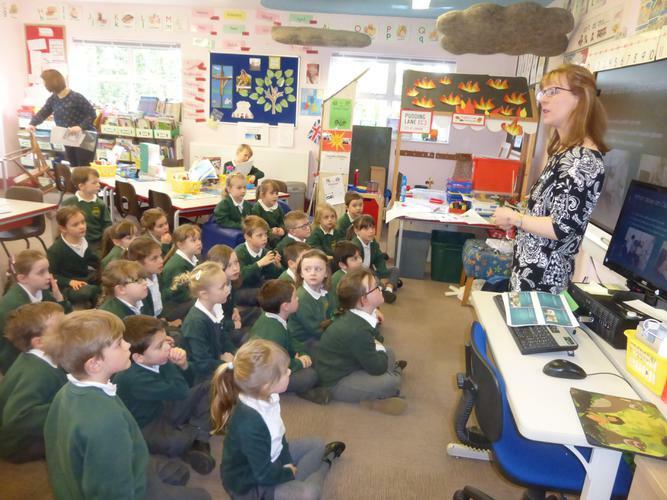 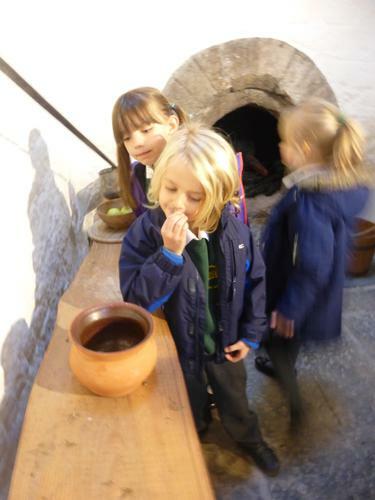 We dressed in Monk's robes and learnt about what life was like in the Abbey many years ago.